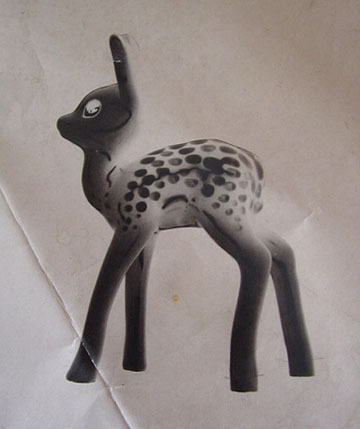 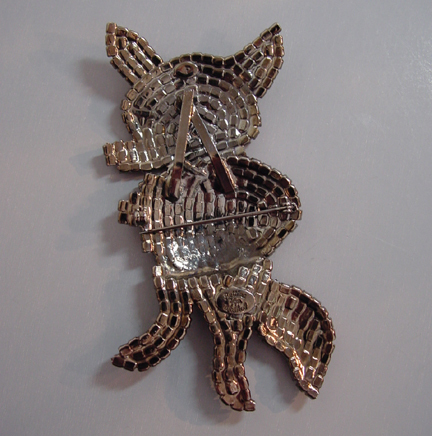 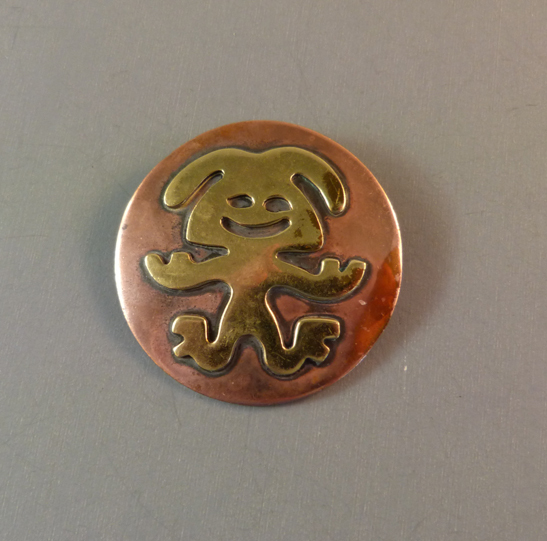 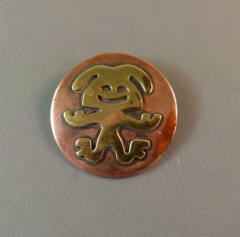 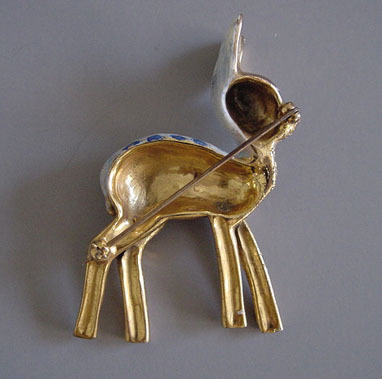 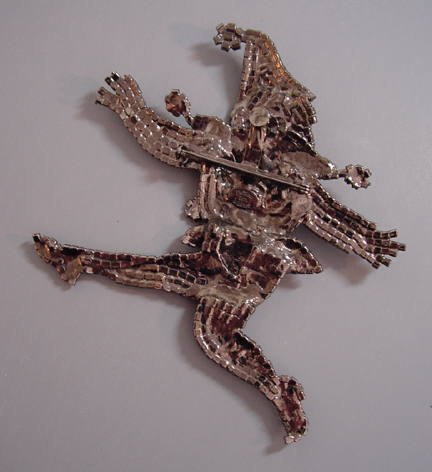 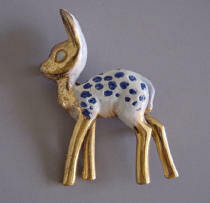 BARCLAY art work for a fawn brooch. 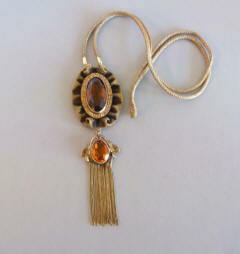 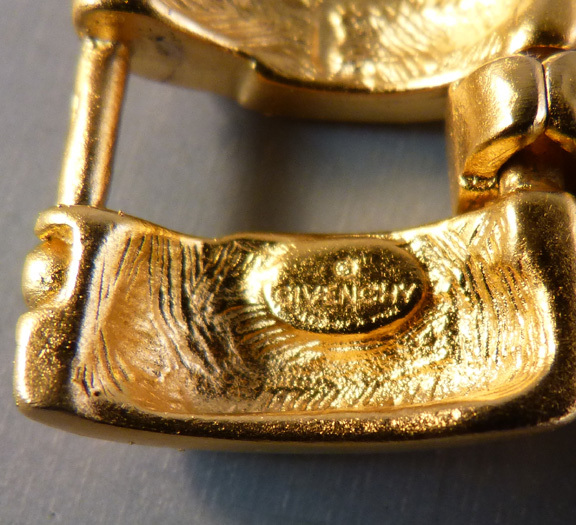 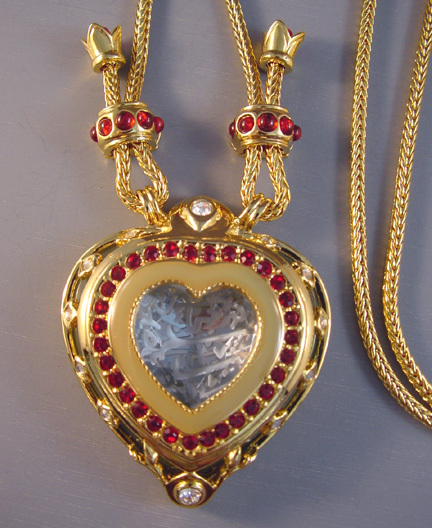 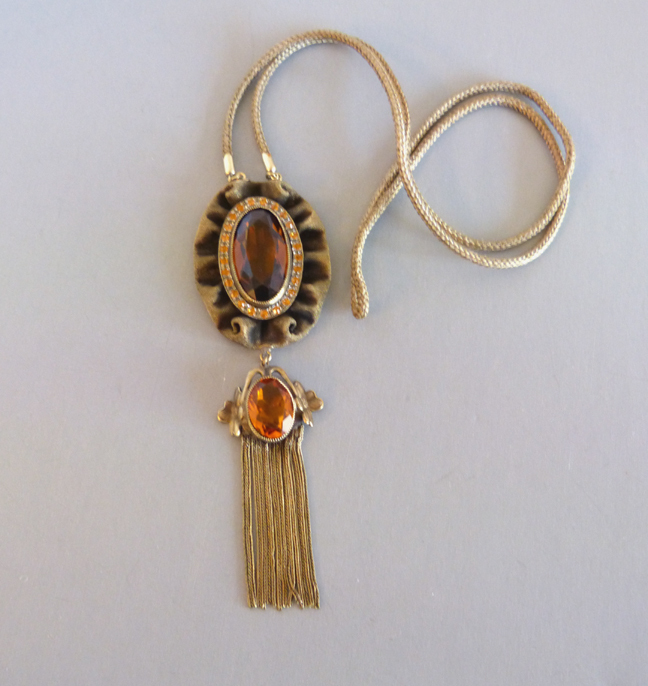 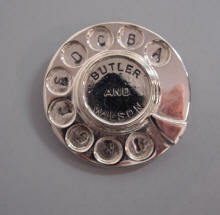 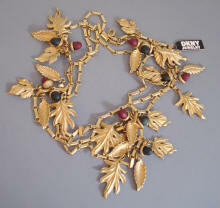 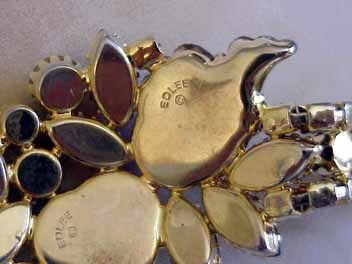 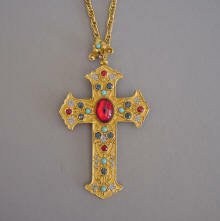 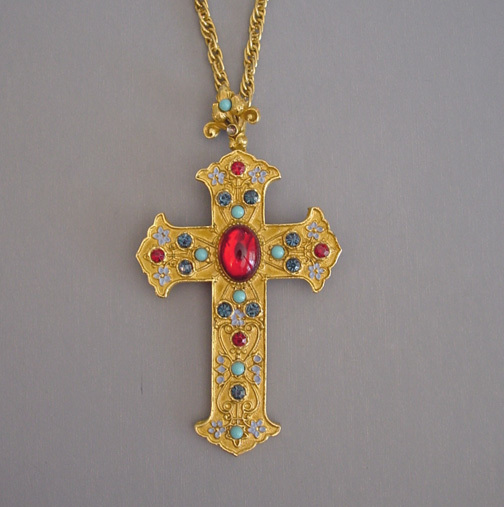 I spoke to Dorothy on the phone not long ago, and she gave me some interesting information about her jewelry. she made far more than just holiday pins! 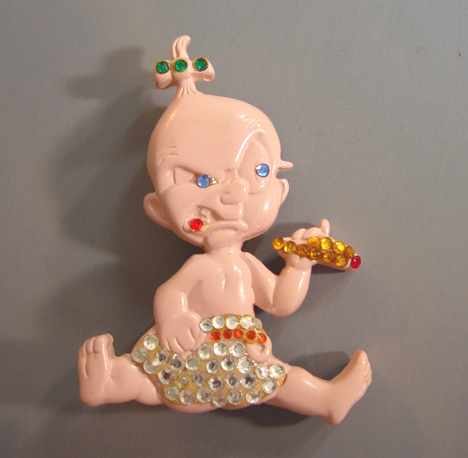 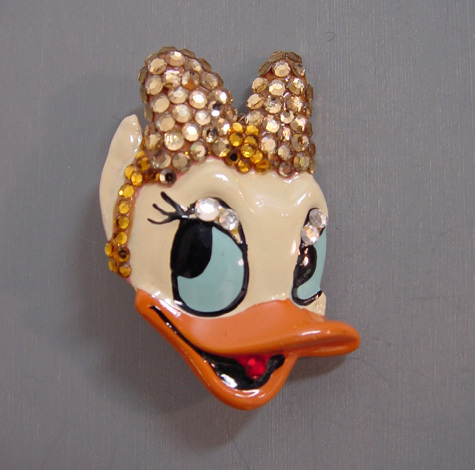 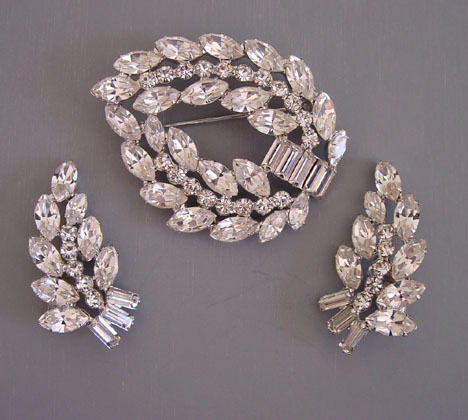 Her rhinestone pieces were sold in I. Magnums, Macys, and other big stores. 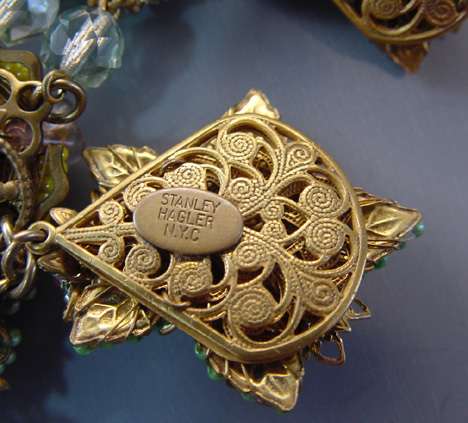 They had about 50 workers making the jewelry at their height of production. 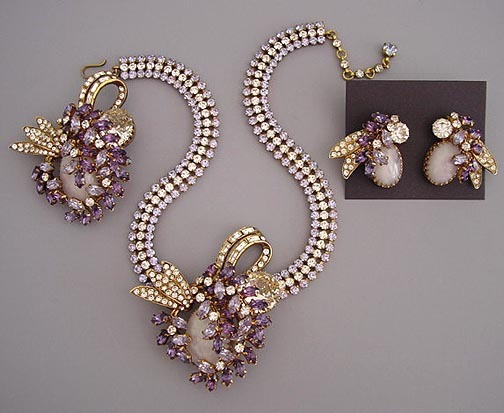 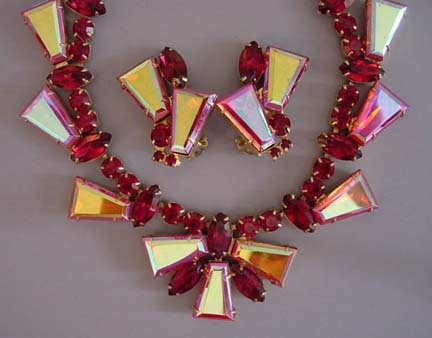 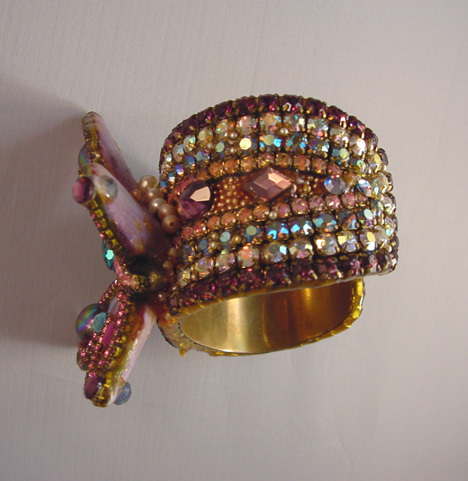 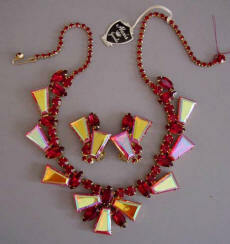 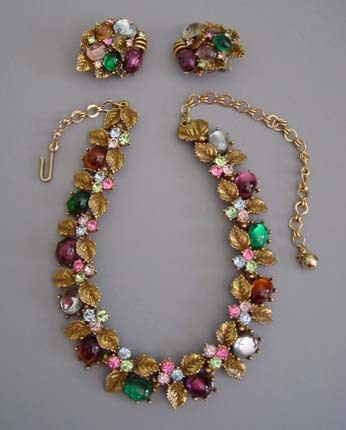 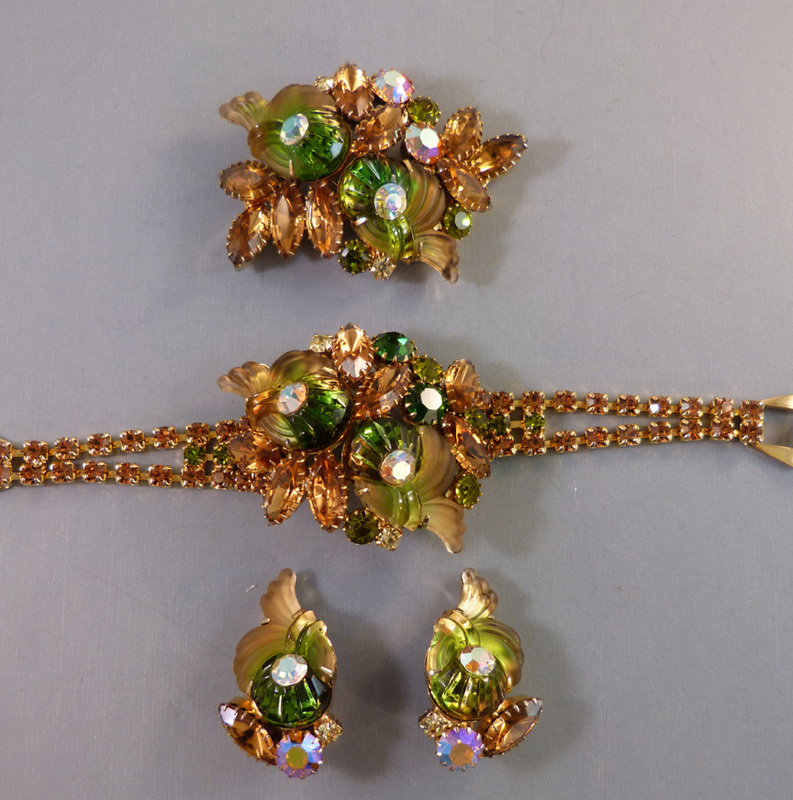 She made rhinestones jewelry from 1982 to 2008. 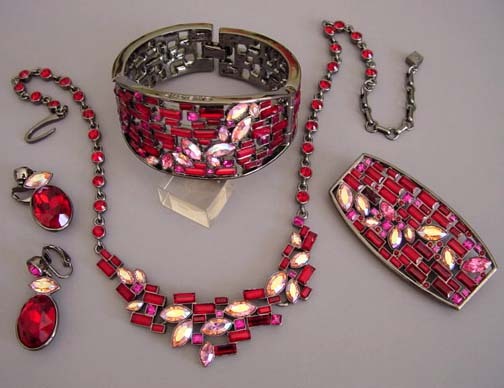 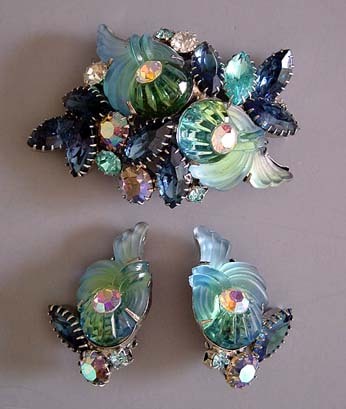 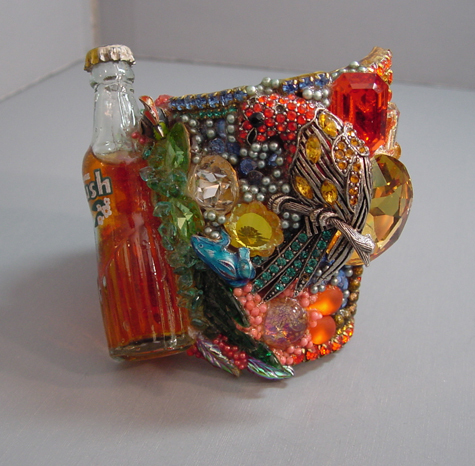 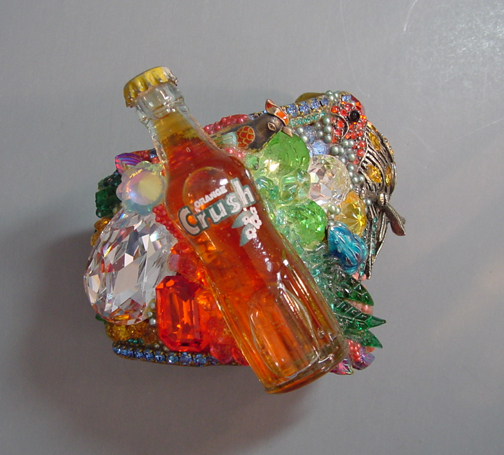 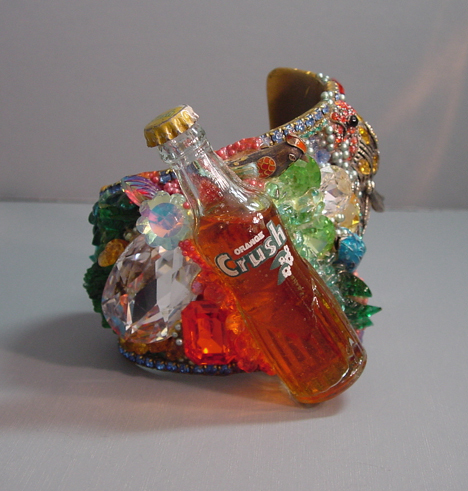 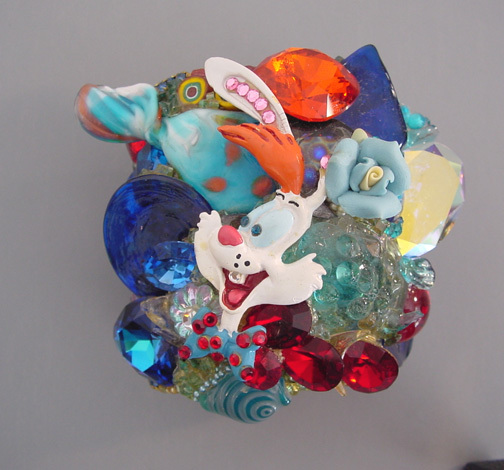 Her degree was in art, and she did large blown glass sculptural pieces originally, but moved to glass and then rhinestone jewelry. 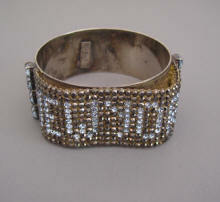 Her rhinestone jewelry was almost always signed. 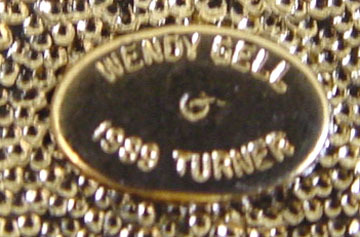 Her husband Robert worked in their jewelry business too. 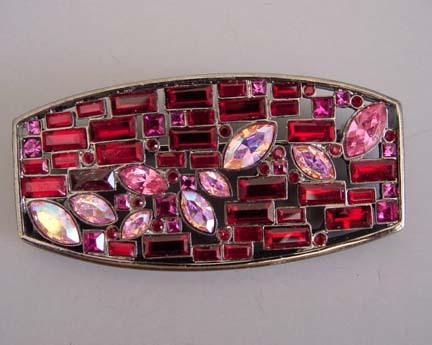 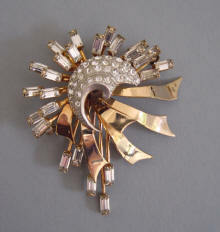 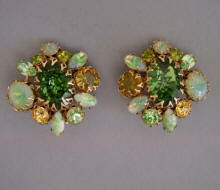 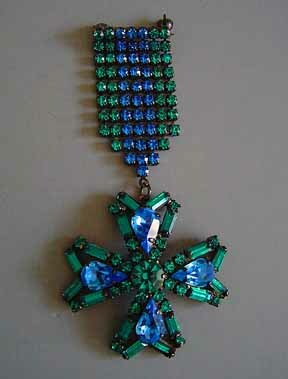 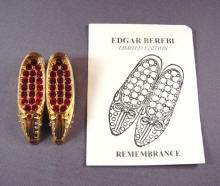 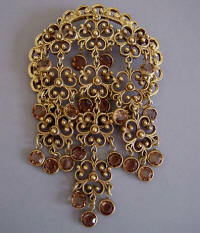 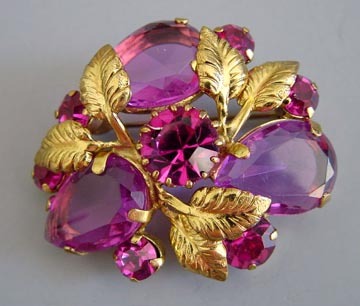 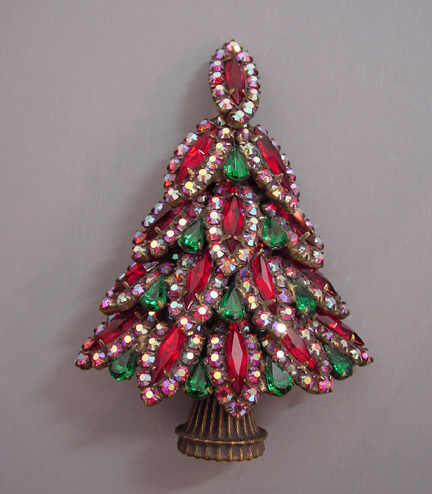 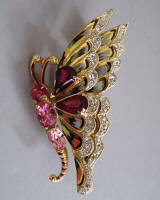 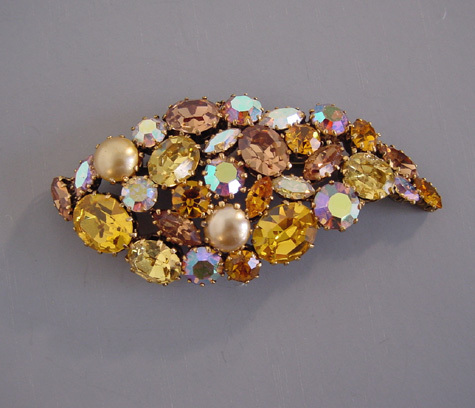 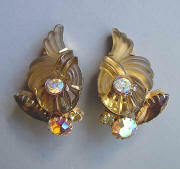 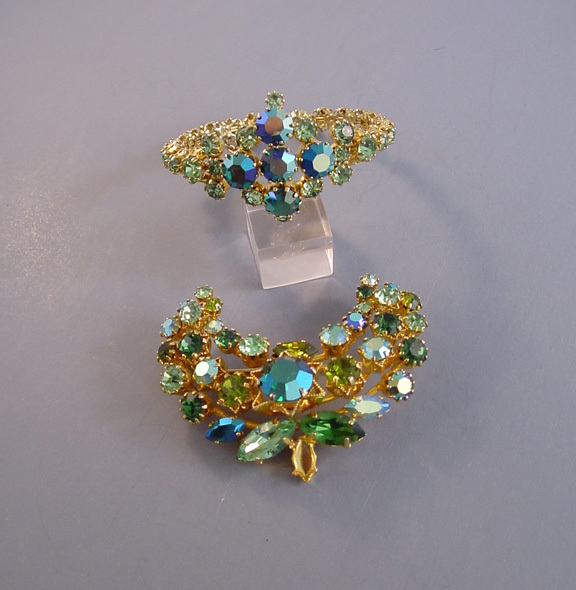 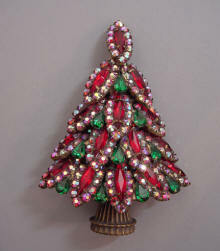 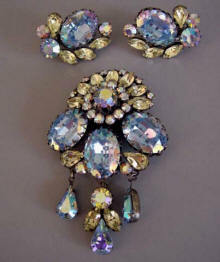 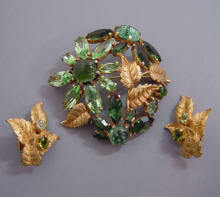 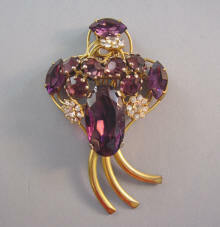 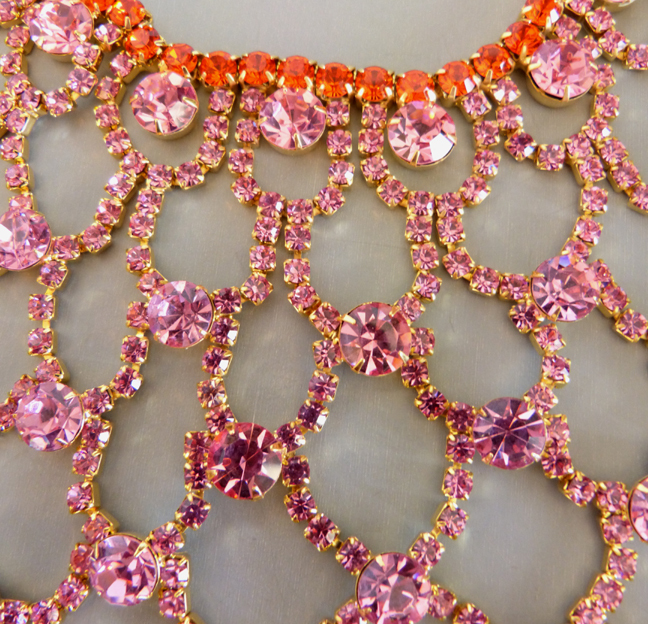 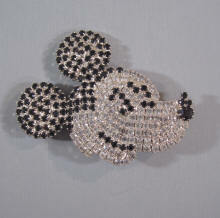 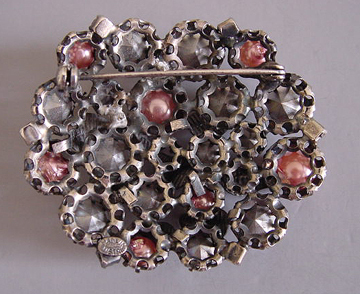 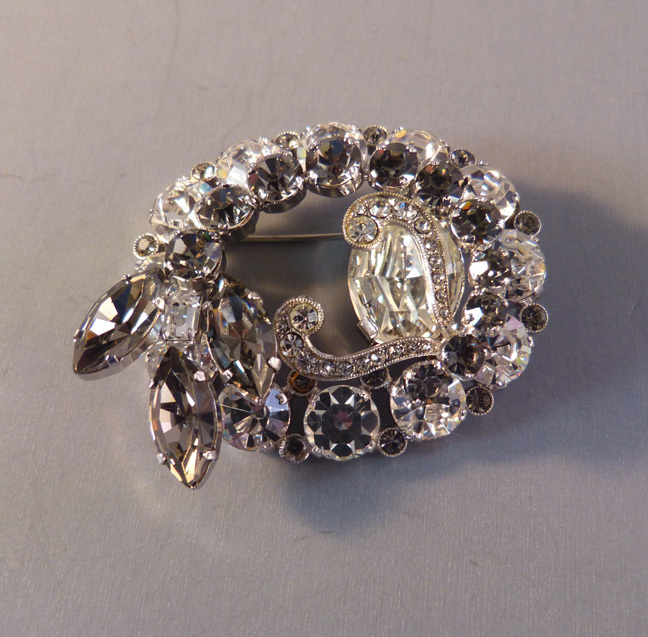 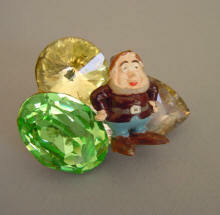 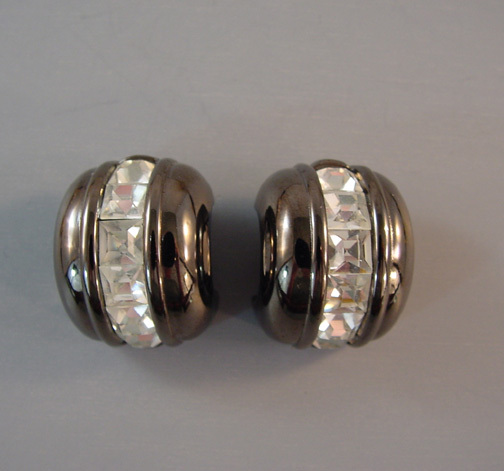 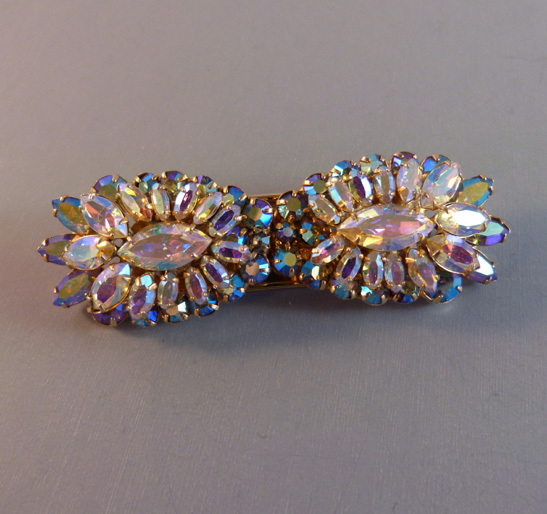 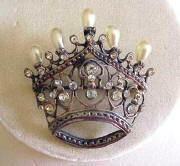 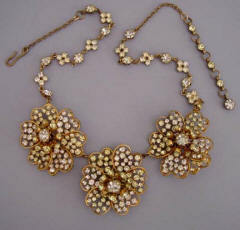 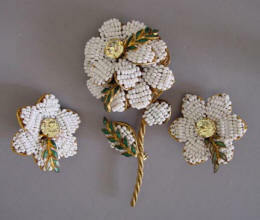 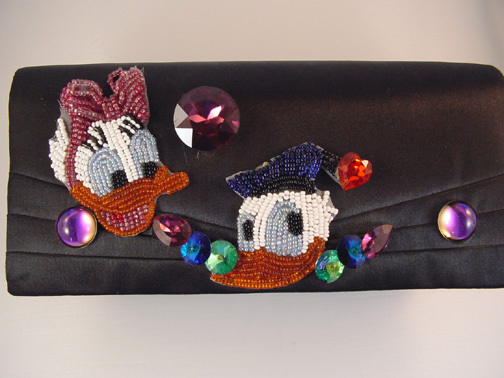 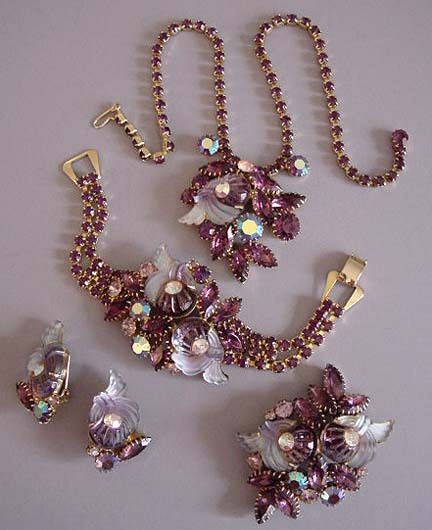 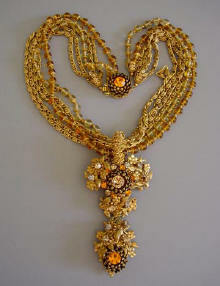 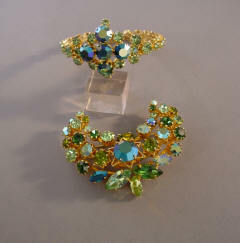 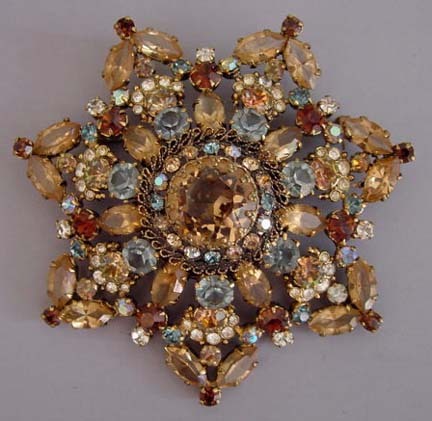 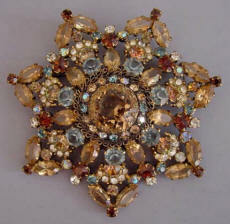 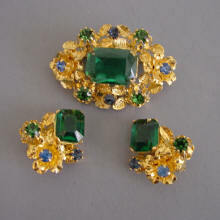 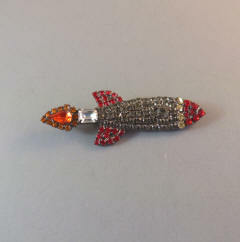 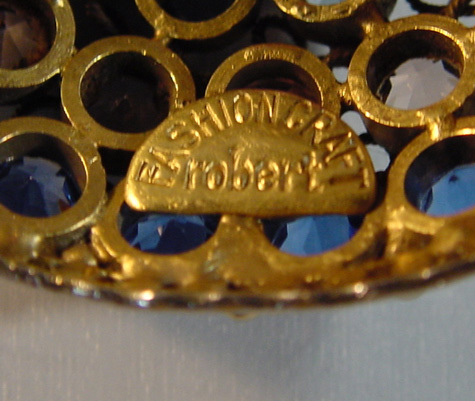 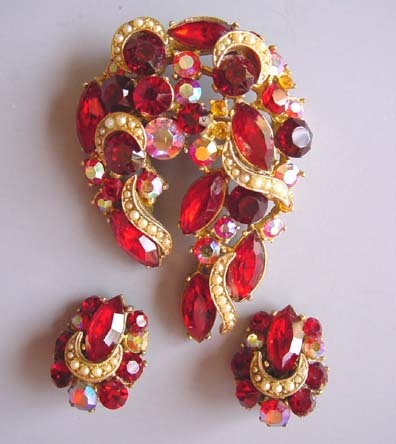 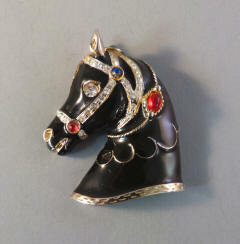 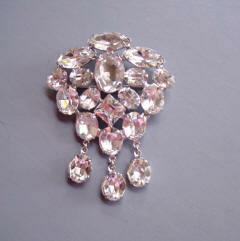 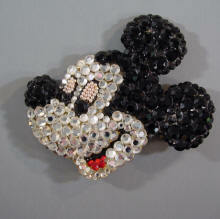 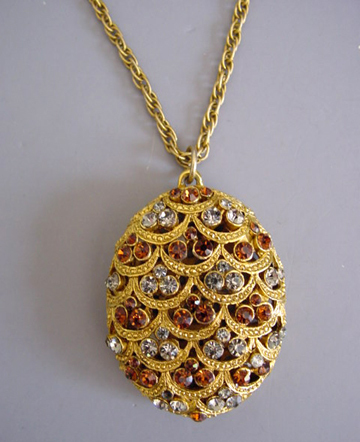 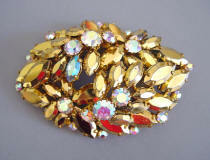 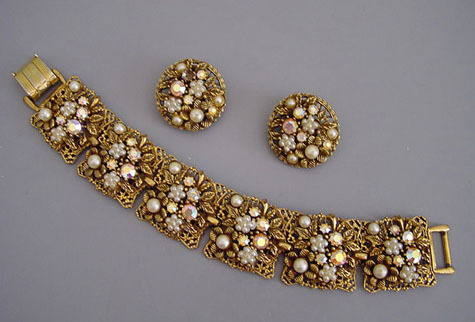 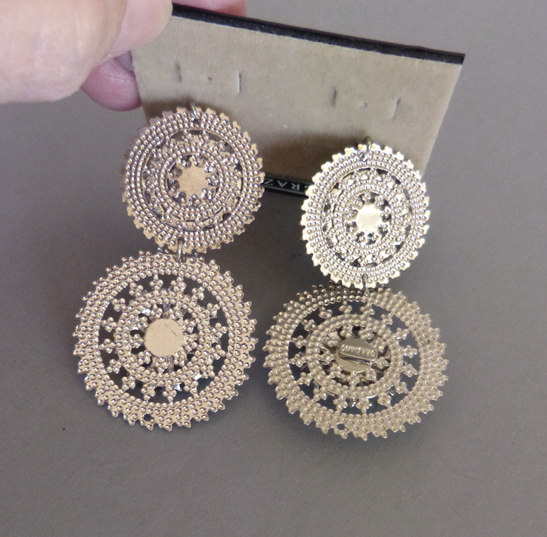 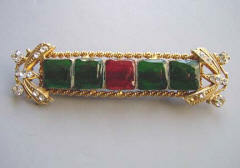 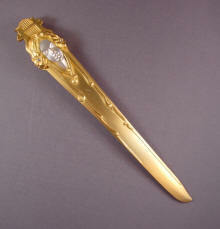 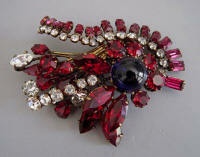 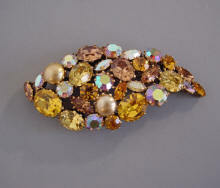 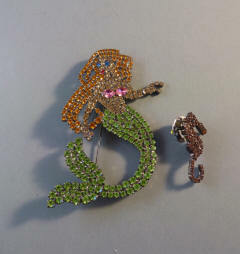 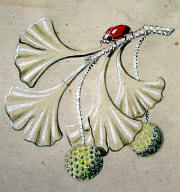 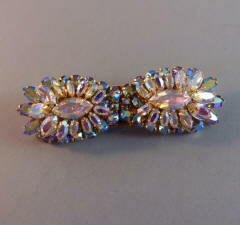 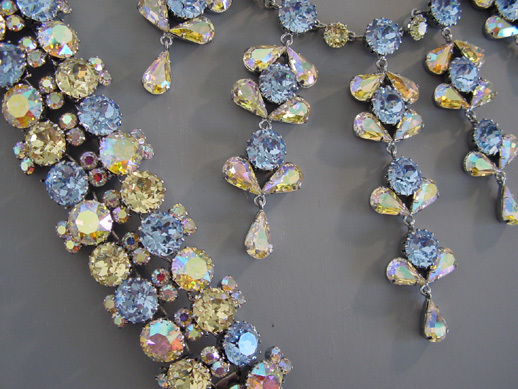 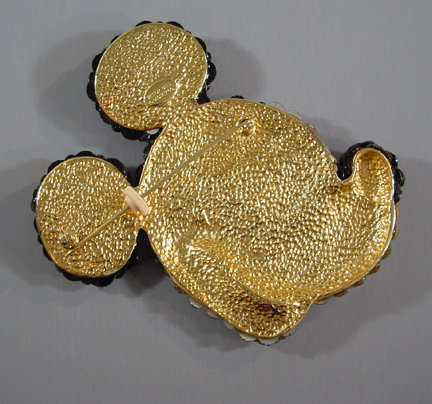 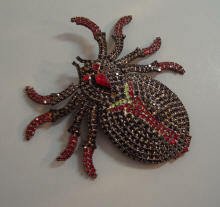 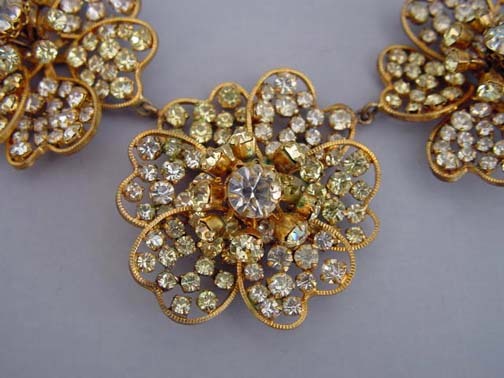 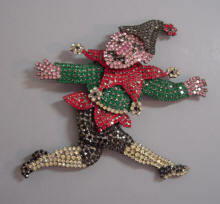 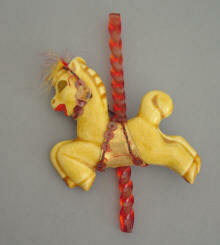 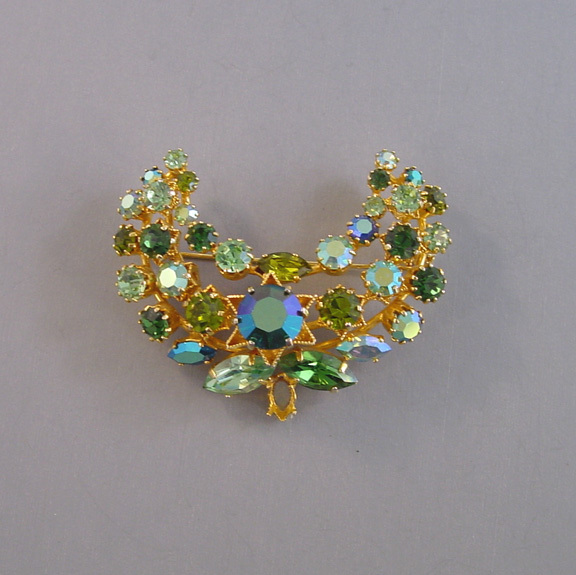 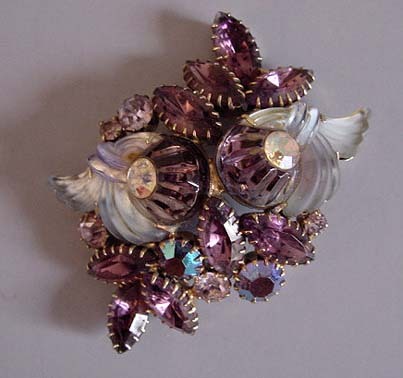 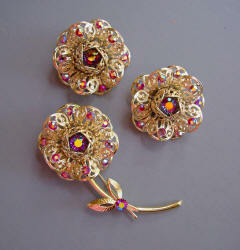 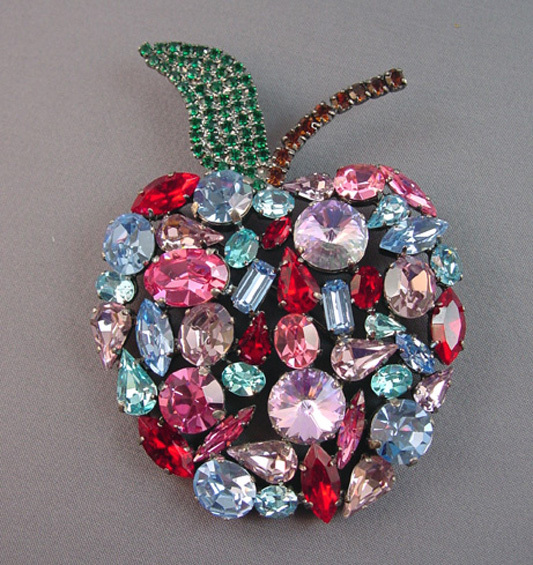 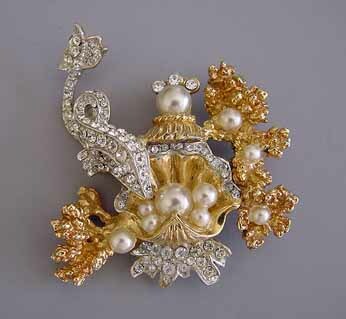 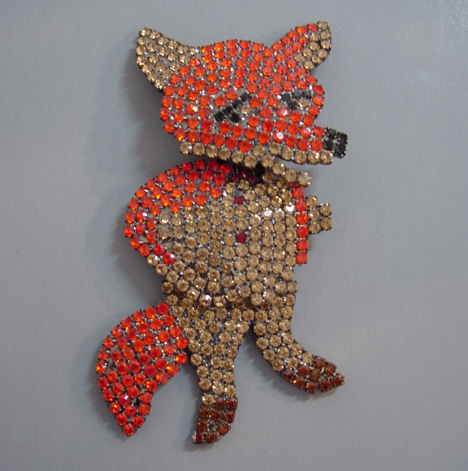 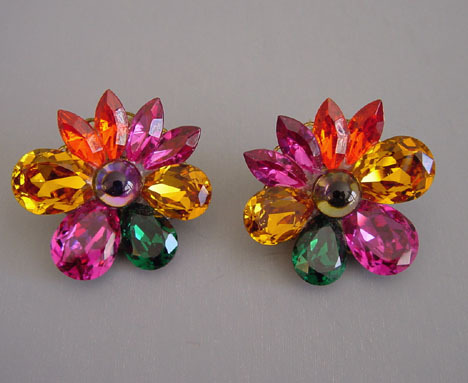 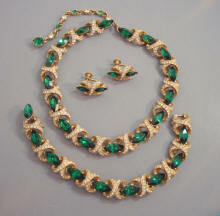 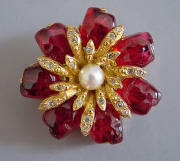 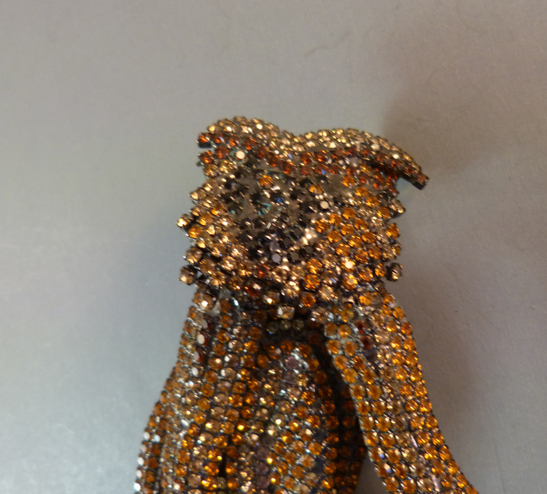 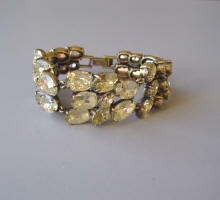 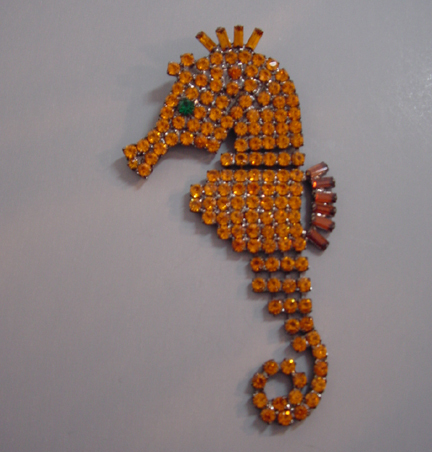 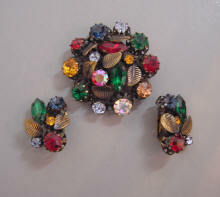 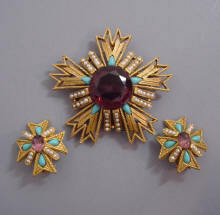 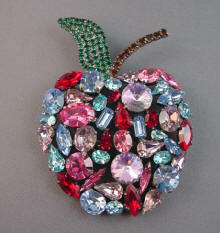 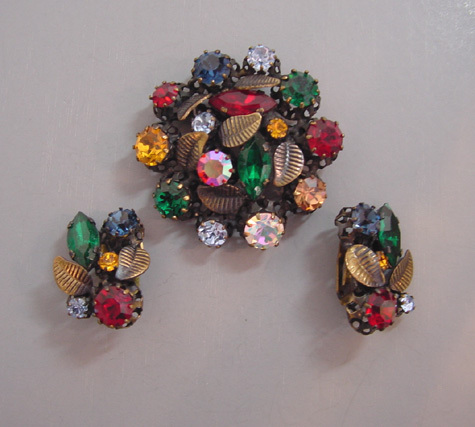 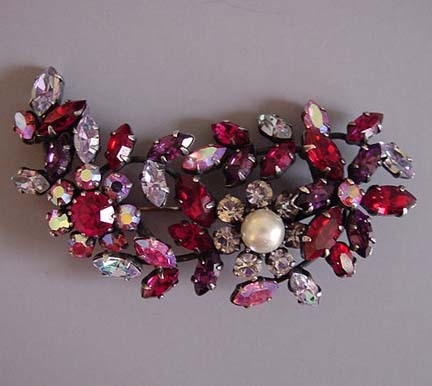 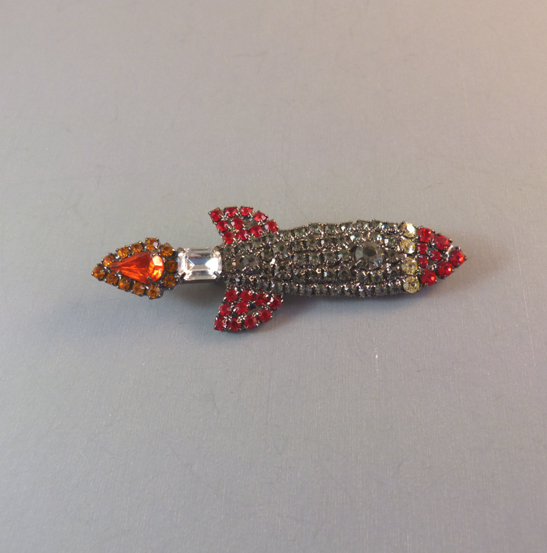 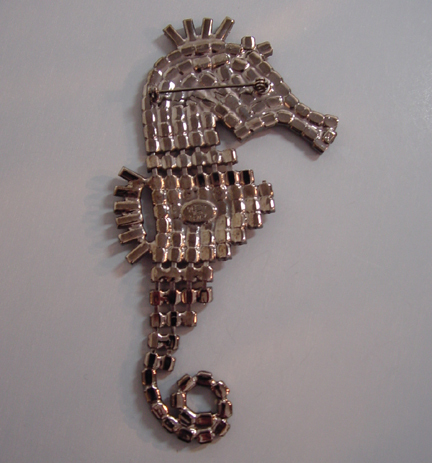 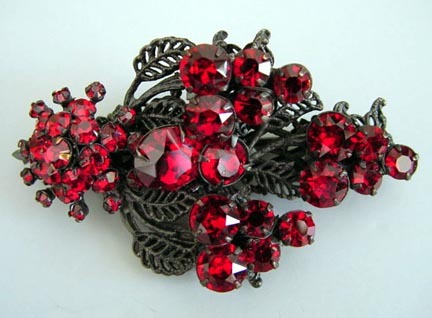 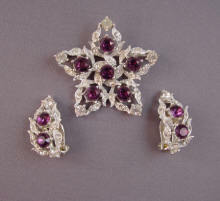 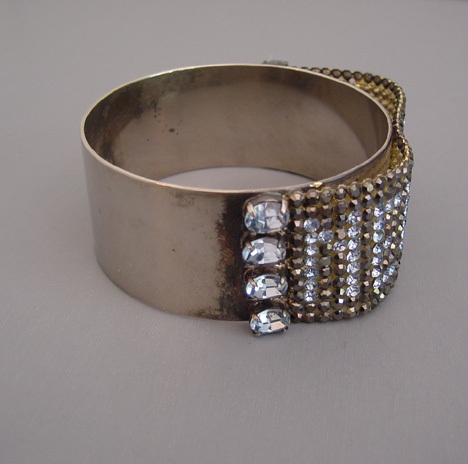 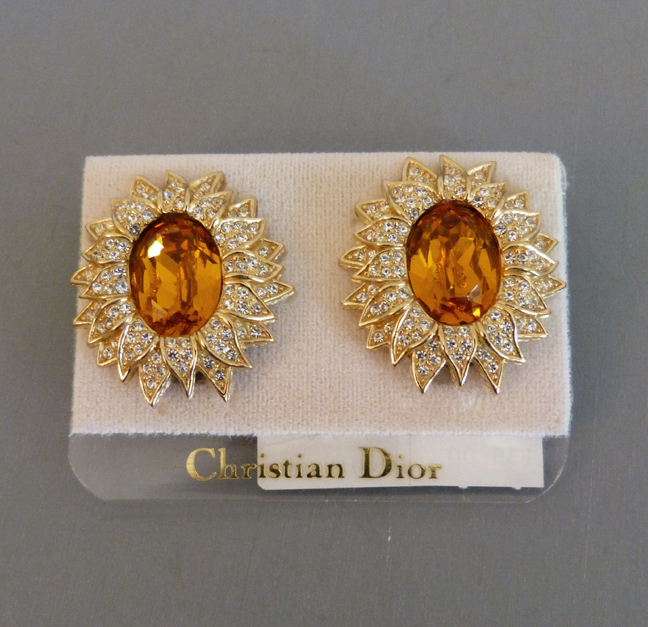 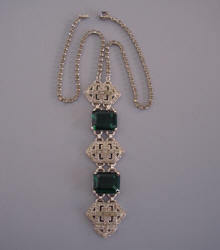 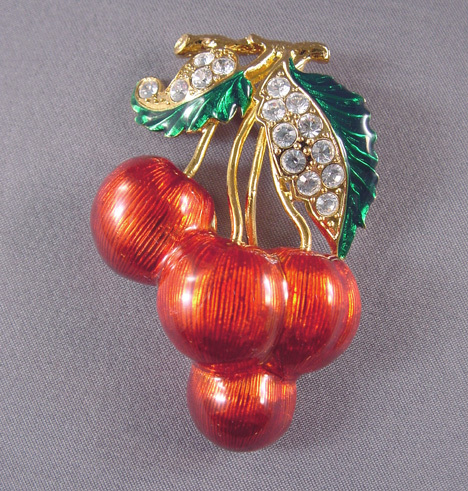 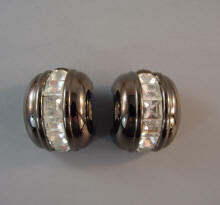 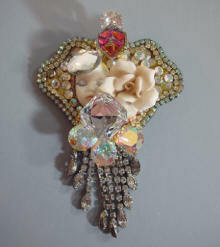 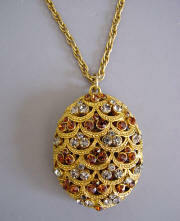 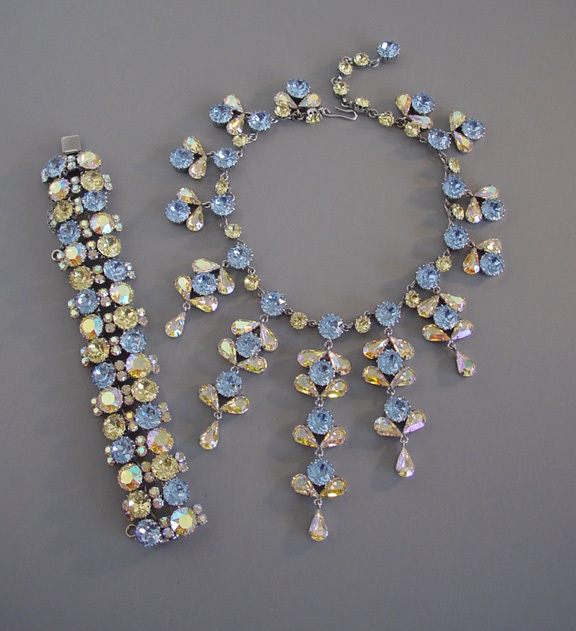 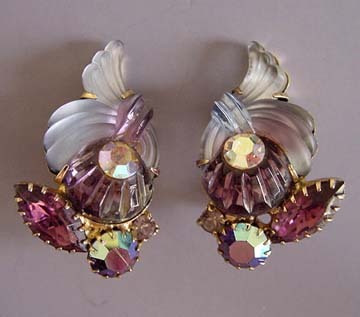 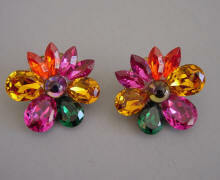 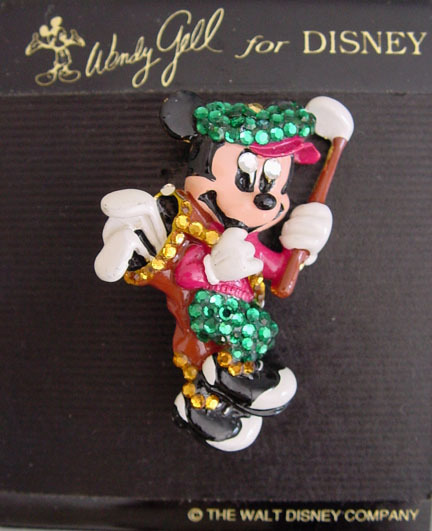 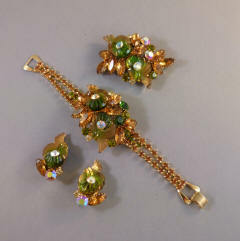 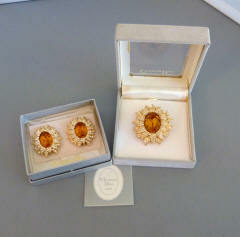 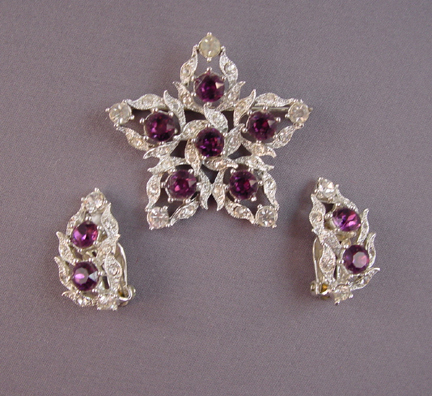 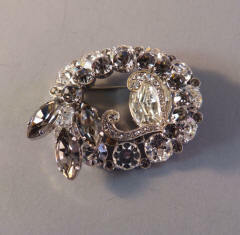 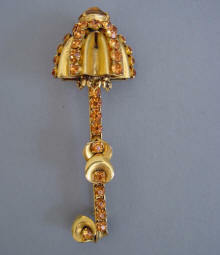 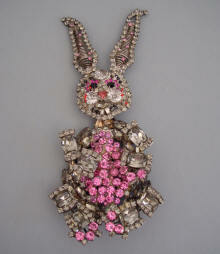 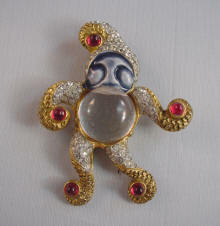 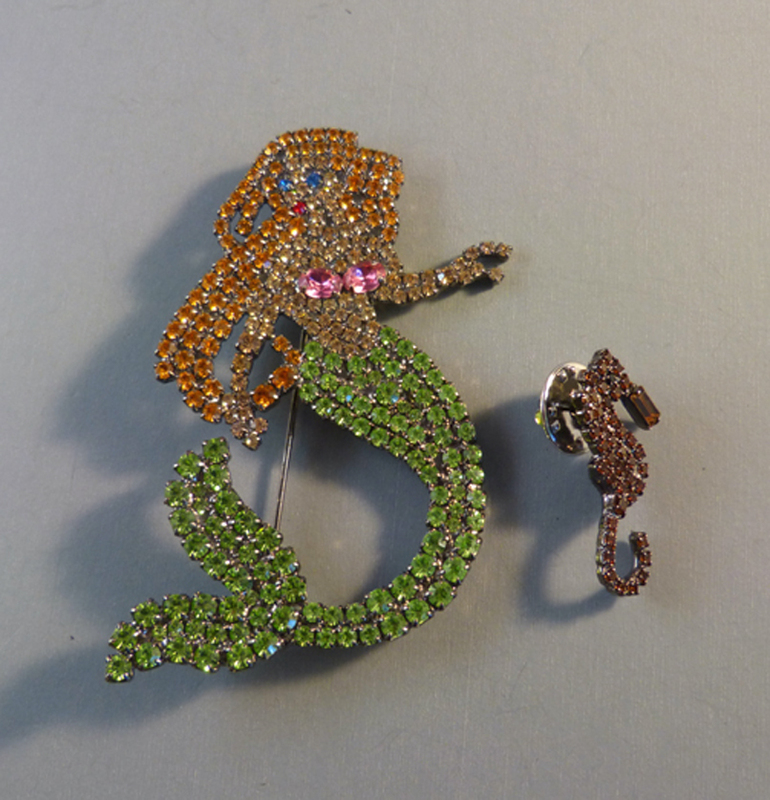 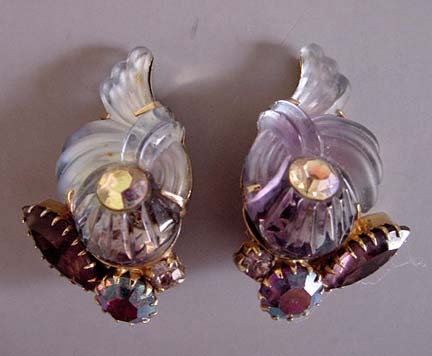 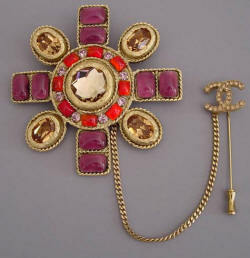 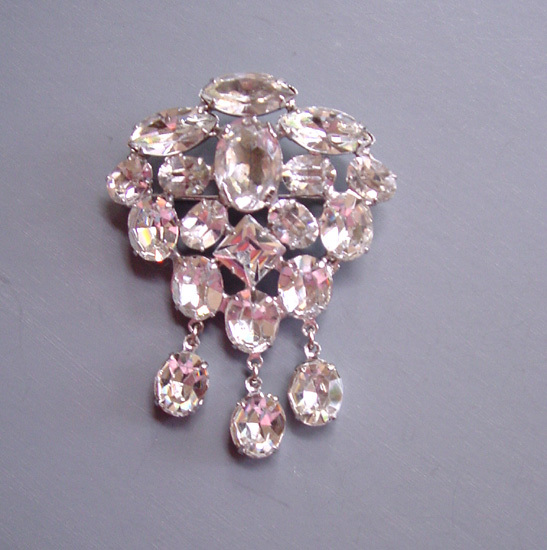 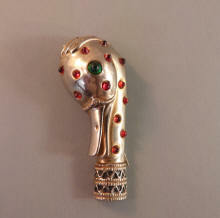 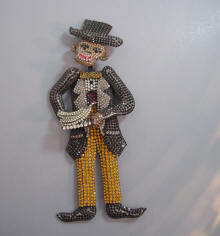 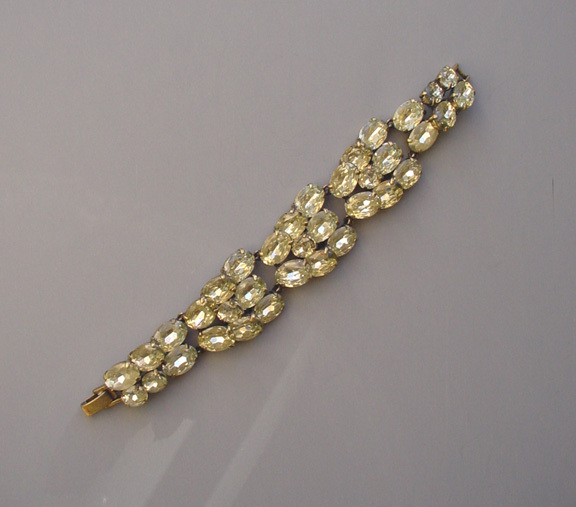 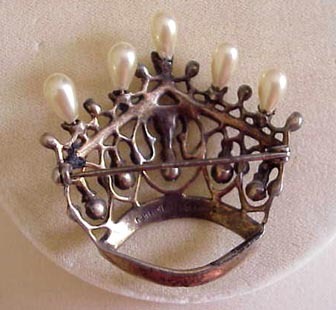 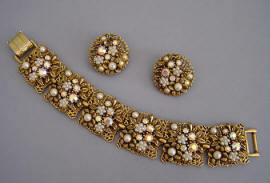 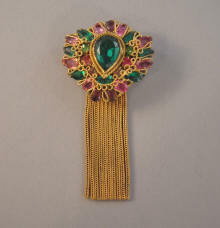 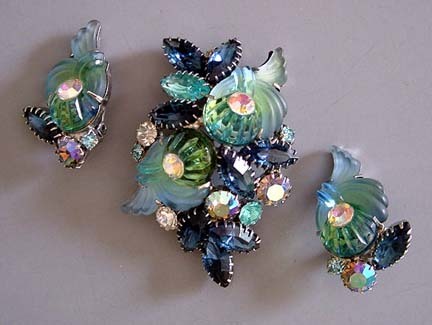 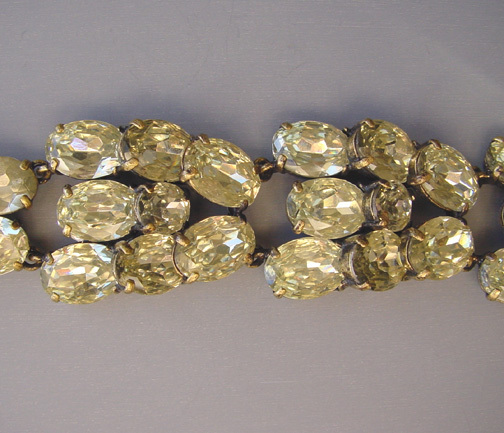 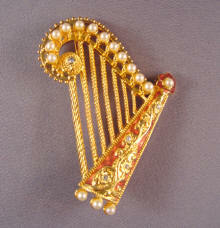 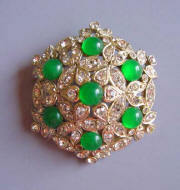 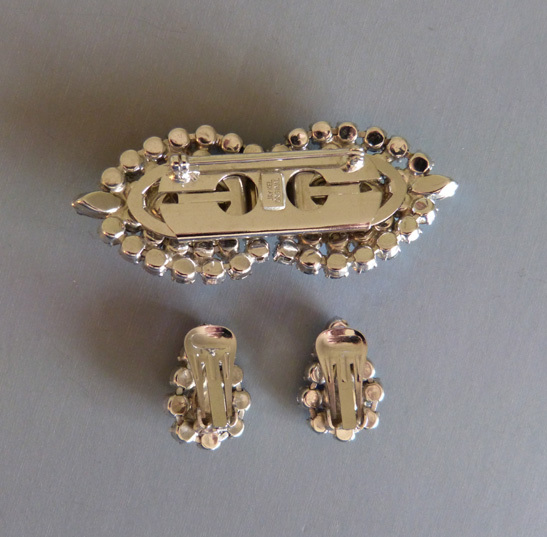 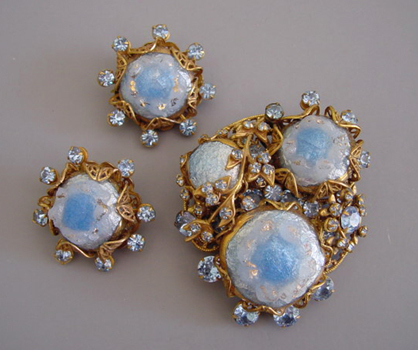 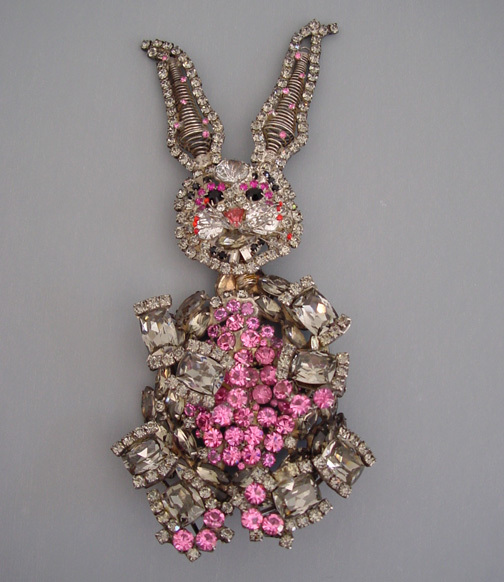 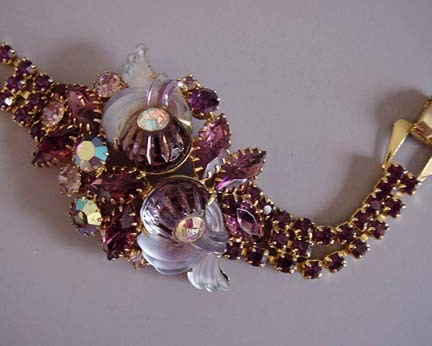 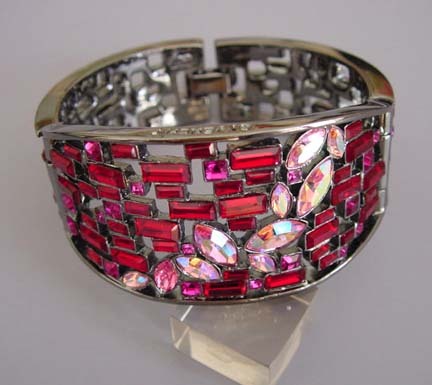 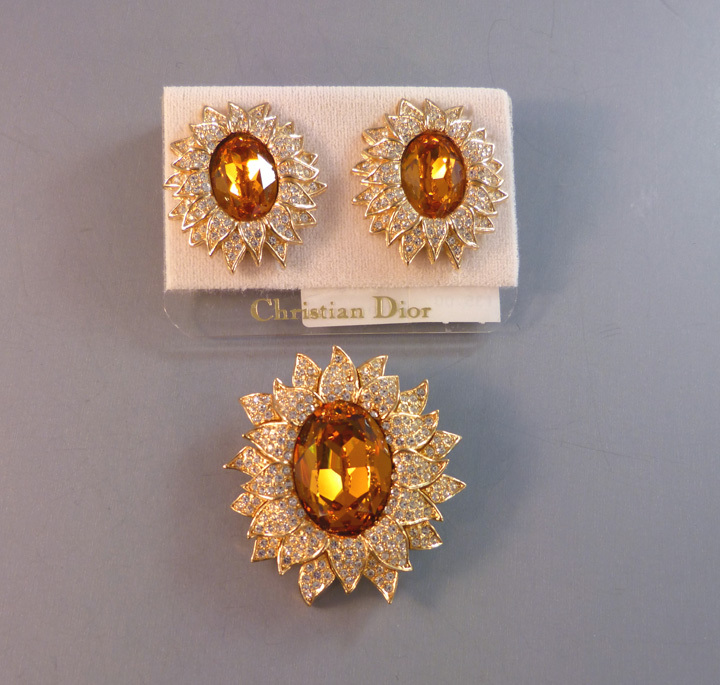 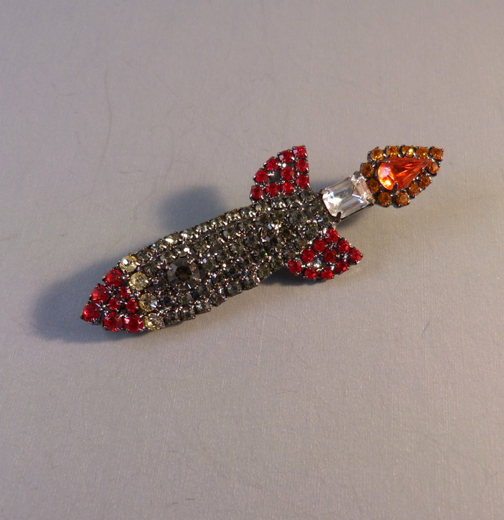 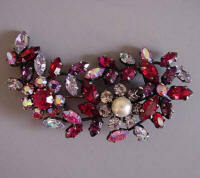 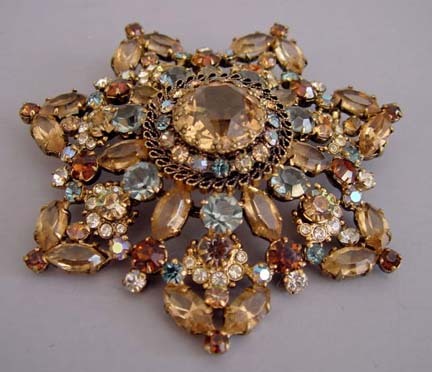 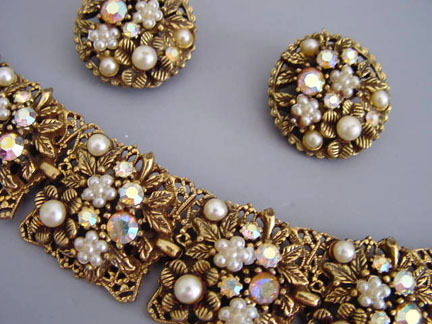 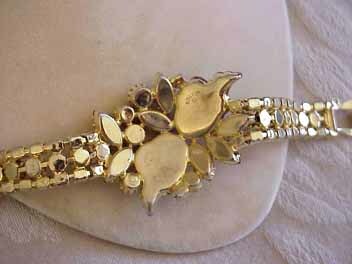 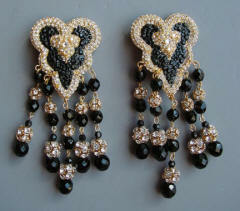 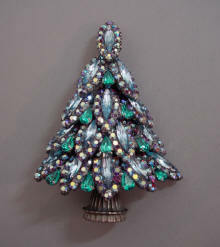 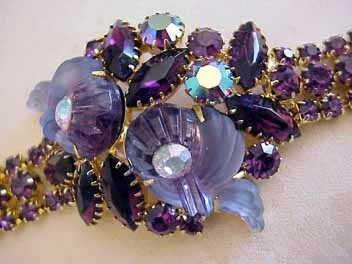 Their rhinestone pieces were made using no torch, but rather low temperature irons in order to protect the rhinestones. 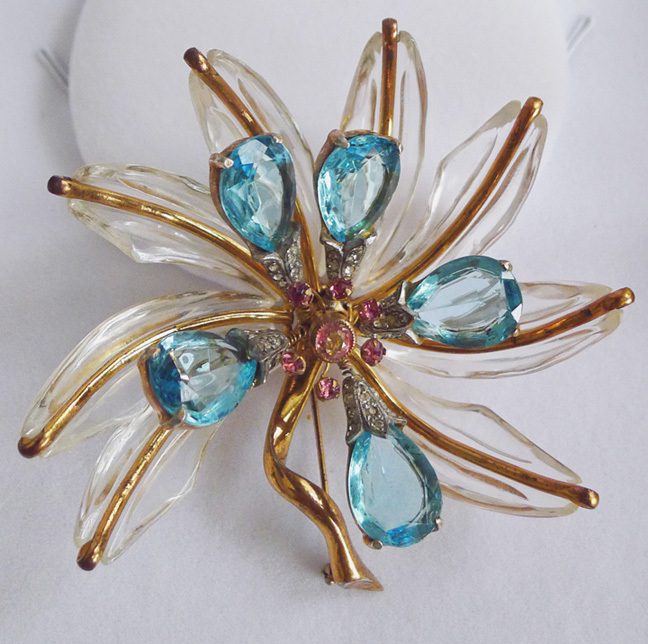 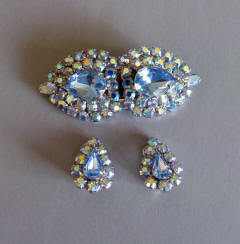 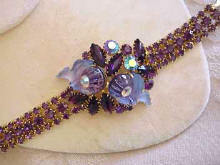 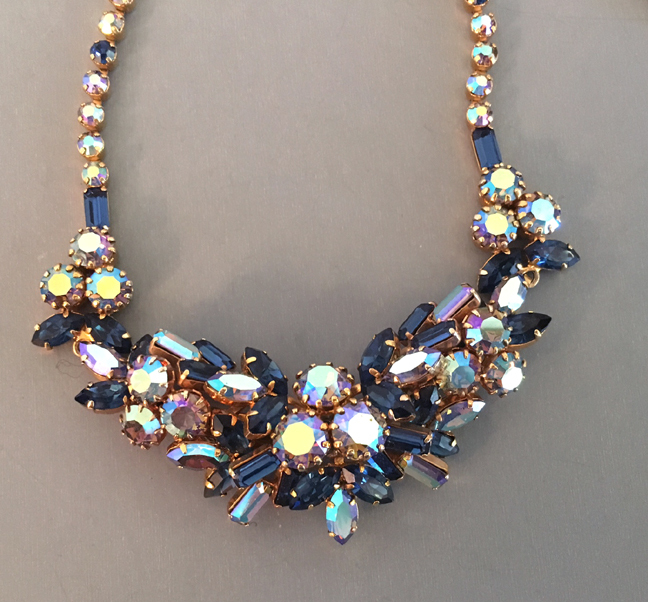 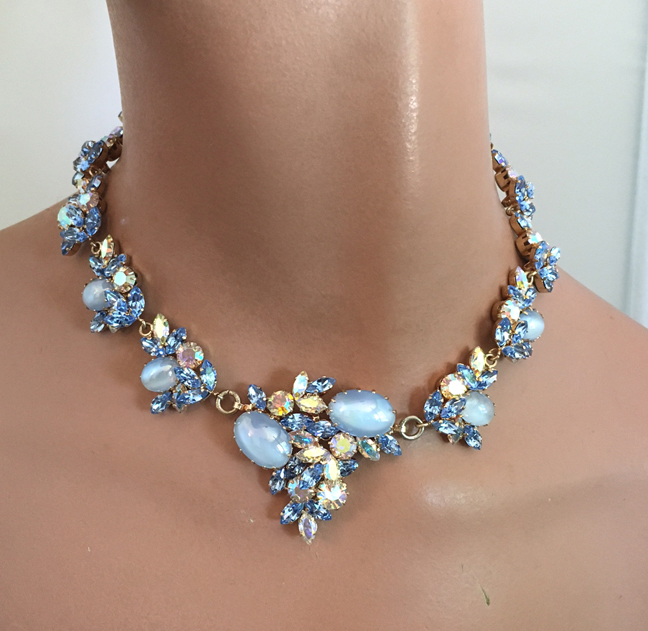 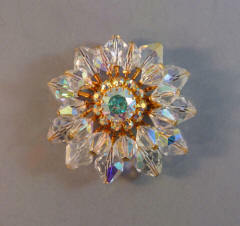 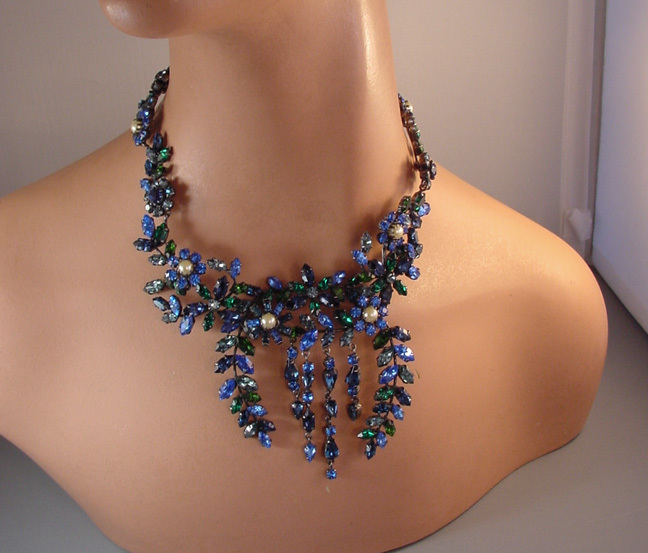 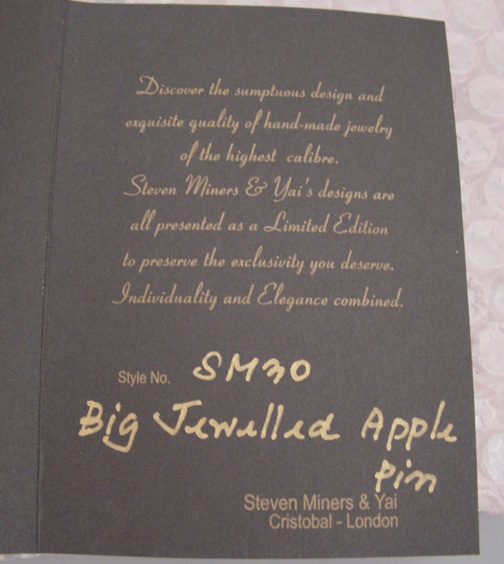 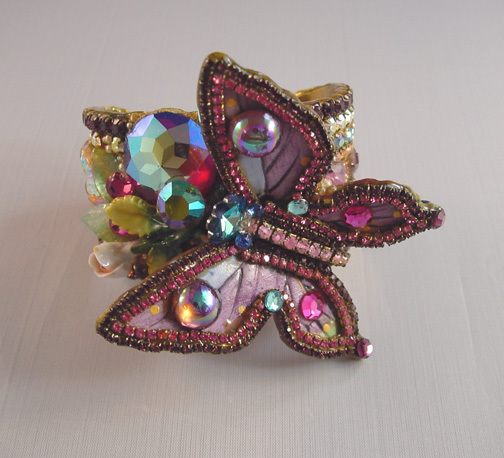 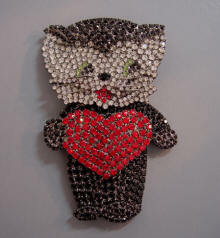 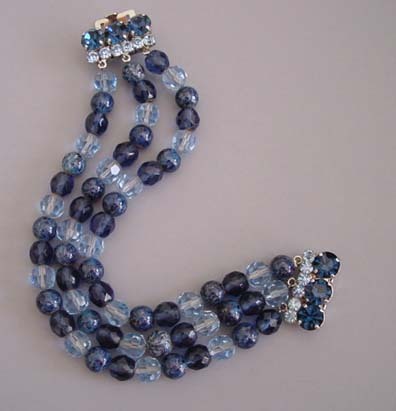 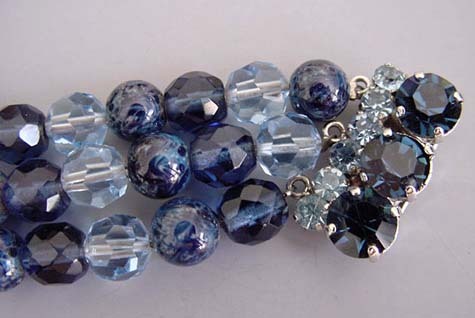 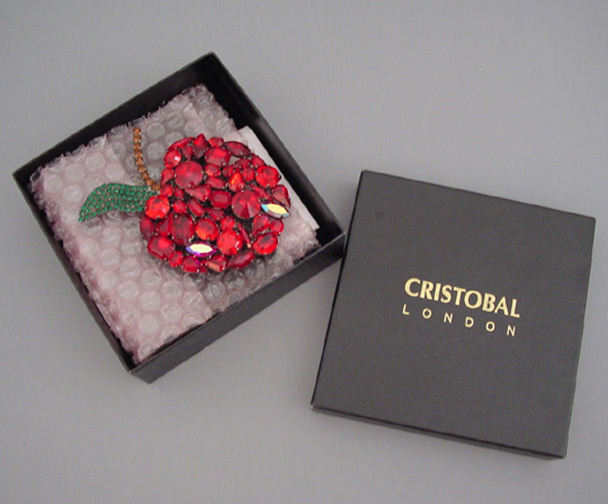 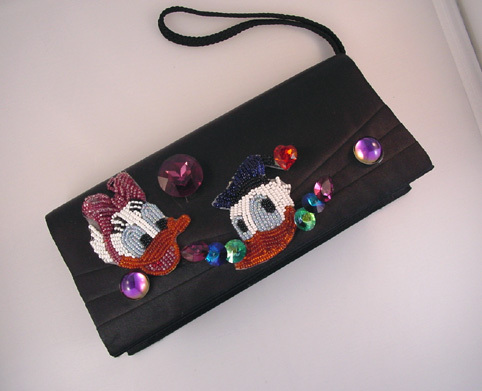 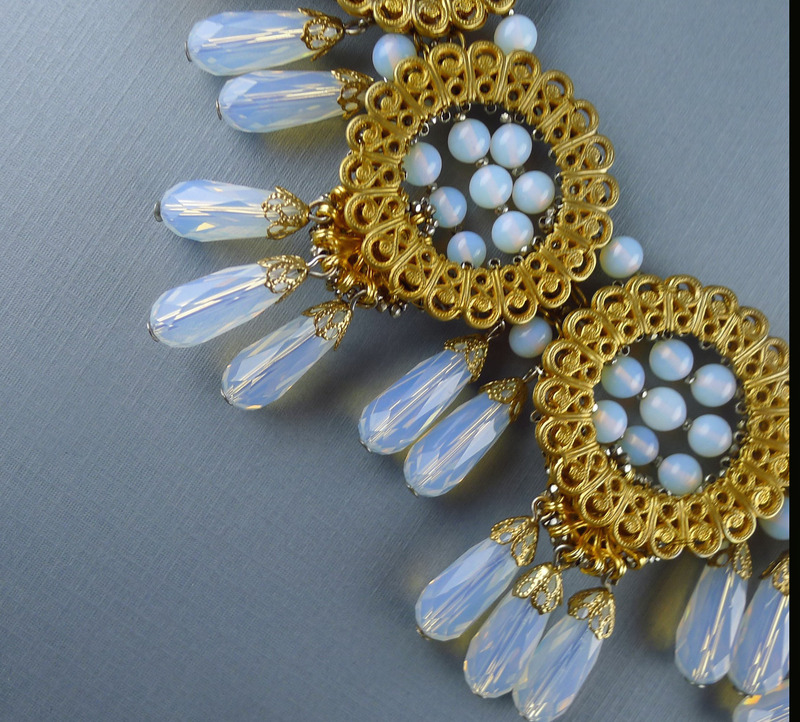 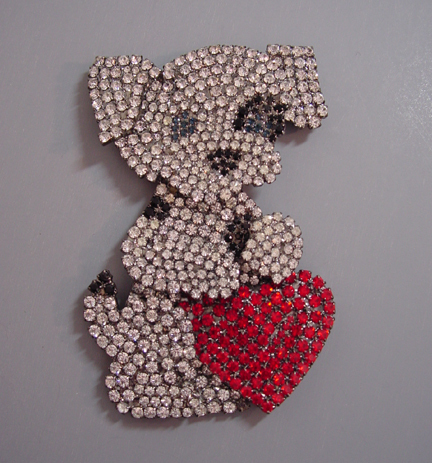 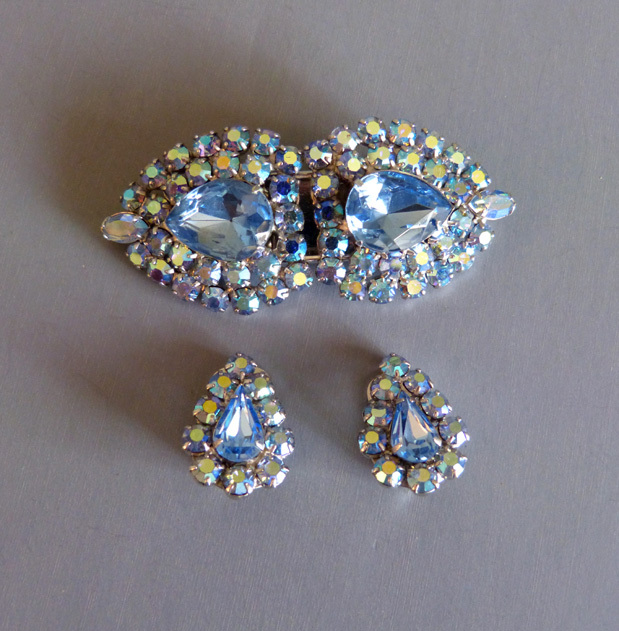 She used Swarovski stones, which are of such high quality and so brilliant. 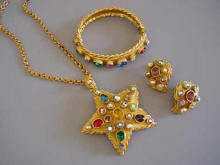 In teh limited edition pieces they never really ran 120 of any item, not that many by far she said. 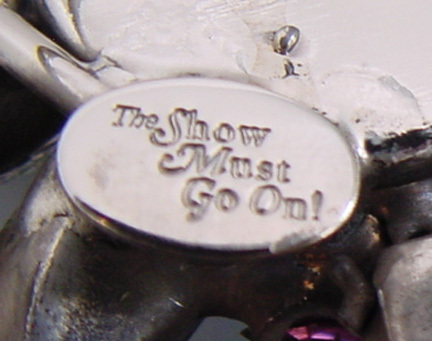 They just guessed how many they might run before starting the series. 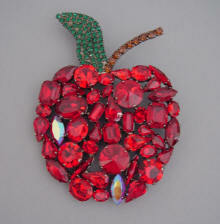 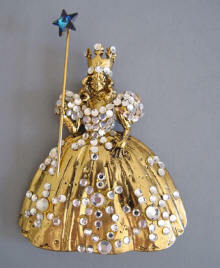 She has a dozen pieces in the Swarovski Museum. 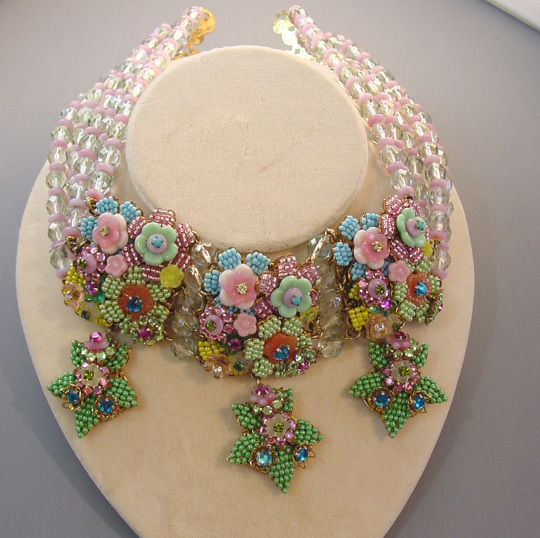 Worked with designer Moschino and did 150,000 pieces for him. 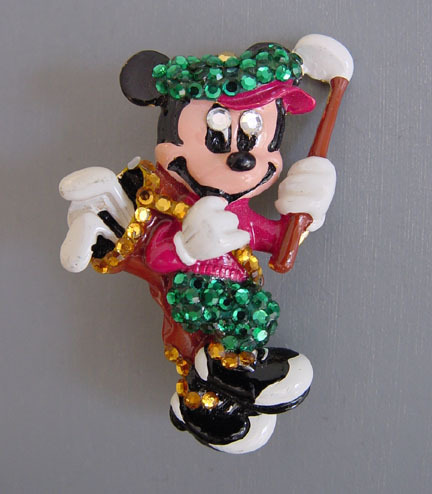 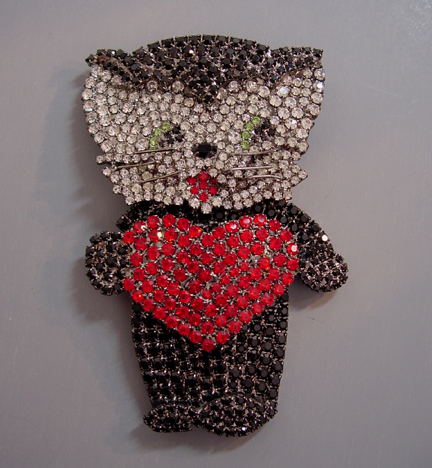 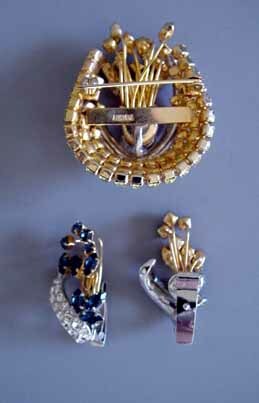 Also did Disney, Felix the Cat, Frances Ford Coppola's "Dracula", and jewelry for the "NFL for Women" including logos, team names etc. 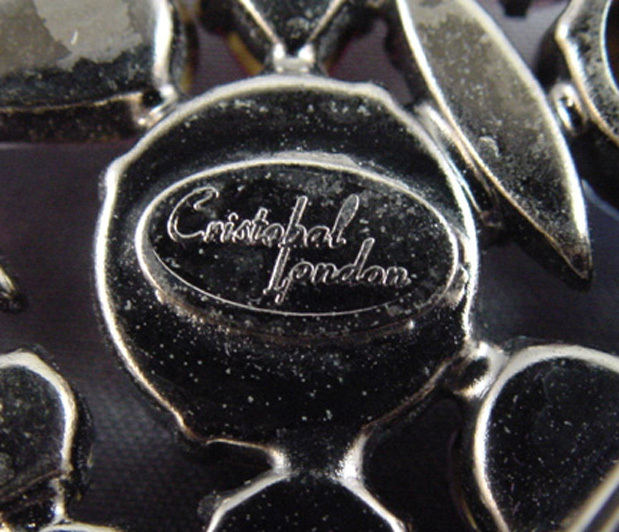 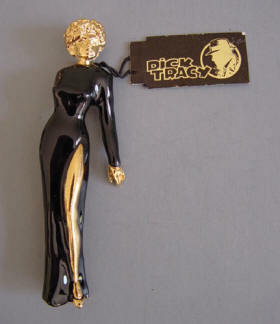 Sadly her pieces have been reproduced to be careful what you buy and from whom you buy it. 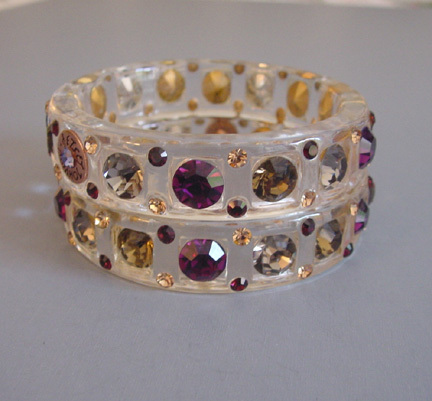 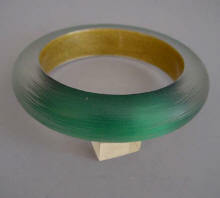 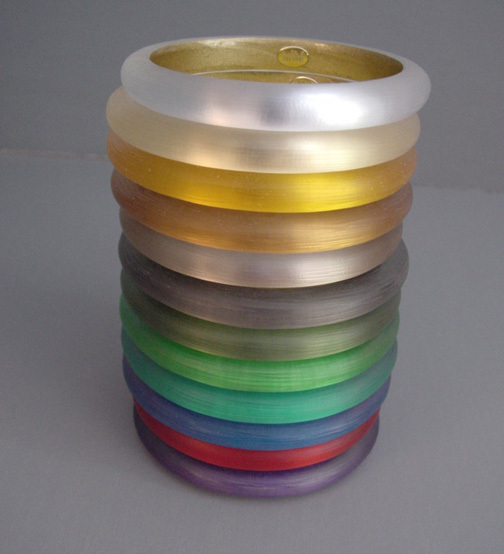 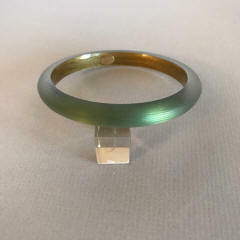 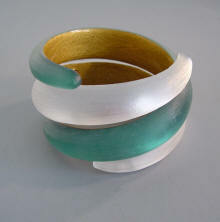 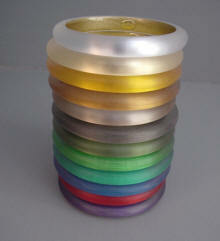 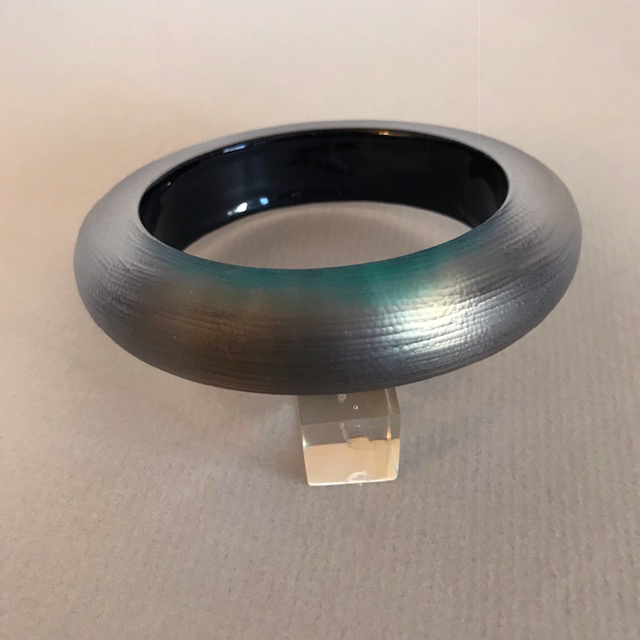 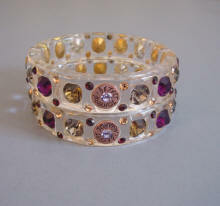 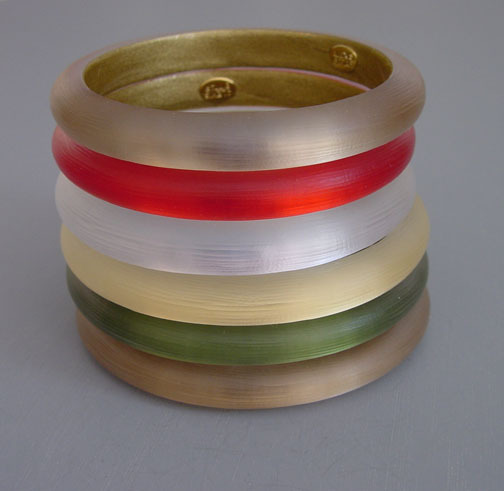 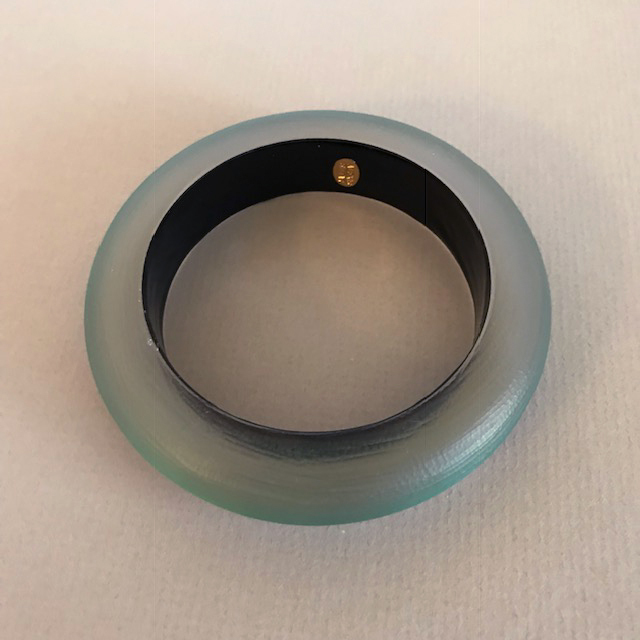 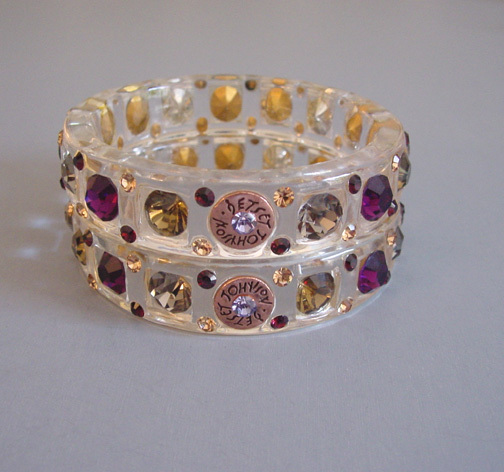 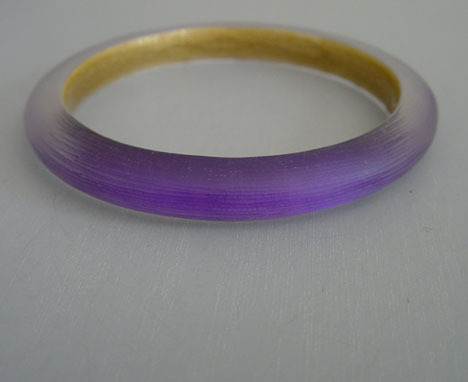 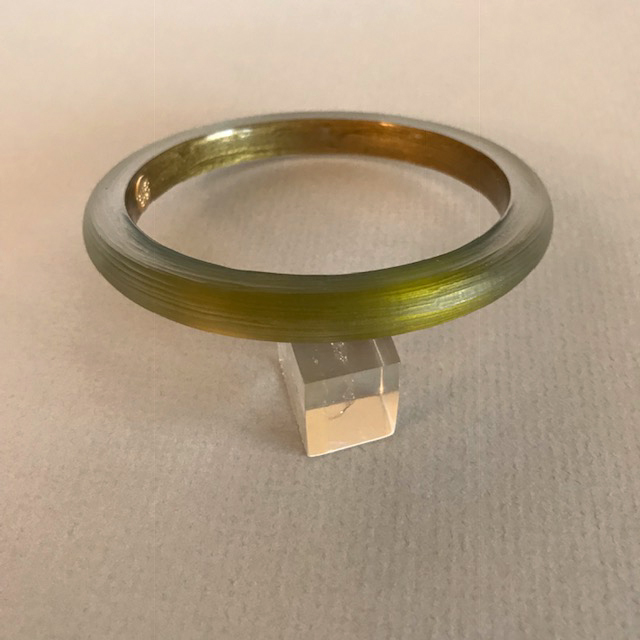 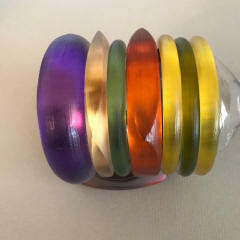 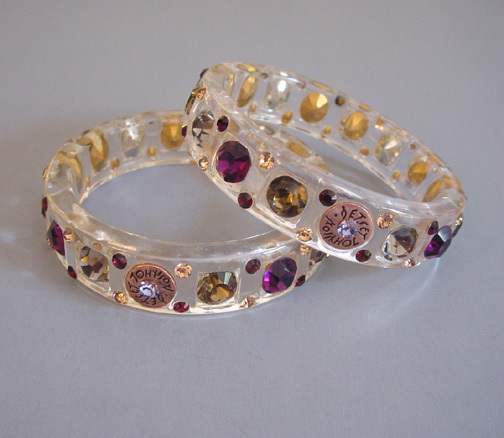 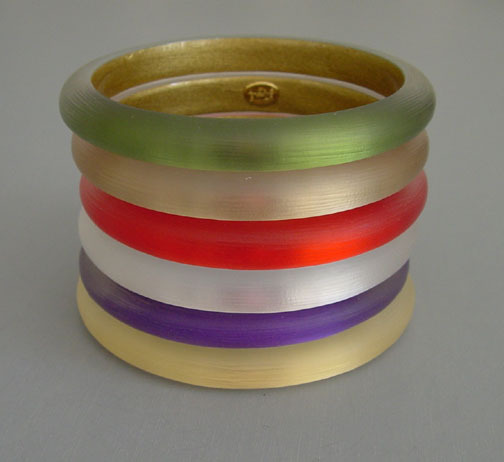 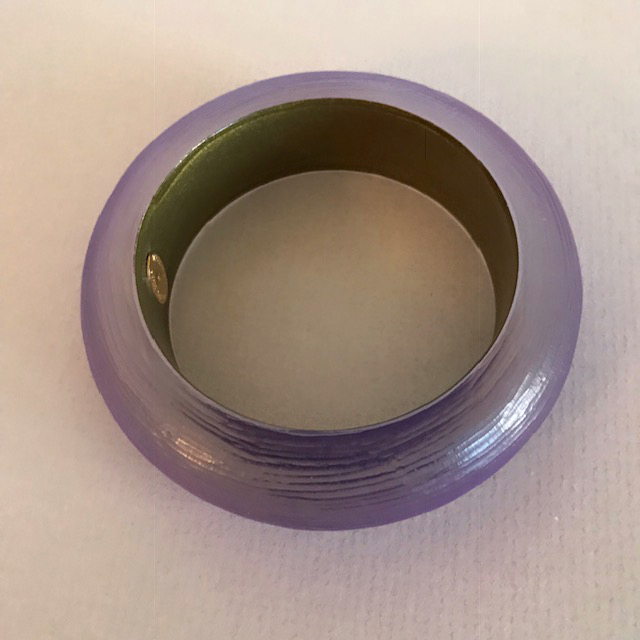 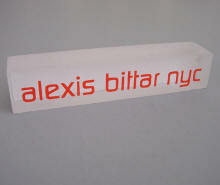 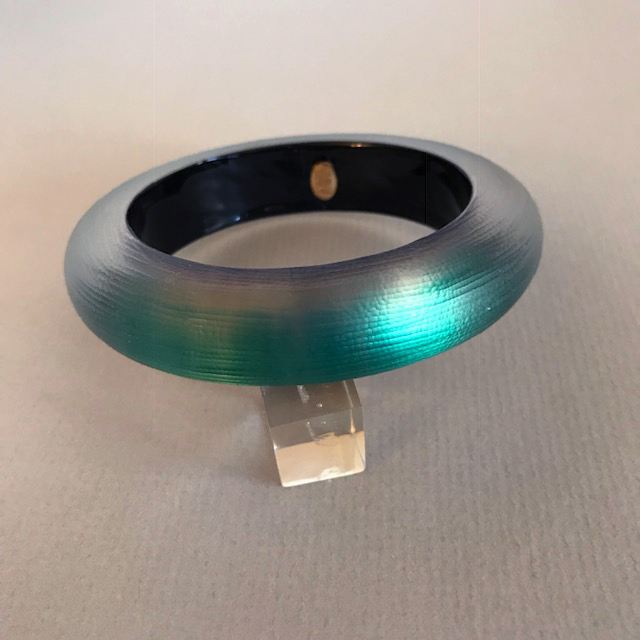 ALEXIS BITTAR Lucite bangles stacks. 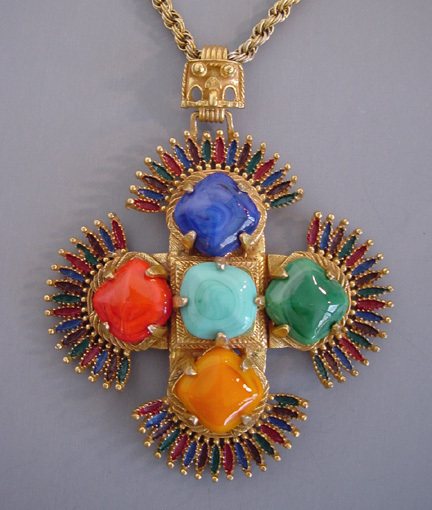 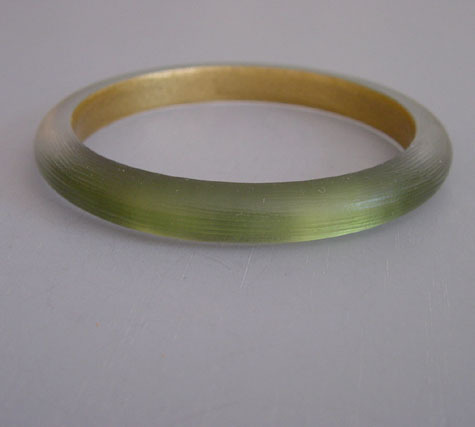 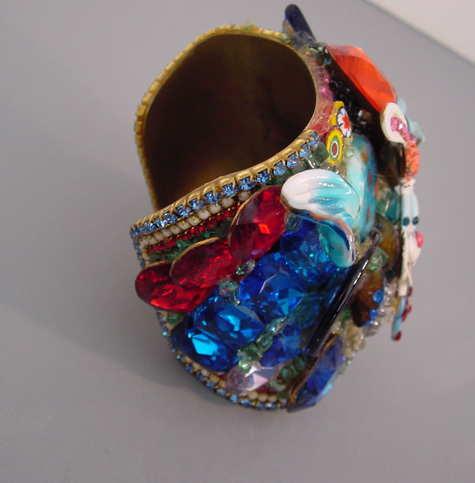 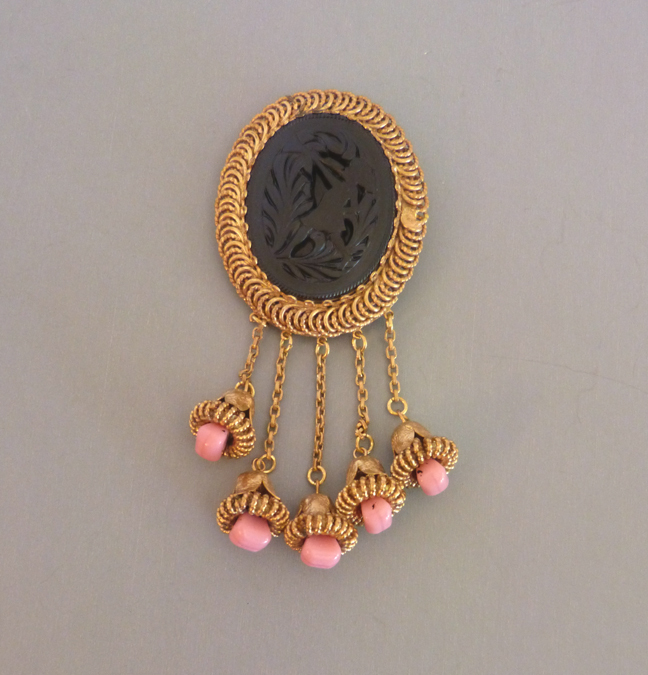 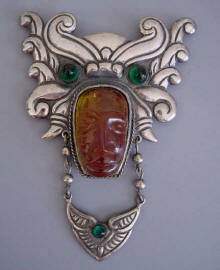 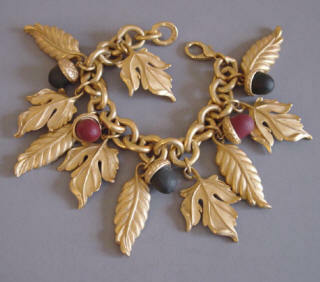 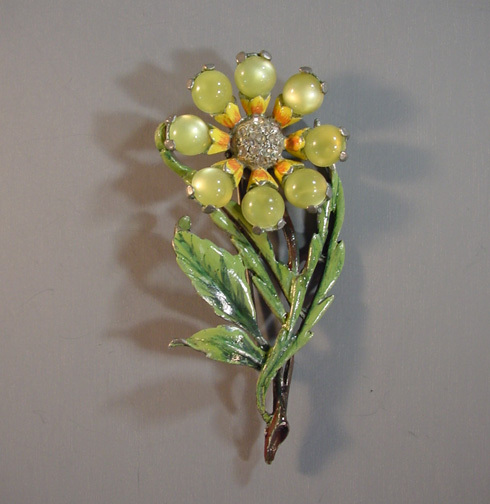 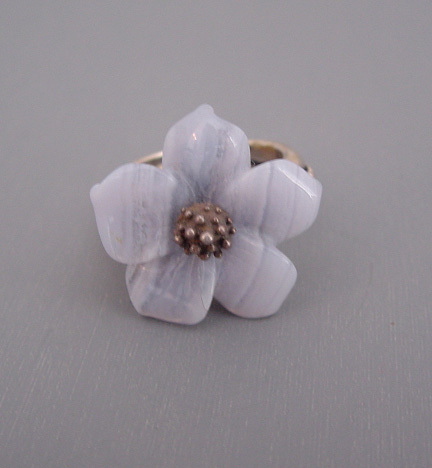 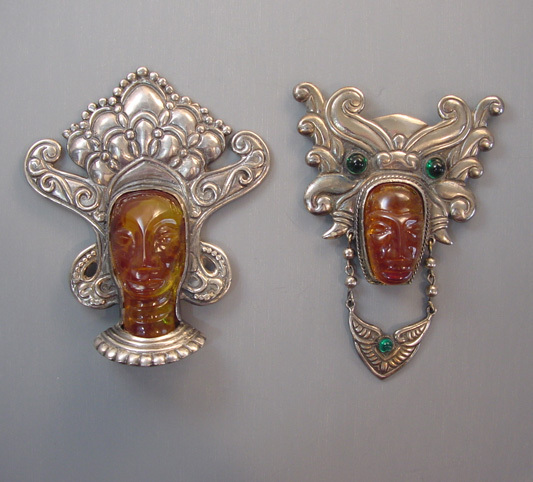 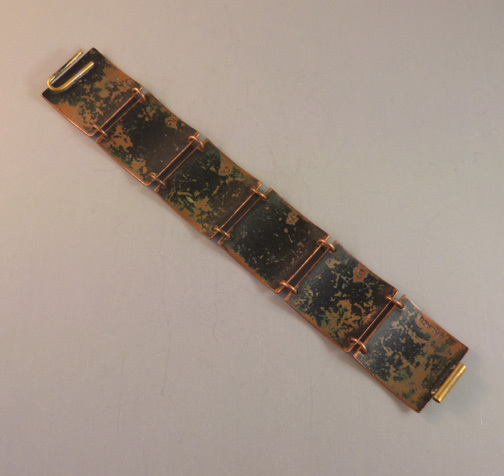 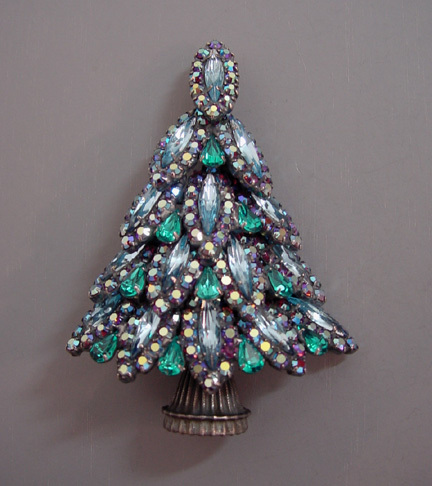 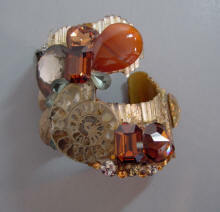 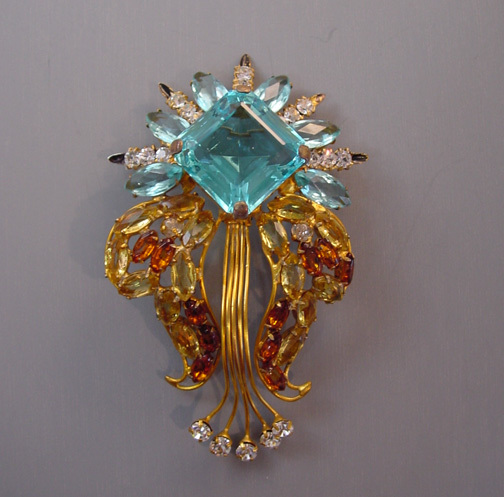 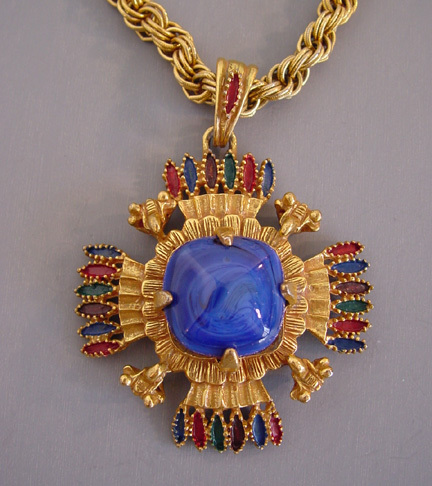 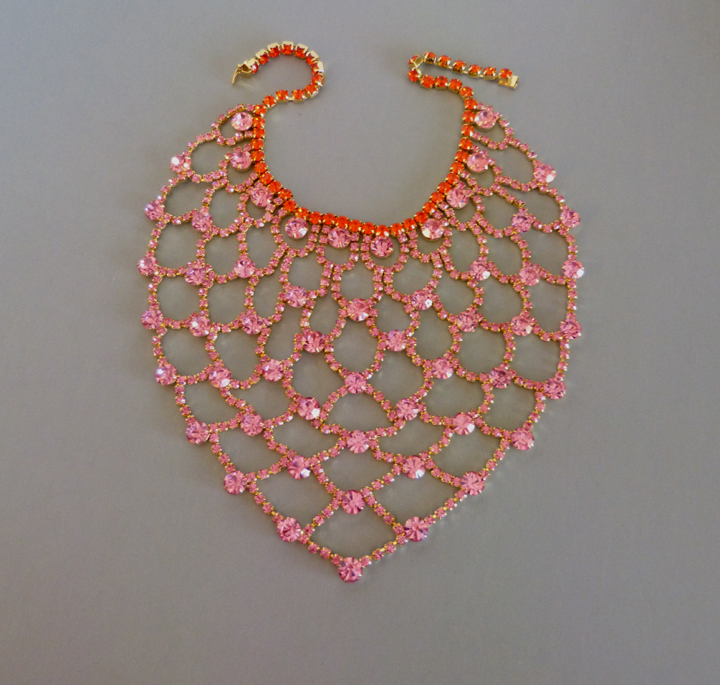 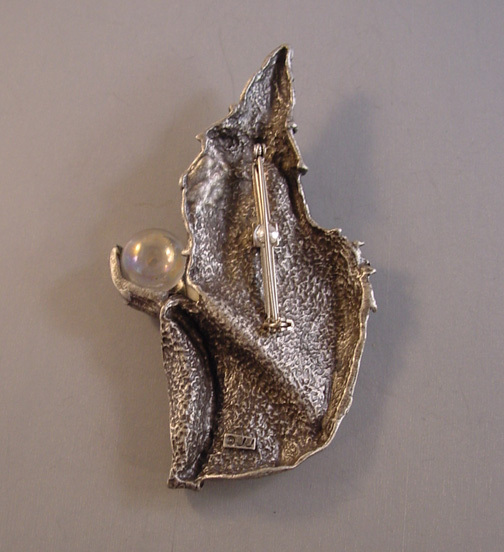 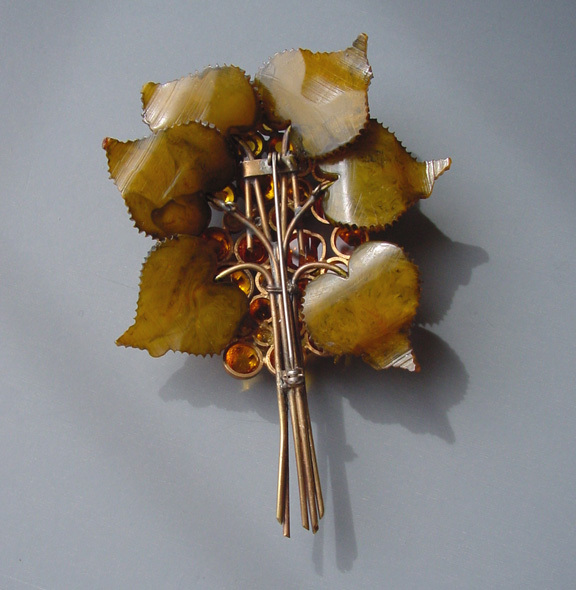 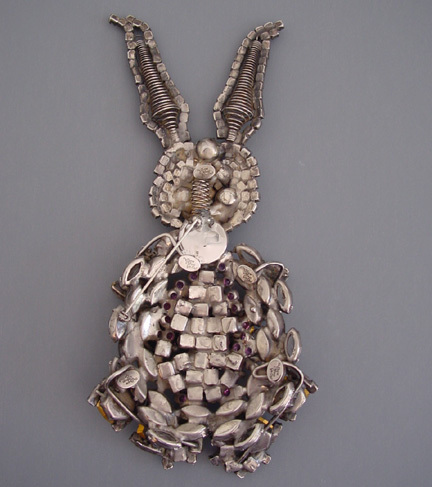 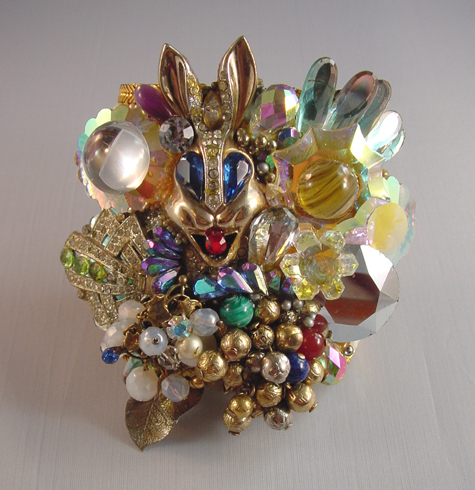 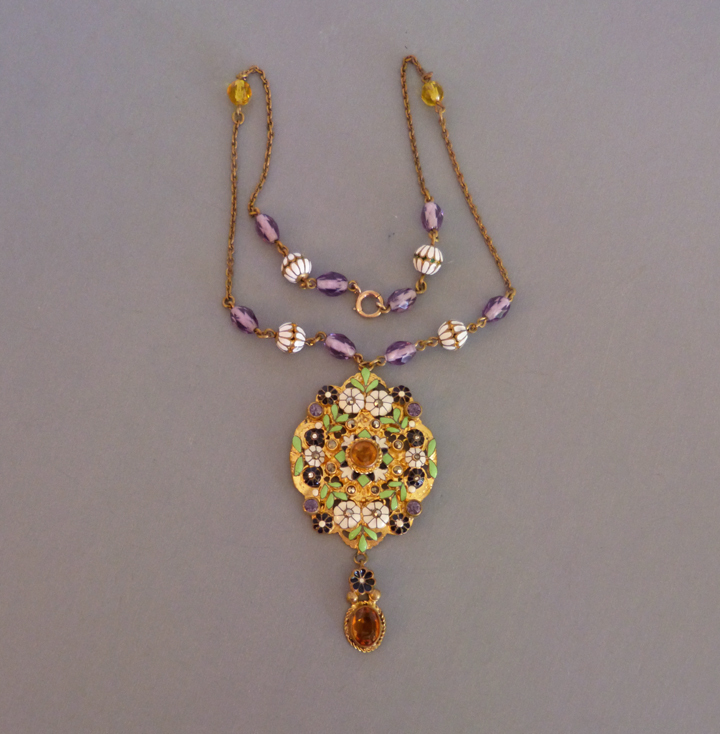 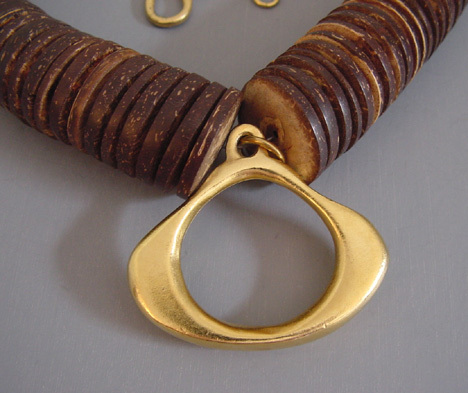 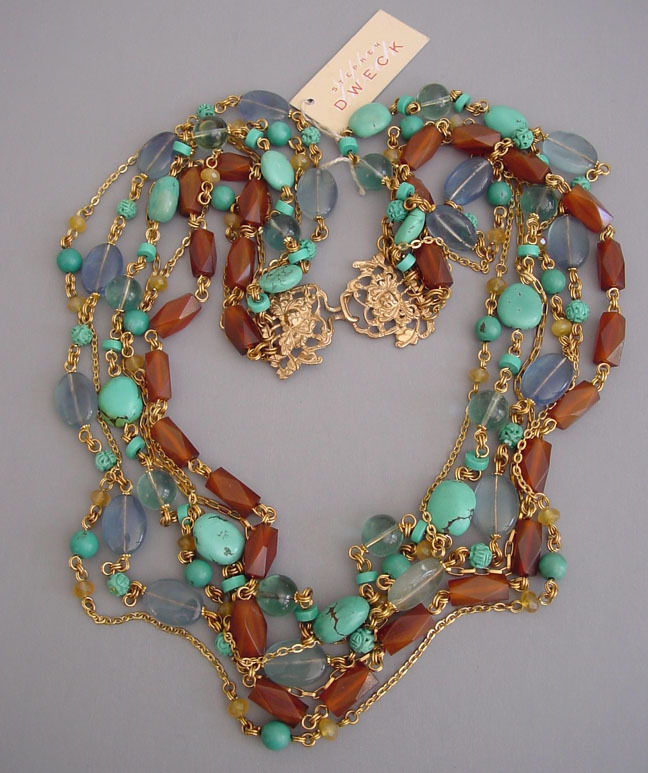 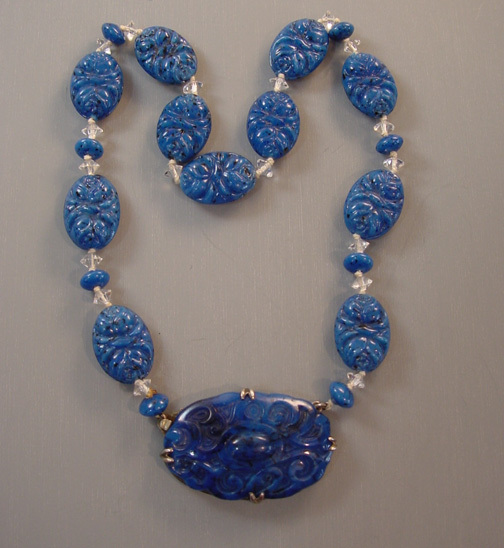 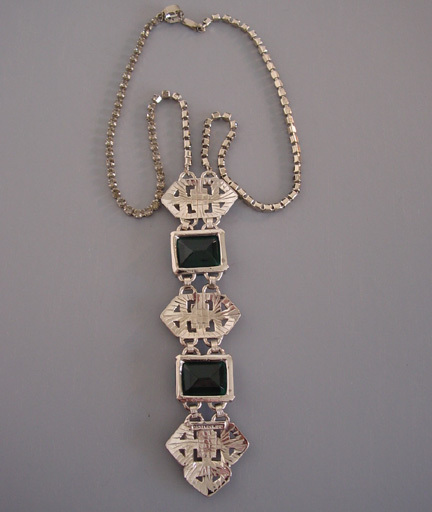 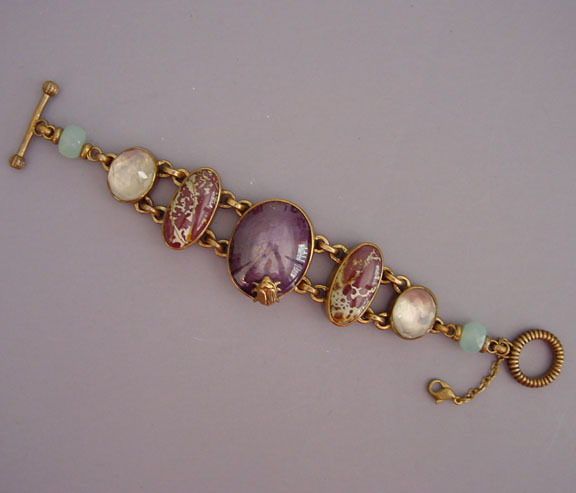 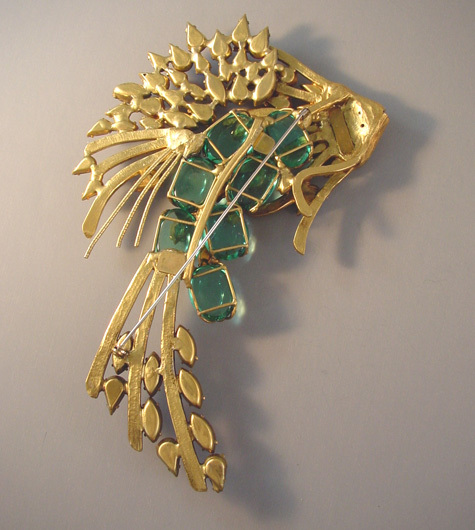 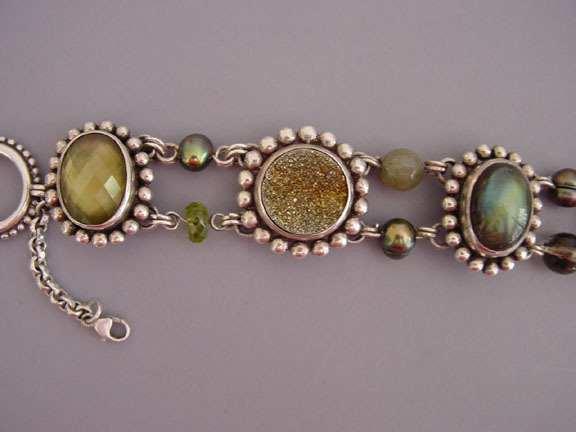 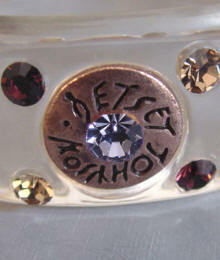 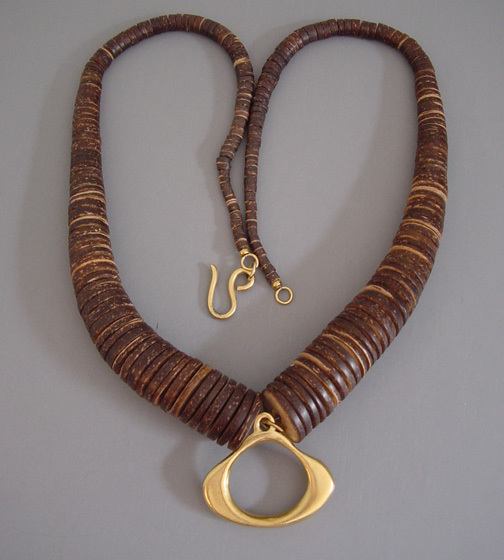 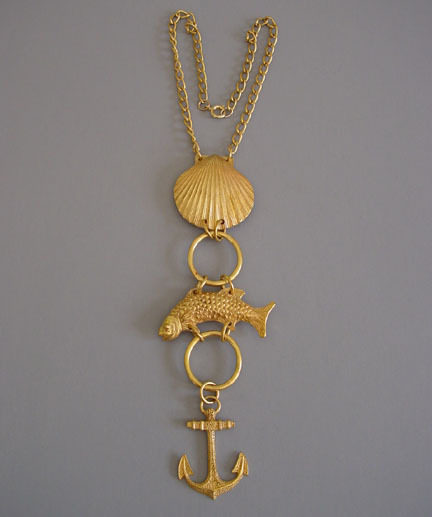 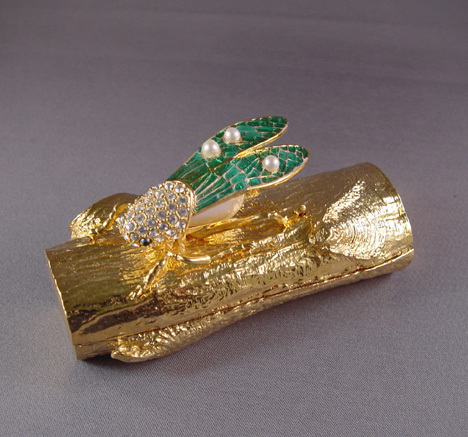 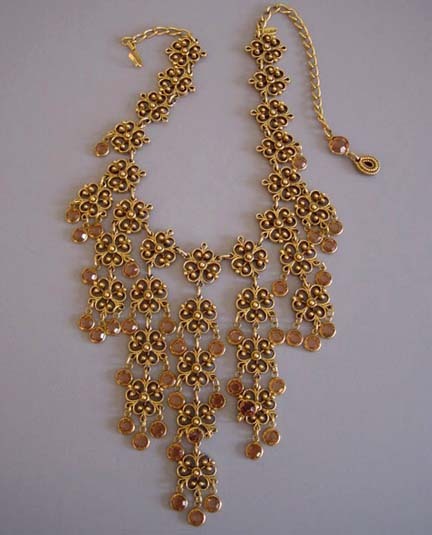 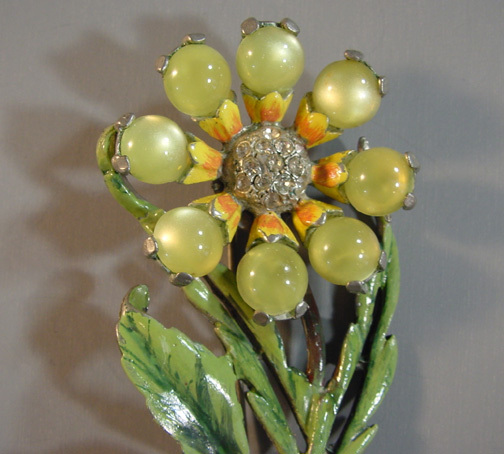 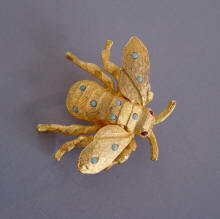 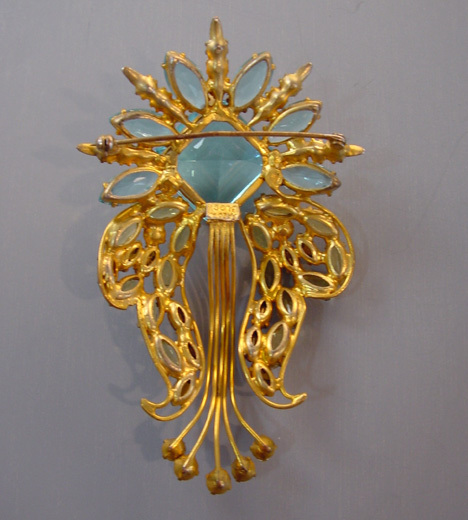 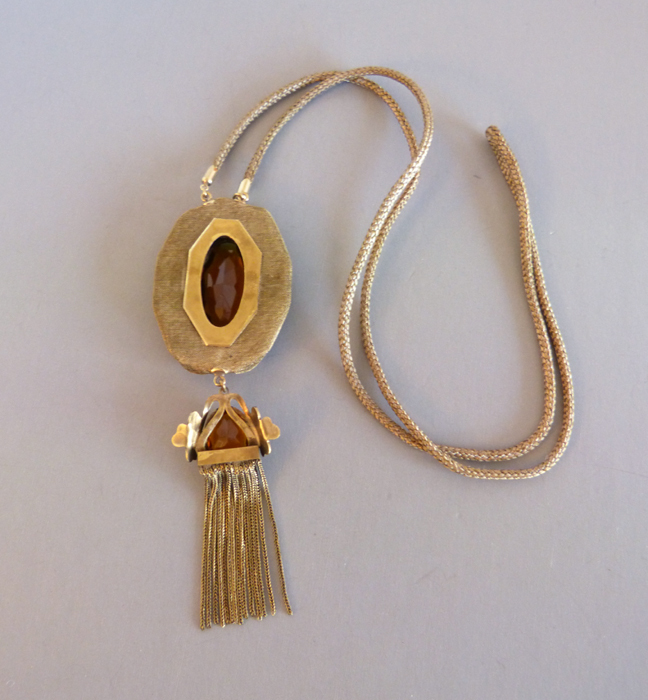 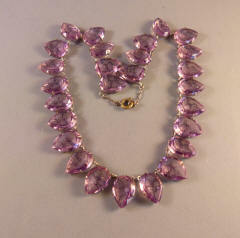 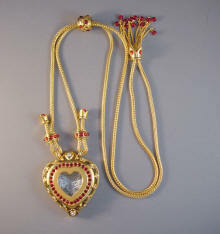 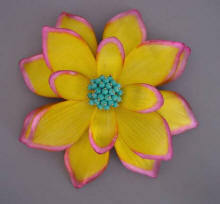 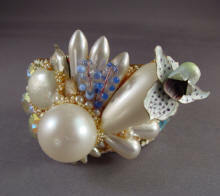 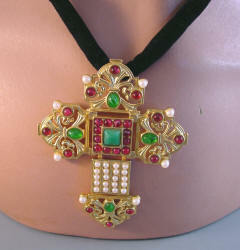 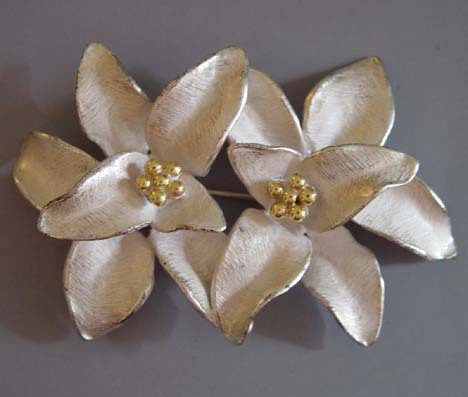 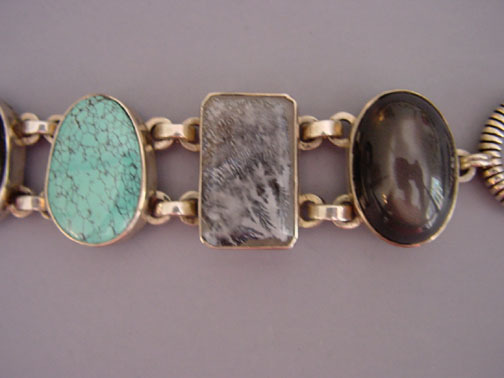 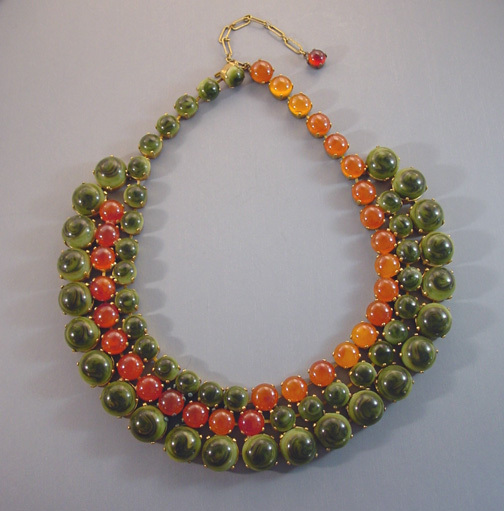 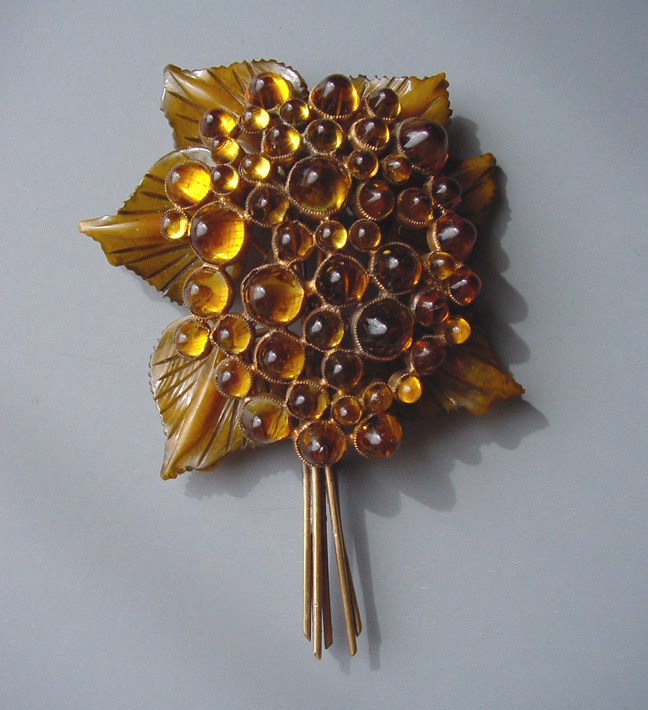 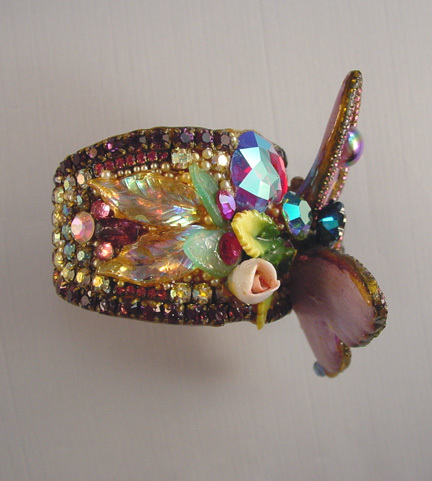 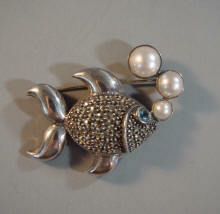 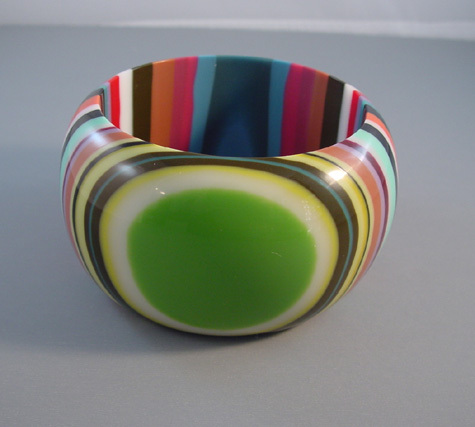 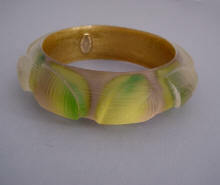 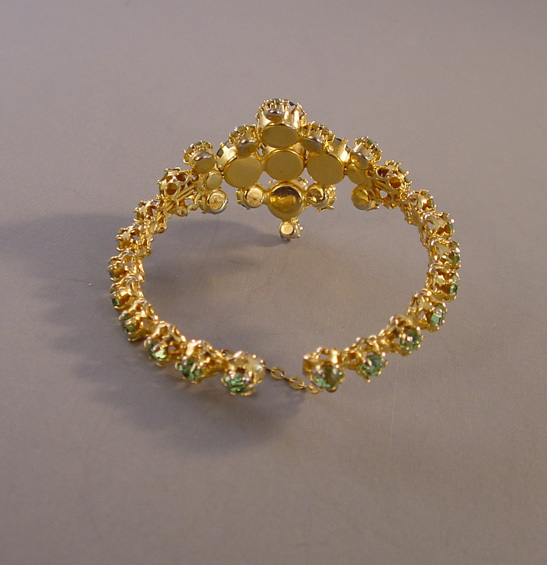 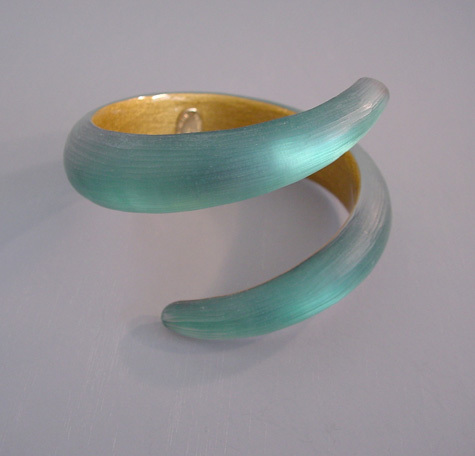 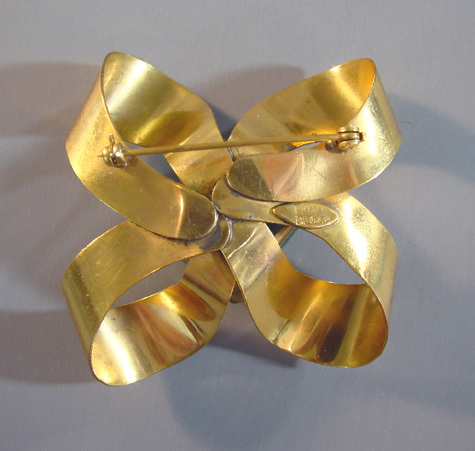 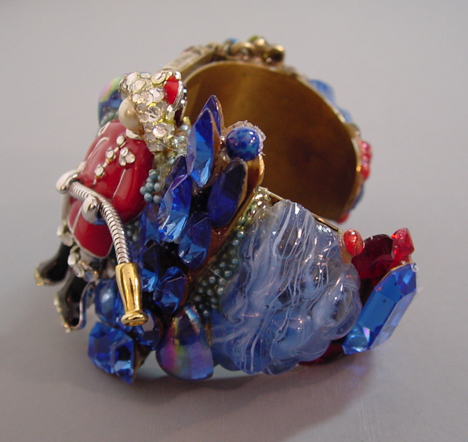 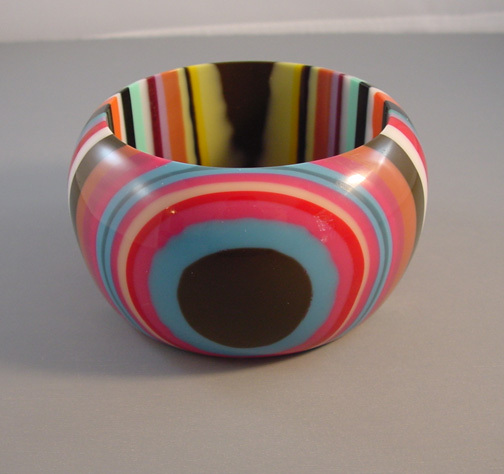 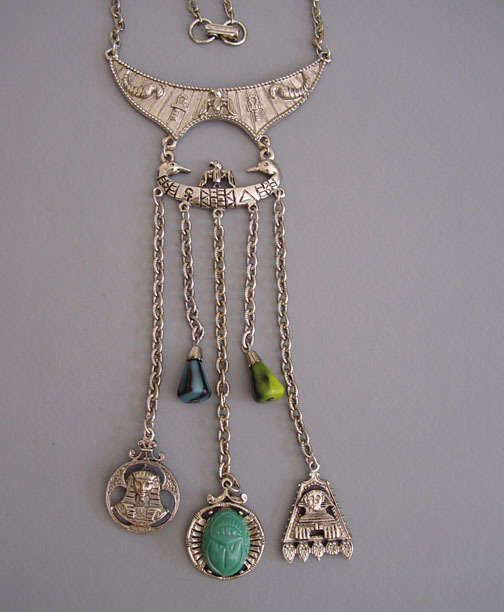 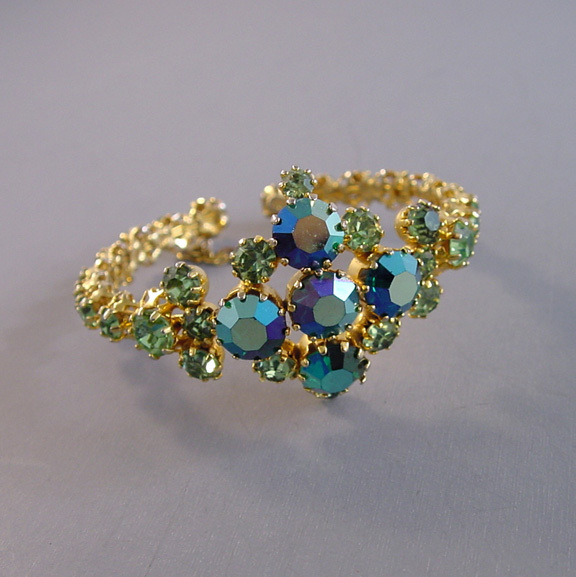 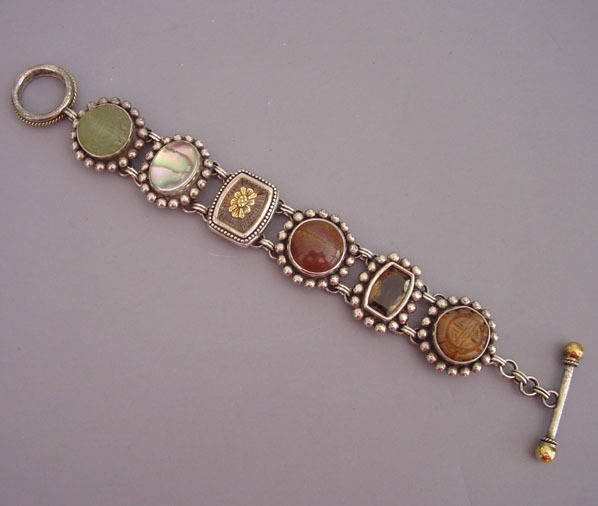 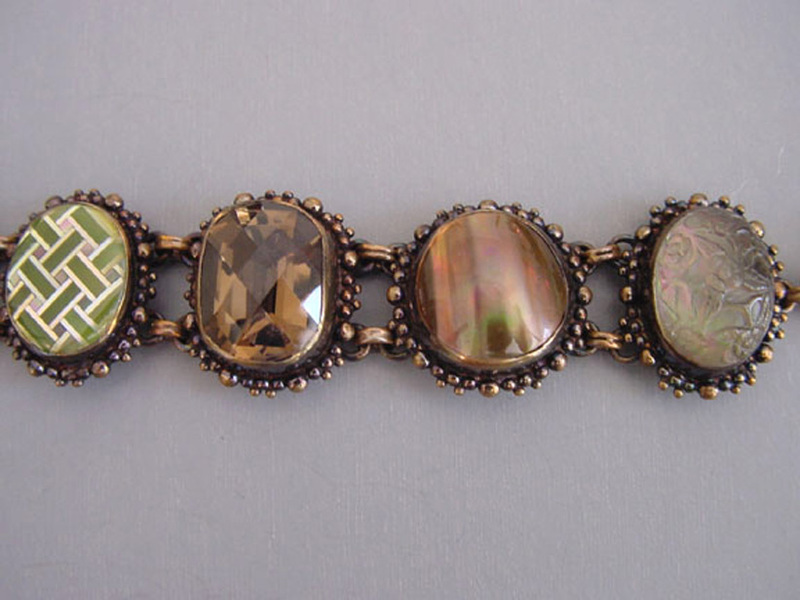 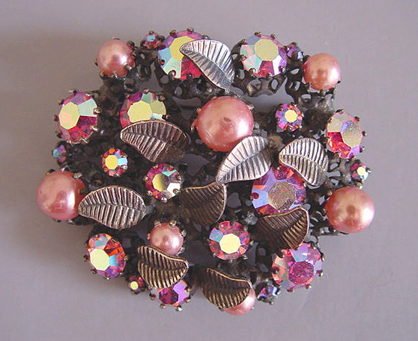 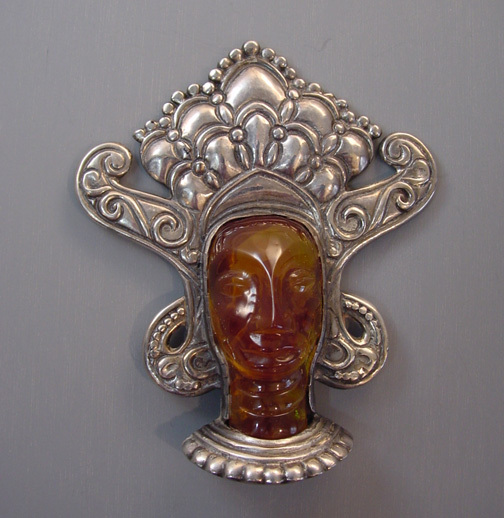 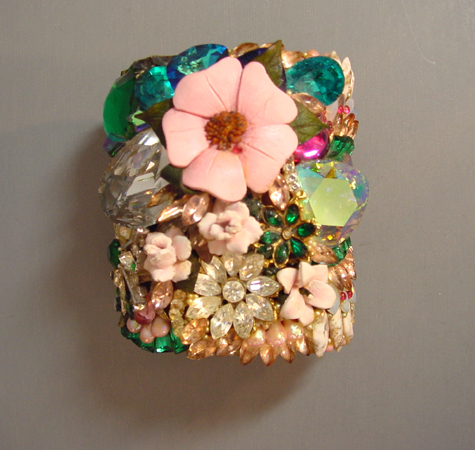 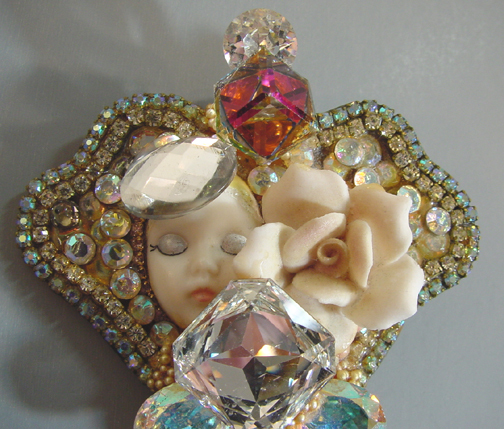 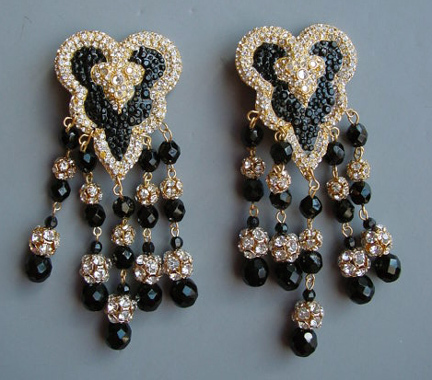 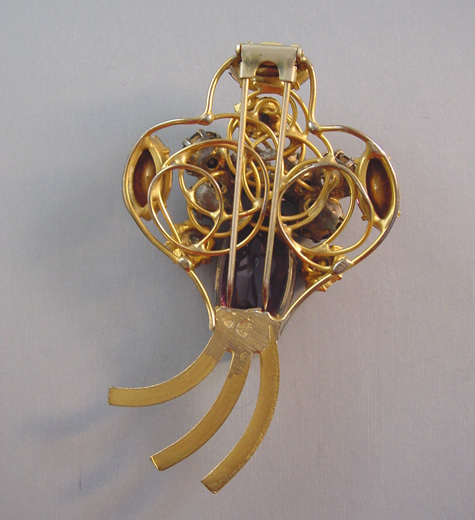 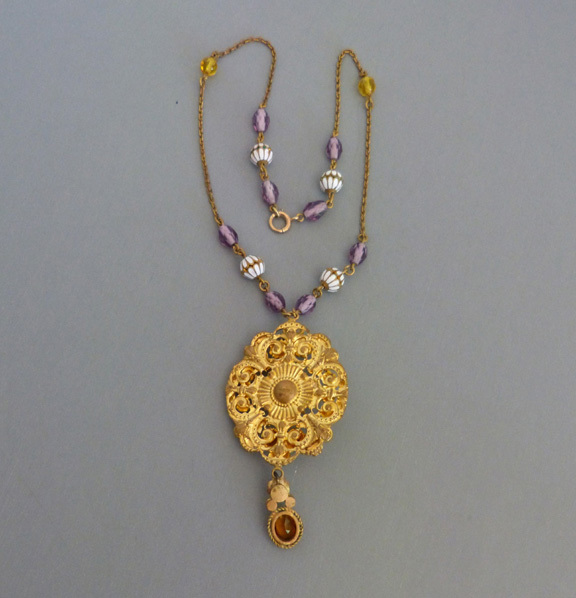 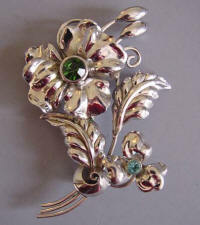 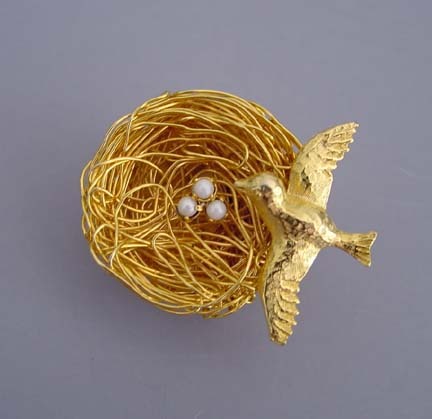 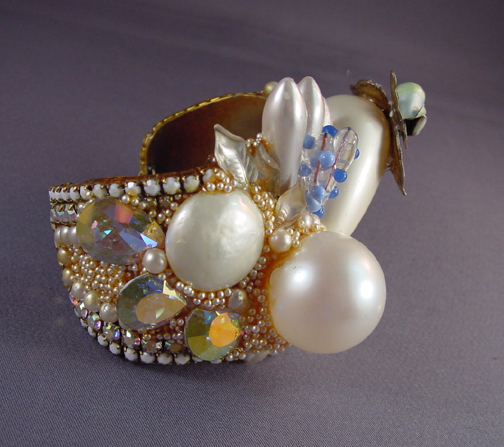 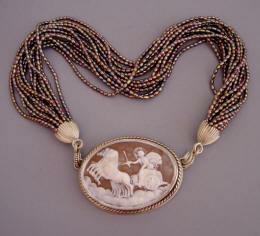 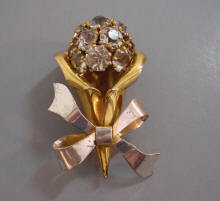 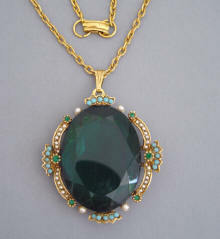 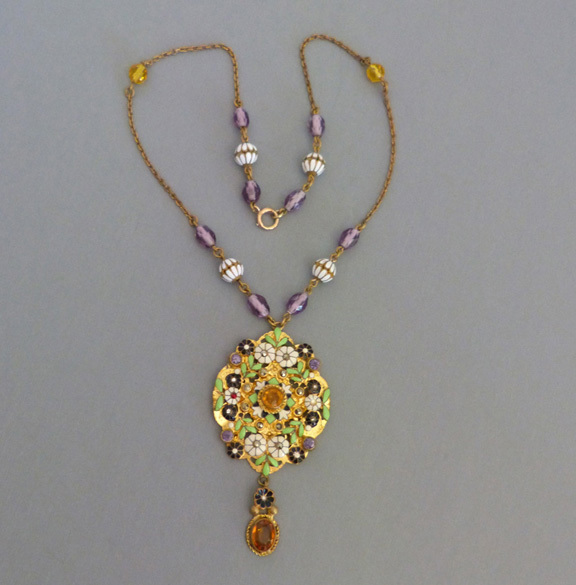 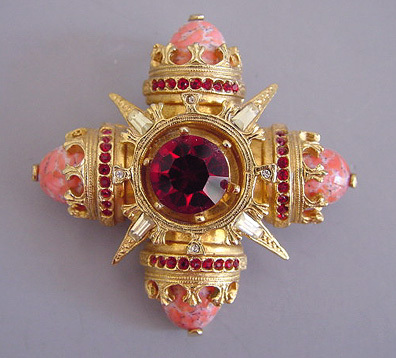 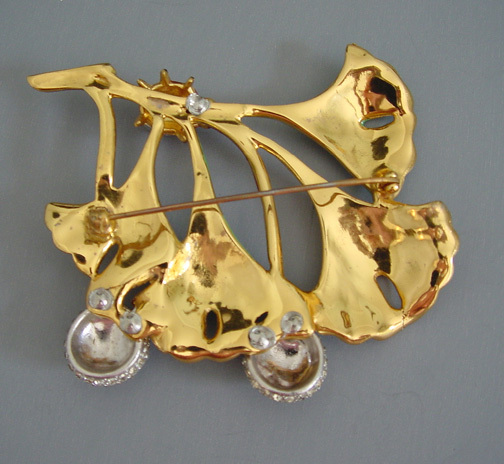 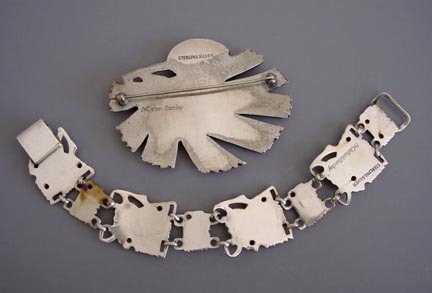 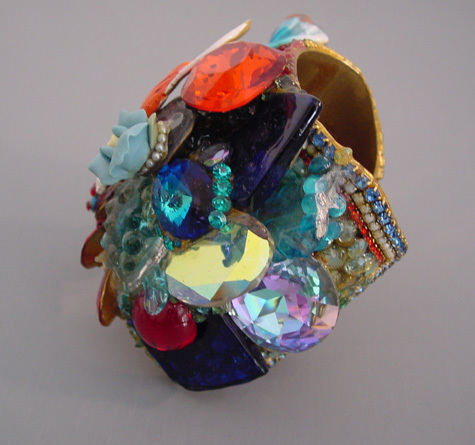 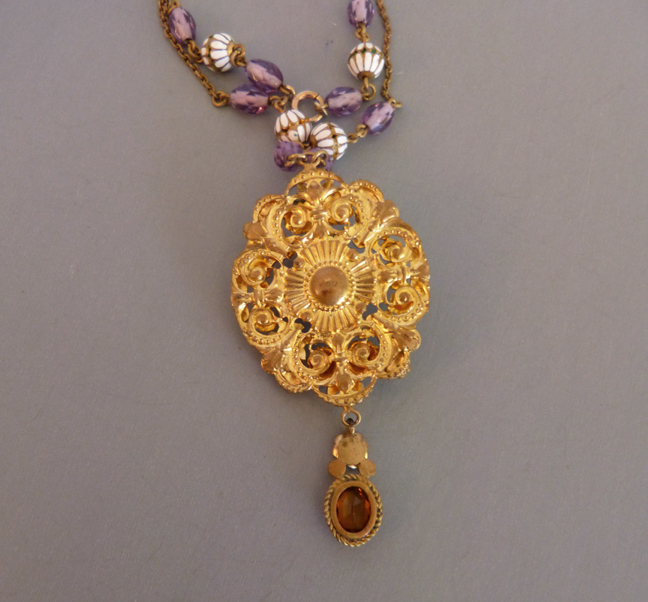 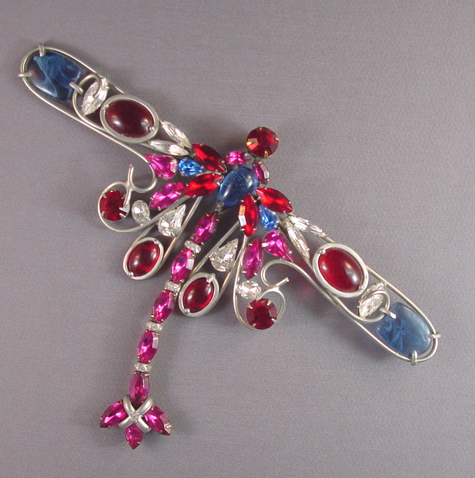 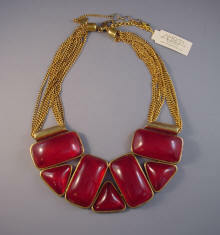 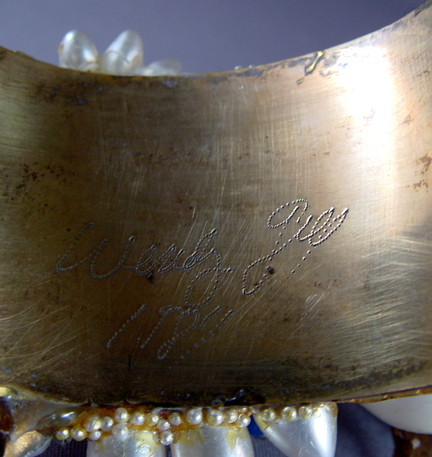 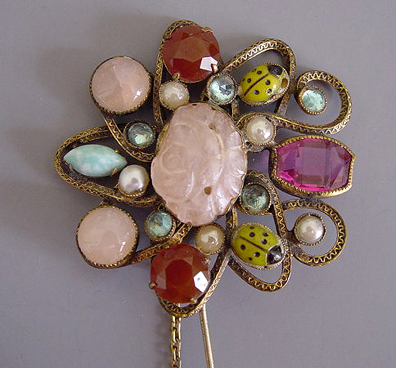 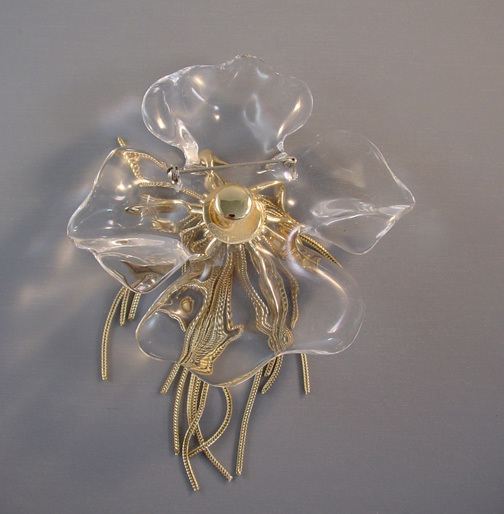 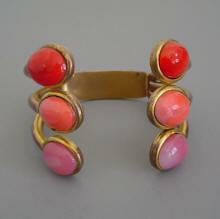 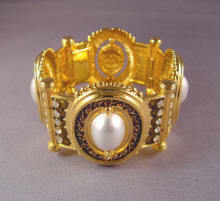 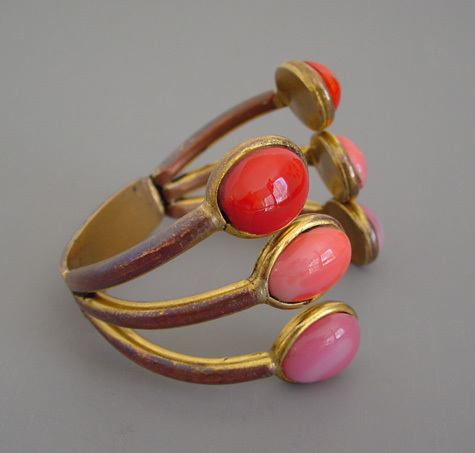 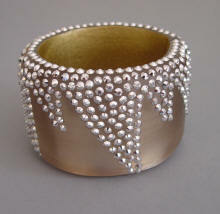 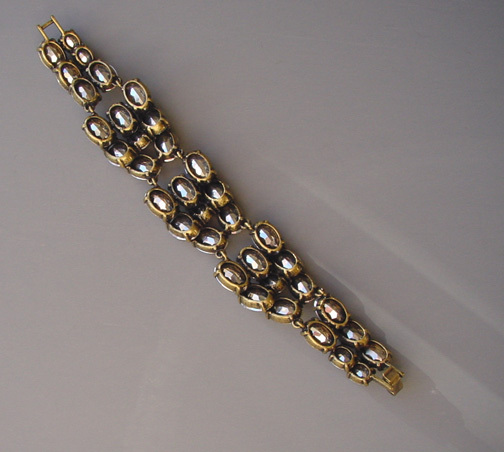 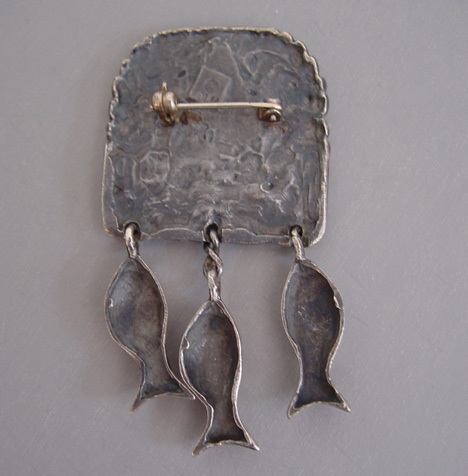 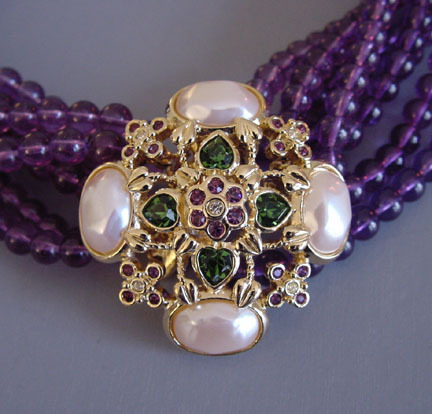 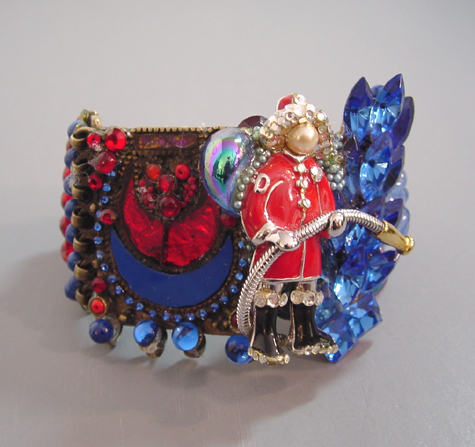 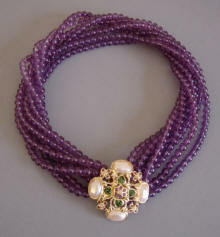 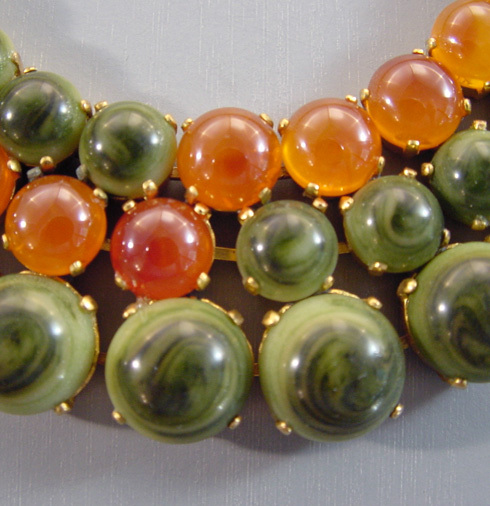 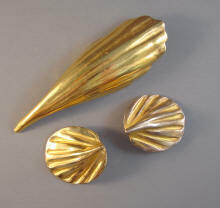 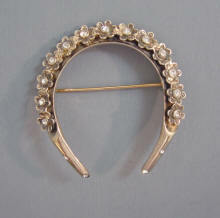 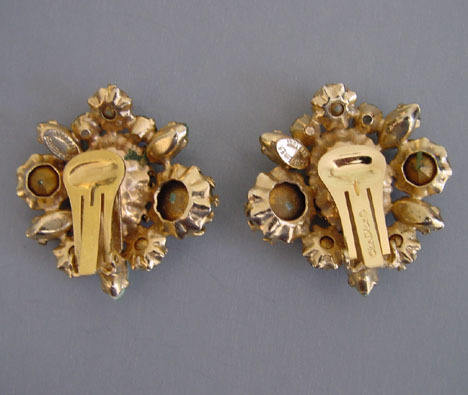 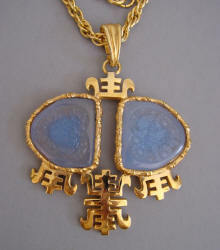 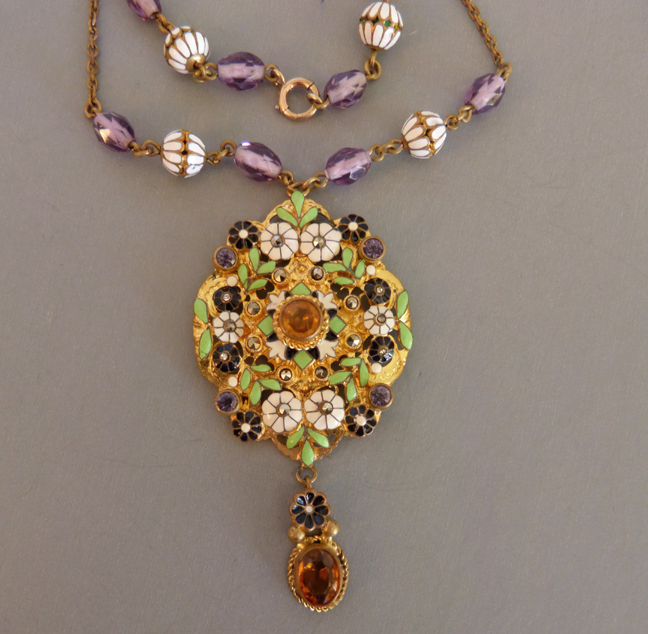 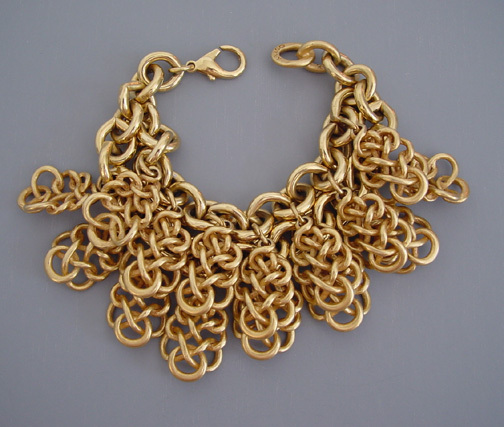 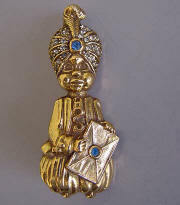 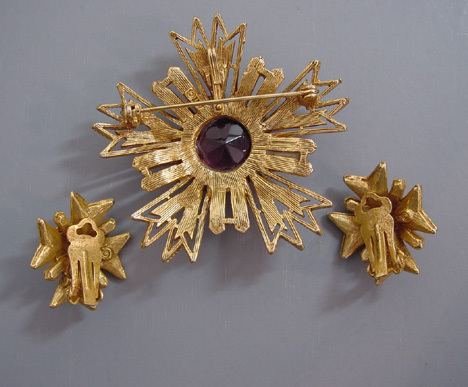 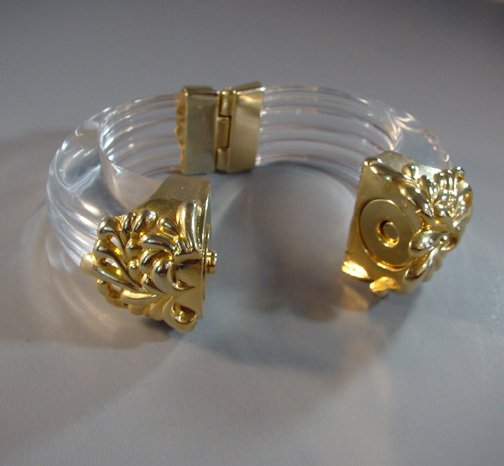 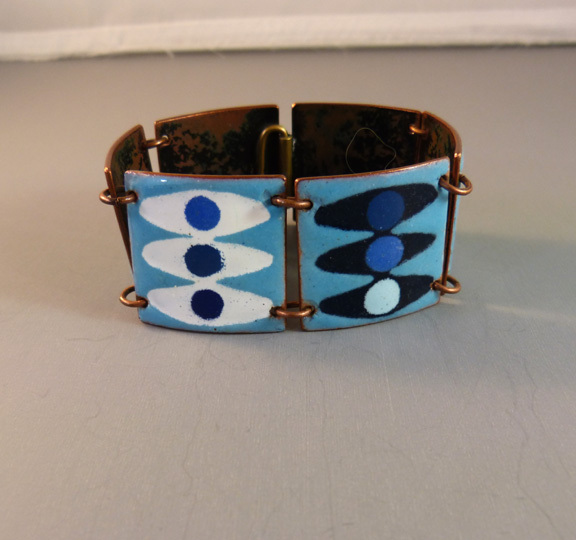 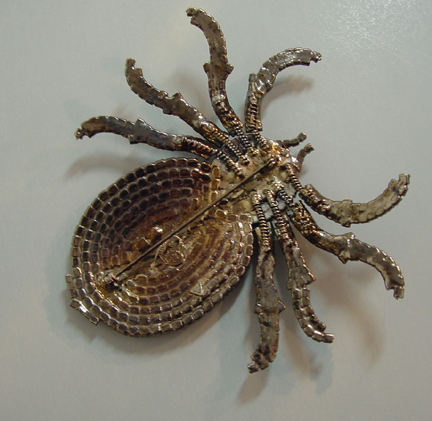 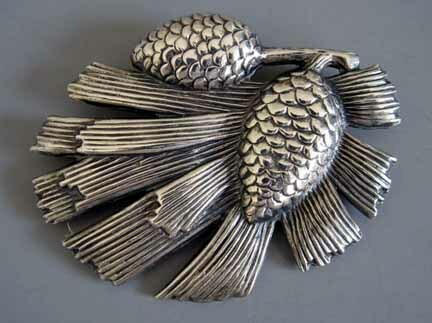 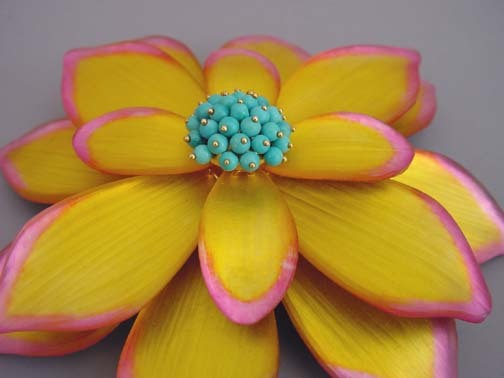 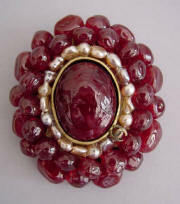 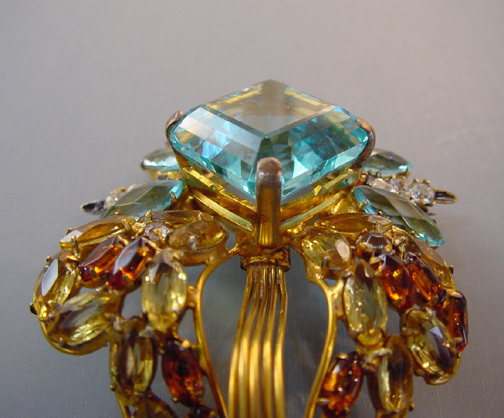 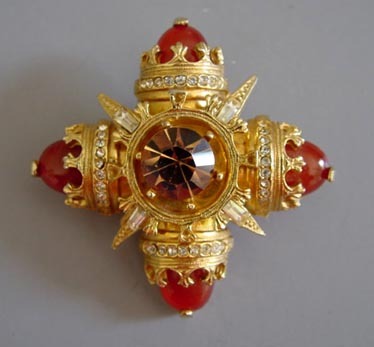 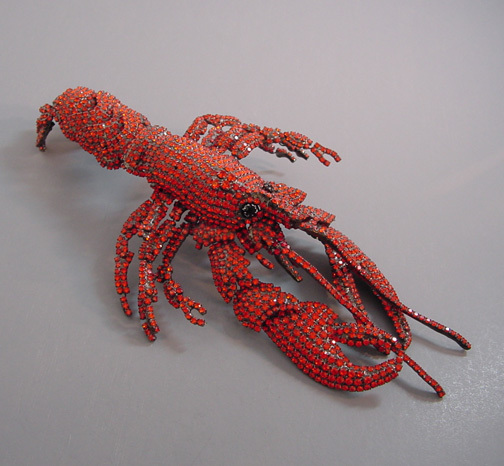 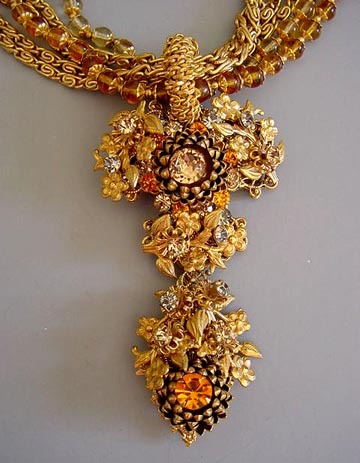 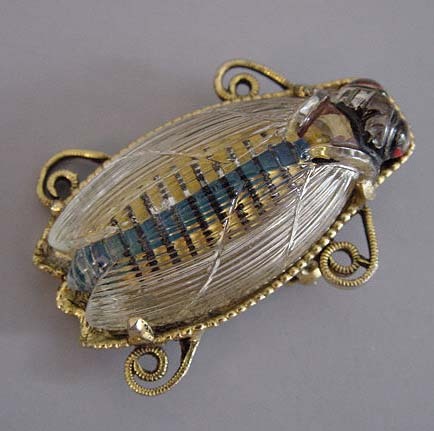 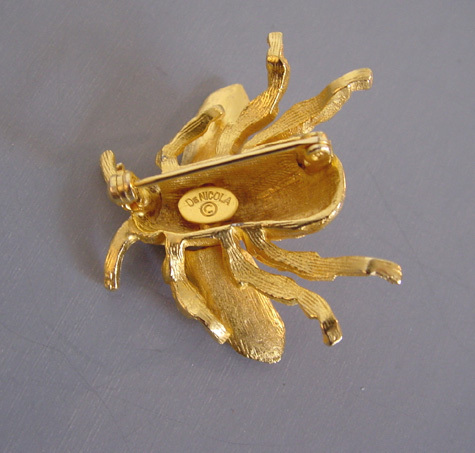 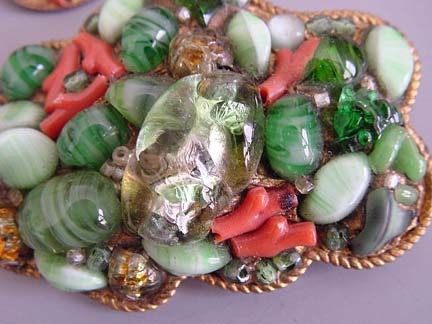 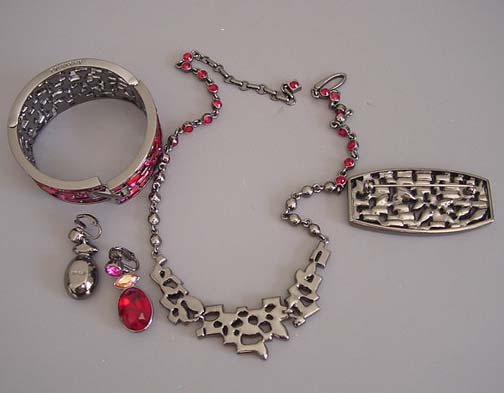 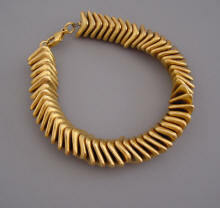 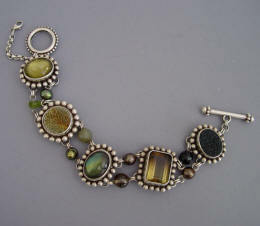 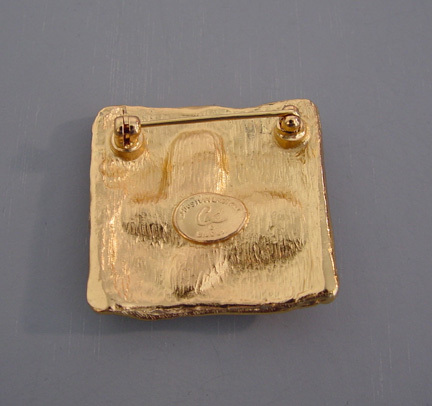 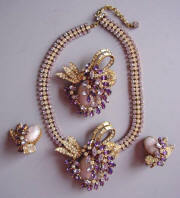 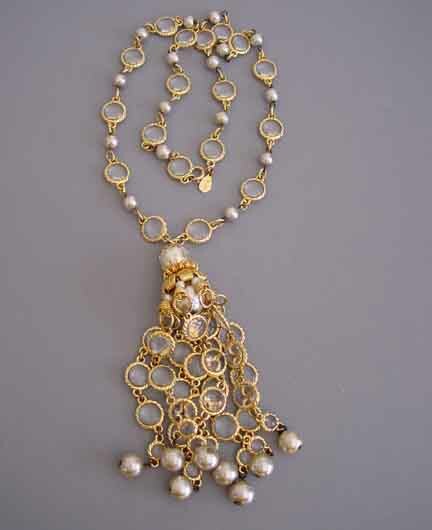 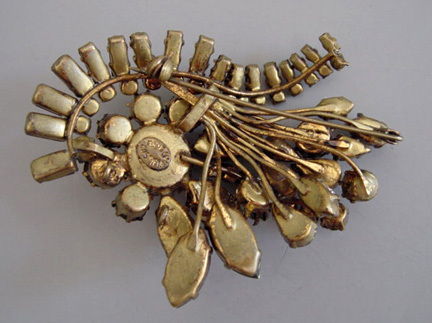 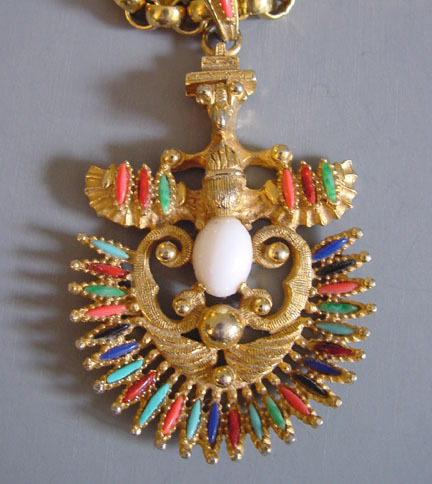 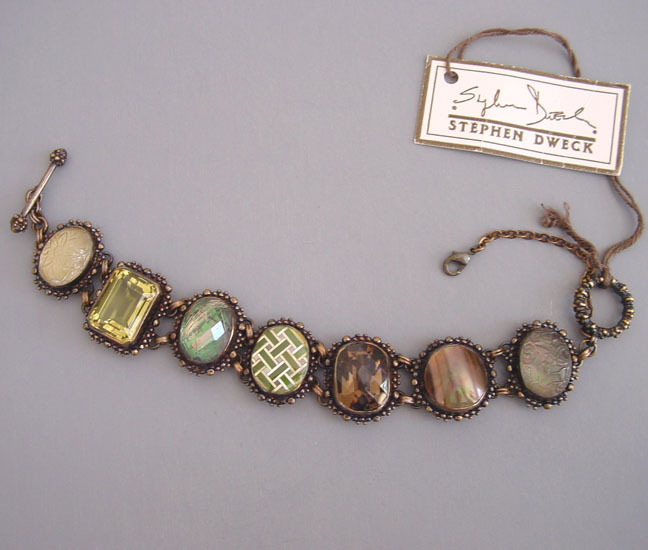 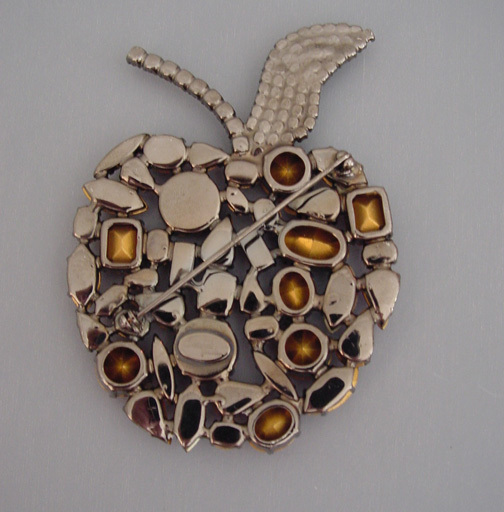 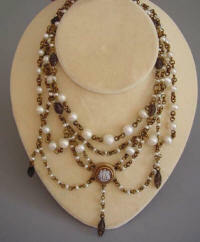 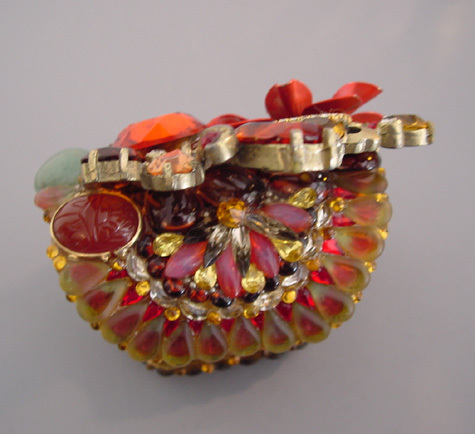 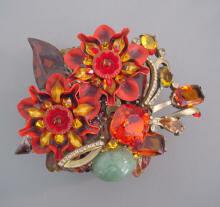 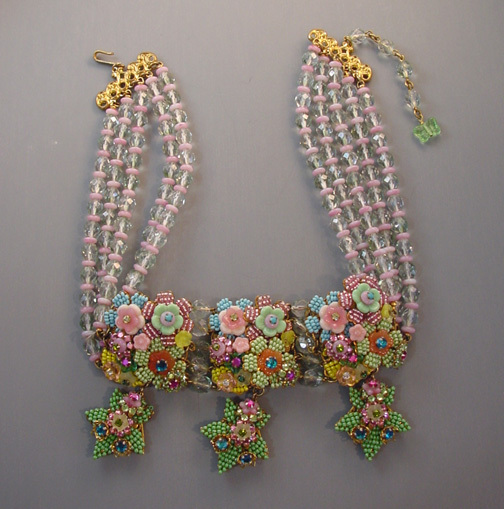 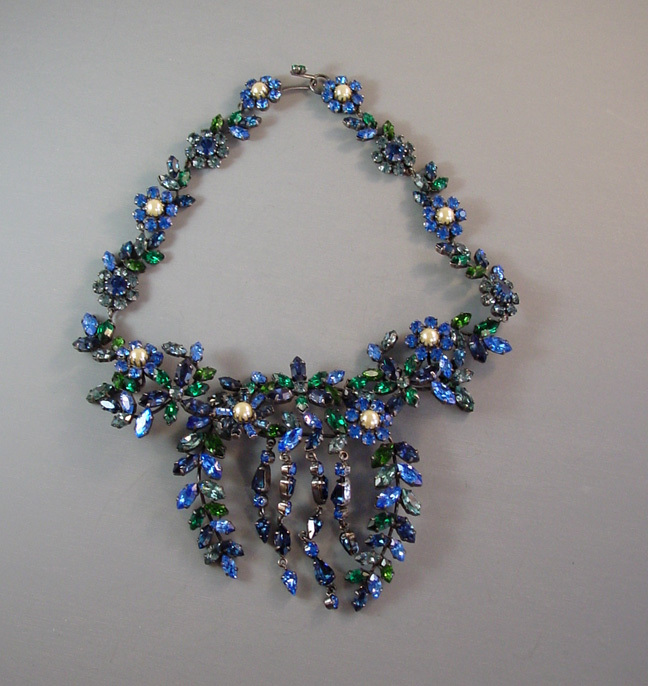 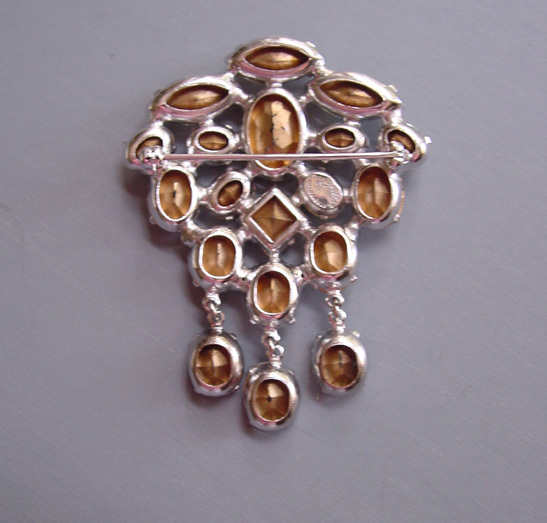 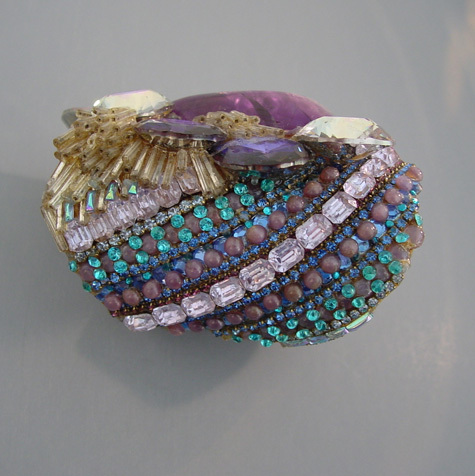 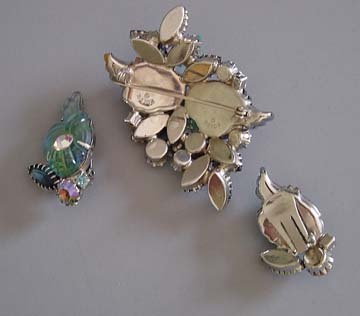 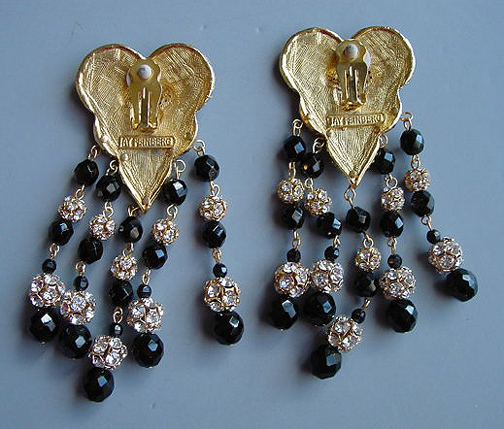 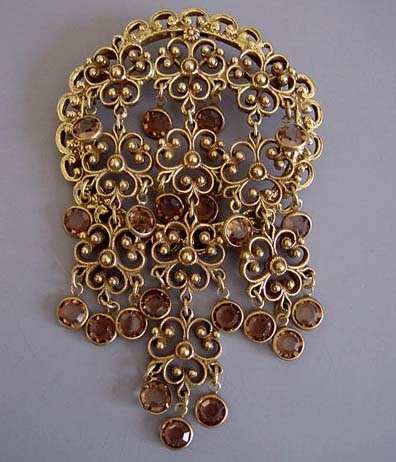 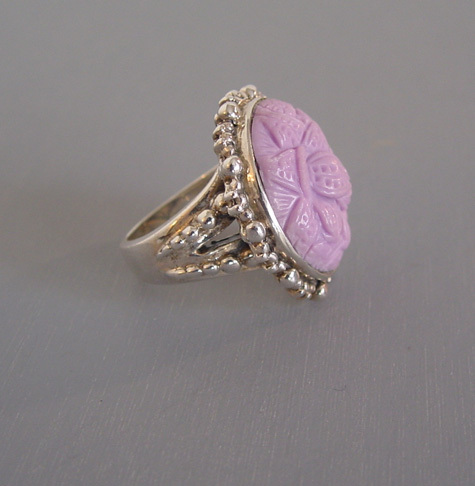 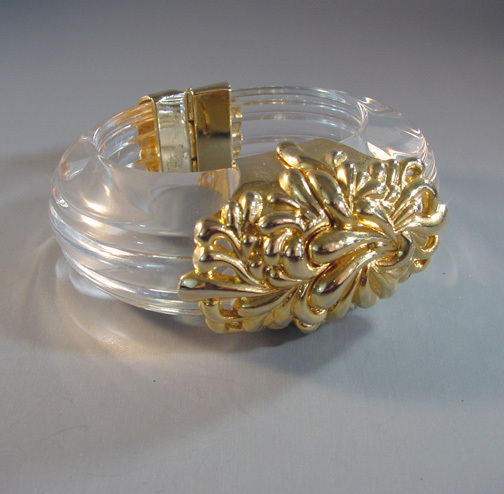 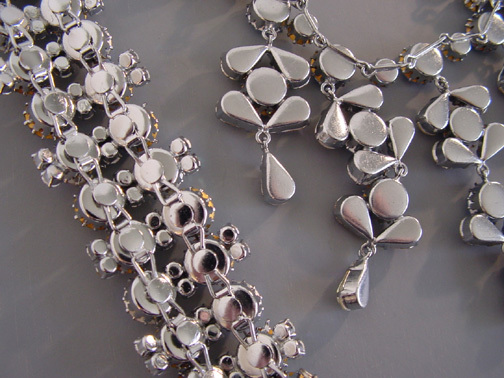 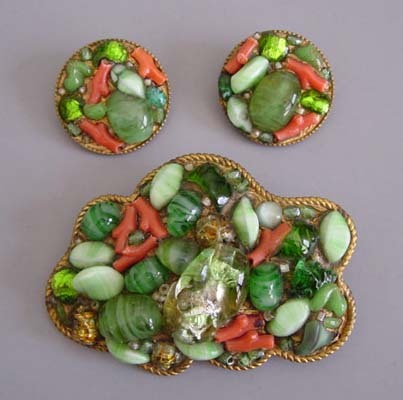 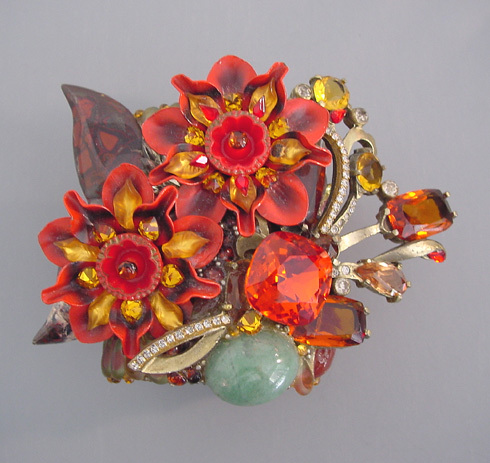 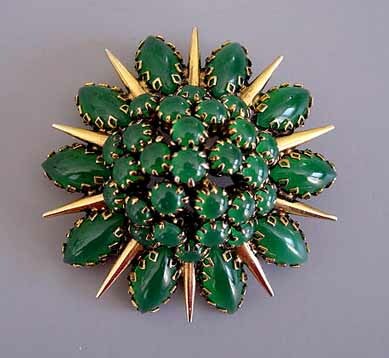 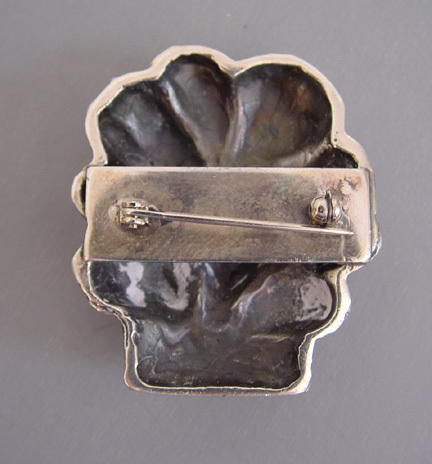 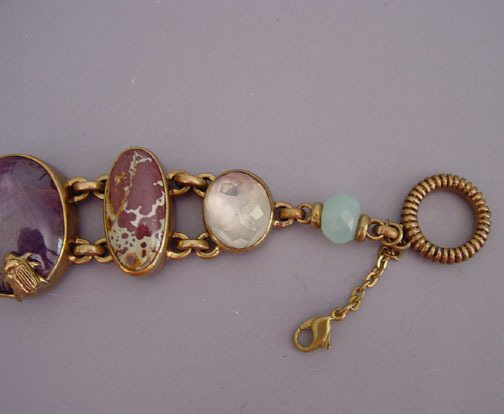 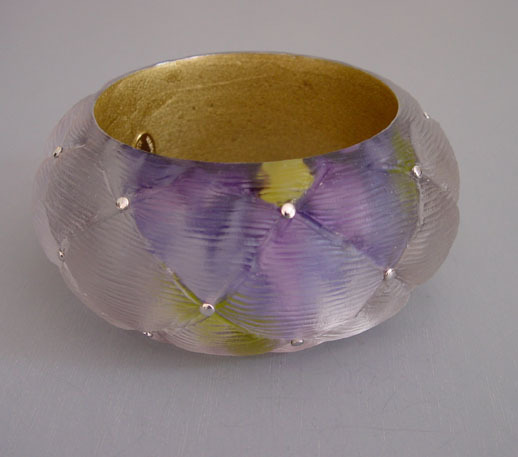 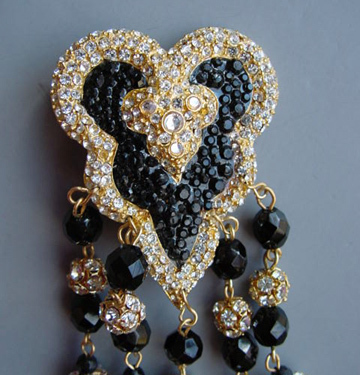 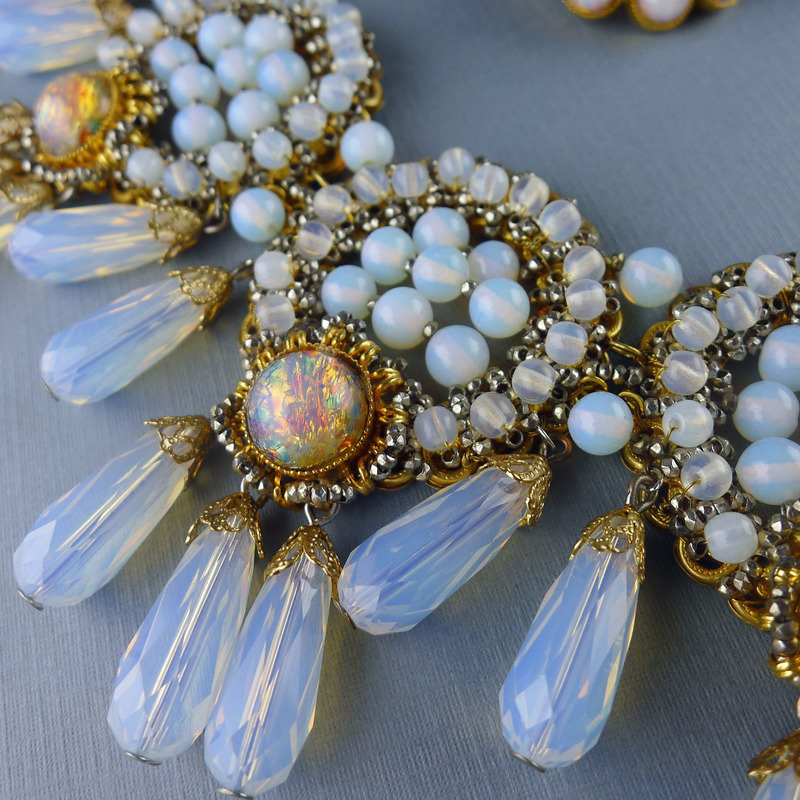 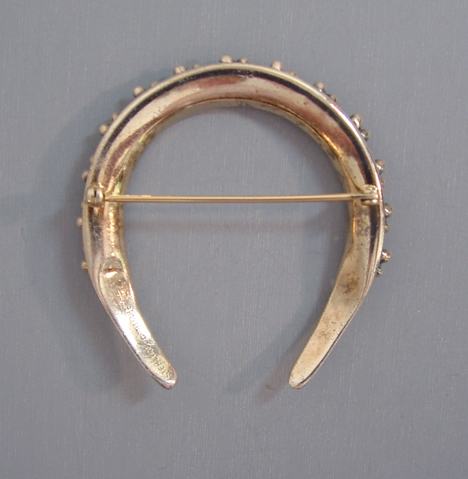 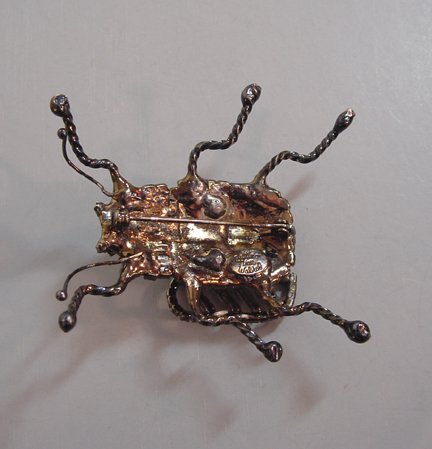 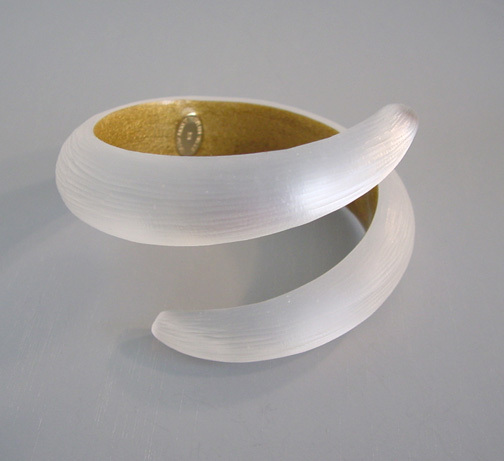 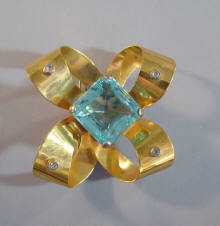 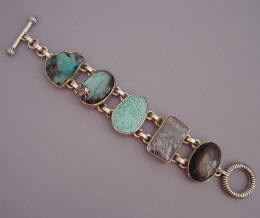 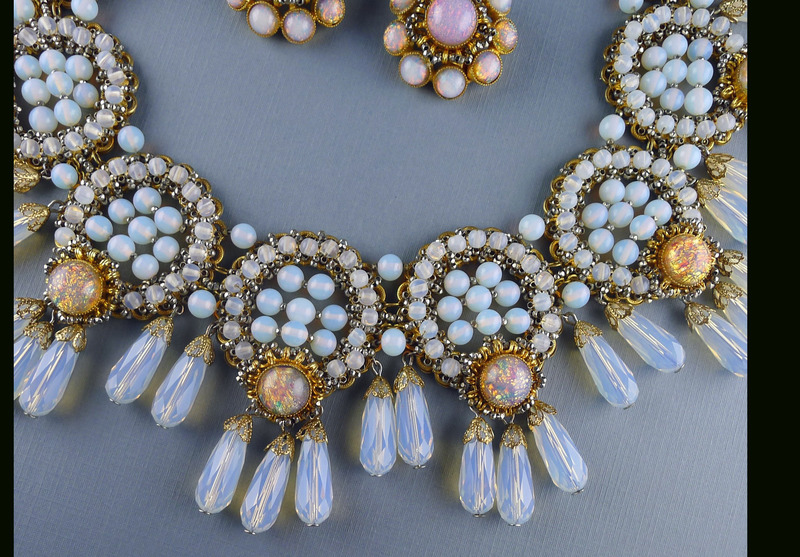 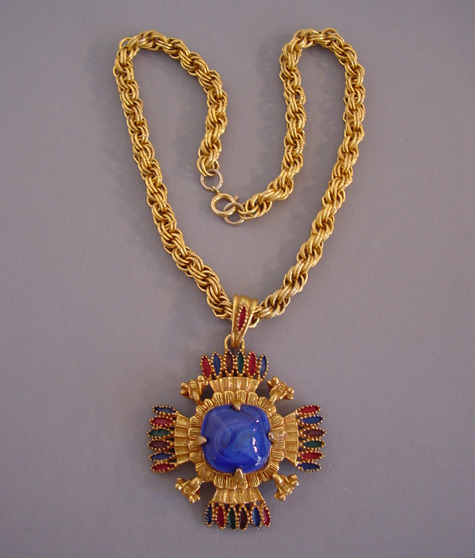 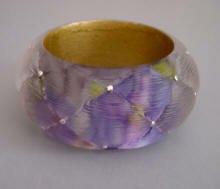 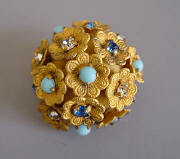 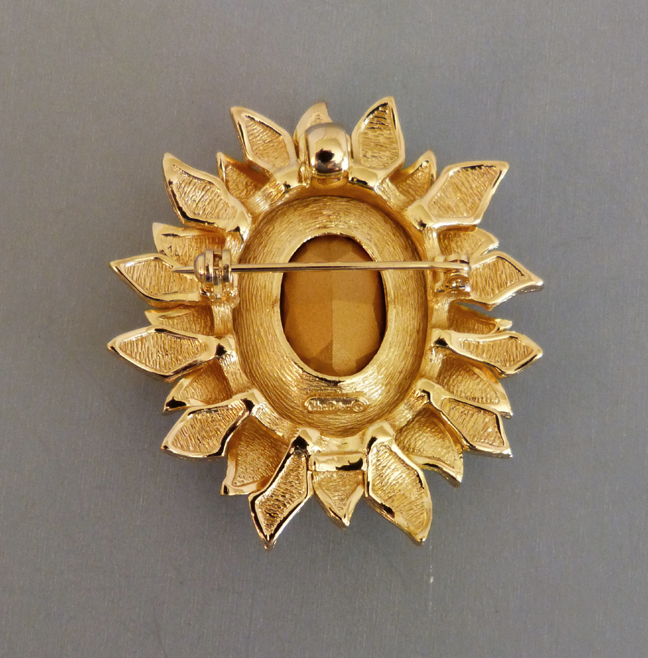 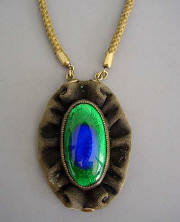 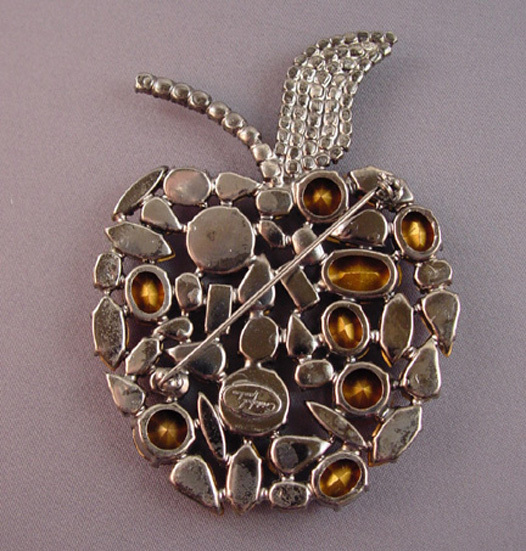 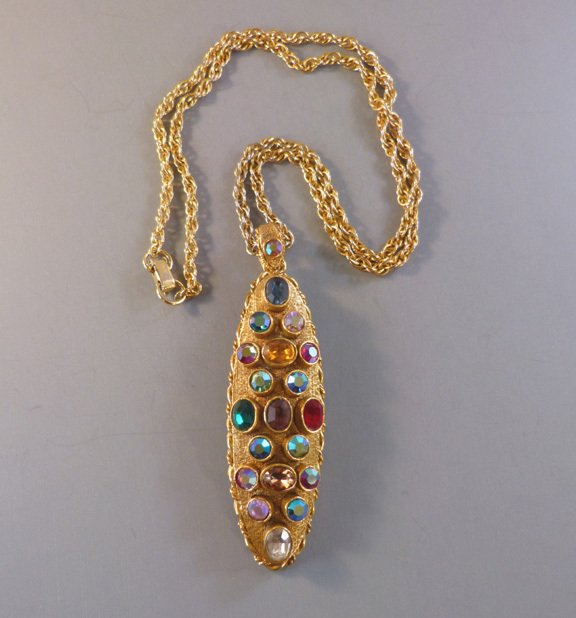 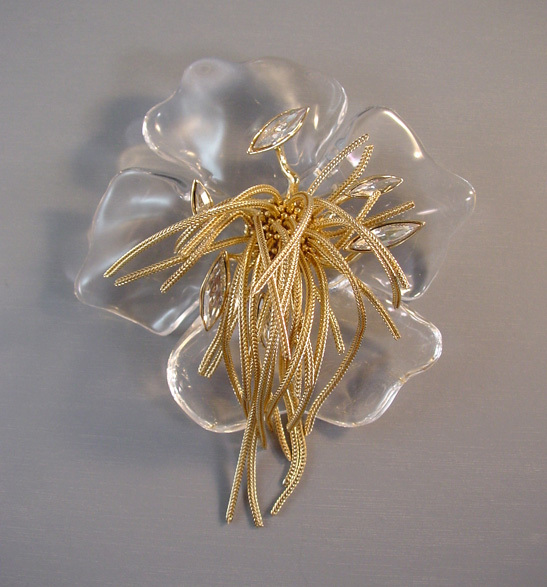 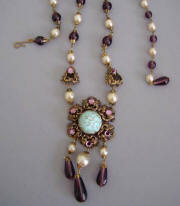 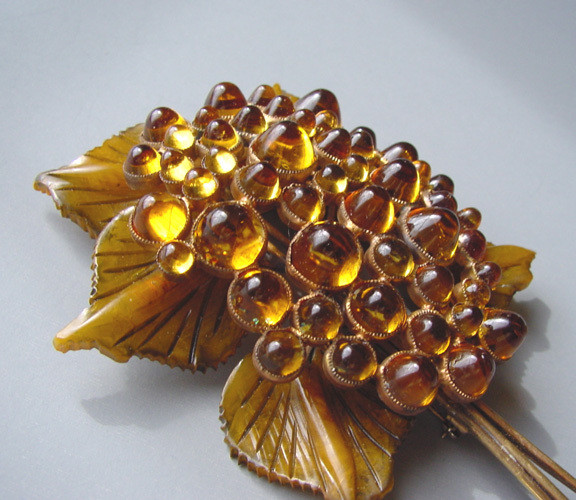 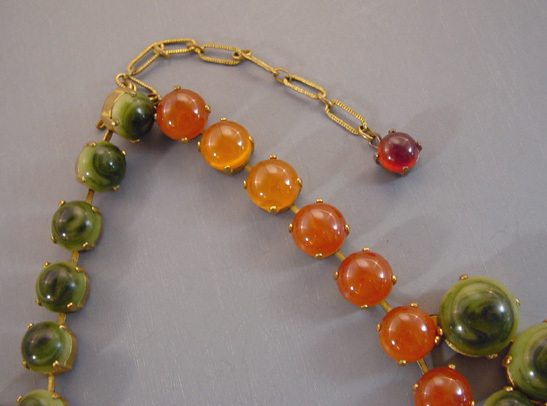 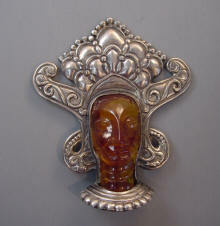 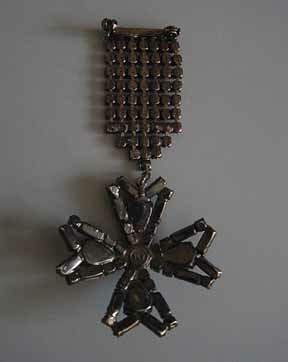 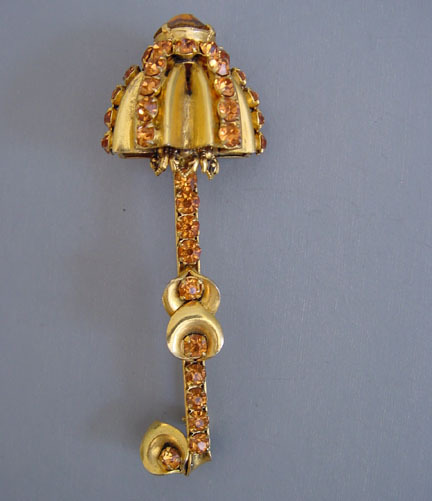 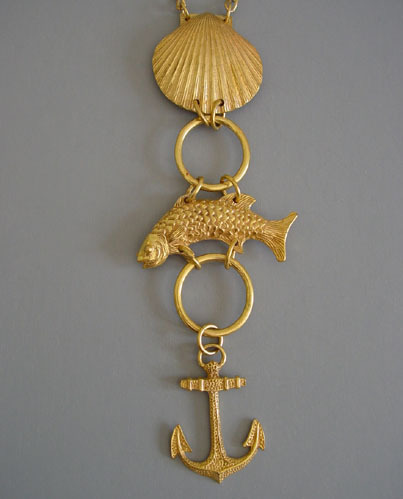 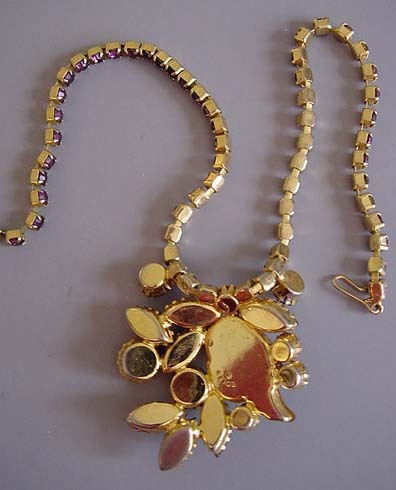 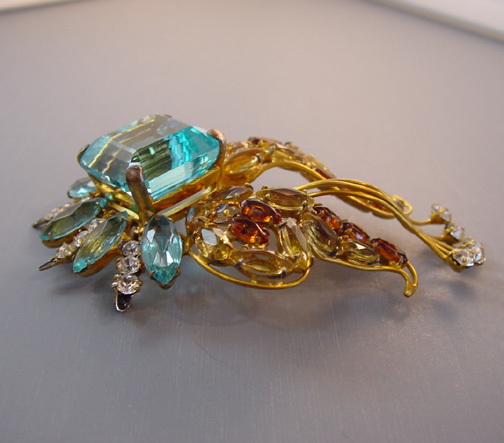 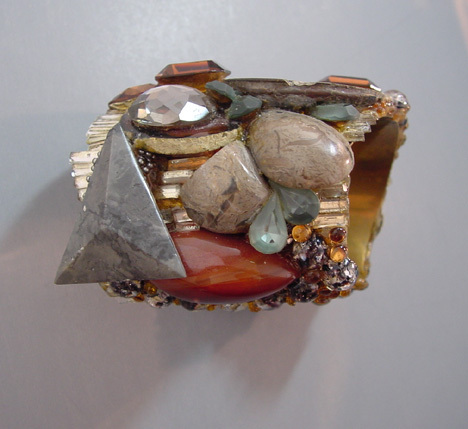 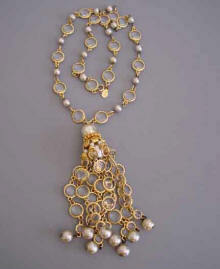 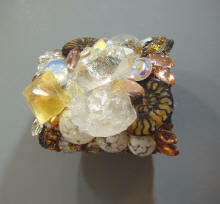 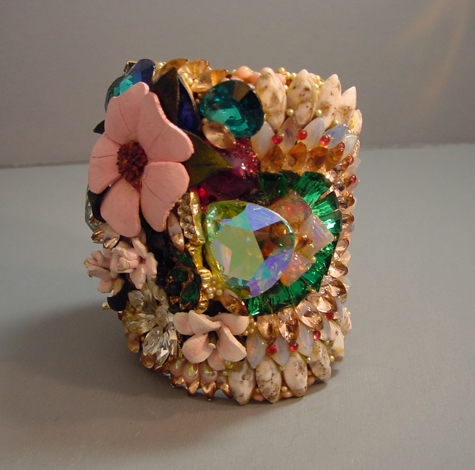 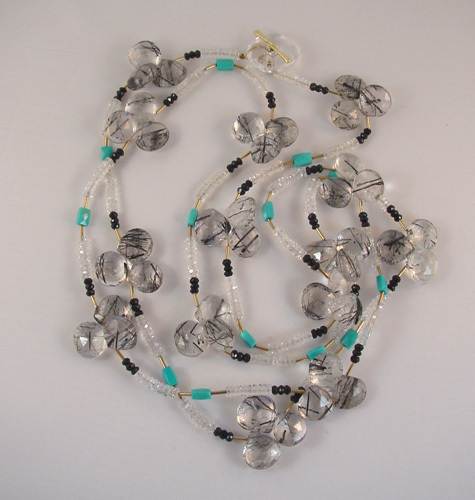 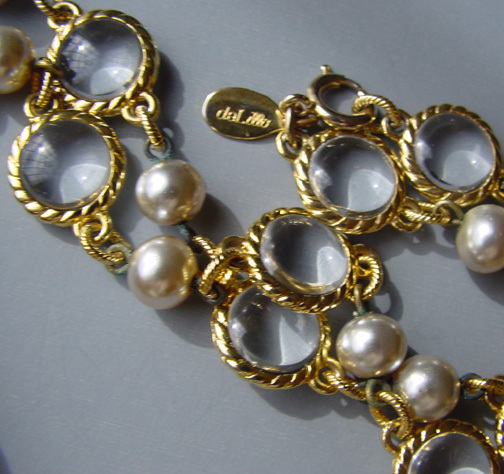 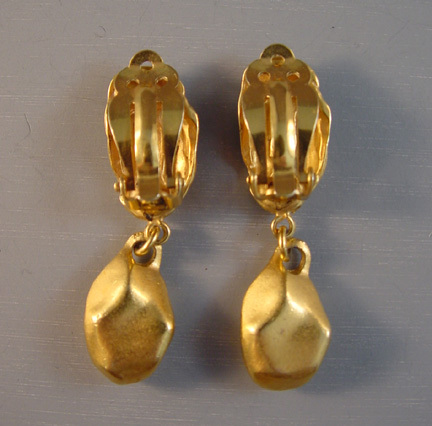 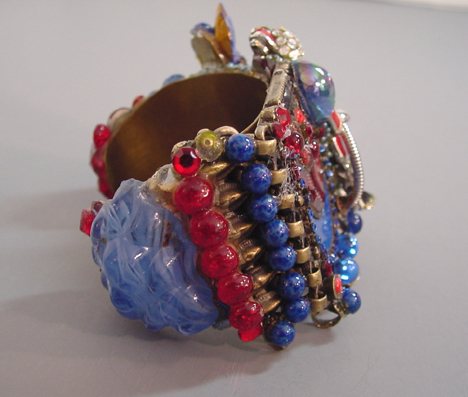 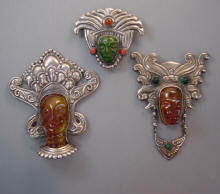 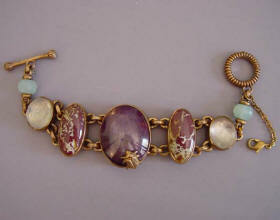 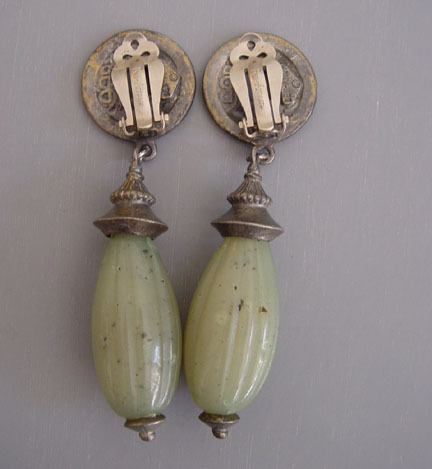 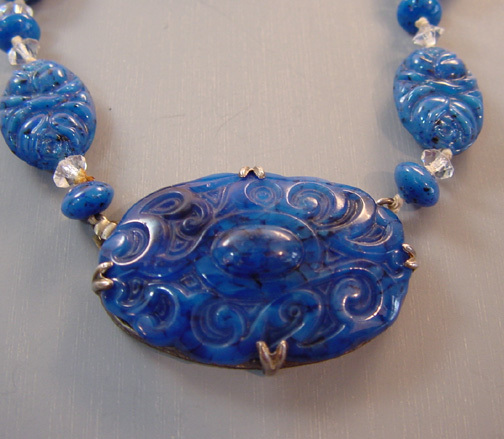 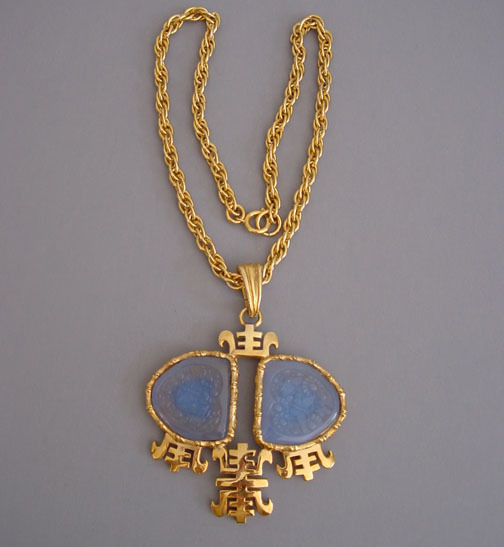 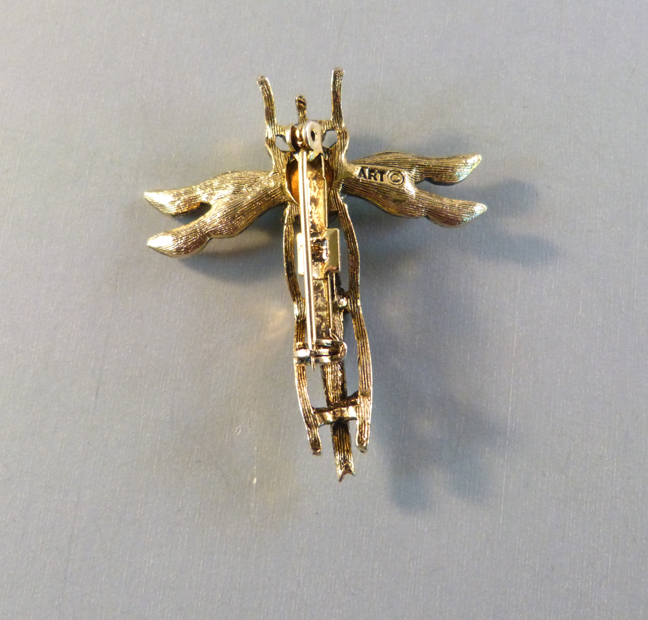 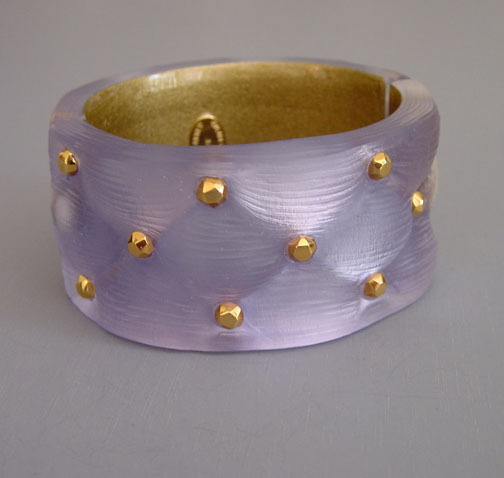 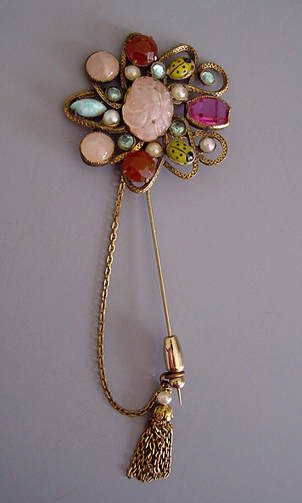 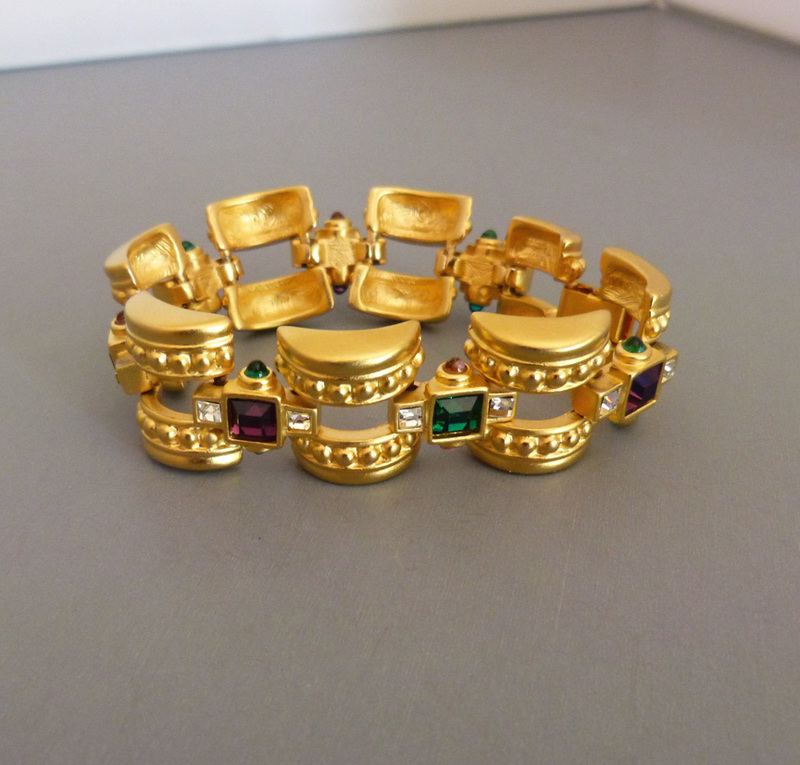 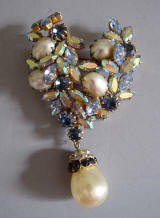 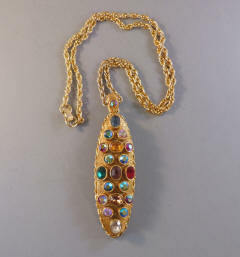 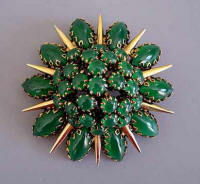 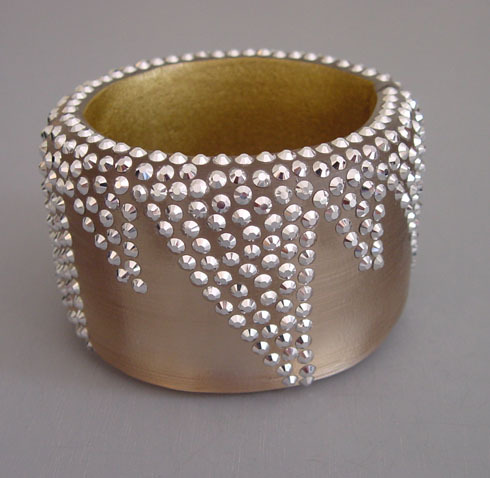 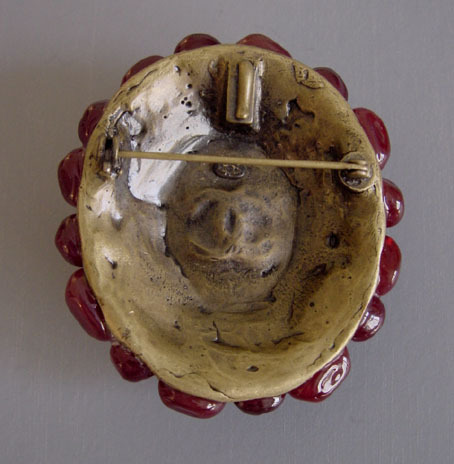 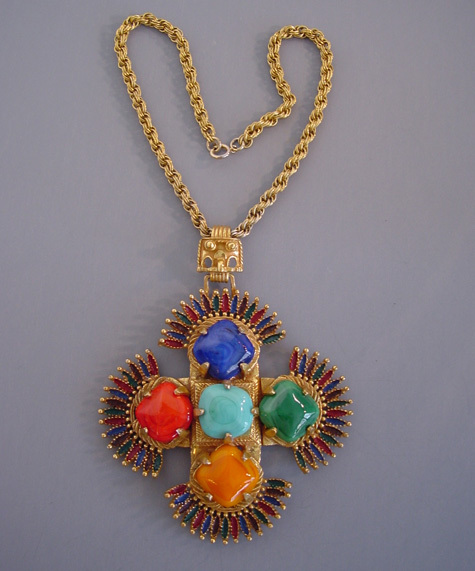 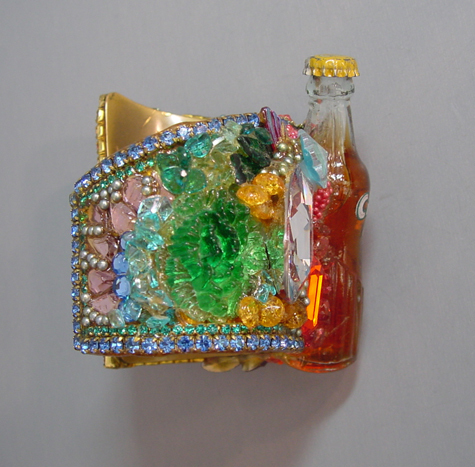 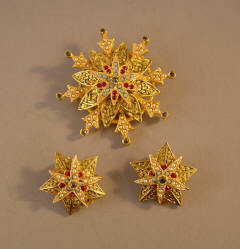 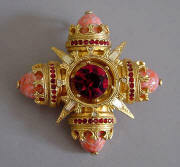 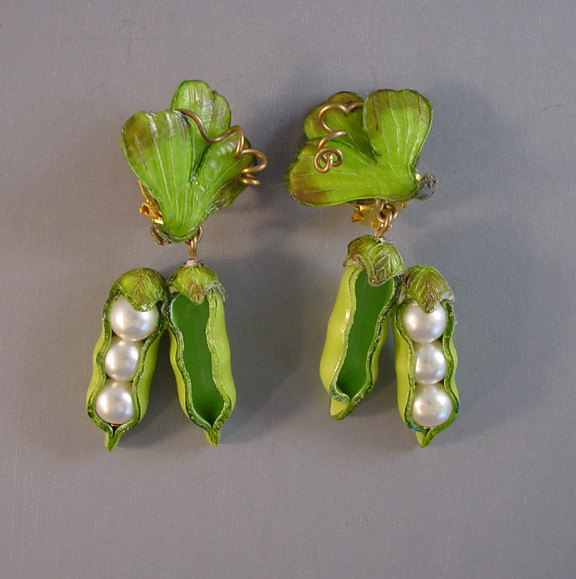 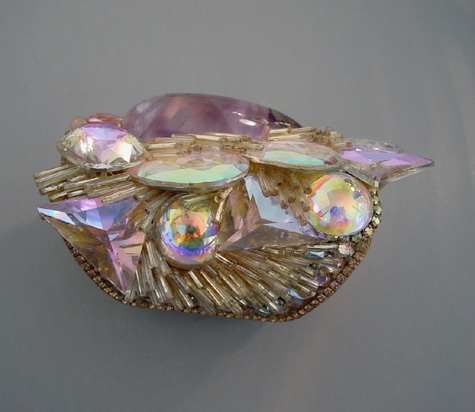 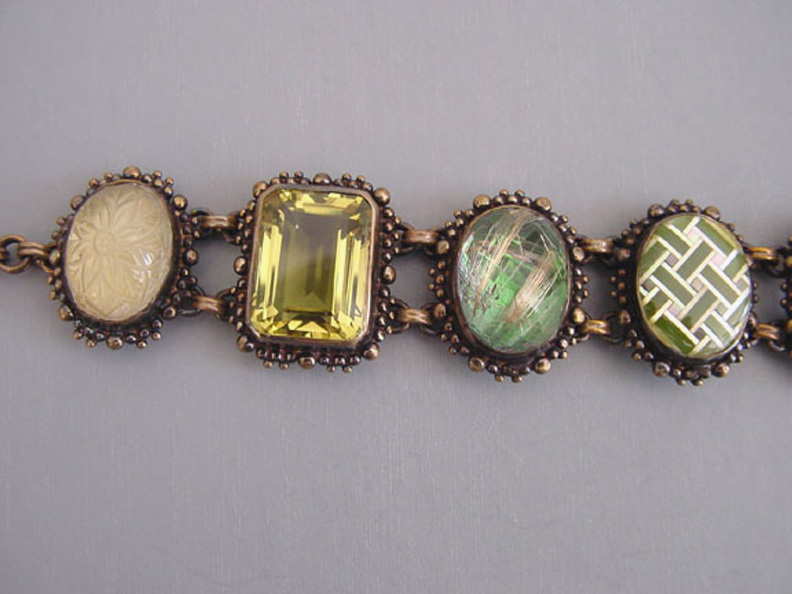 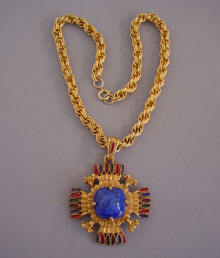 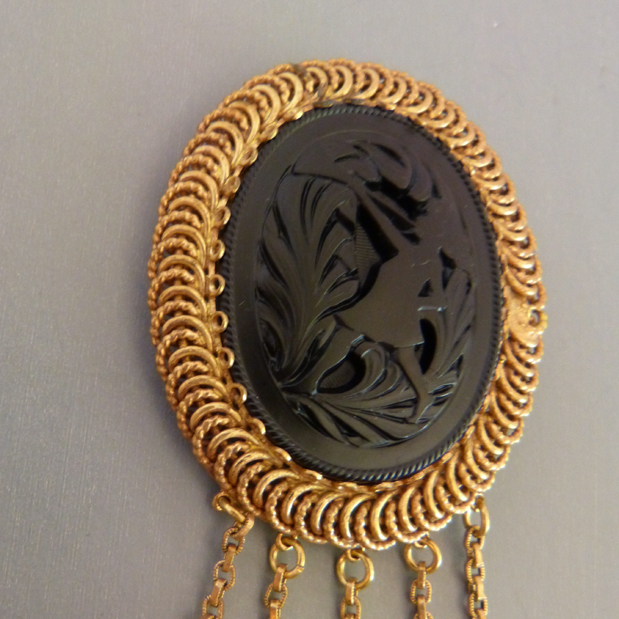 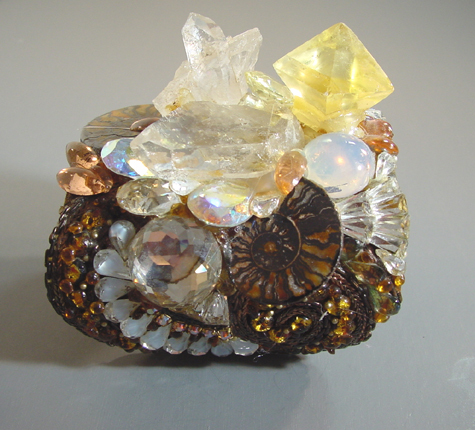 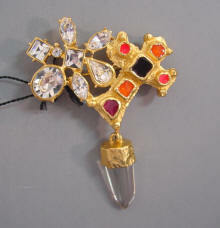 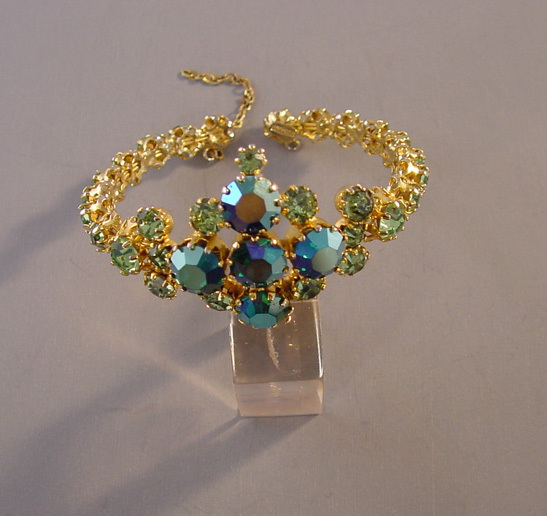 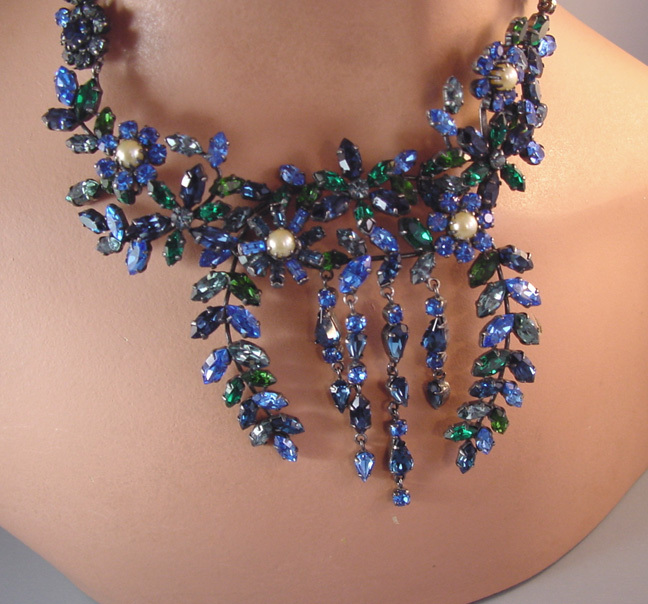 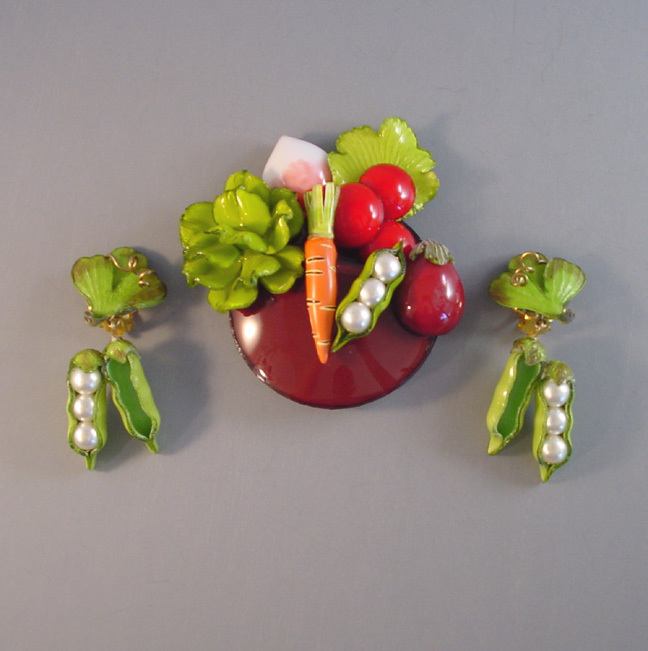 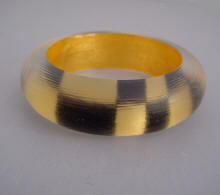 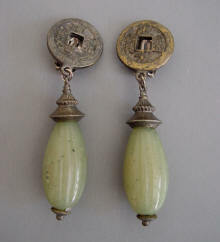 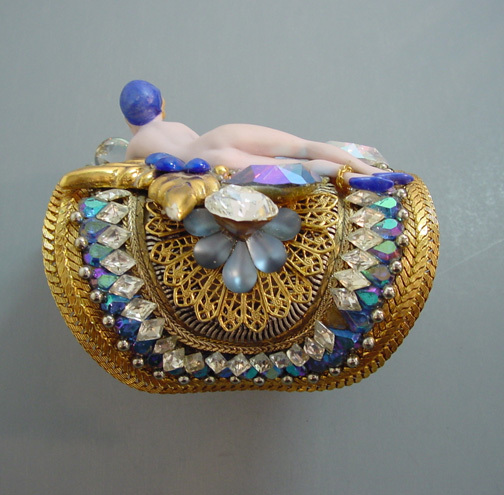 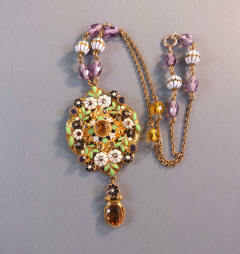 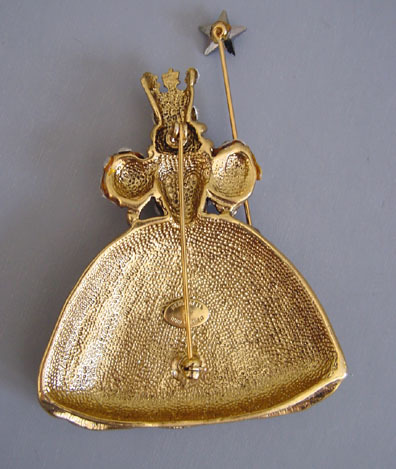 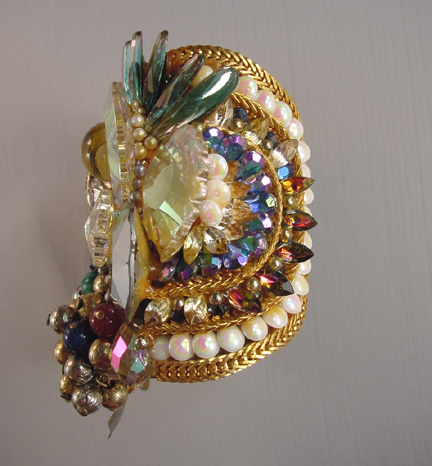 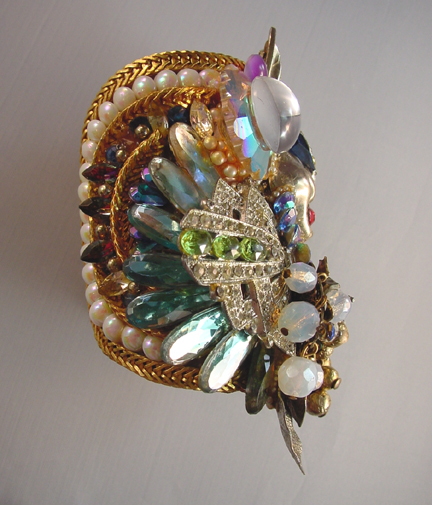 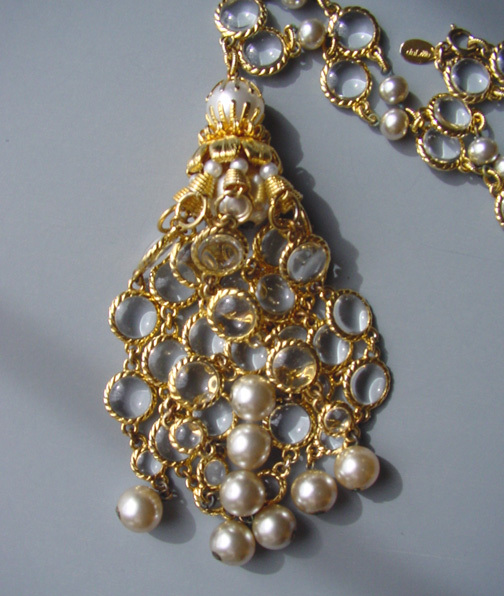 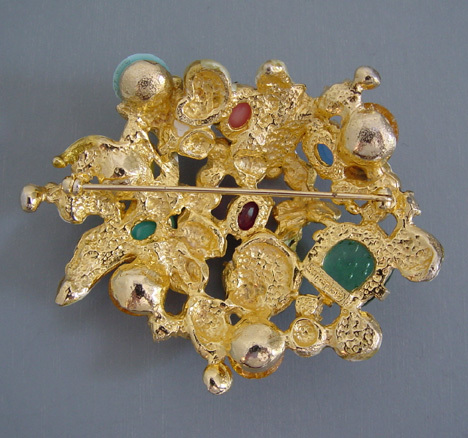 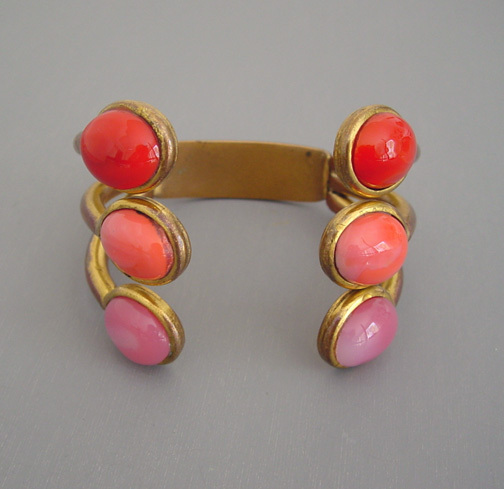 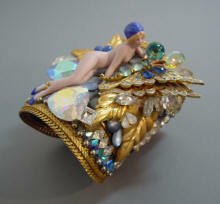 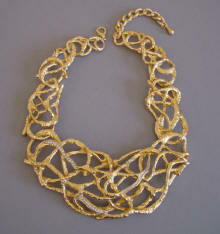 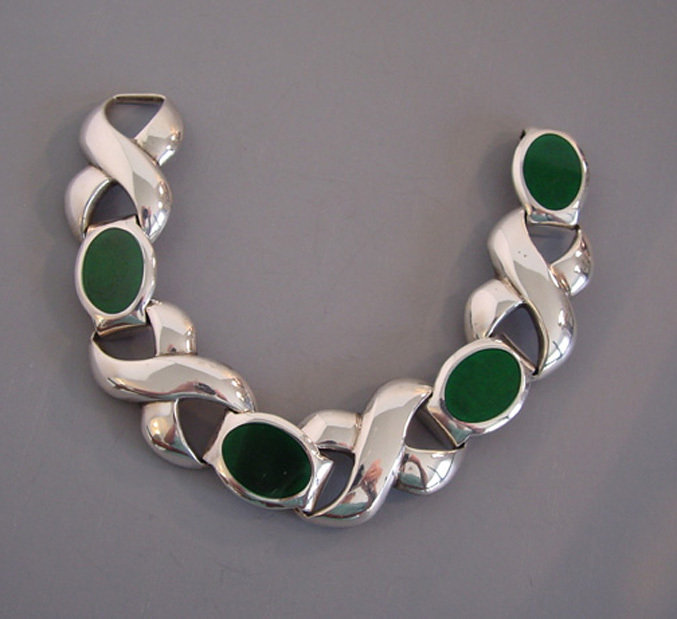 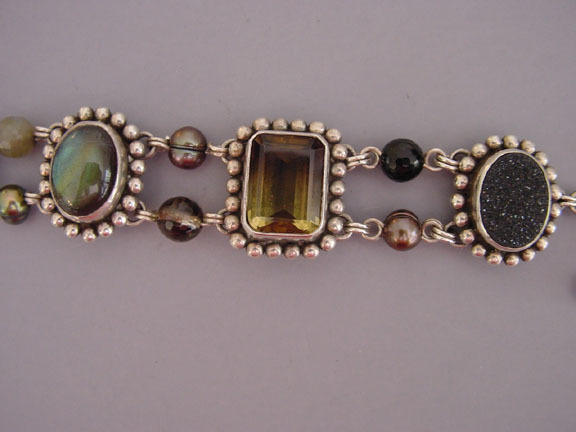 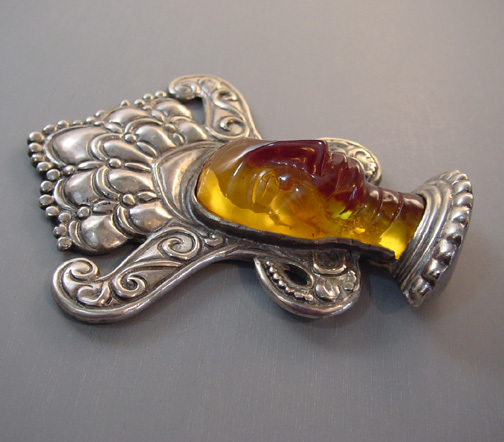 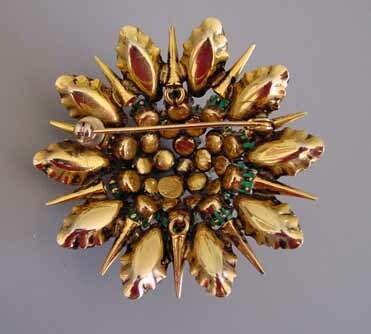 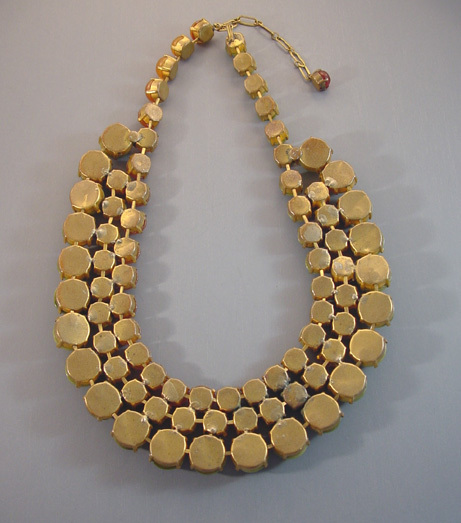 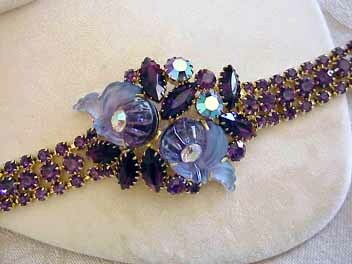 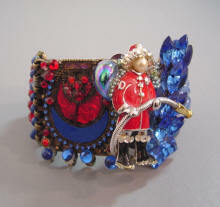 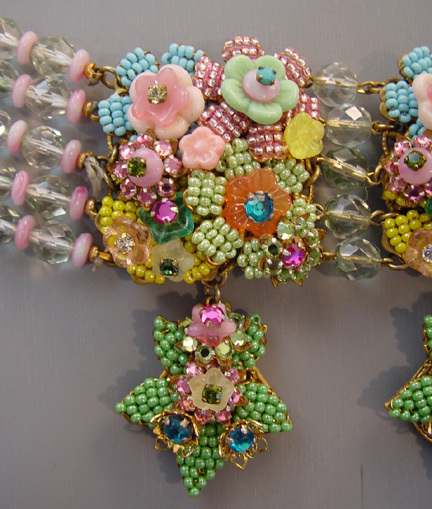 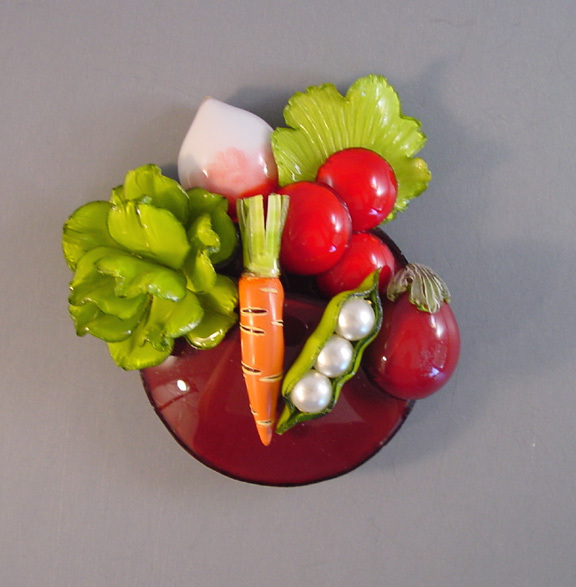 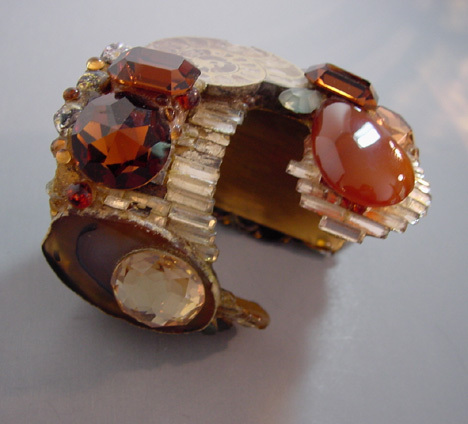 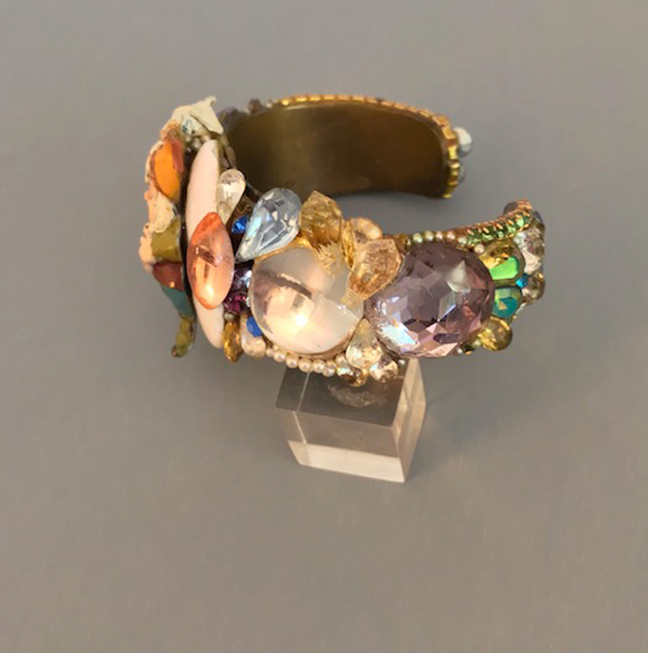 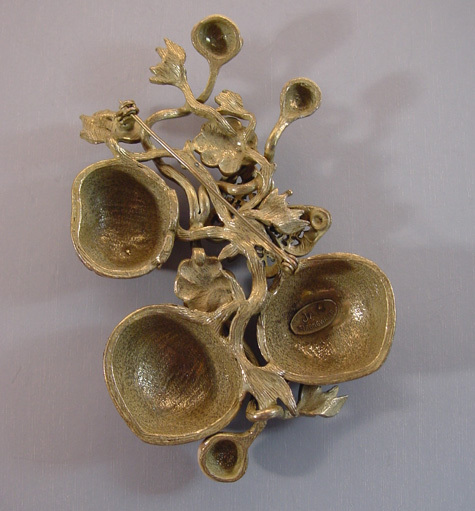 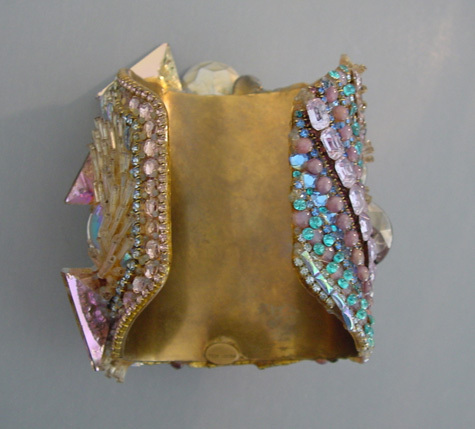 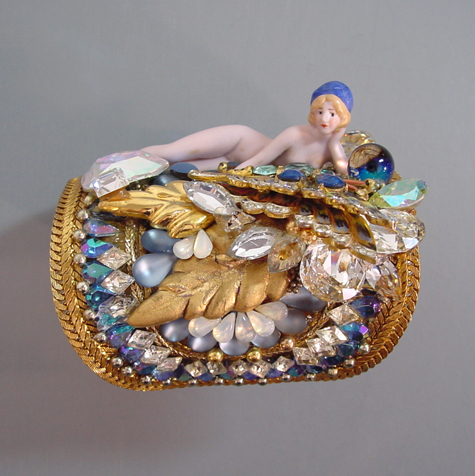 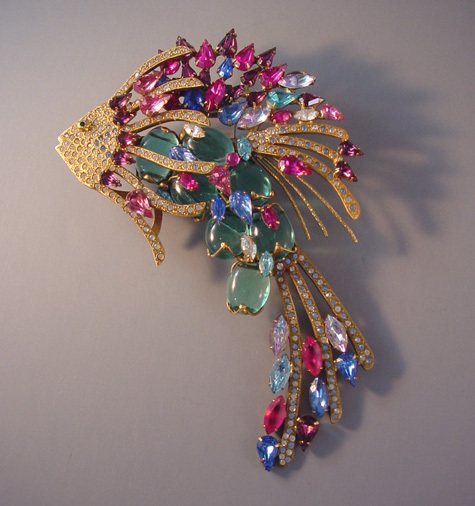 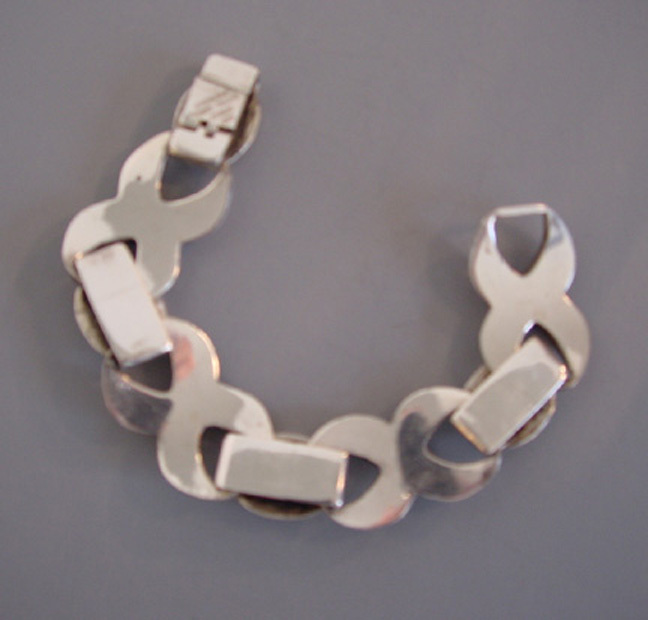 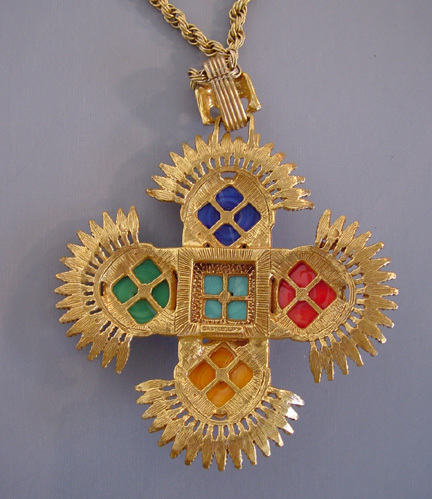 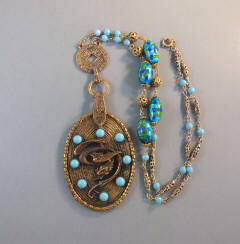 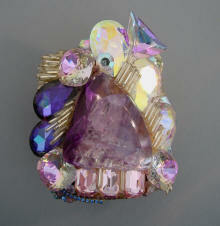 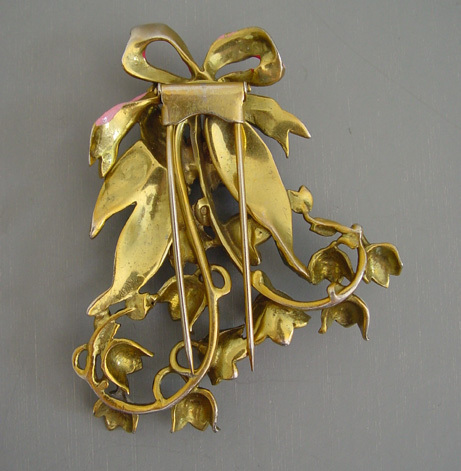 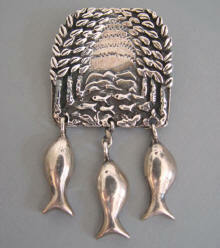 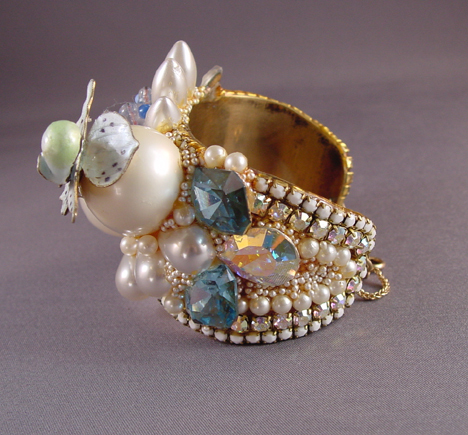 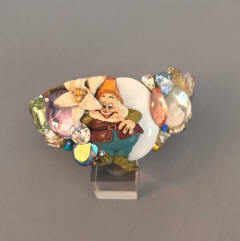 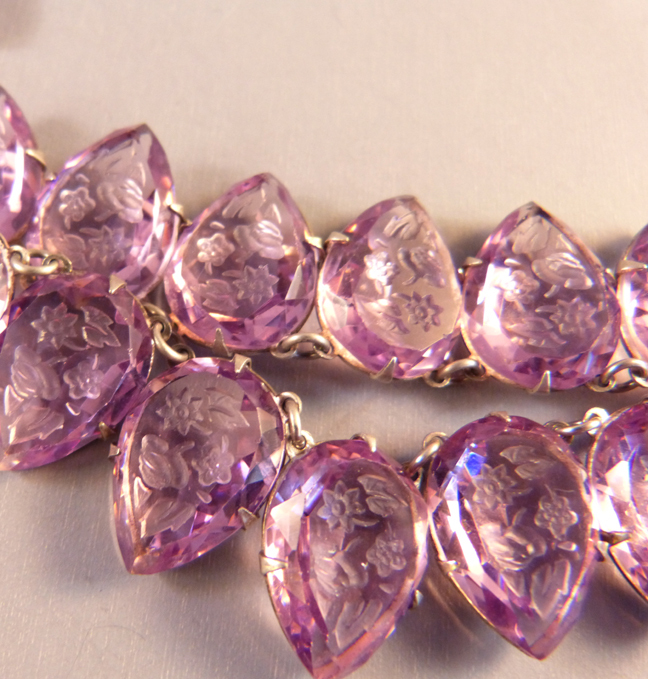 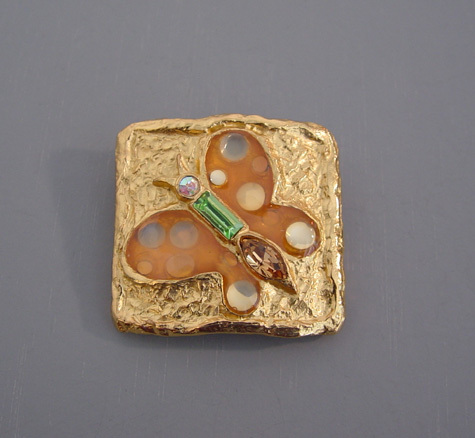 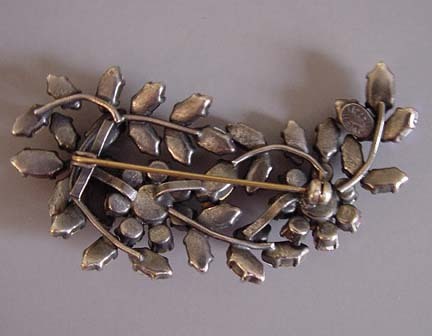 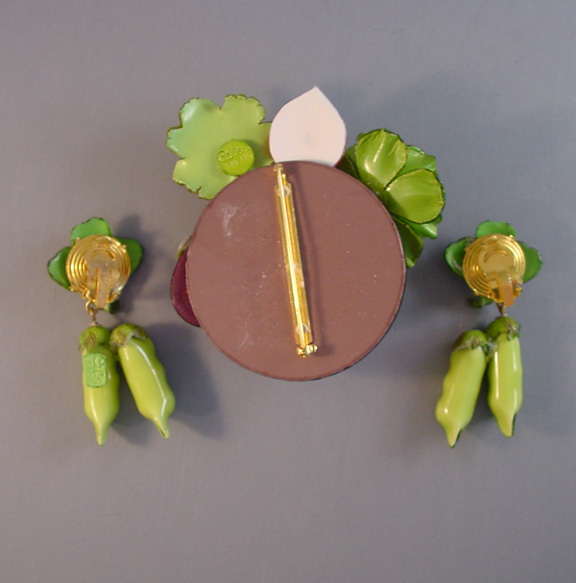 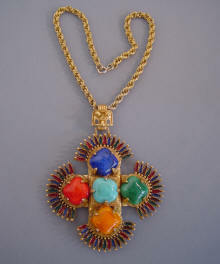 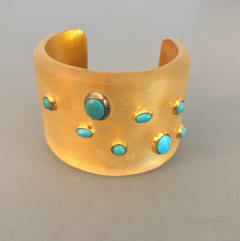 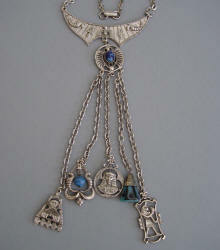 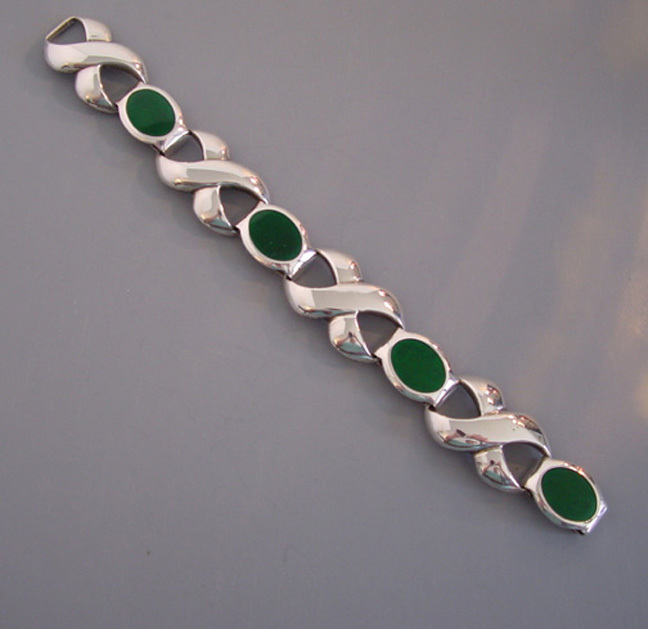 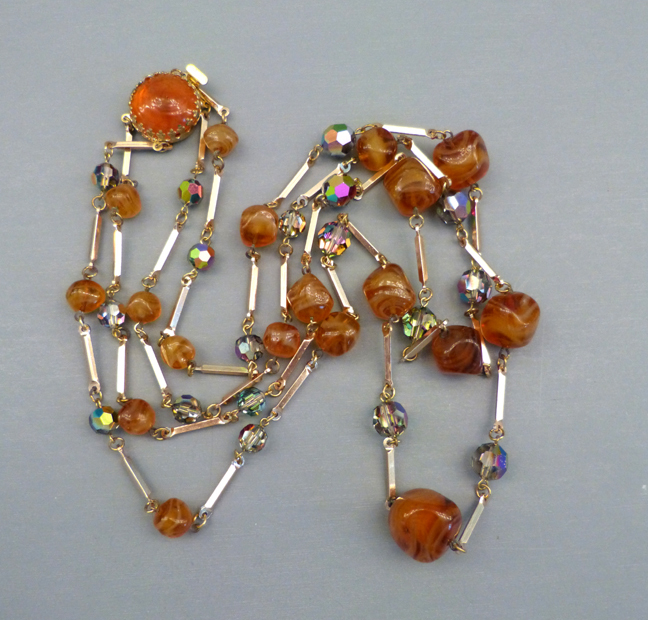 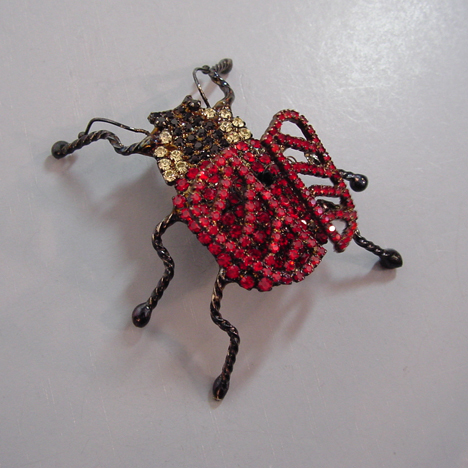 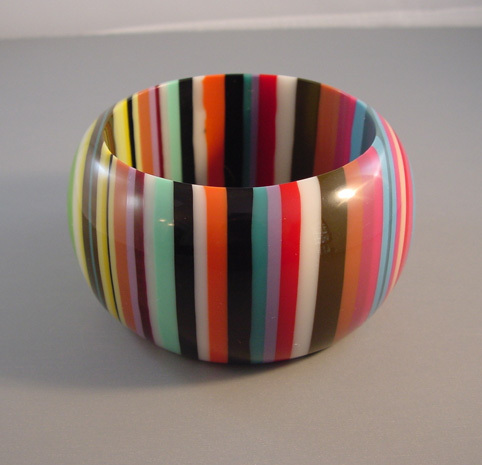 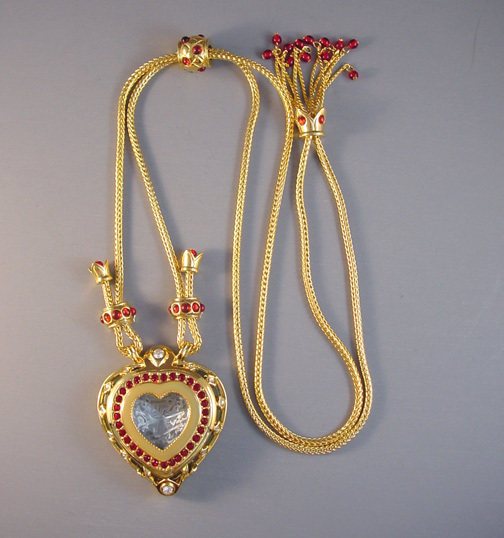 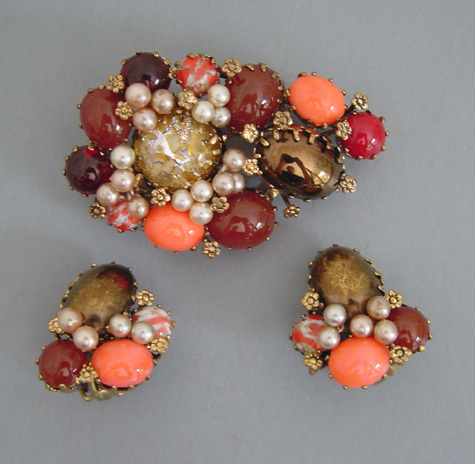 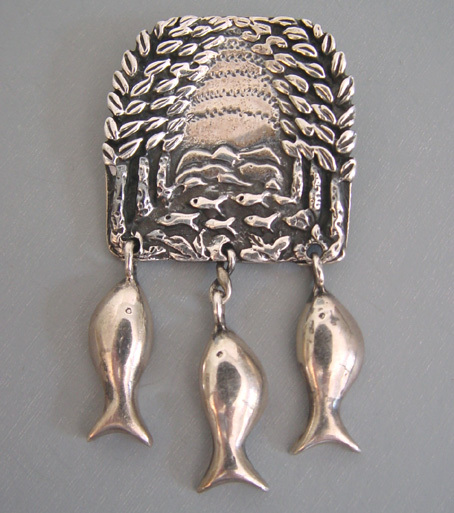 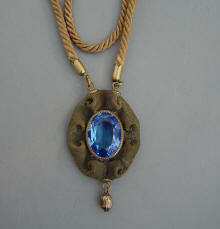 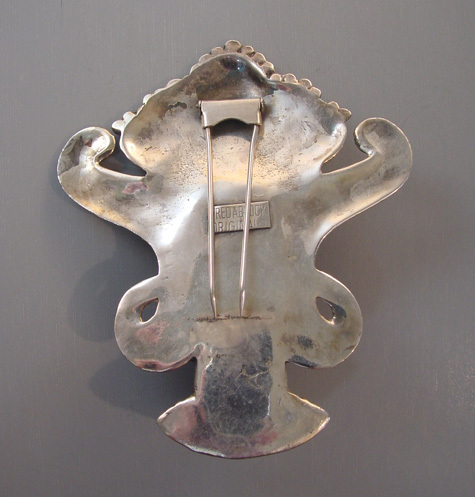 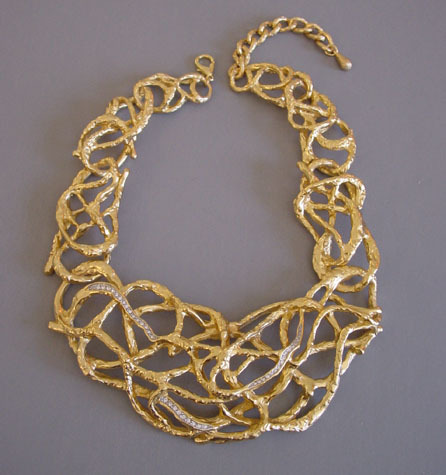 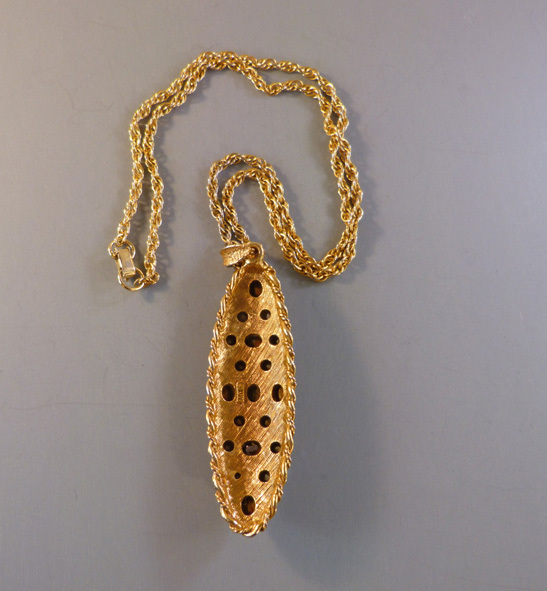 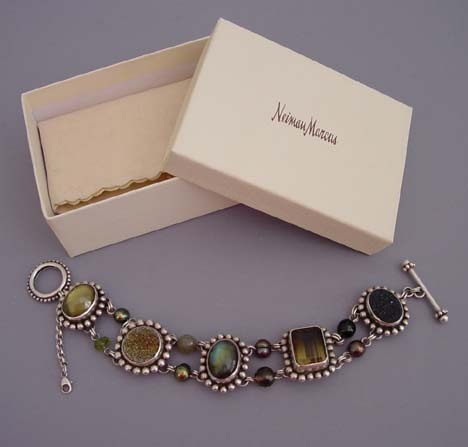 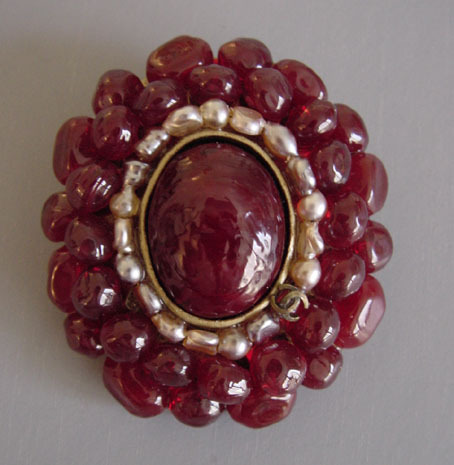 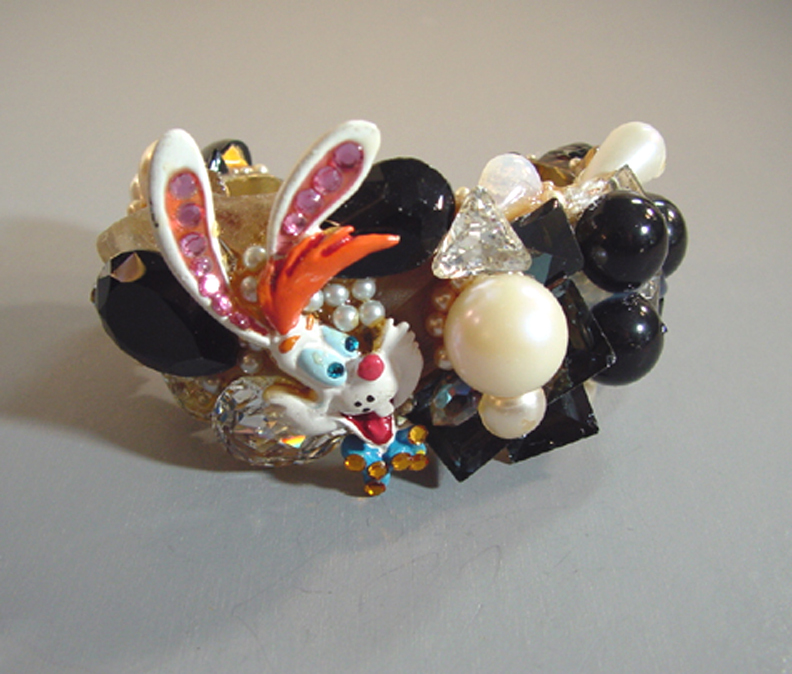 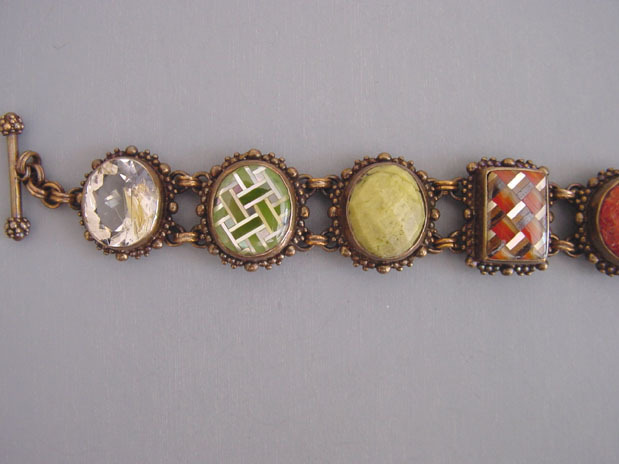 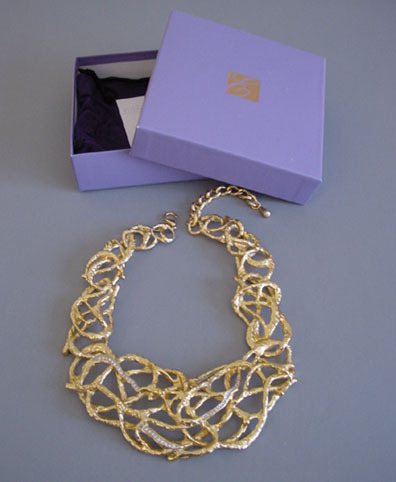 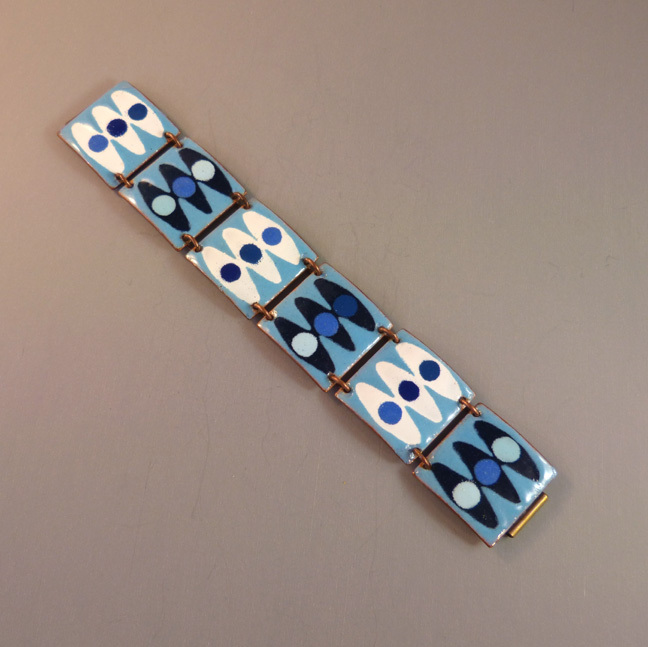 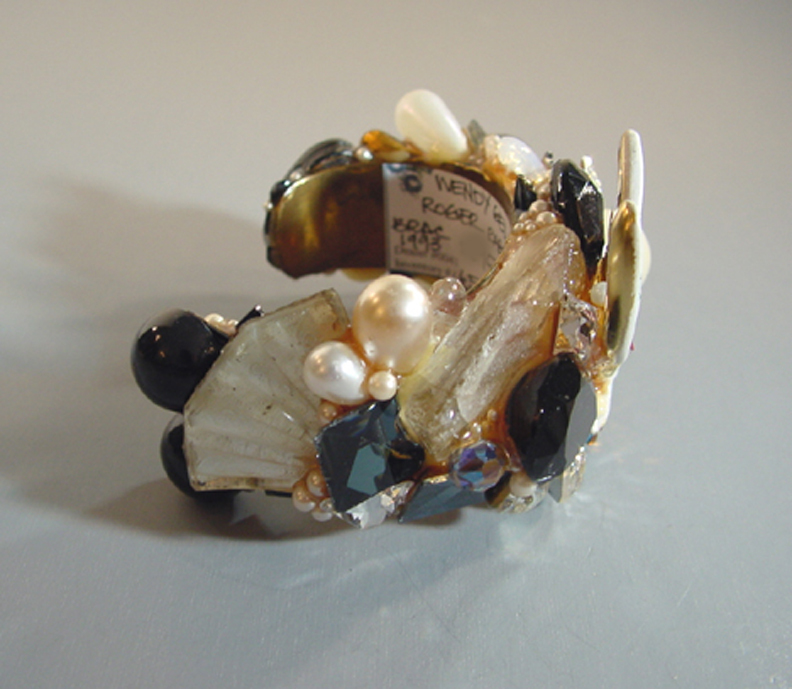 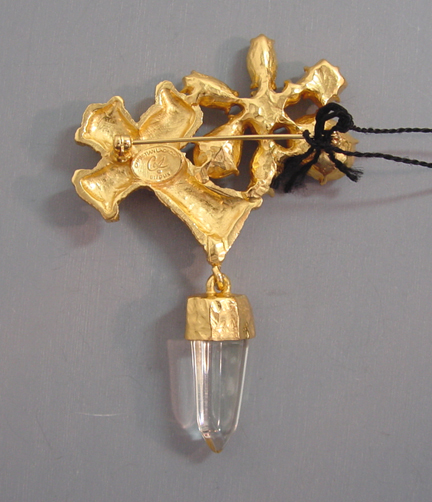 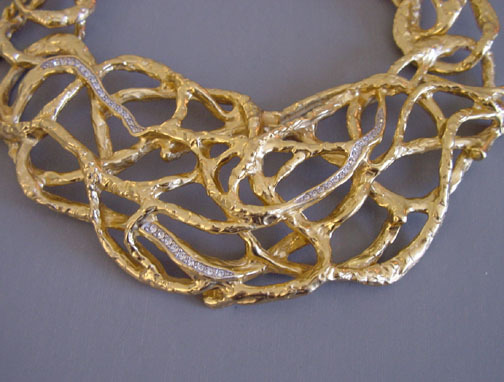 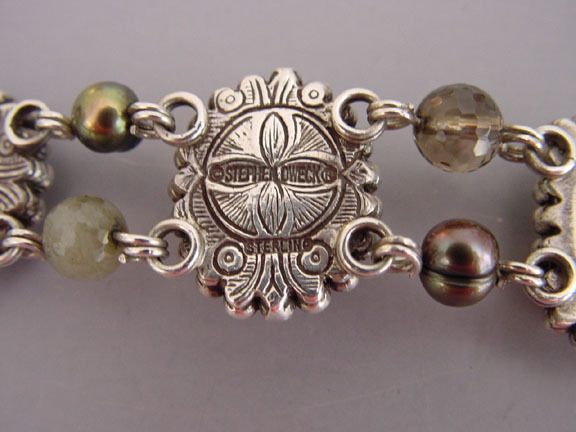 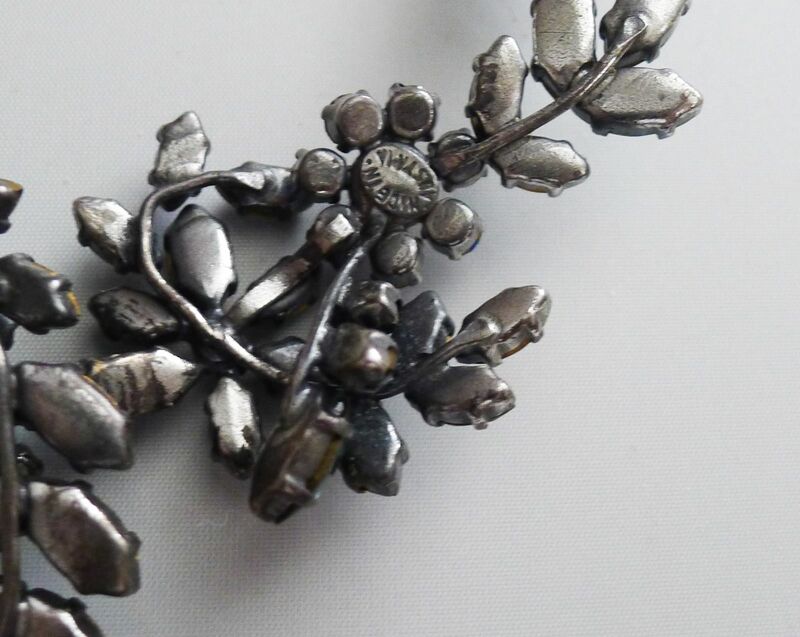 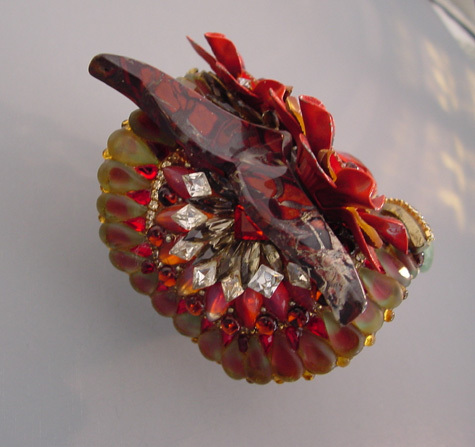 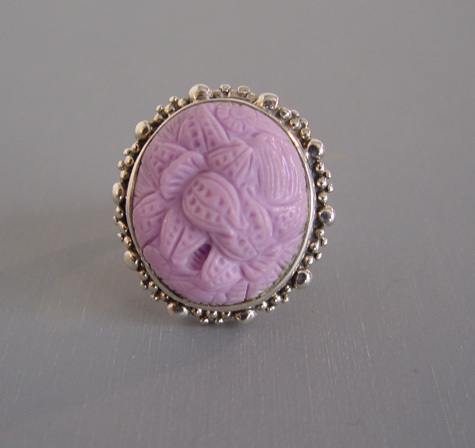 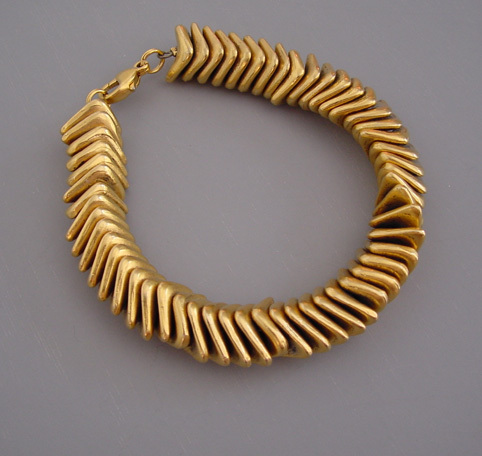 BETTINA von WALHOF began making her jewelry in about 1998. 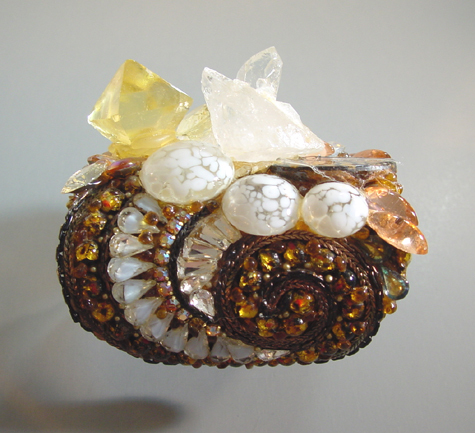 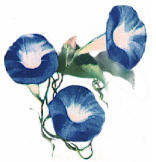 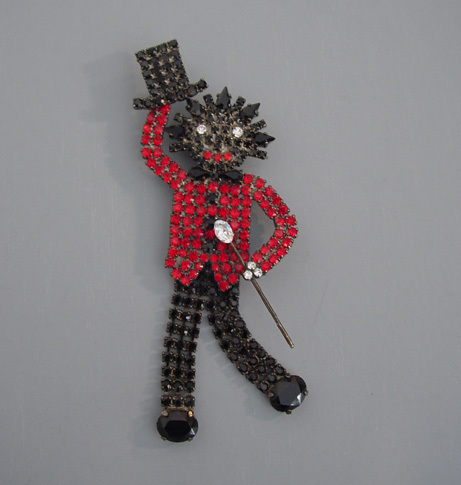 Her creations are whimsical, original and creative. 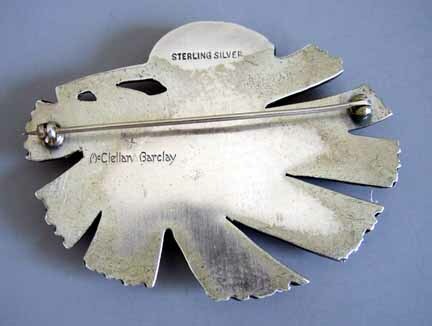 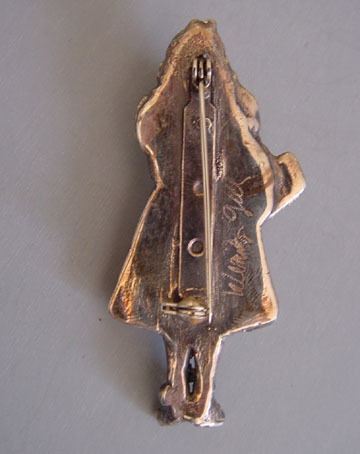 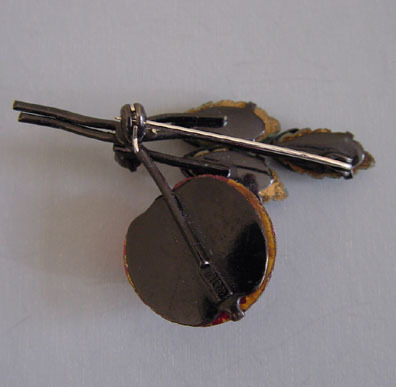 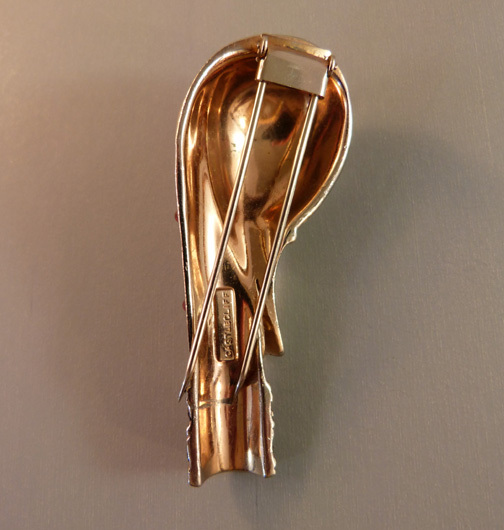 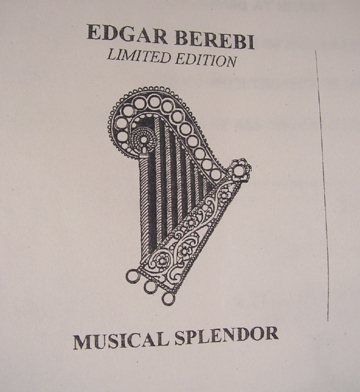 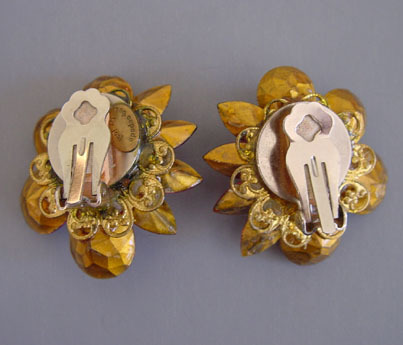 Many of her pieces are tremblers with the moving parts on springs. 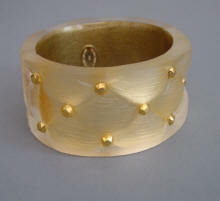 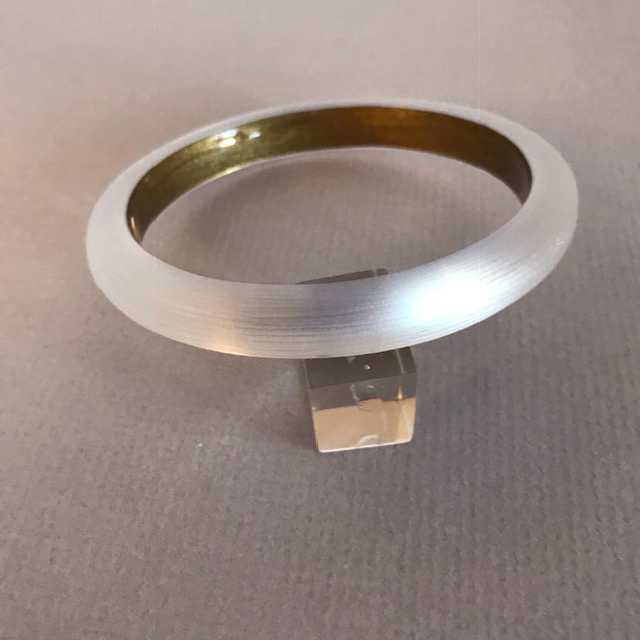 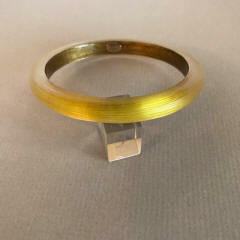 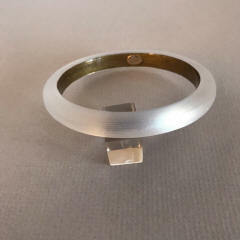 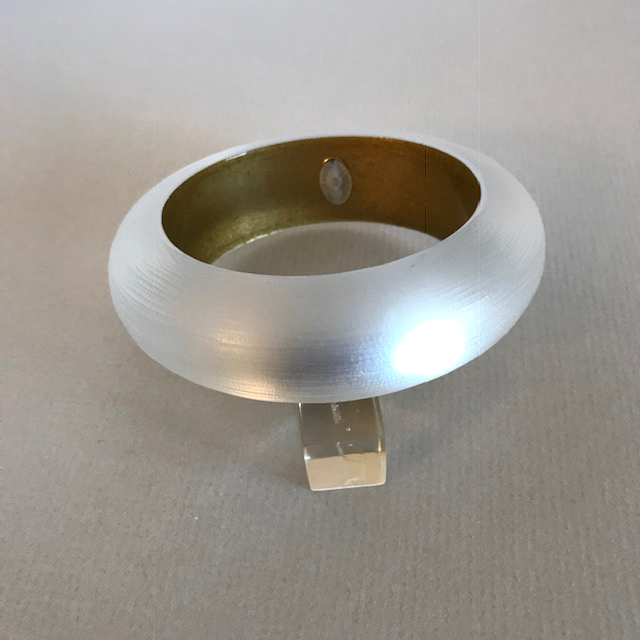 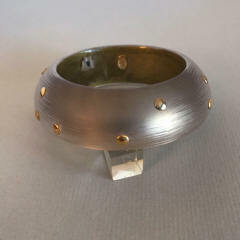 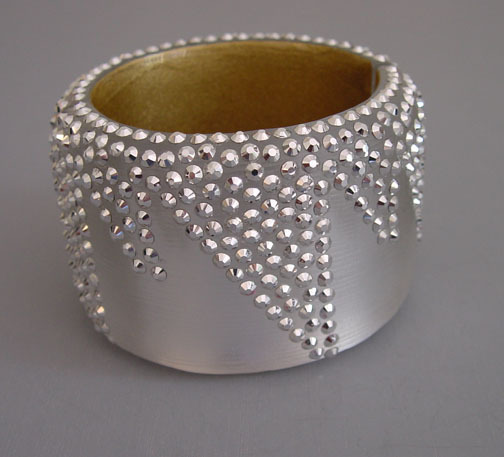 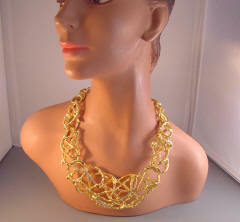 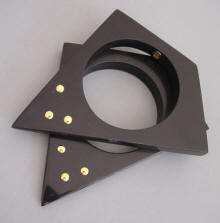 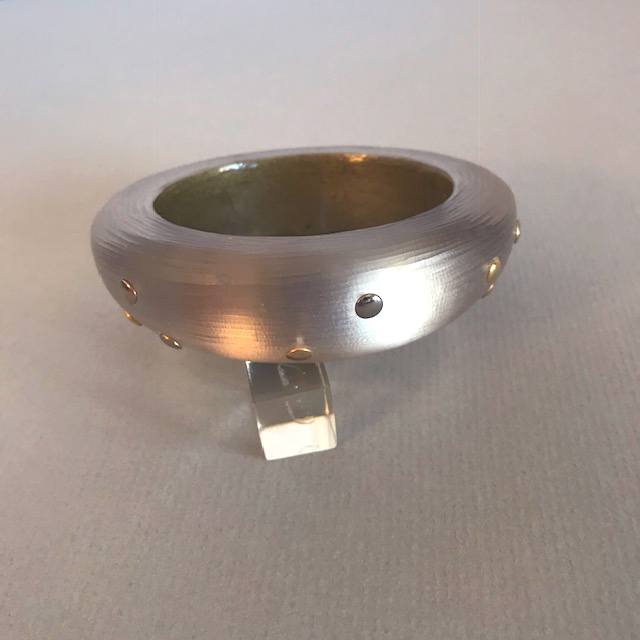 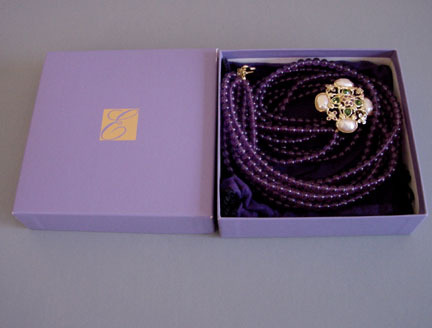 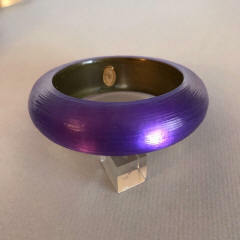 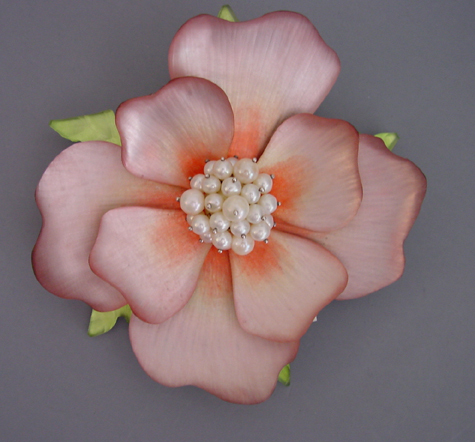 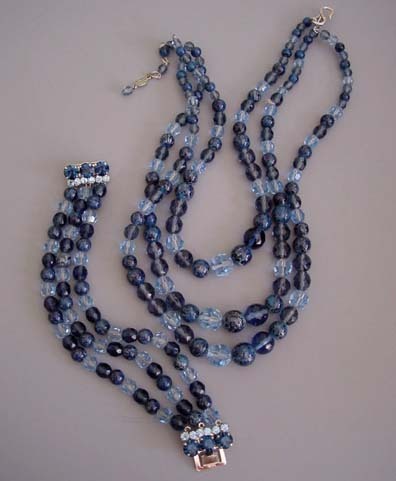 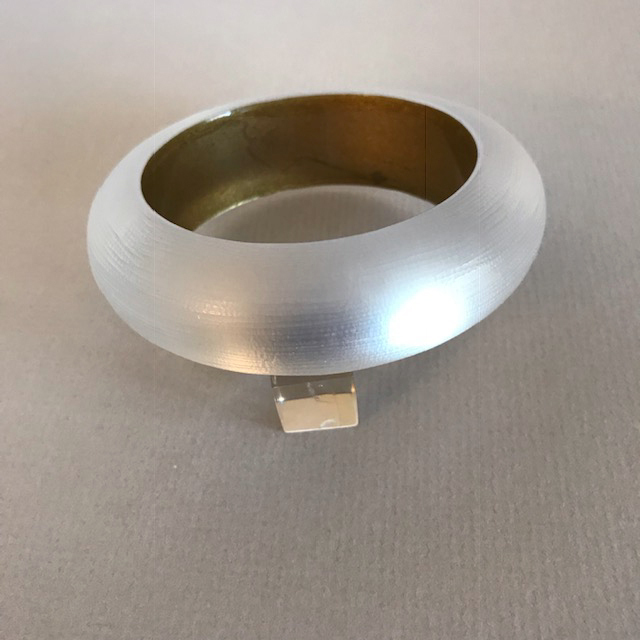 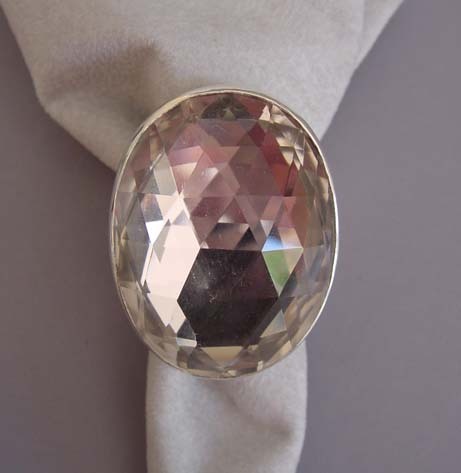 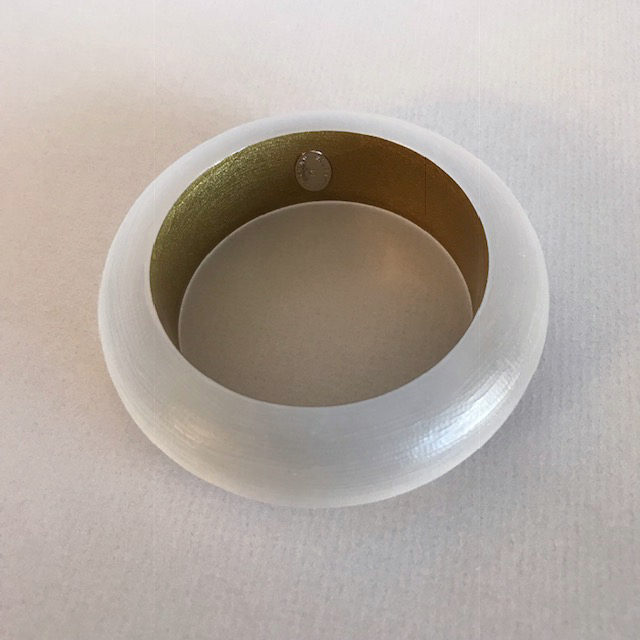 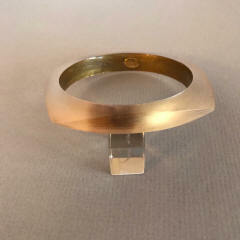 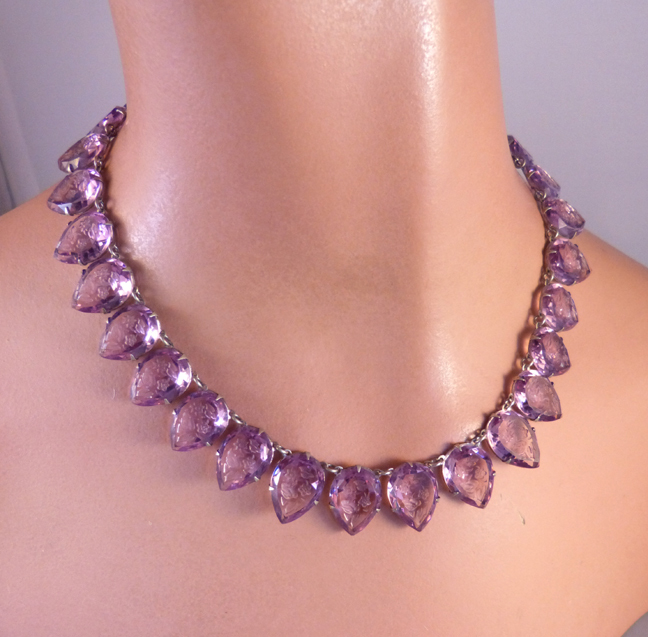 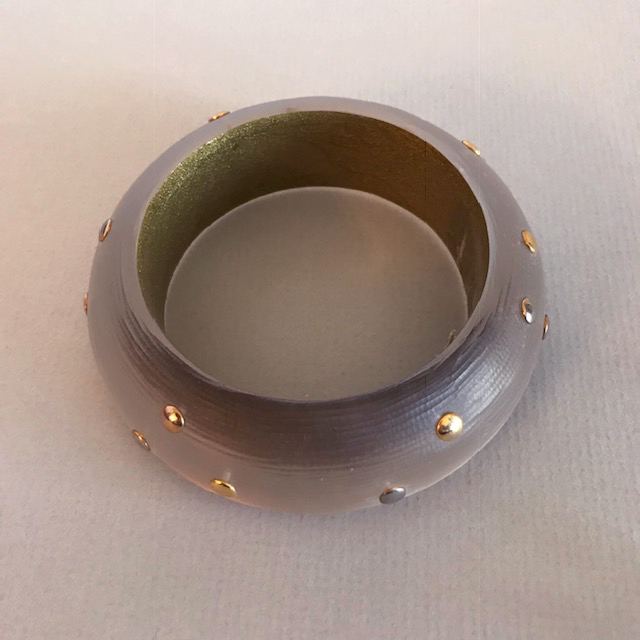 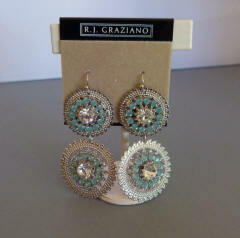 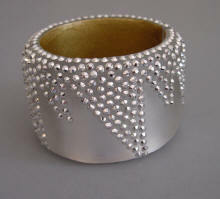 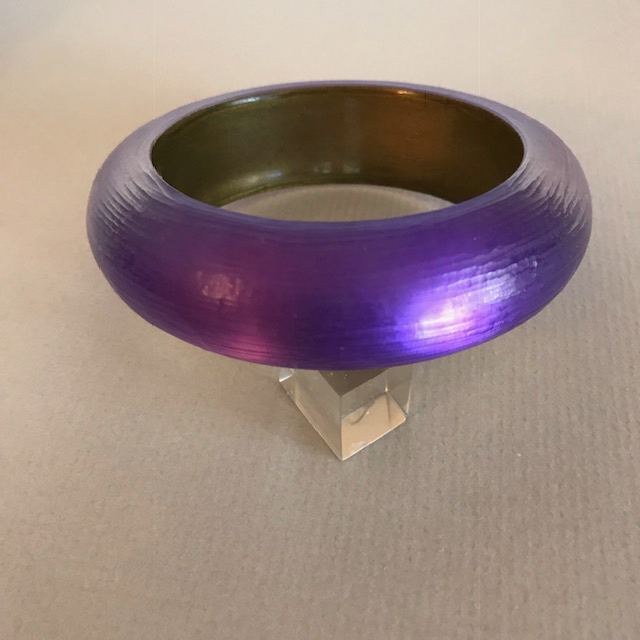 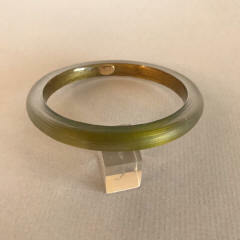 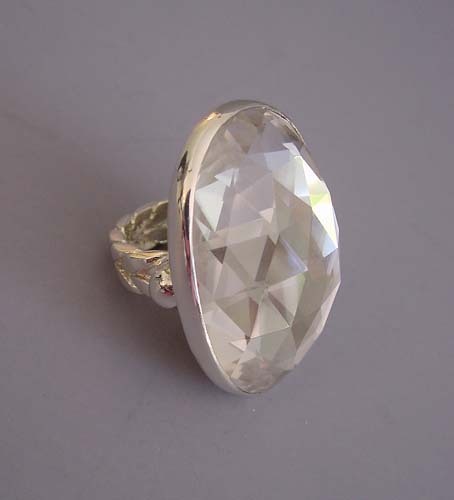 Some are a standard size but some top 8 inches in size, making them "Jewelry for the Confident Woman"! 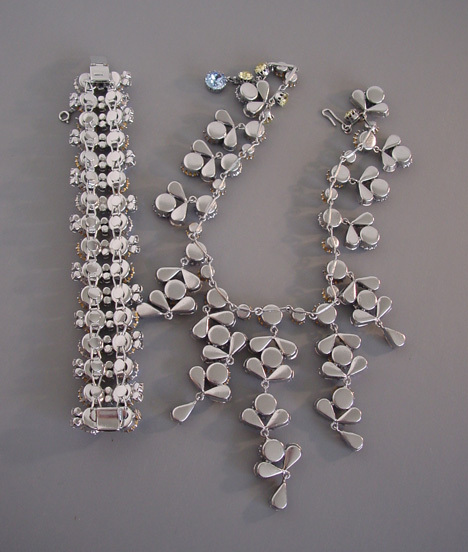 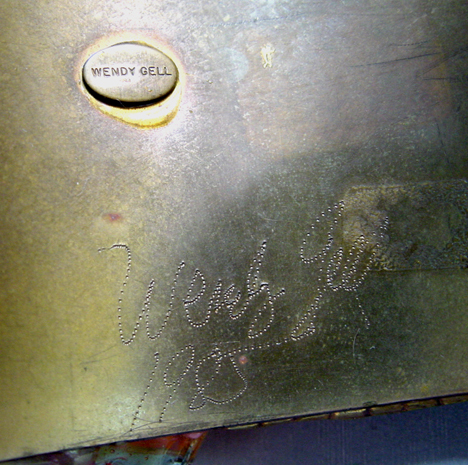 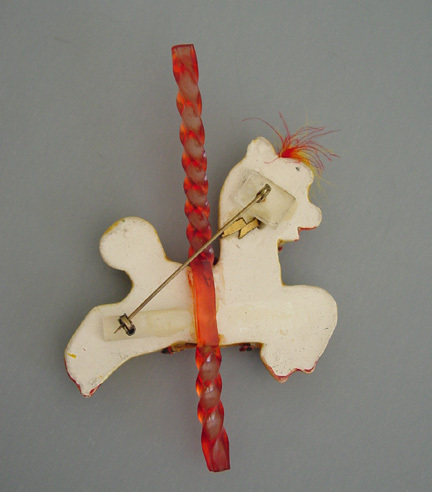 In 2006 she began working with her daughter, and their pieces are marked "B+M von Walhof". 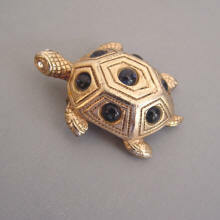 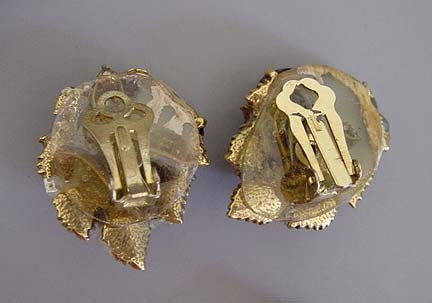 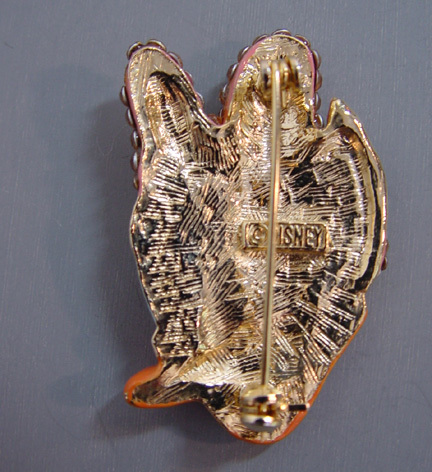 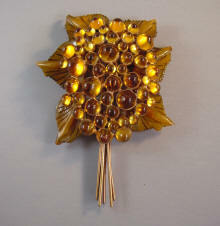 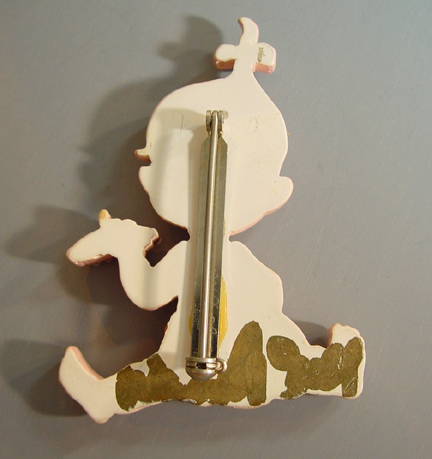 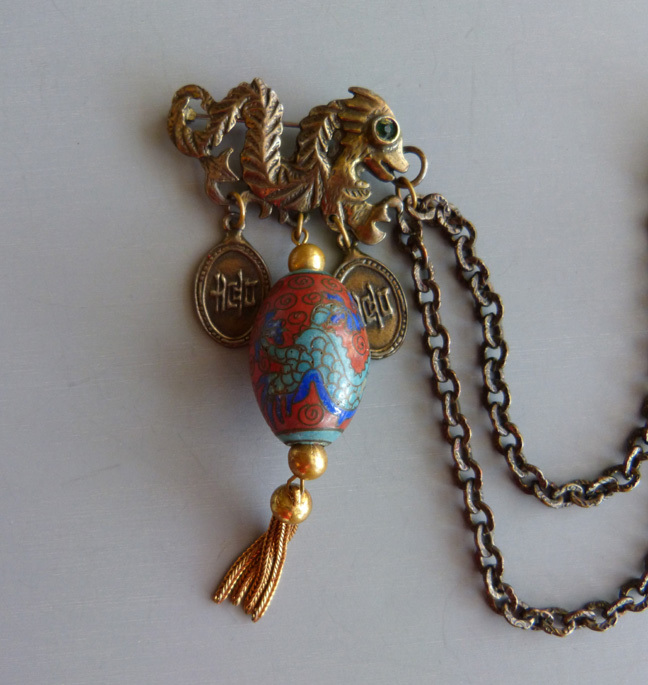 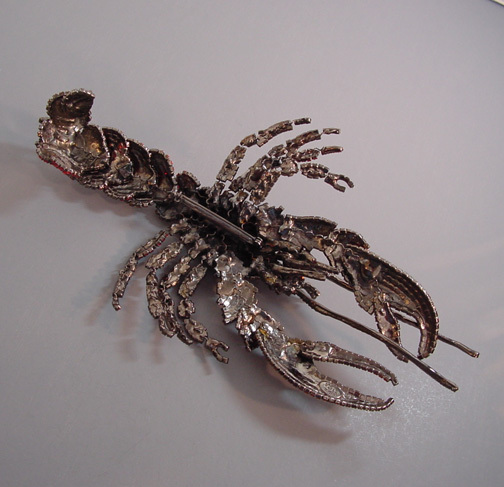 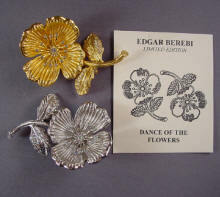 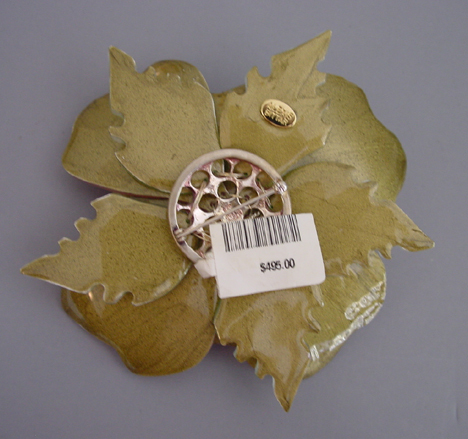 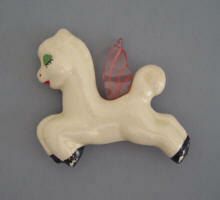 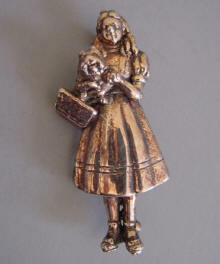 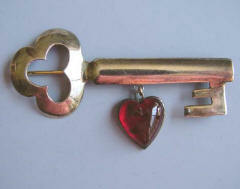 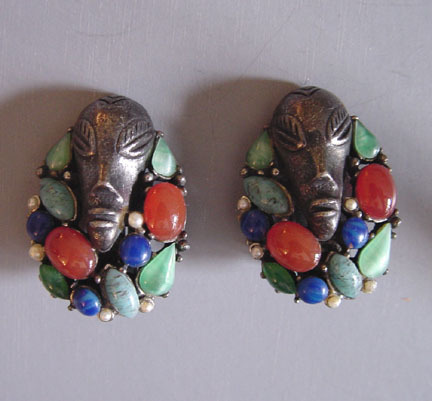 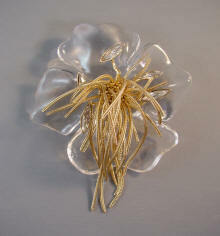 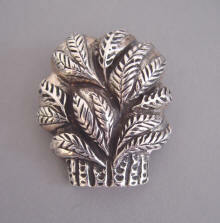 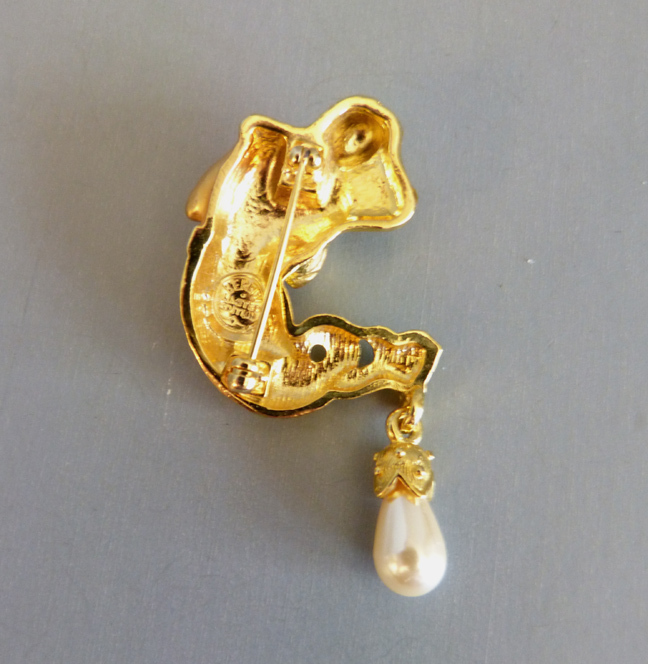 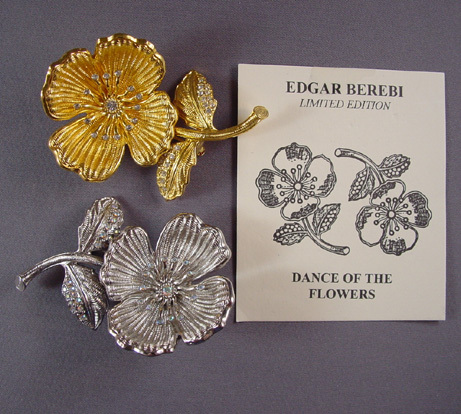 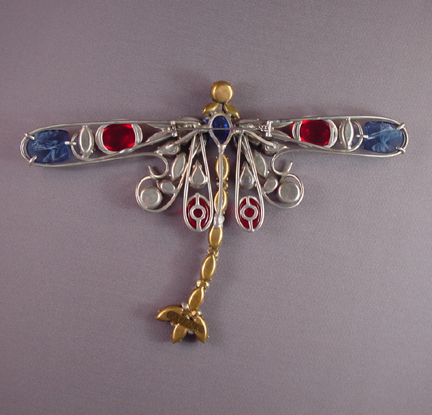 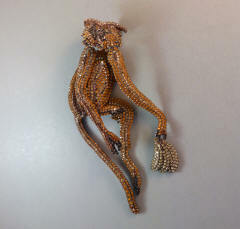 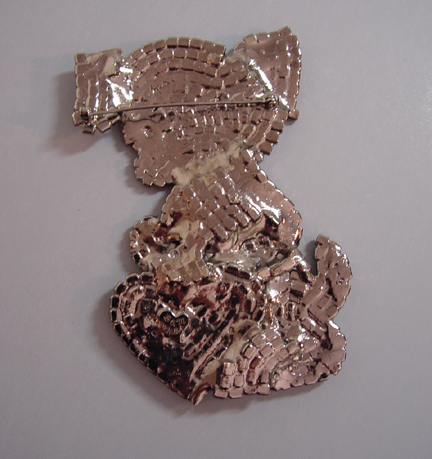 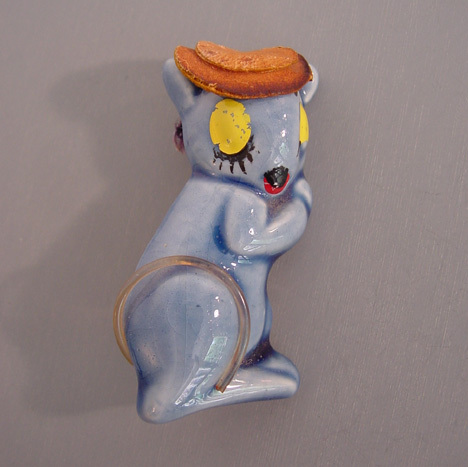 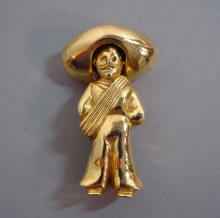 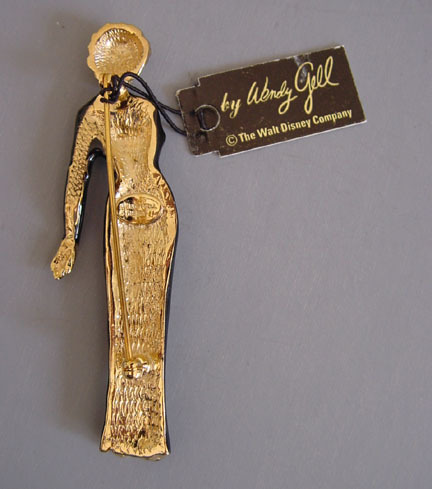 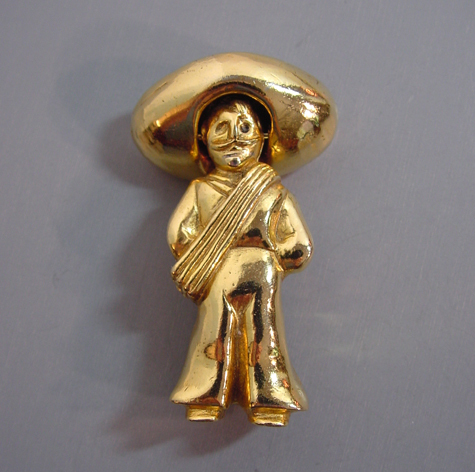 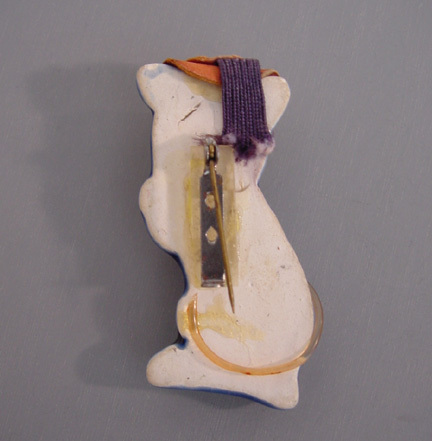 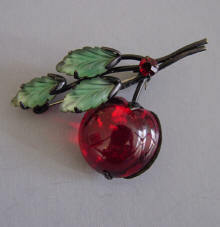 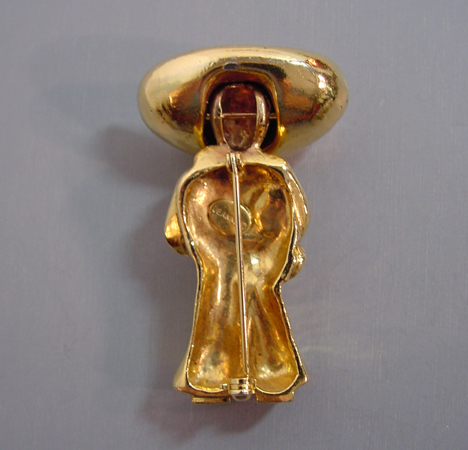 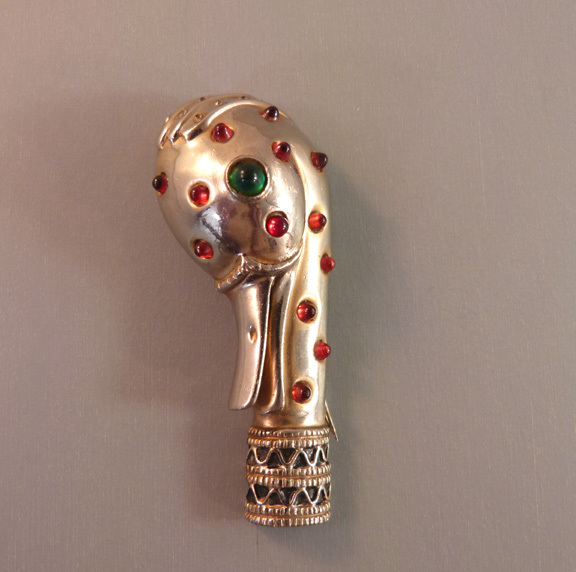 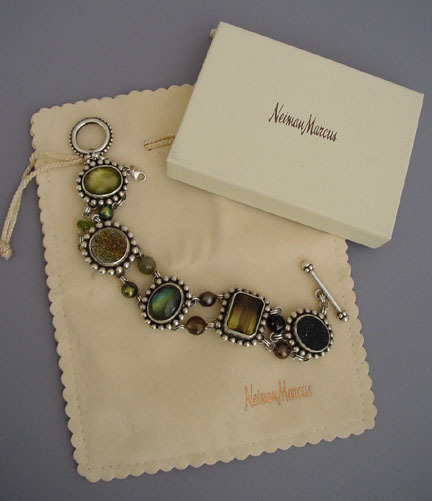 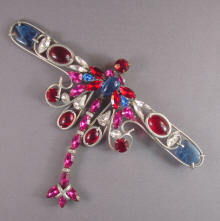 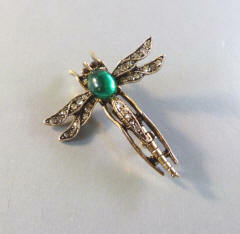 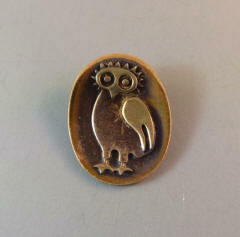 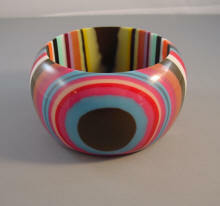 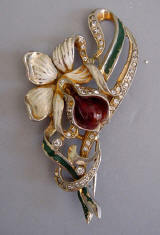 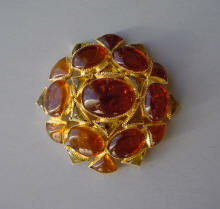 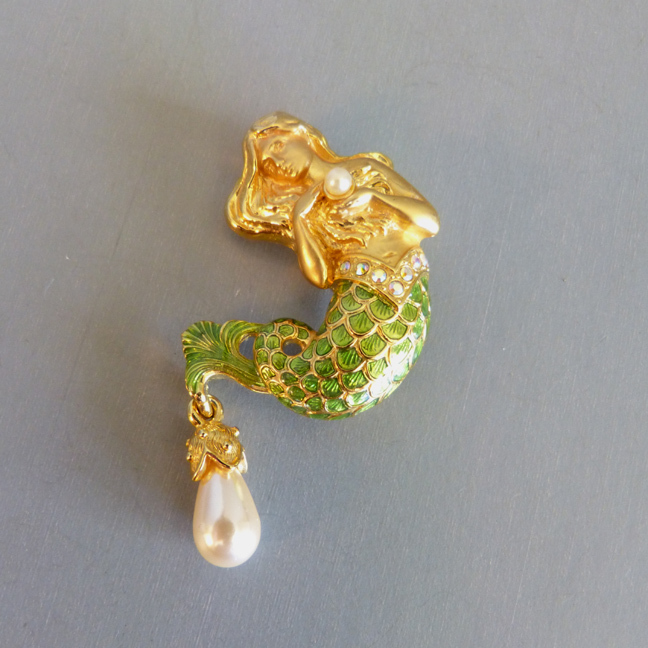 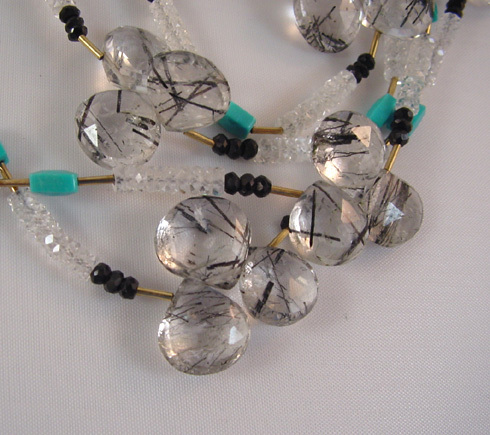 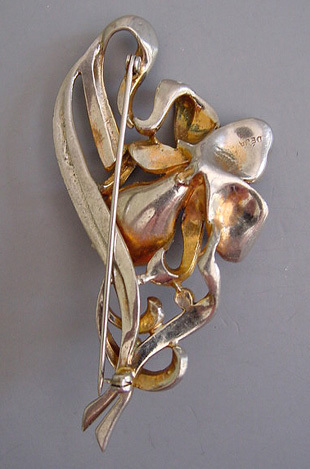 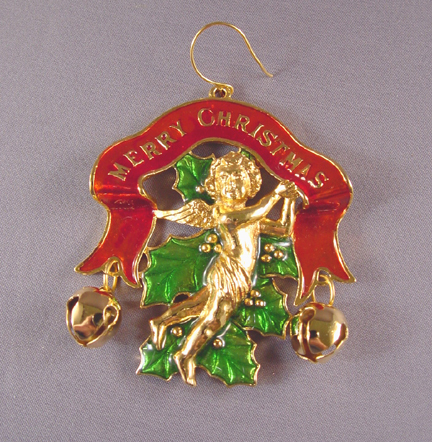 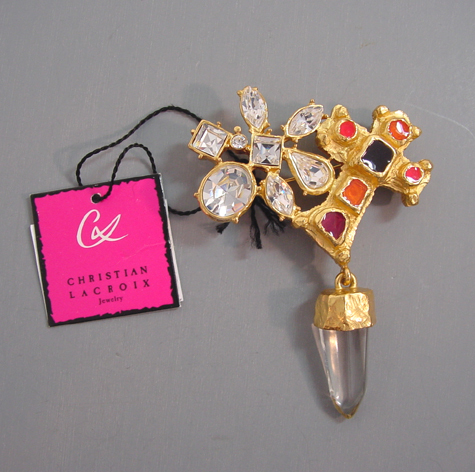 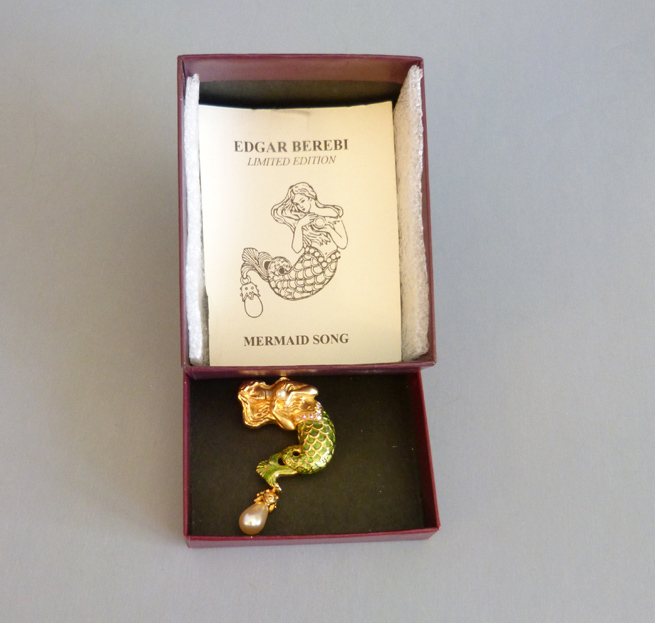 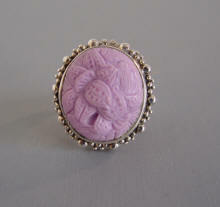 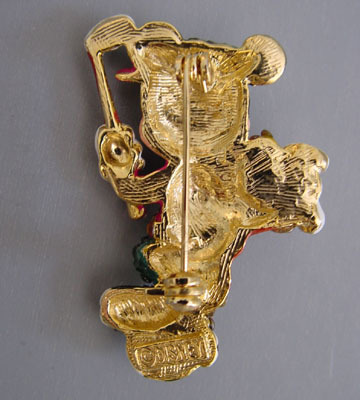 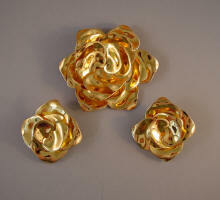 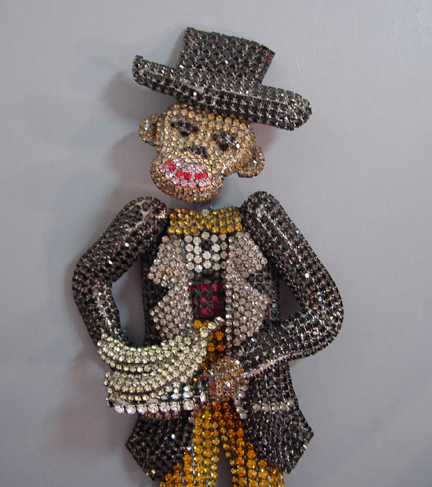 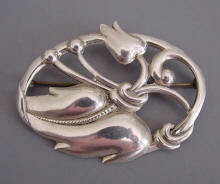 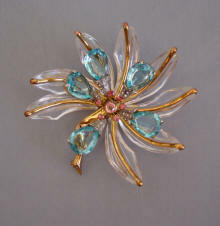 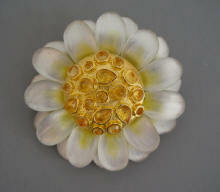 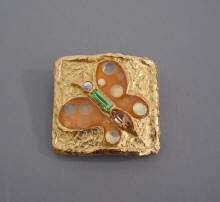 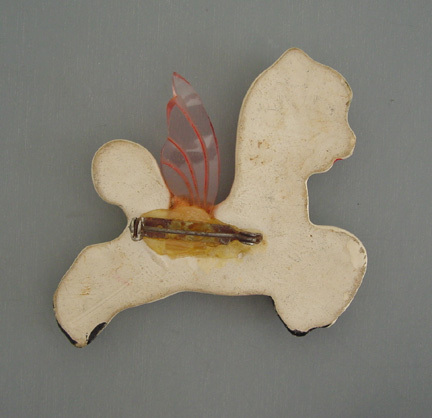 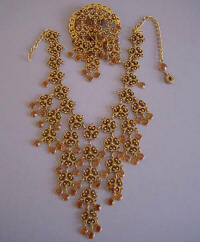 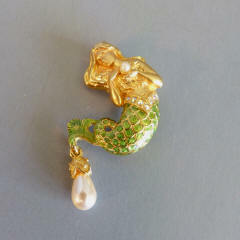 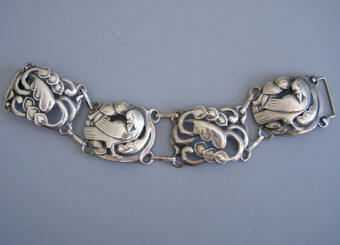 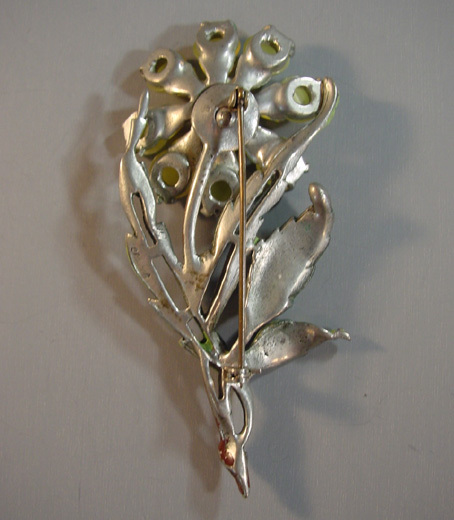 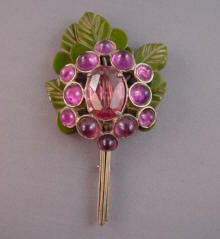 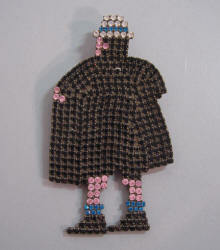 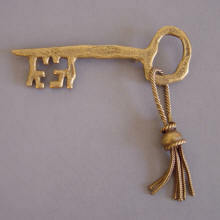 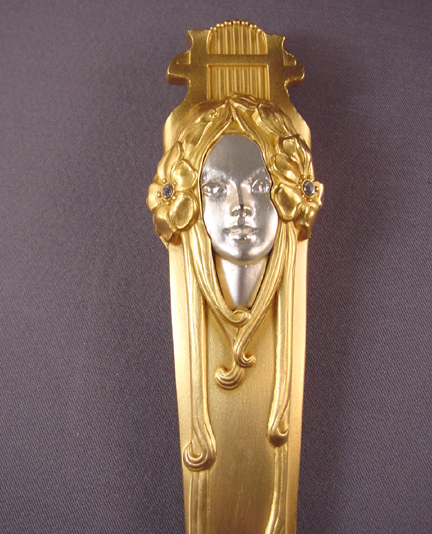 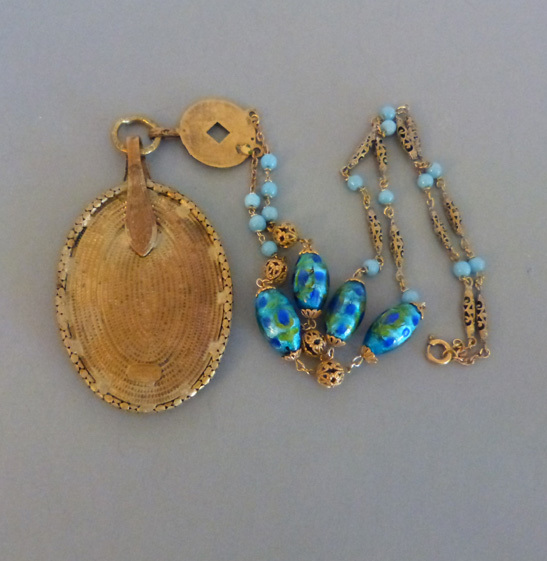 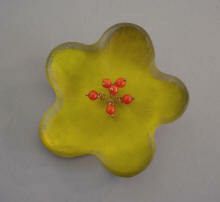 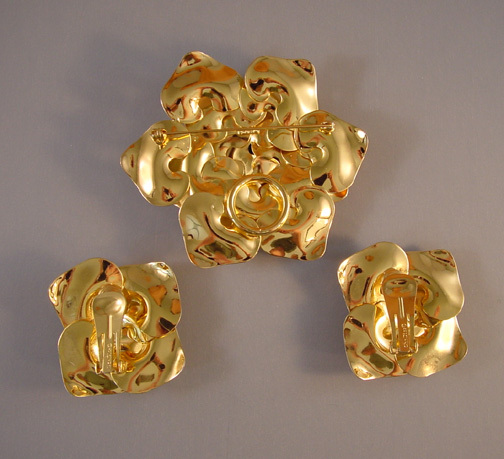 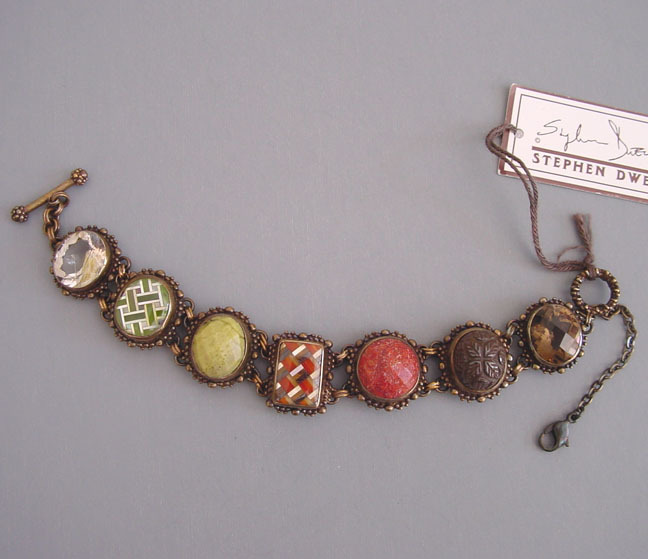 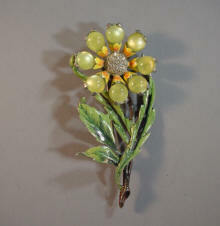 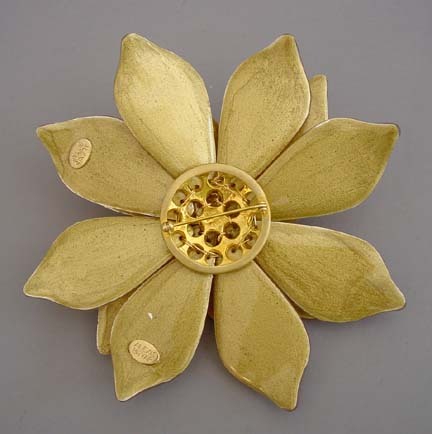 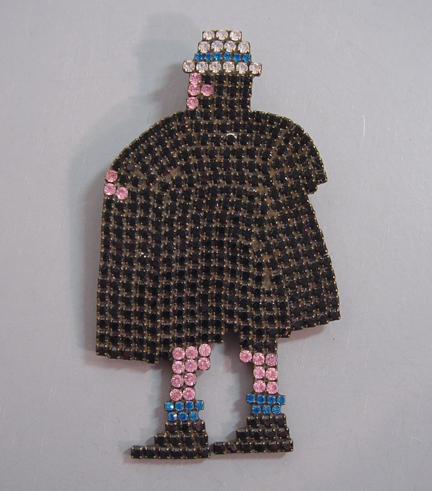 Many of her pieces were made only in limited quantities and they can be difficult to find now. 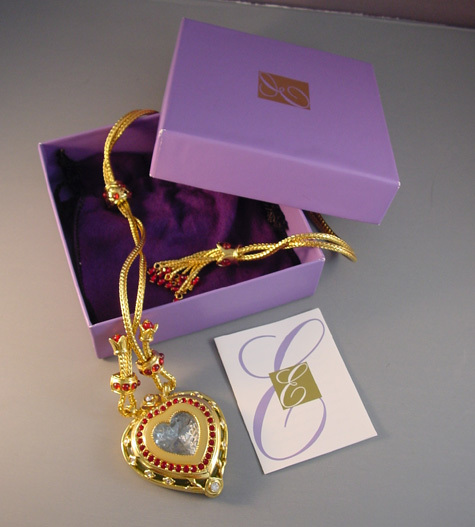 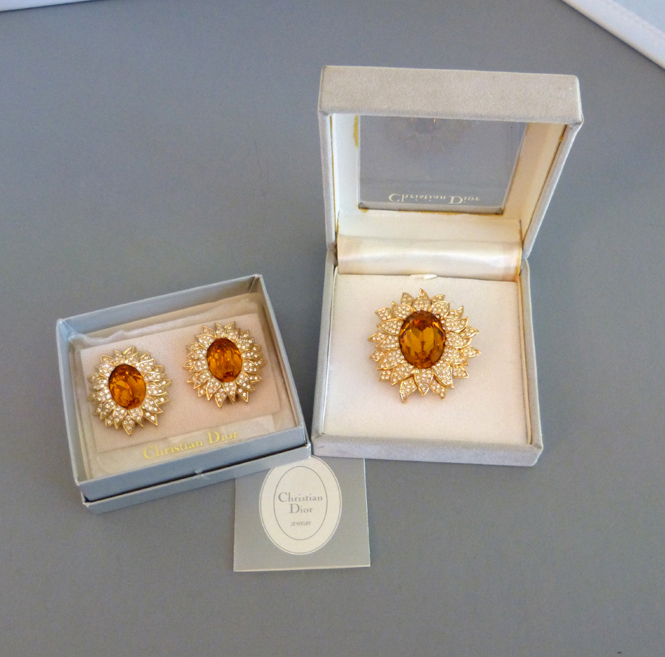 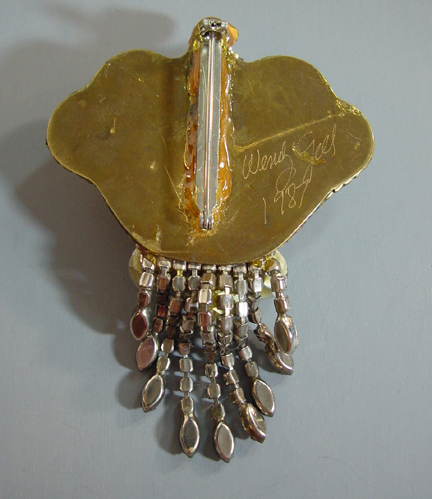 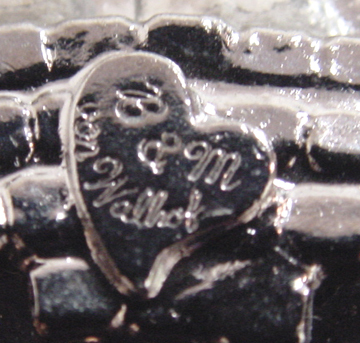 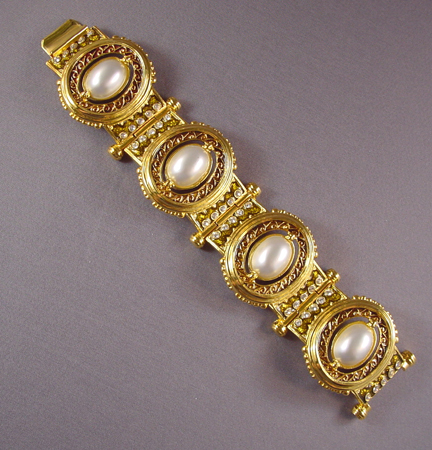 Bettina and Michelle von Walhof continued to market jewelry under the B&M von Walhof brand through about 2000. 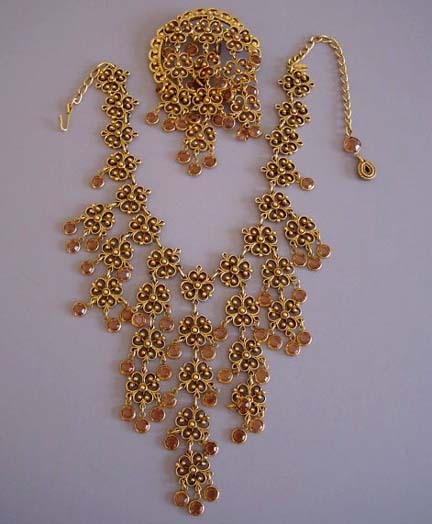 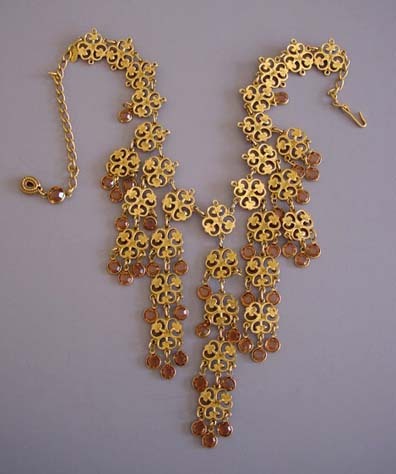 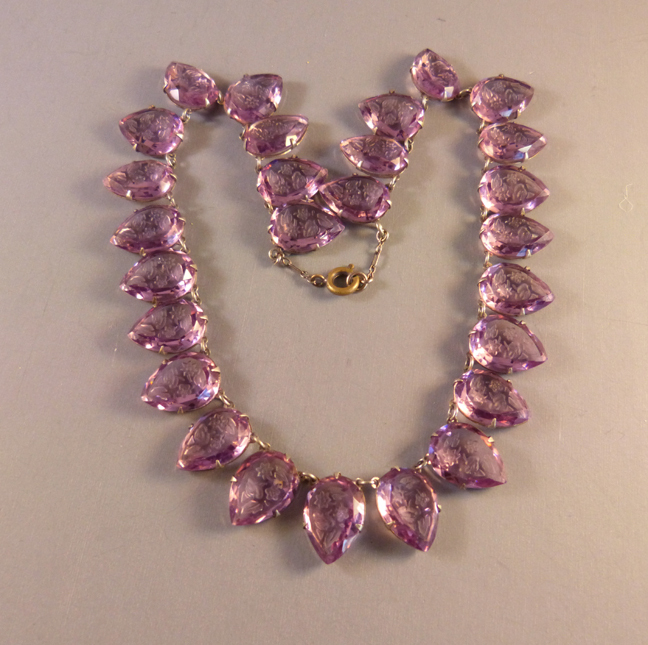 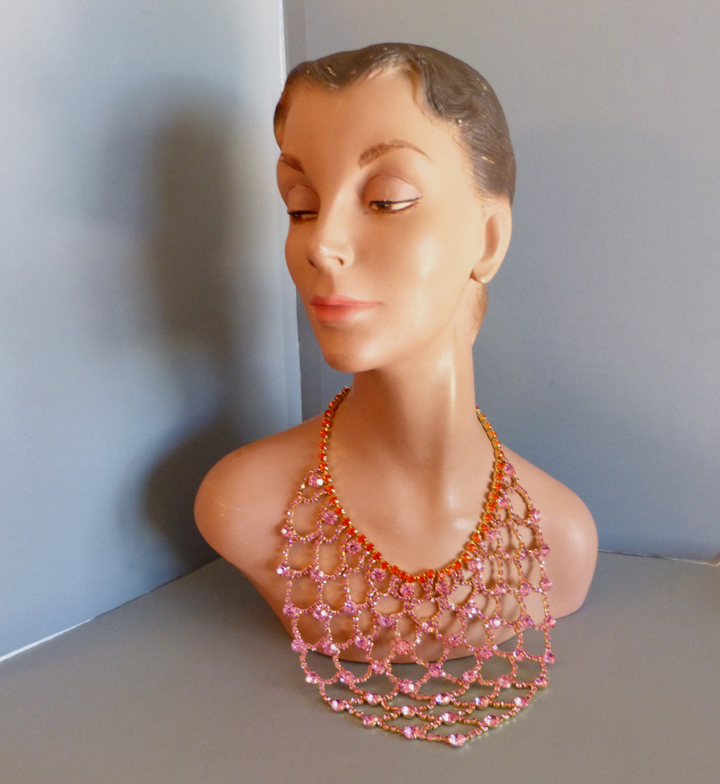 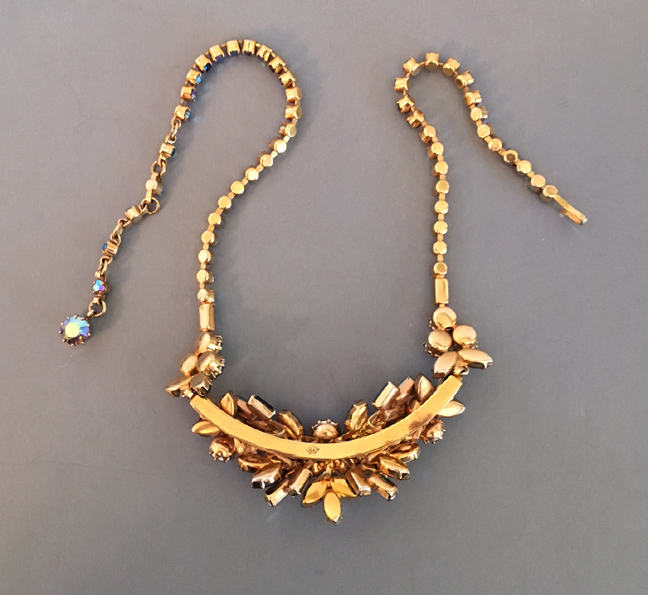 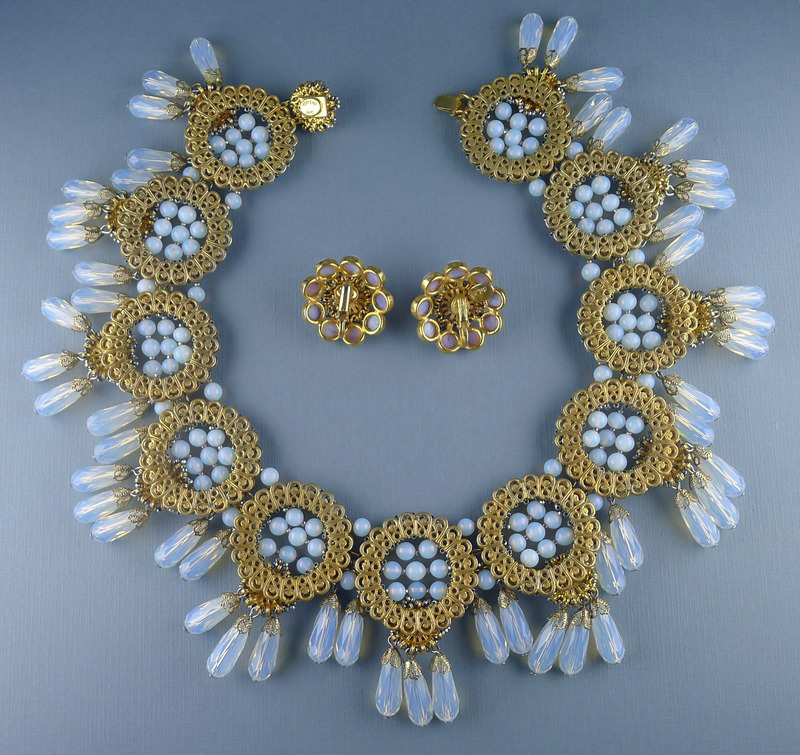 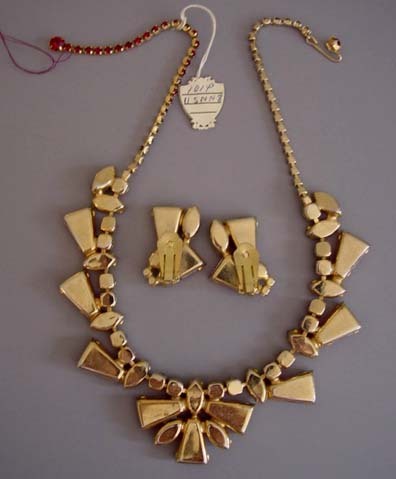 WILLIAM DeLILLO necklace and earring set hand made by Robert Clark, who was the head designer for Miriam Haskell in the 1960's. 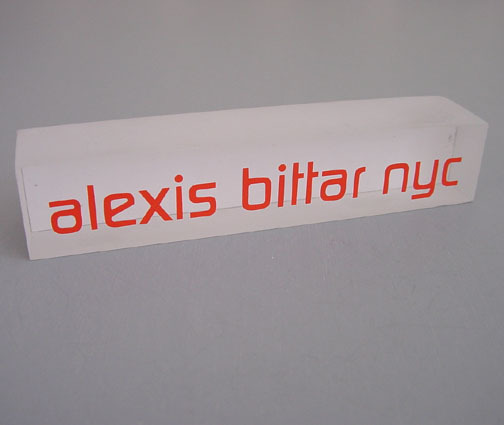 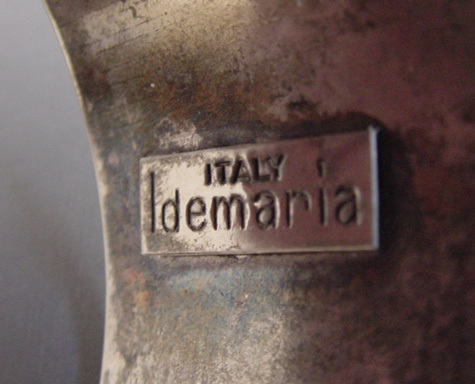 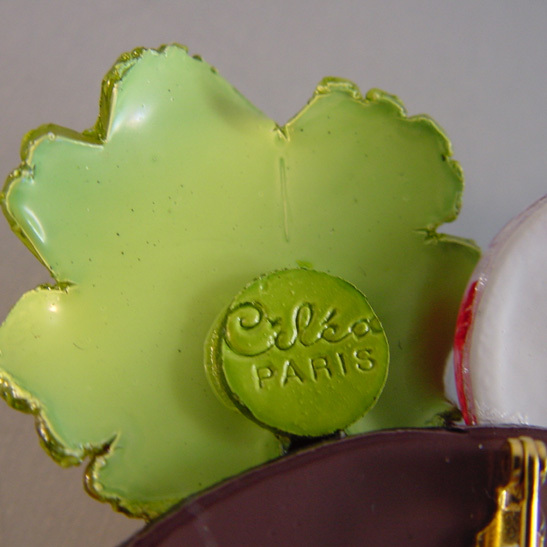 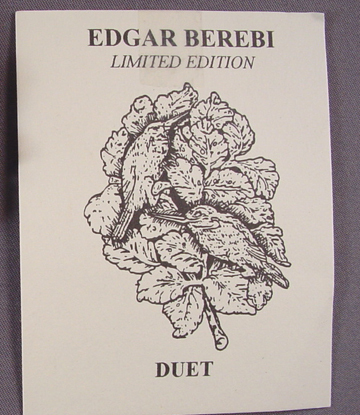 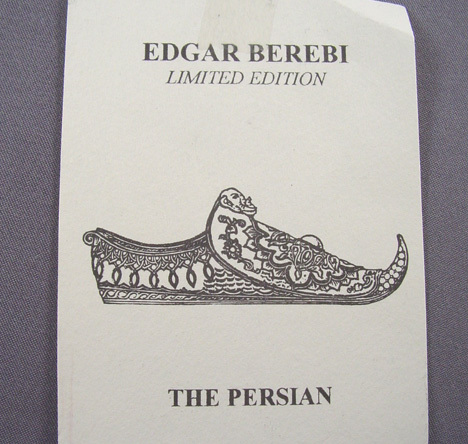 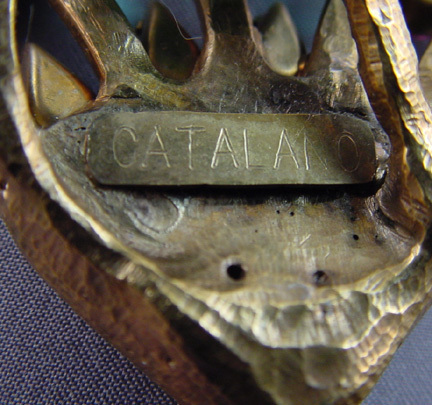 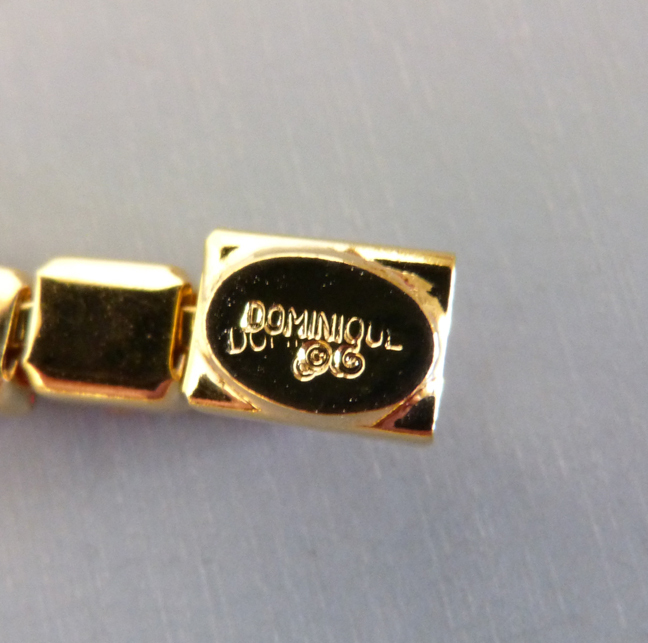 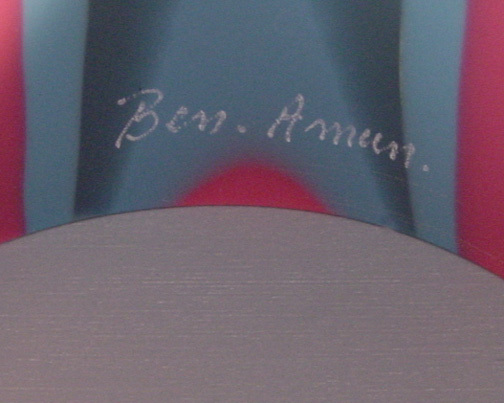 It was made as a prototype for De Lillo as a limited edition. 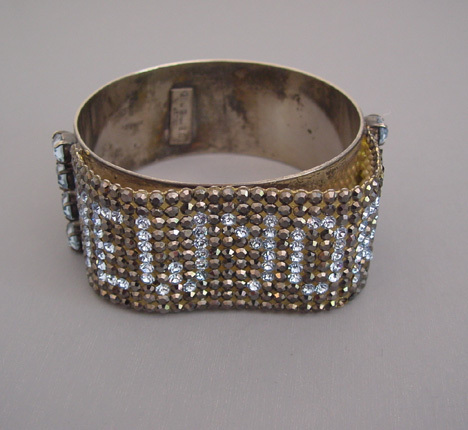 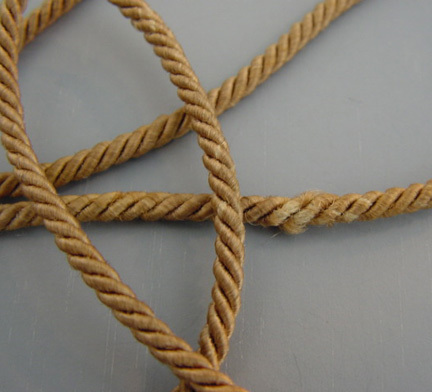 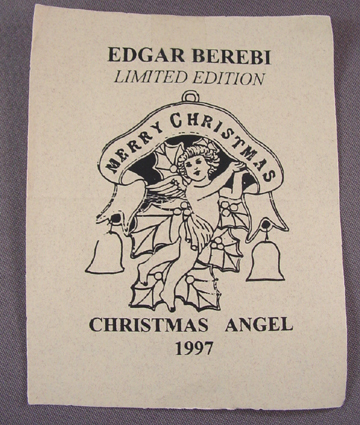 It was purchased from Mr. de Lillo from his personal archives. 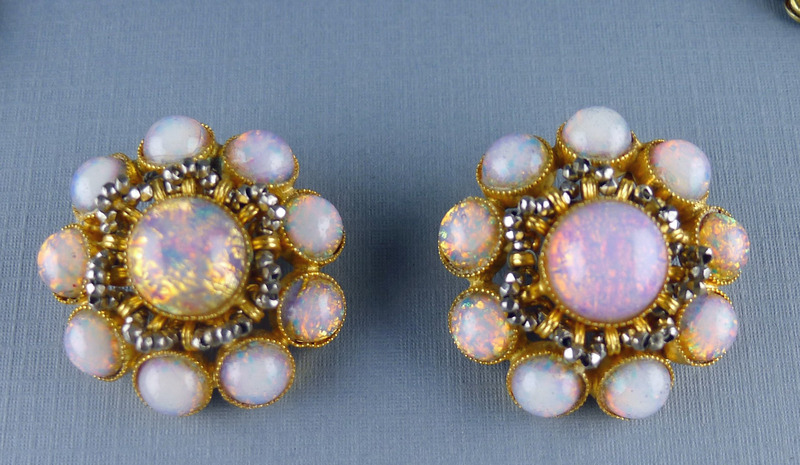 The wonderful glass stones simulate opals and surrounded by silver tone metal spacer beads The back is finished as impeccably as the front. 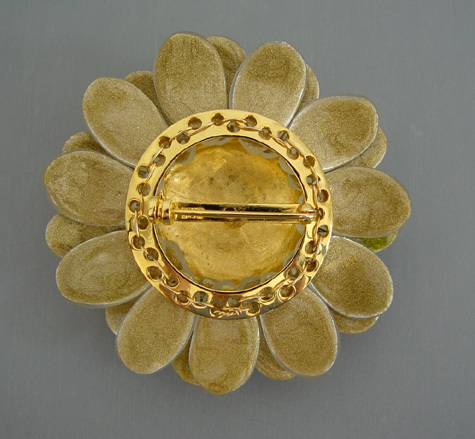 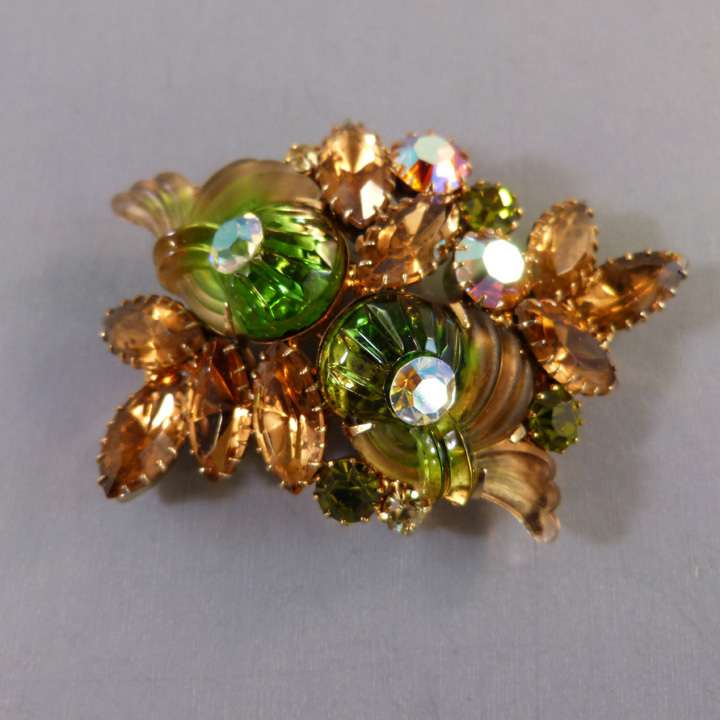 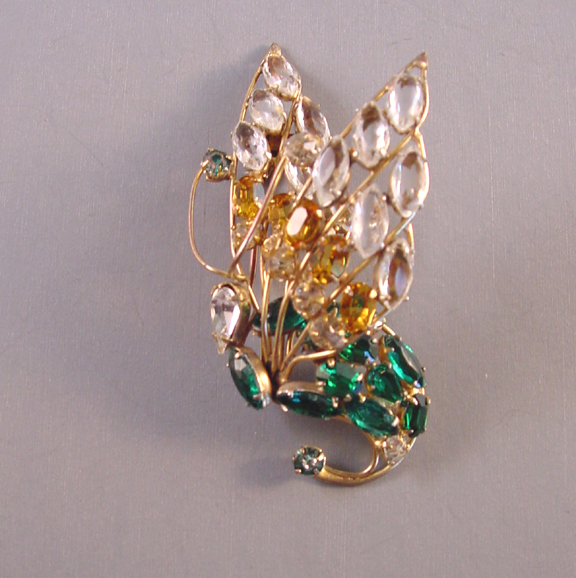 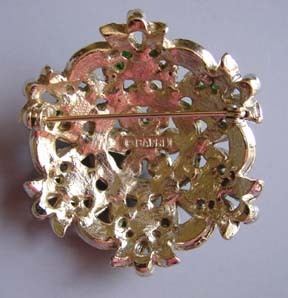 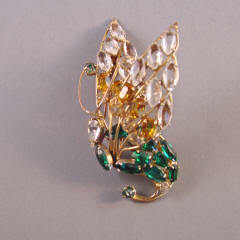 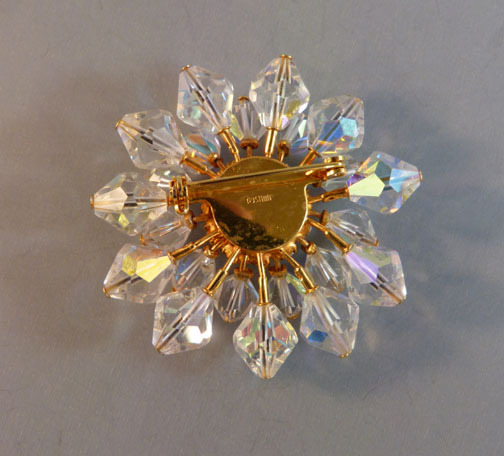 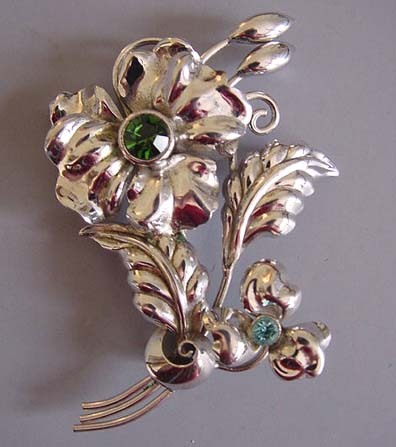 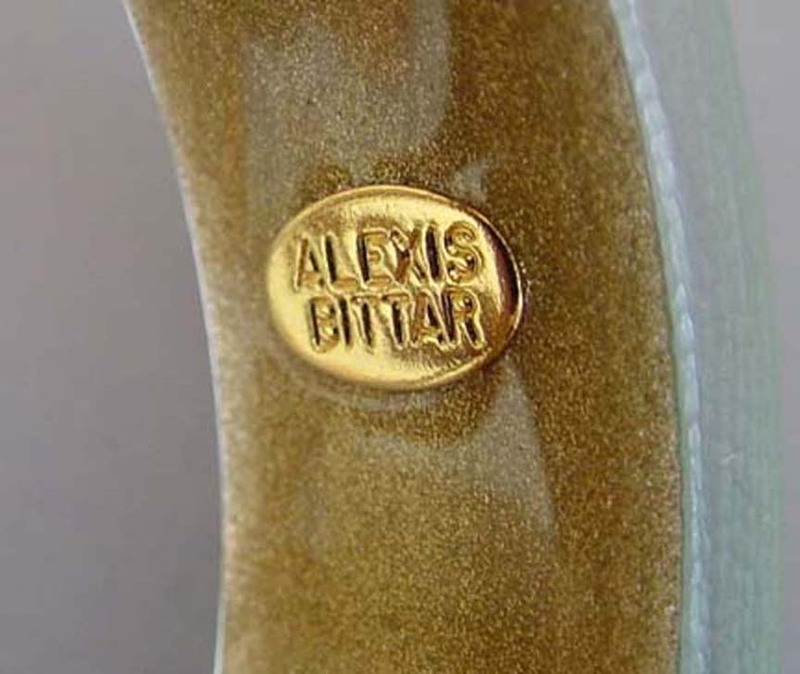 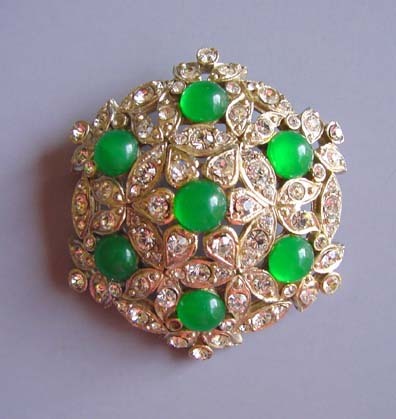 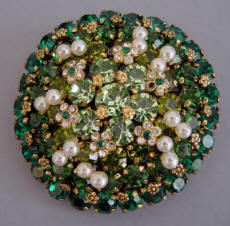 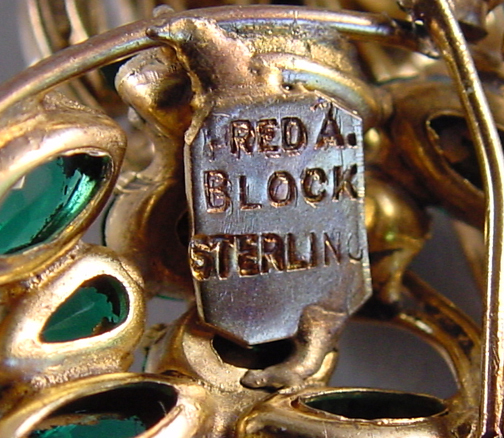 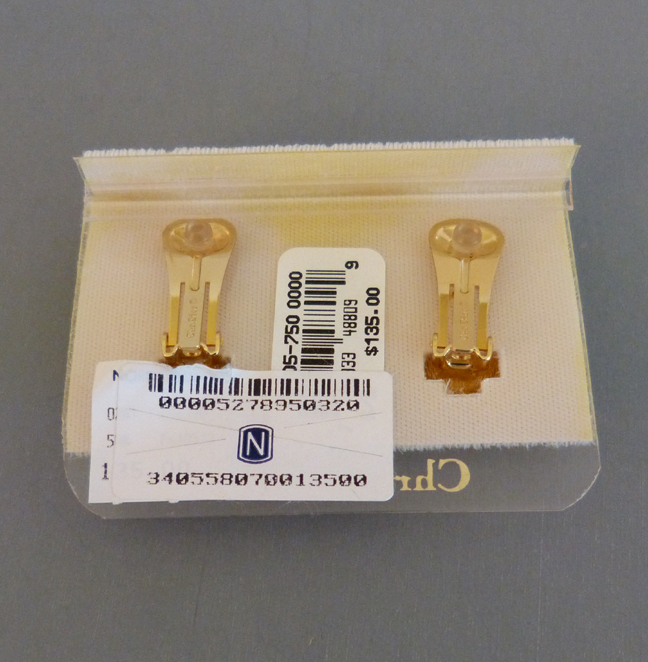 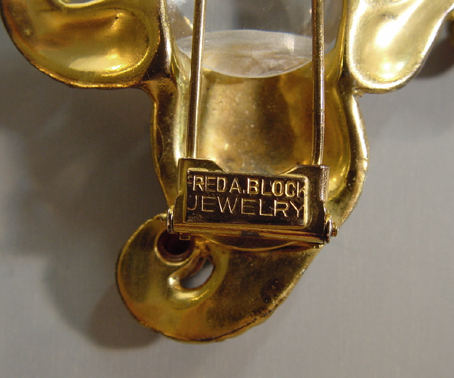 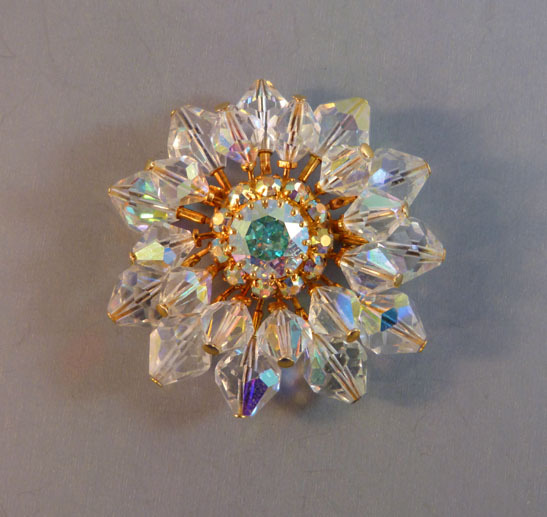 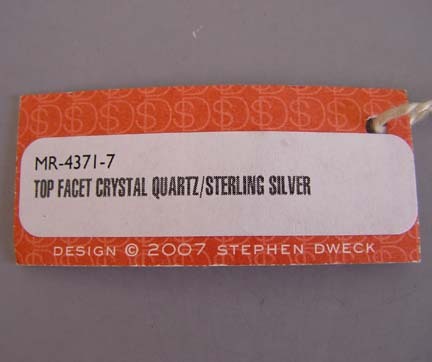 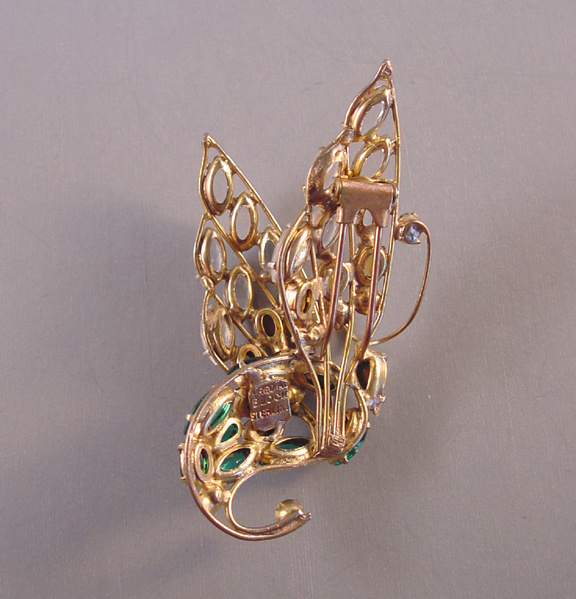 BLOCK Fred A Block sterling butterfly fur clip with unfoiled rhinestones in green, golden, pale yellow and clear, all in gilt sterling, 3-1/2" by 1-1/2". 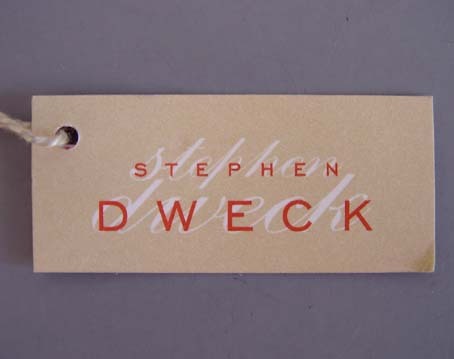 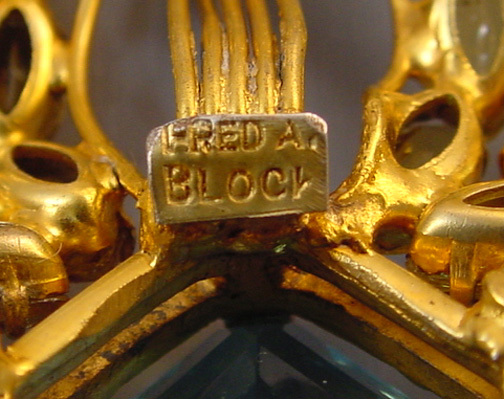 Block was a Chicago ready-to-wear maker. 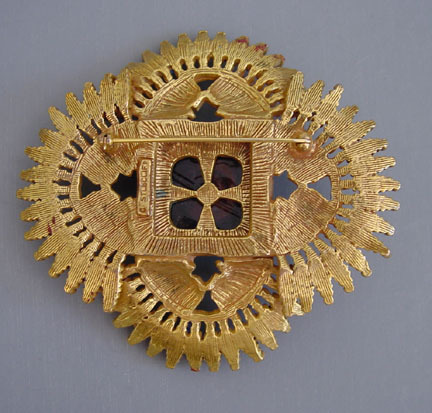 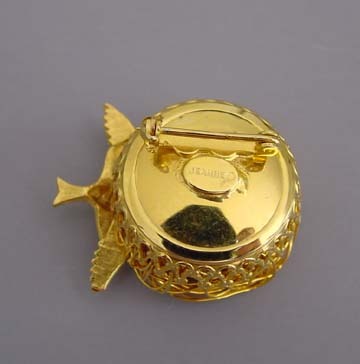 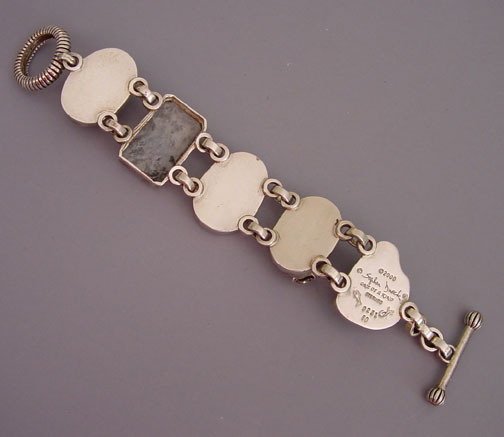 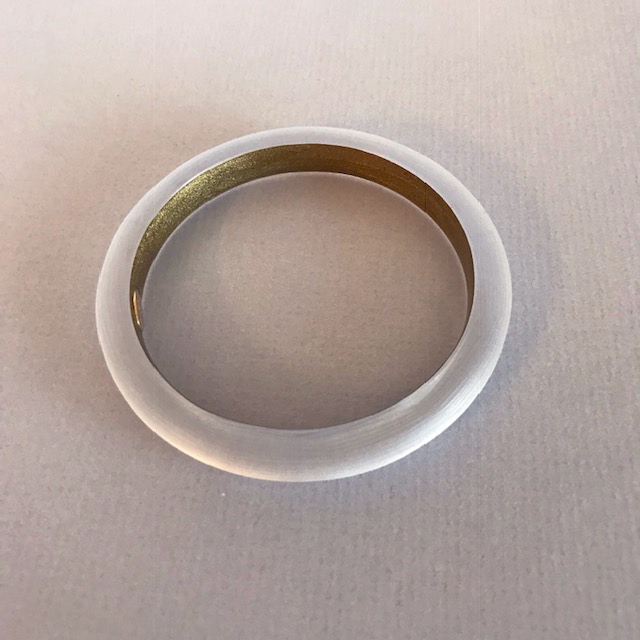 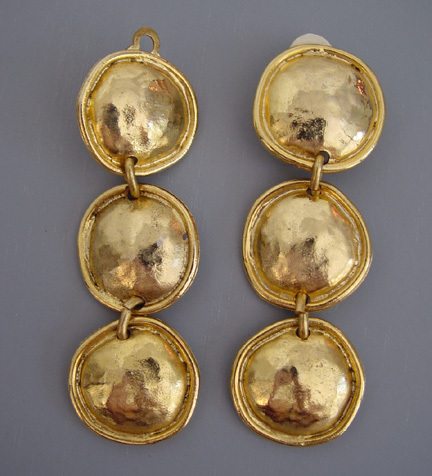 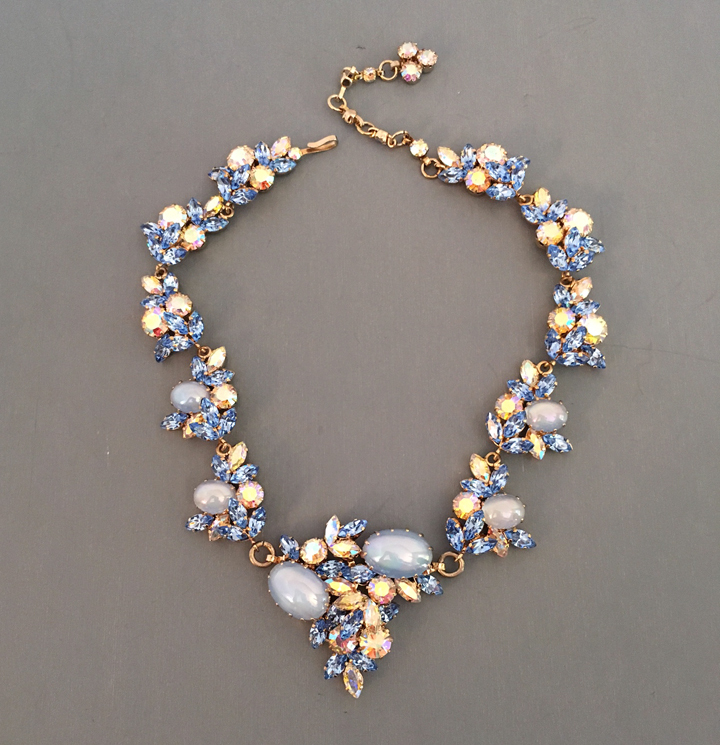 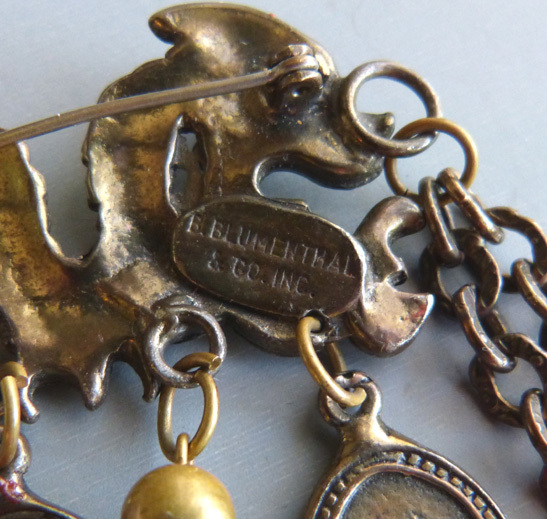 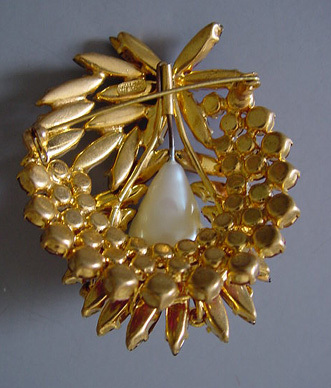 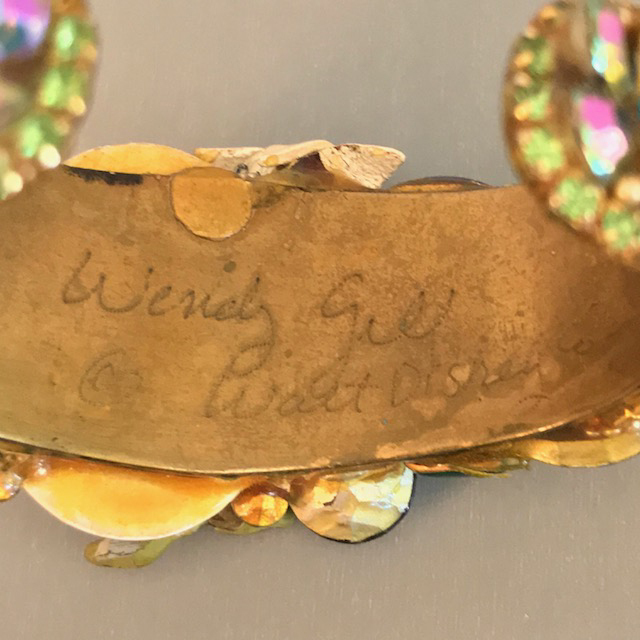 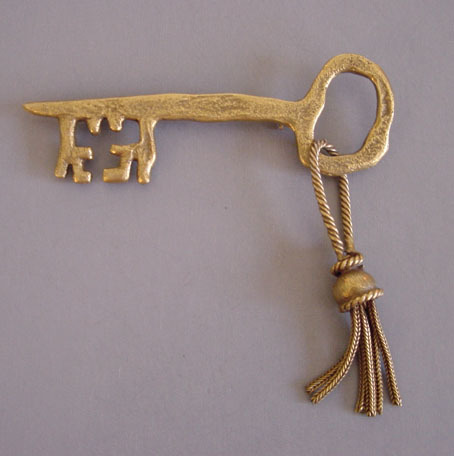 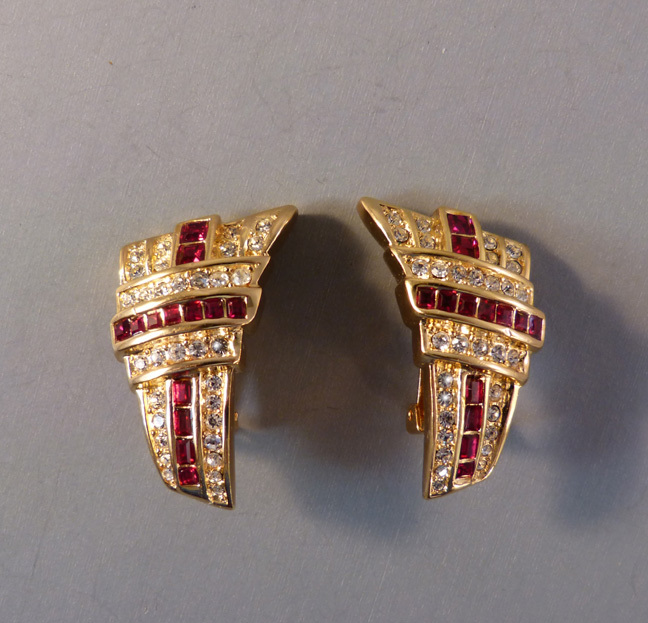 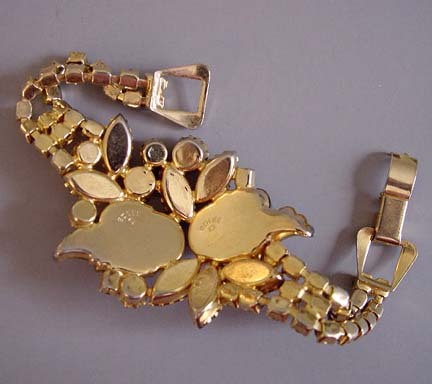 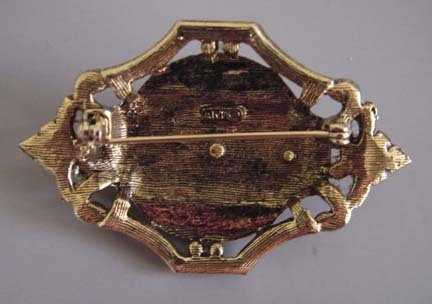 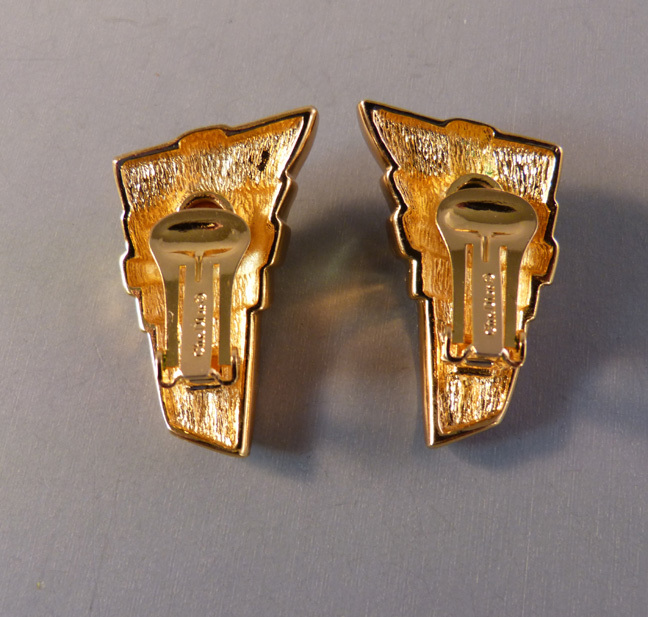 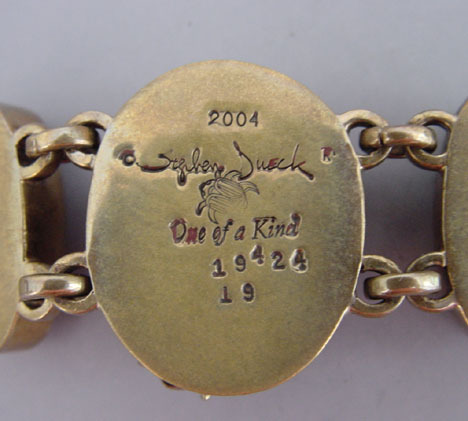 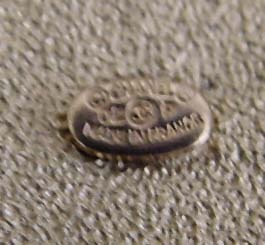 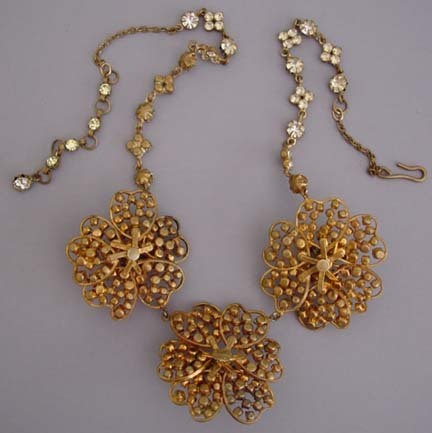 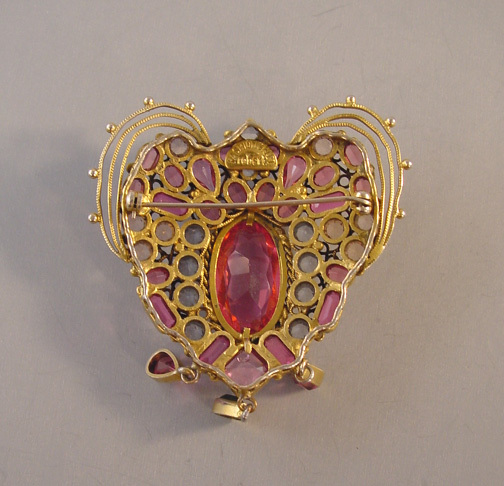 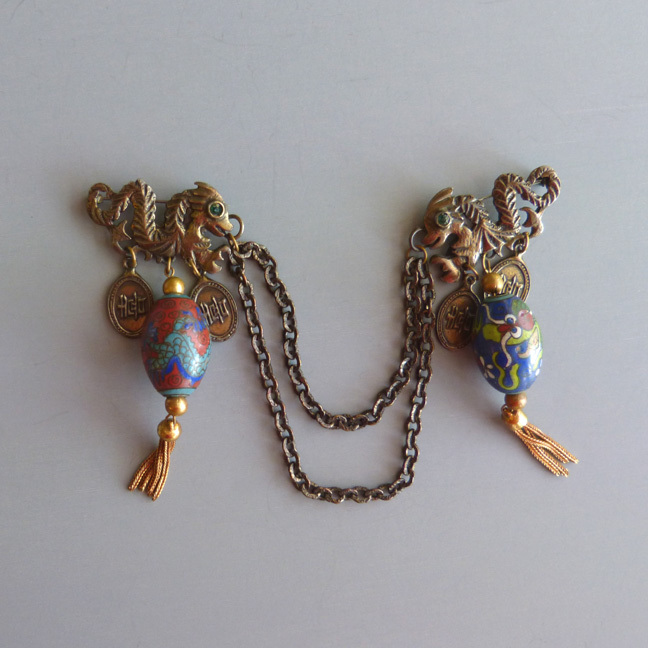 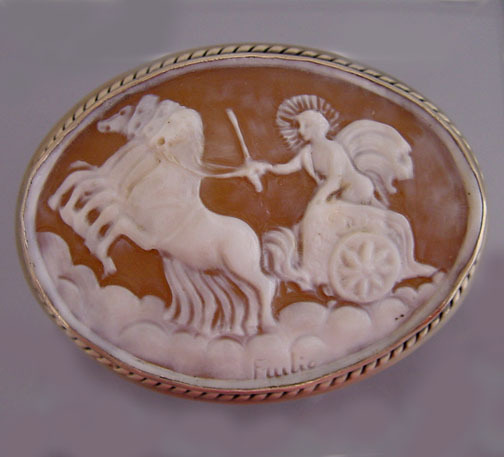 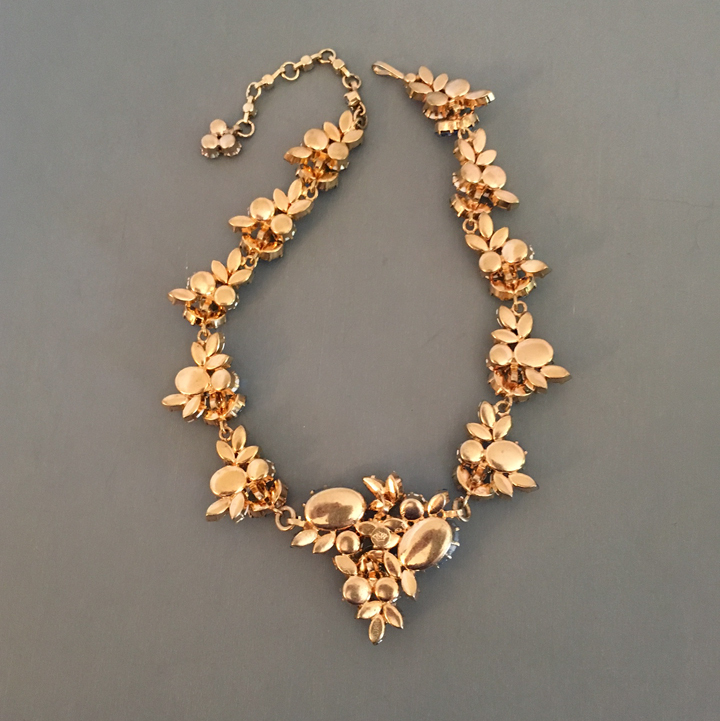 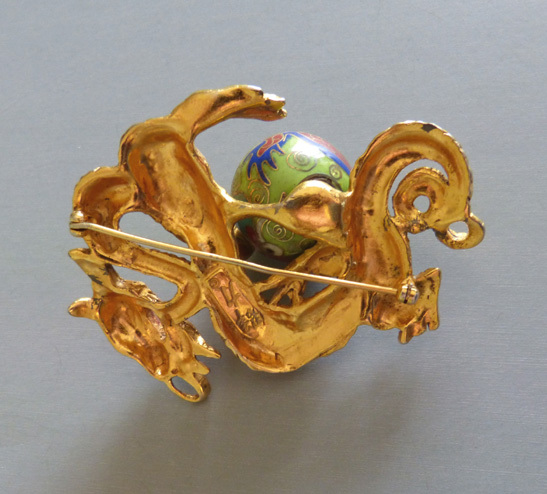 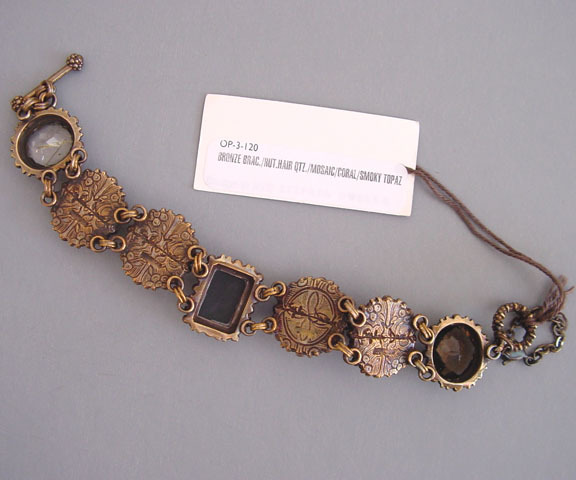 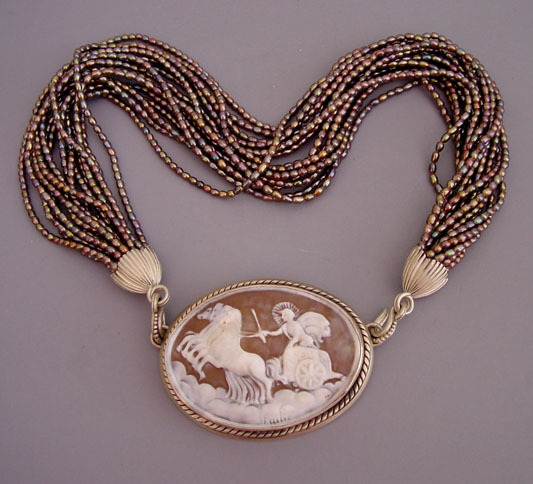 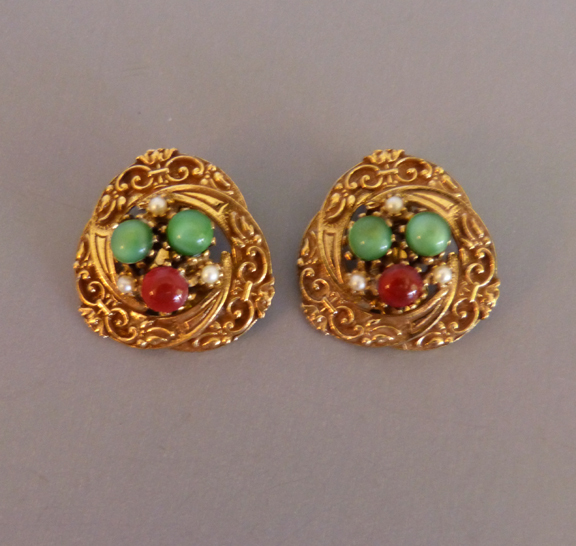 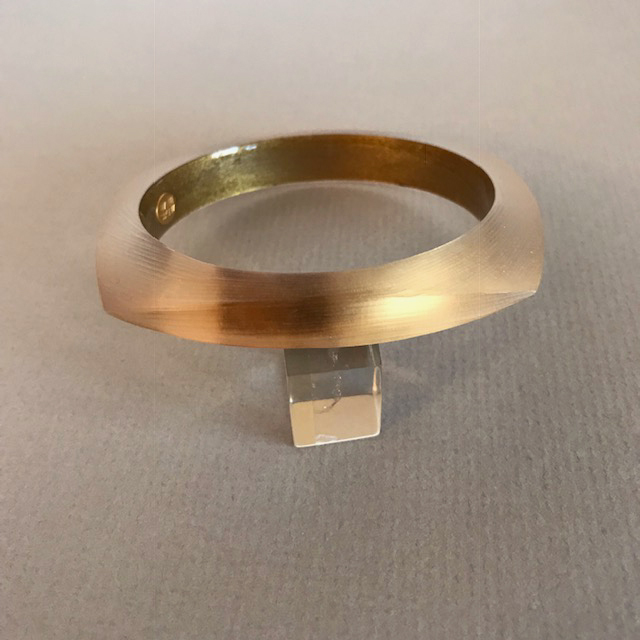 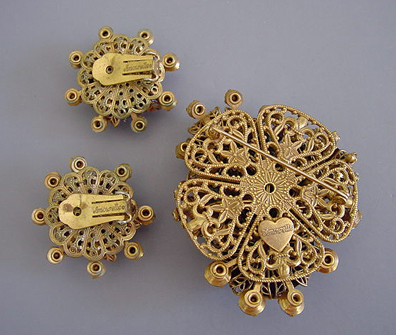 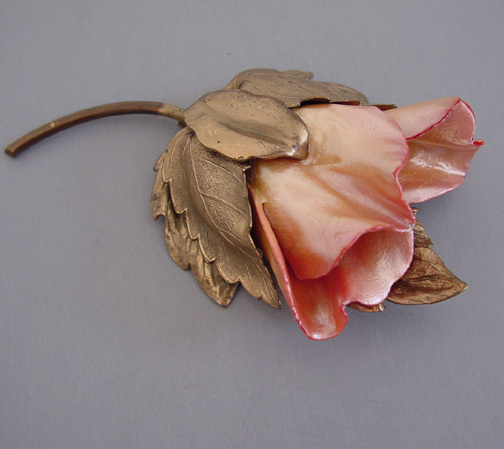 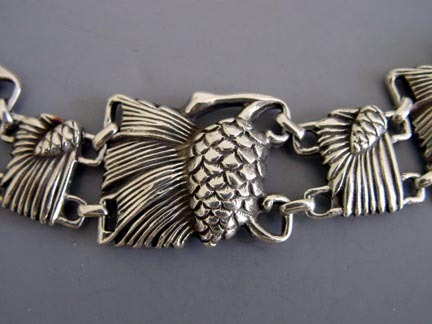 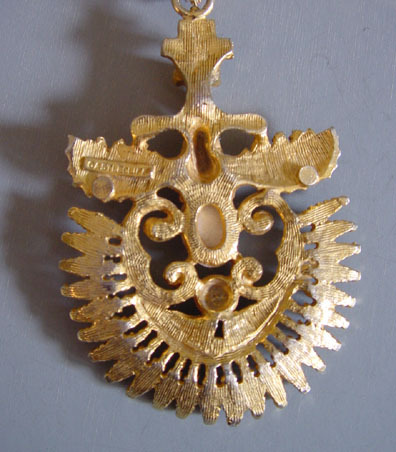 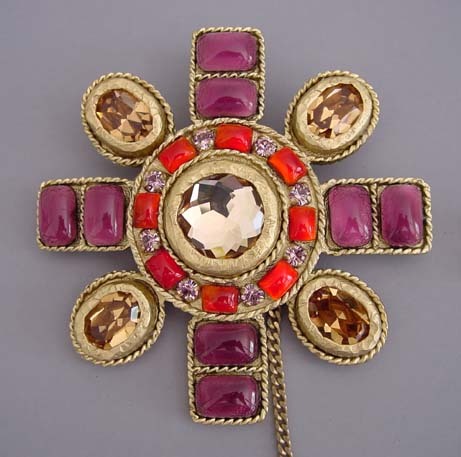 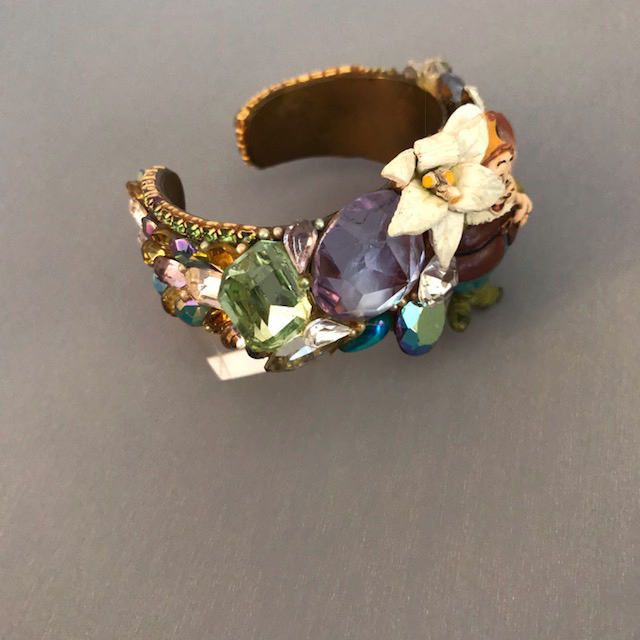 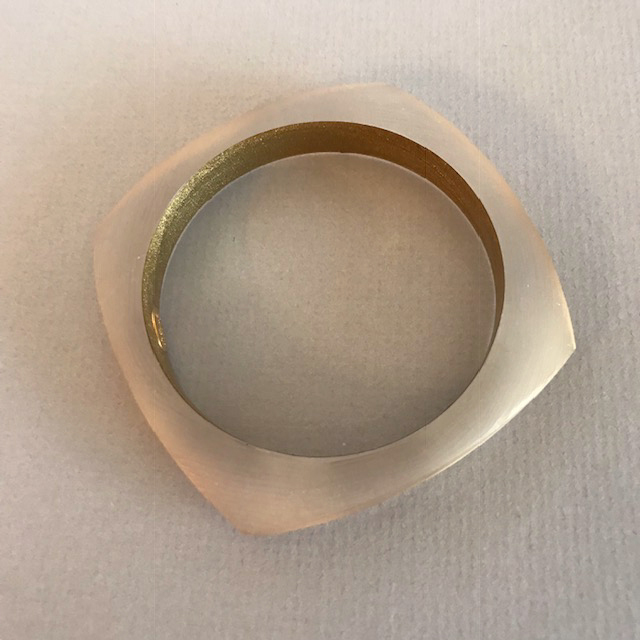 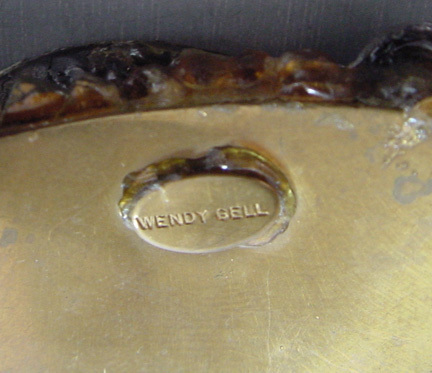 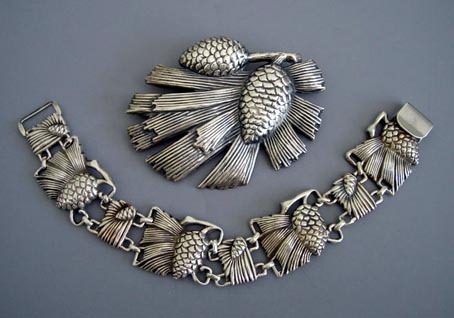 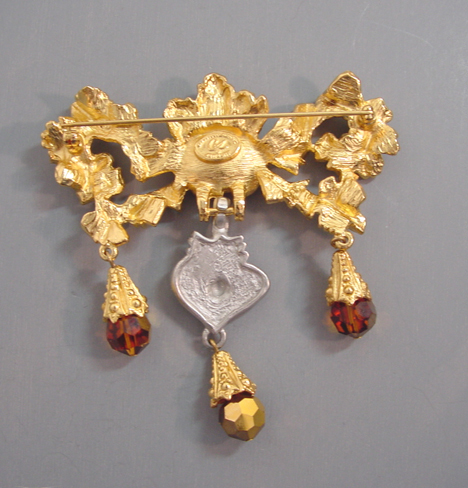 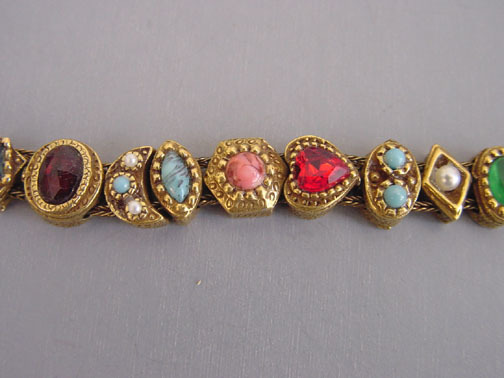 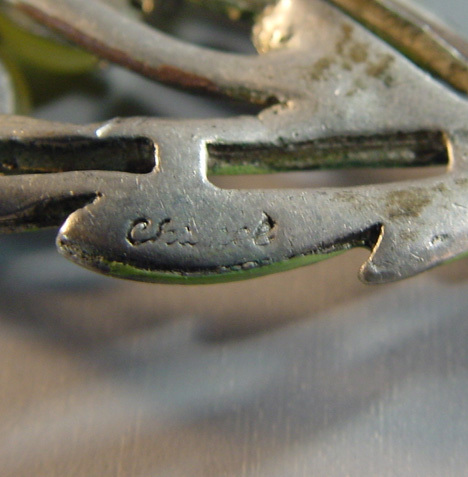 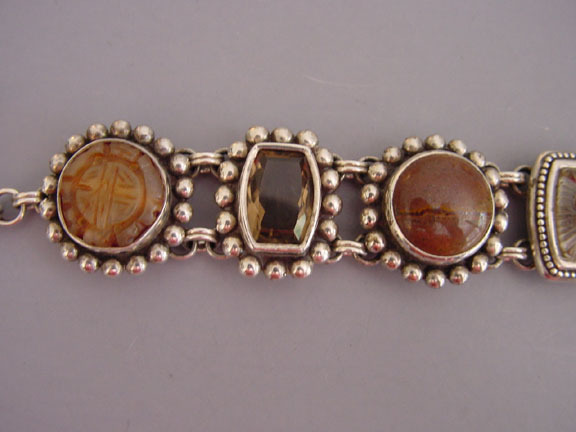 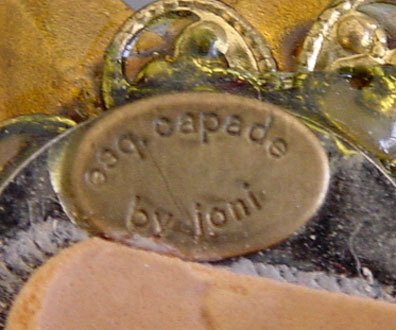 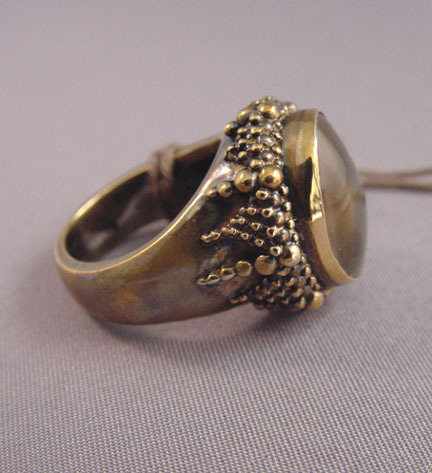 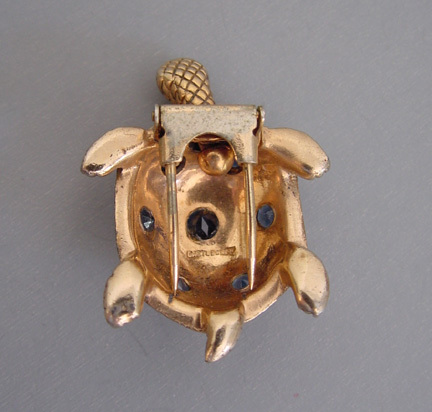 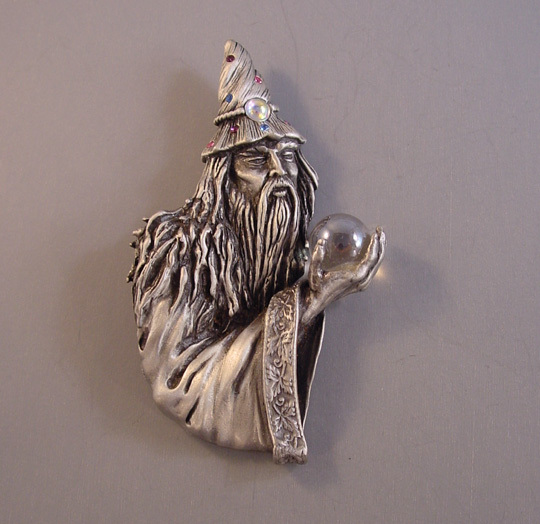 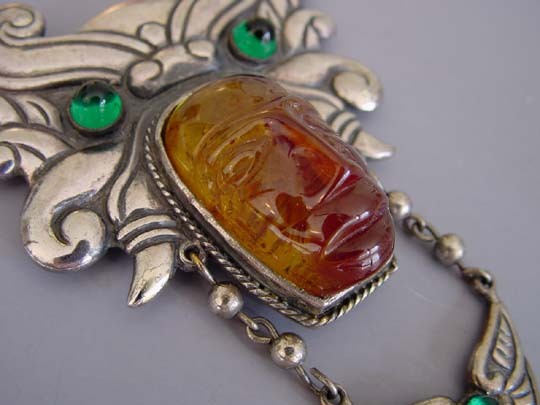 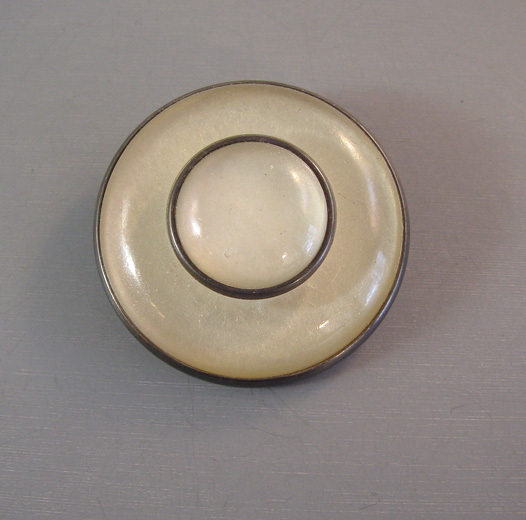 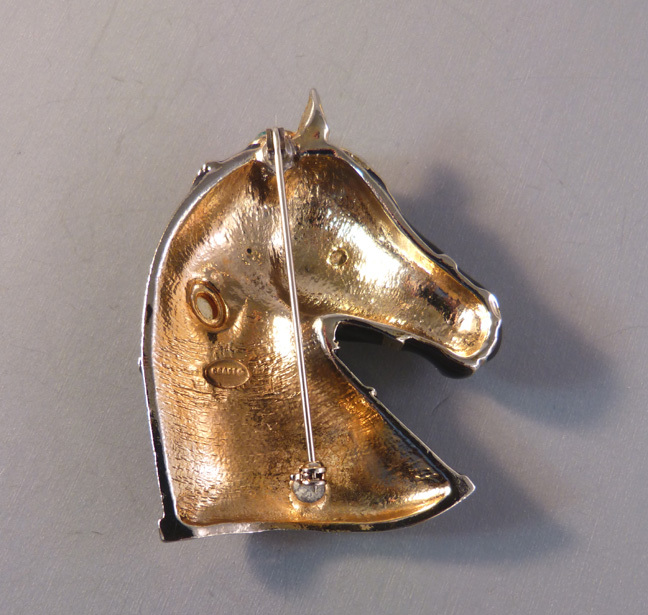 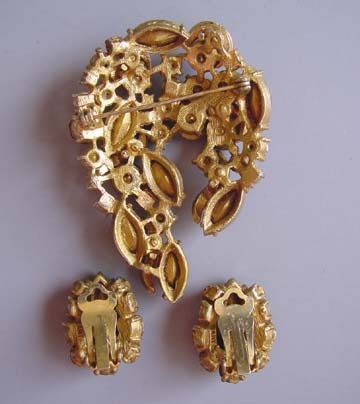 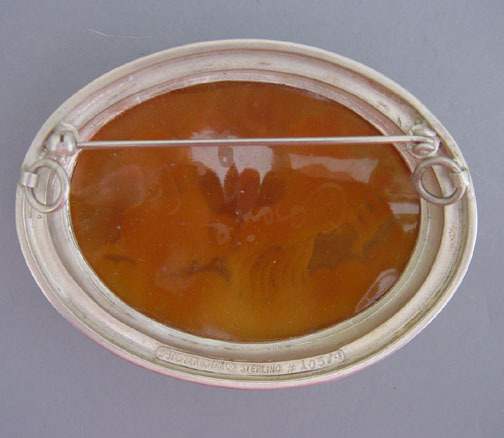 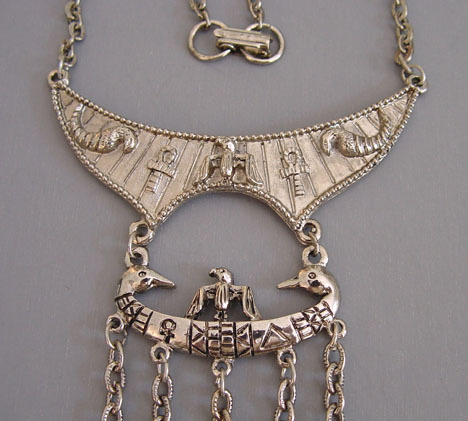 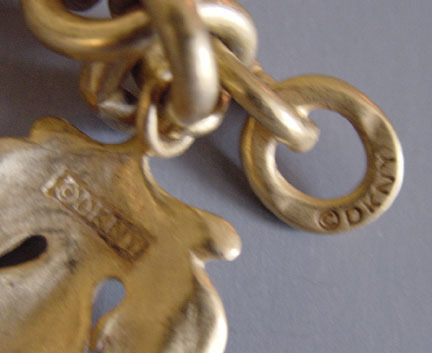 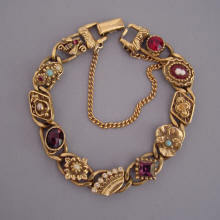 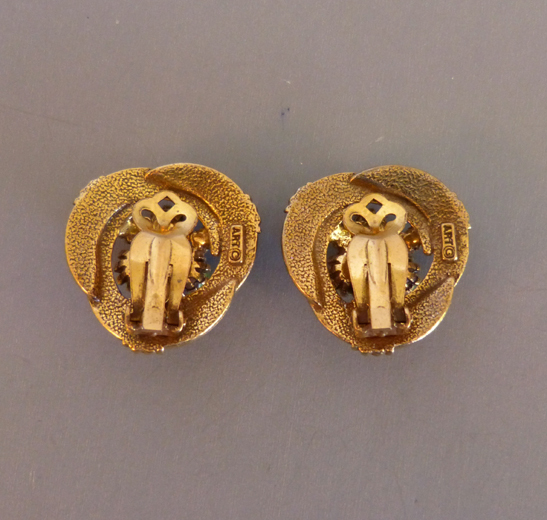 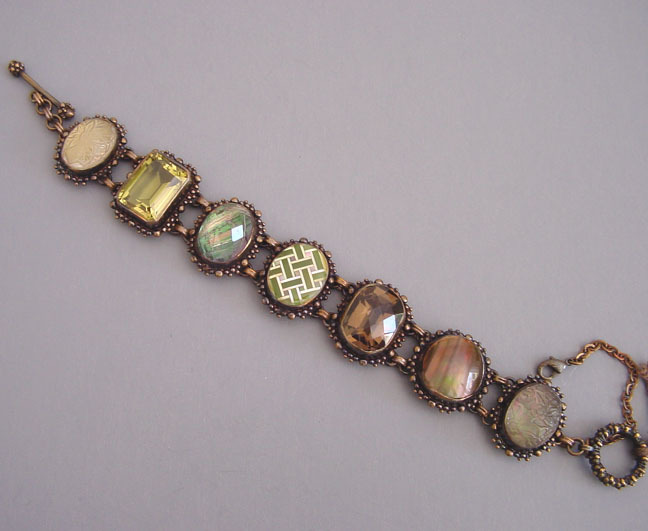 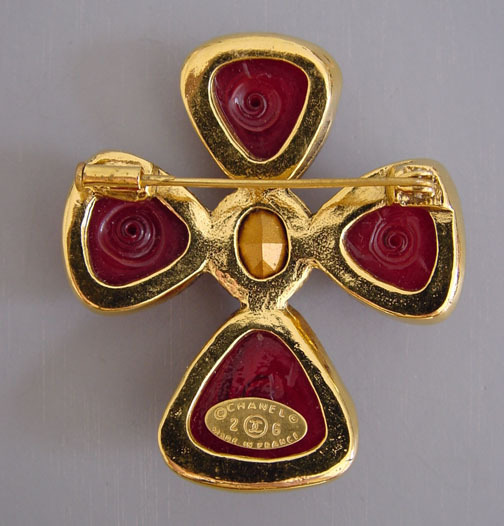 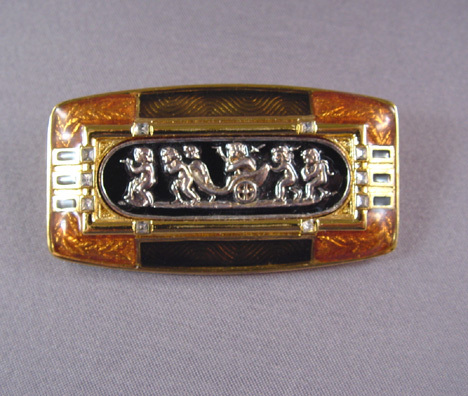 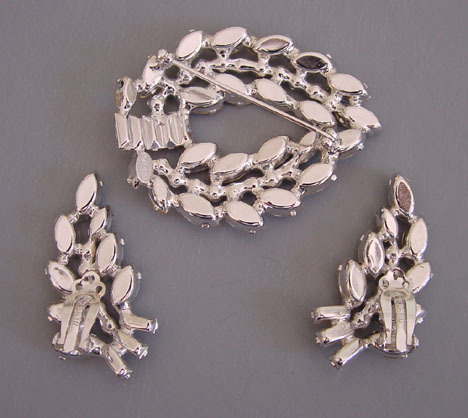 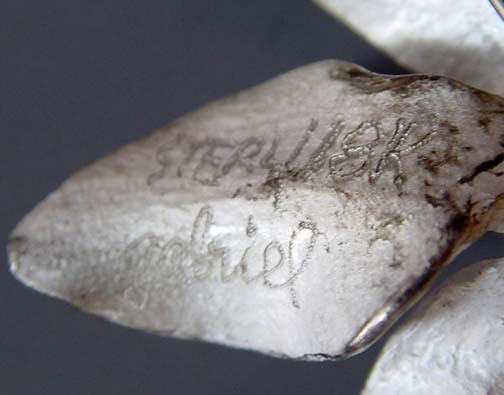 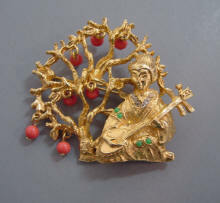 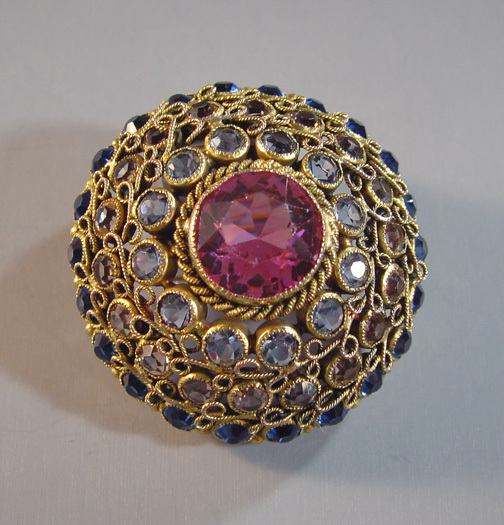 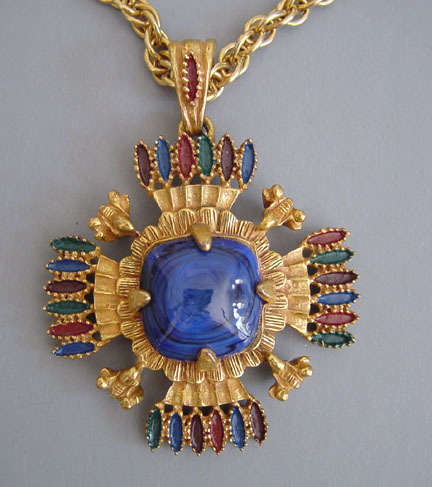 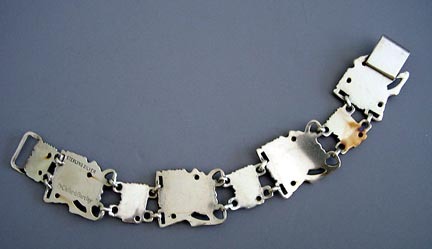 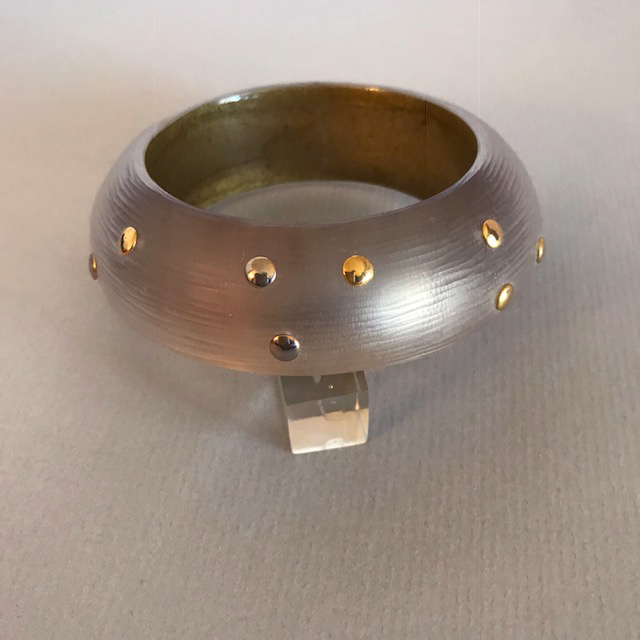 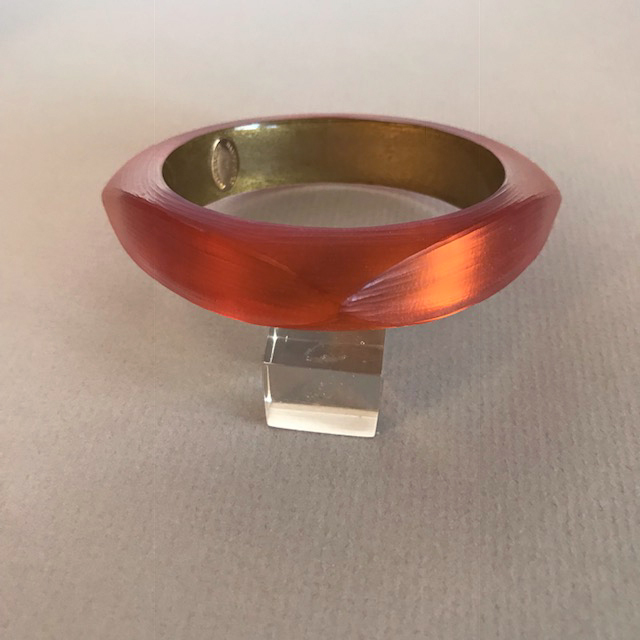 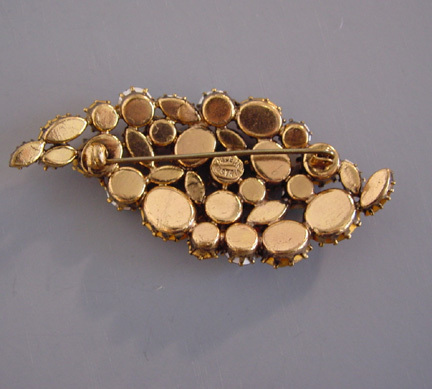 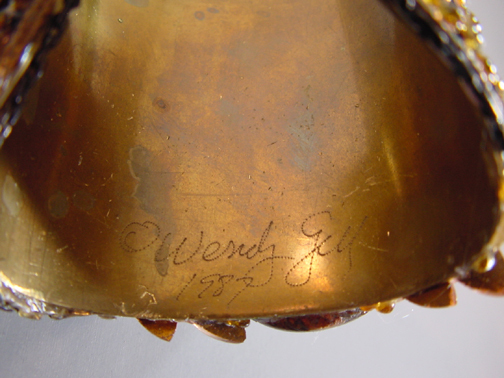 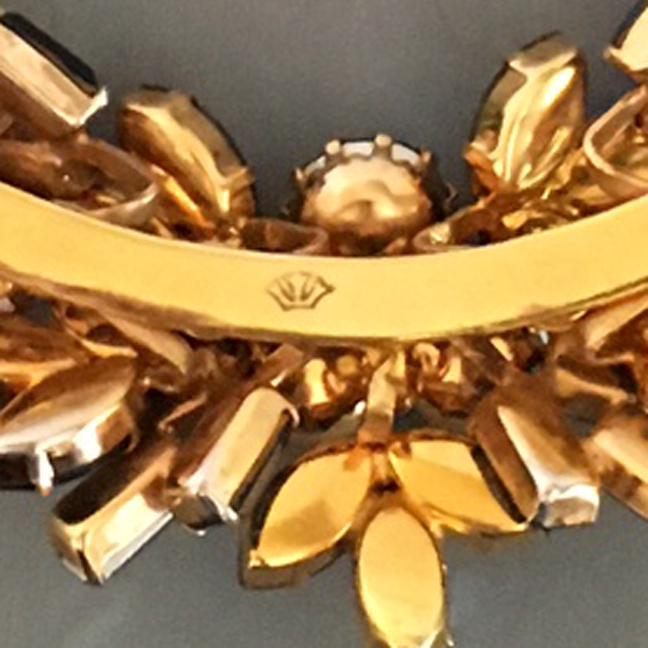 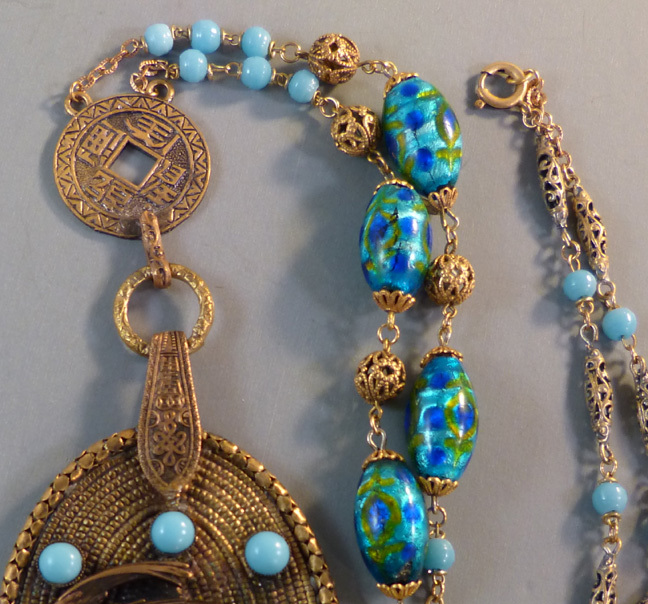 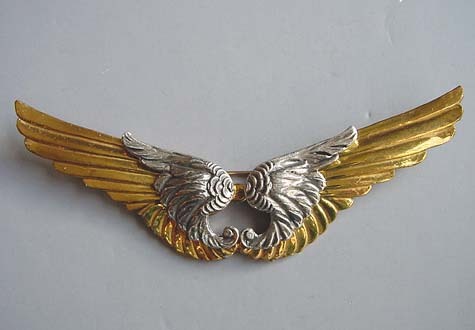 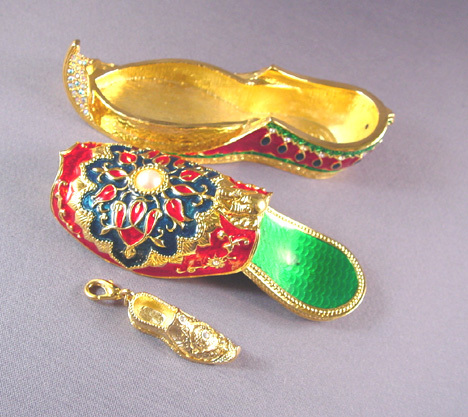 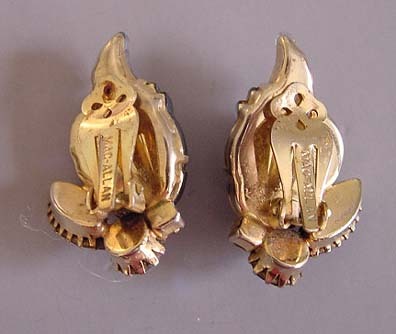 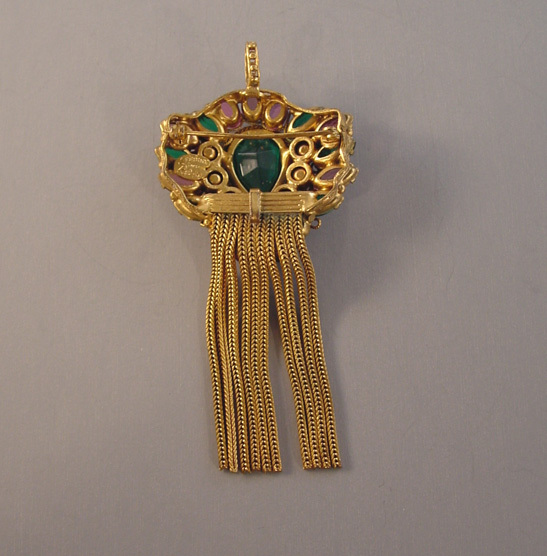 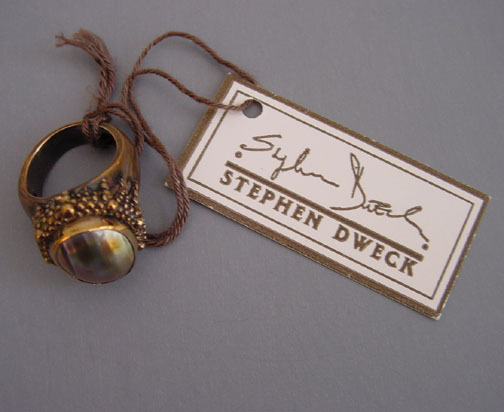 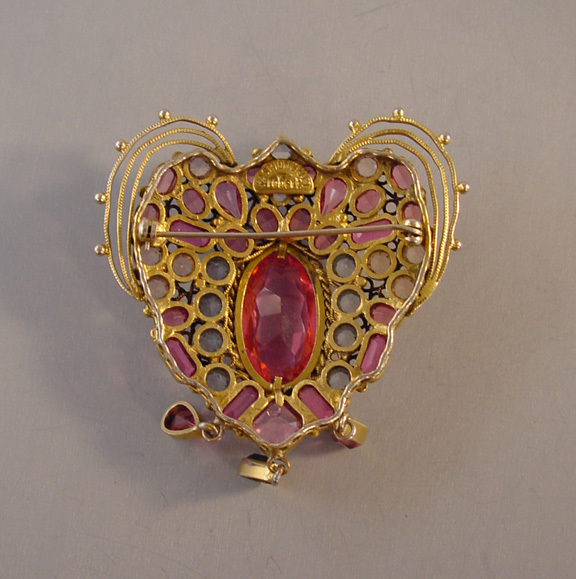 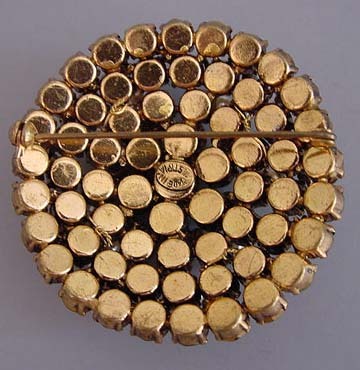 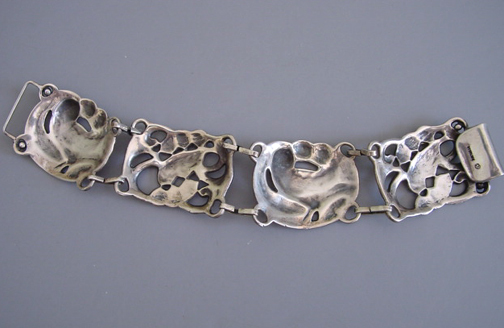 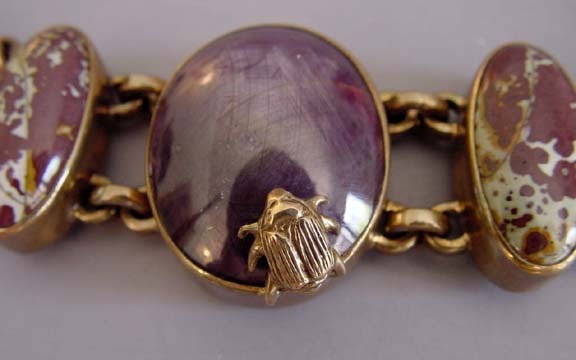 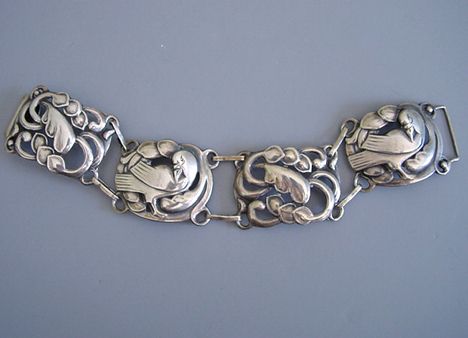 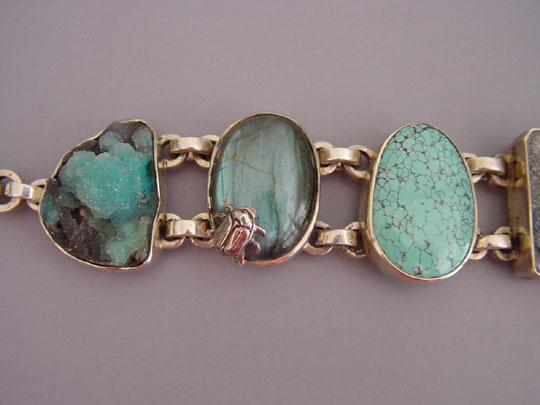 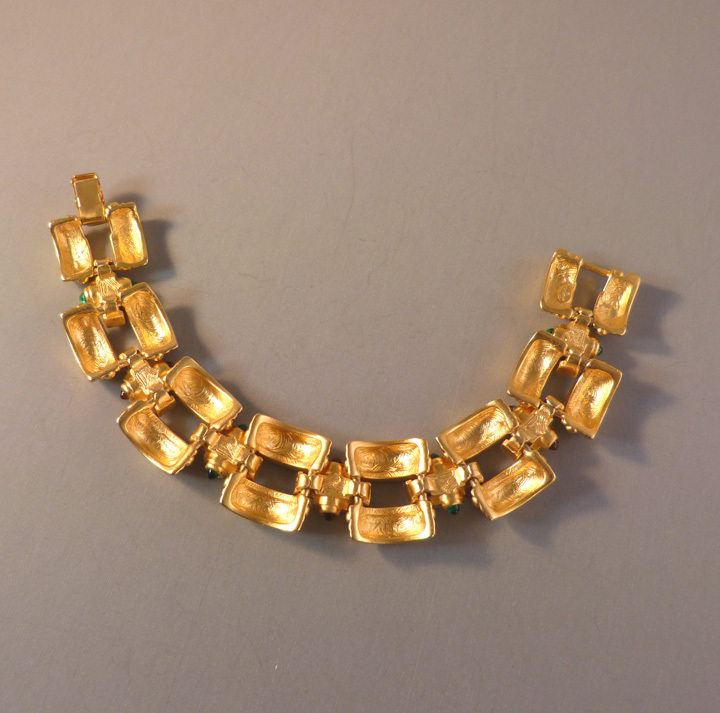 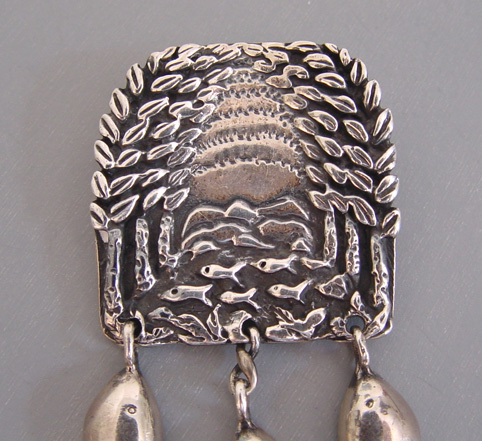 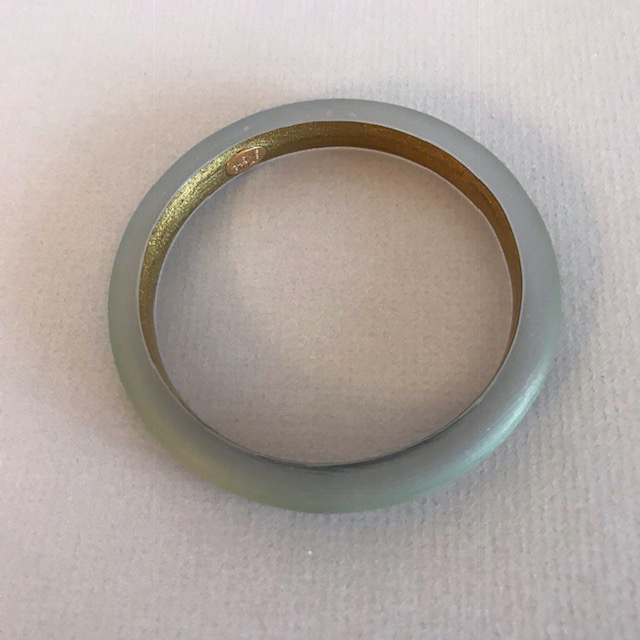 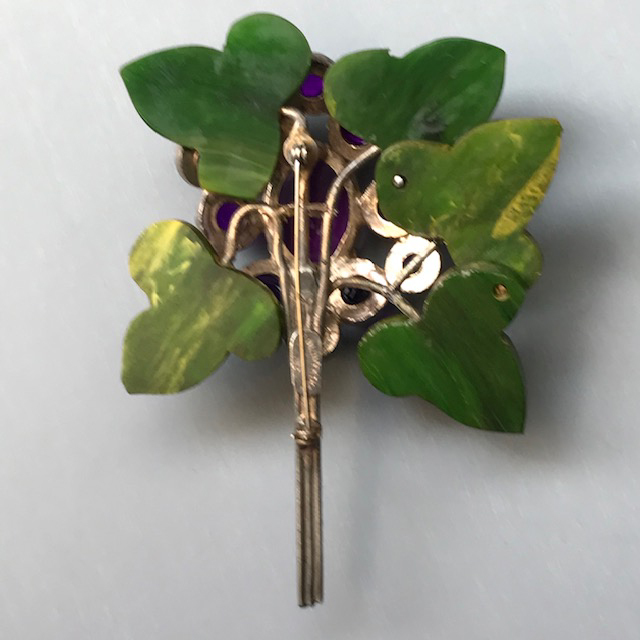 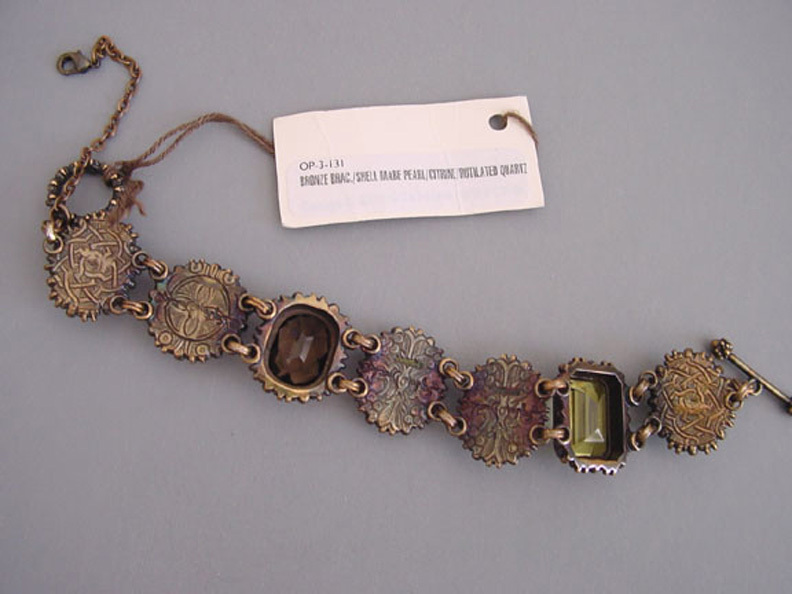 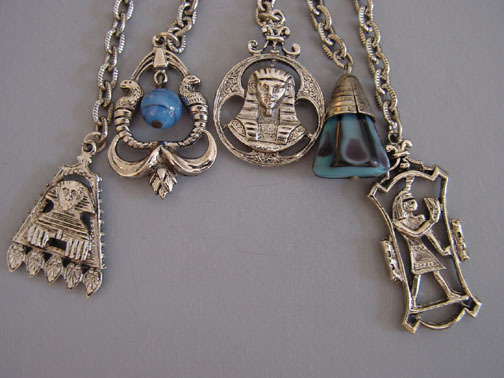 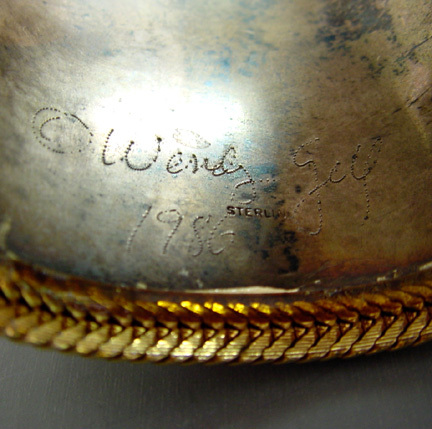 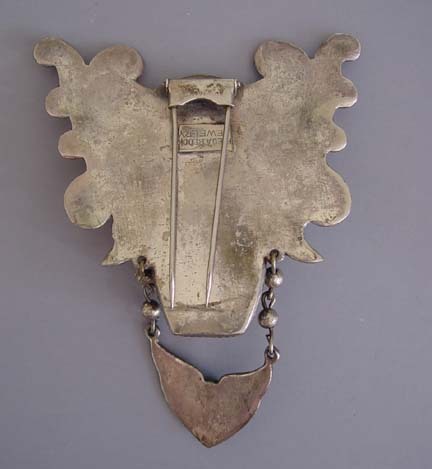 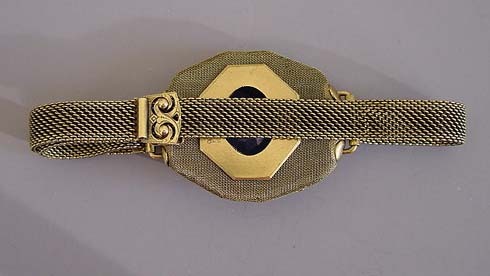 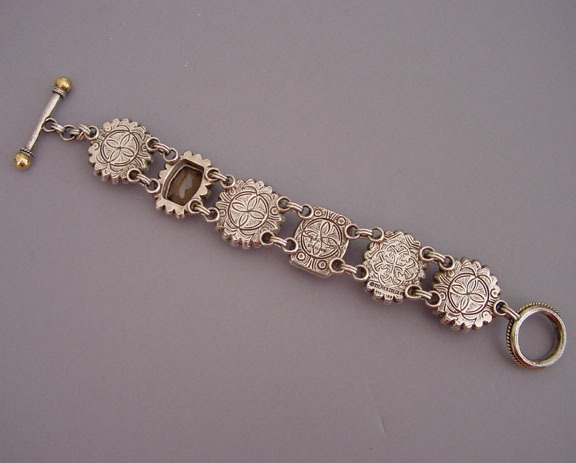 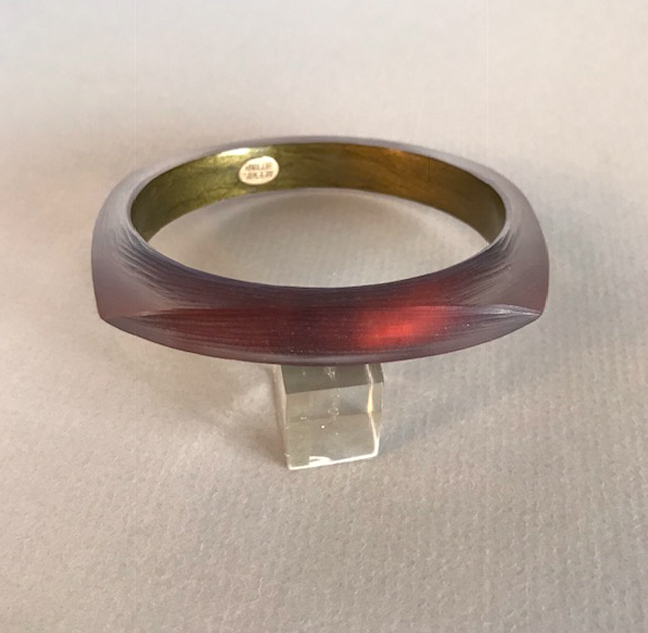 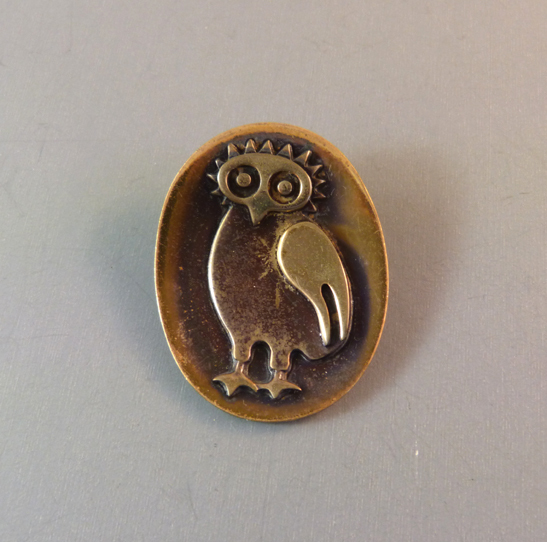 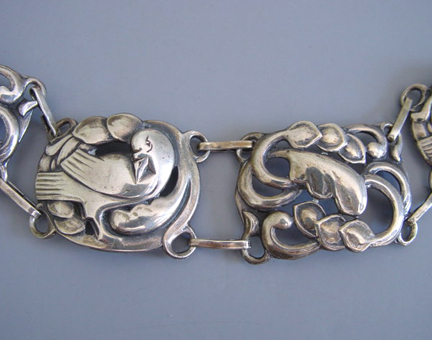 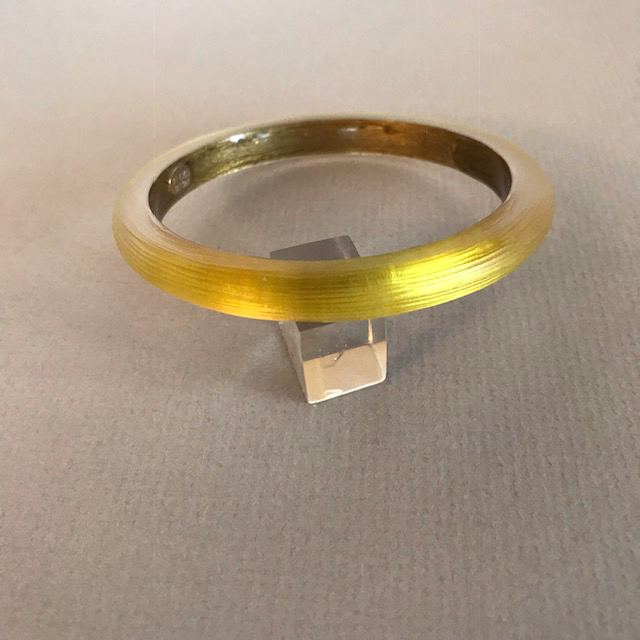 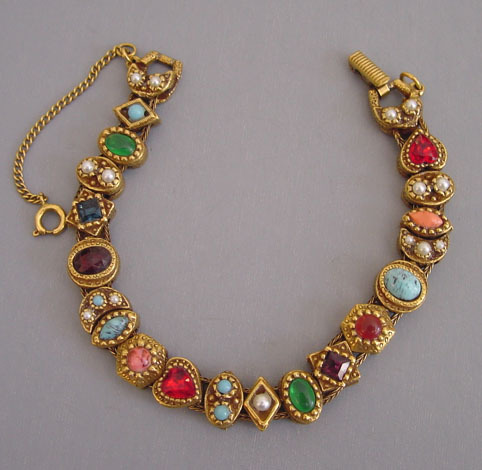 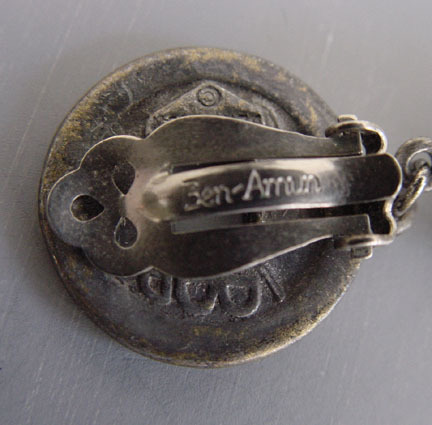 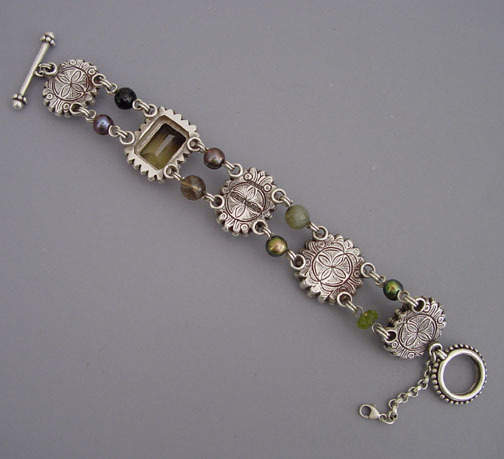 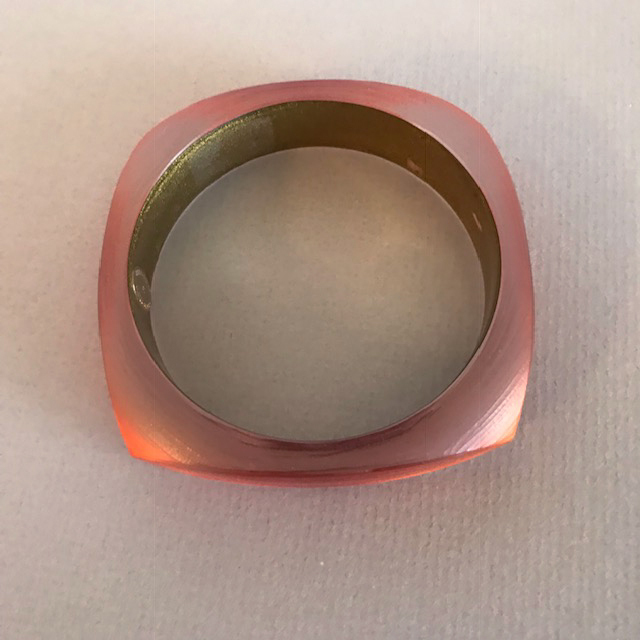 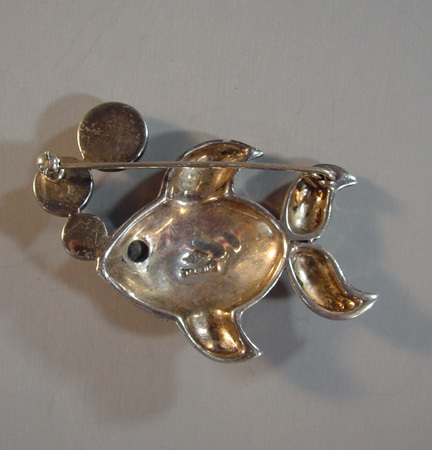 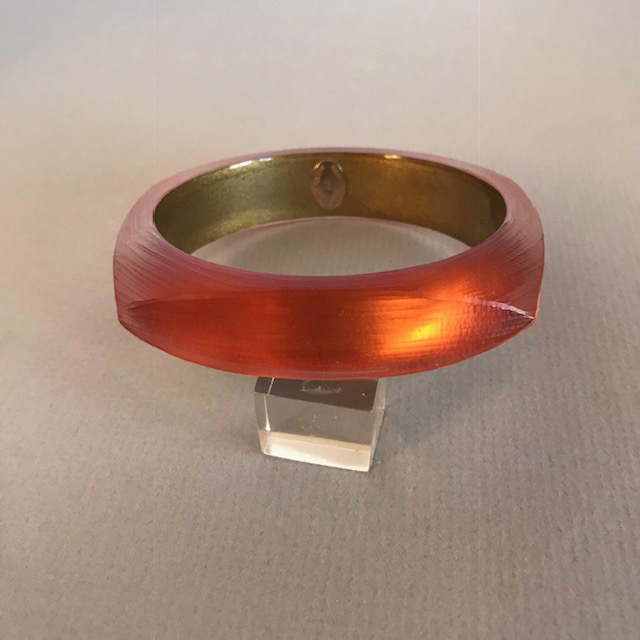 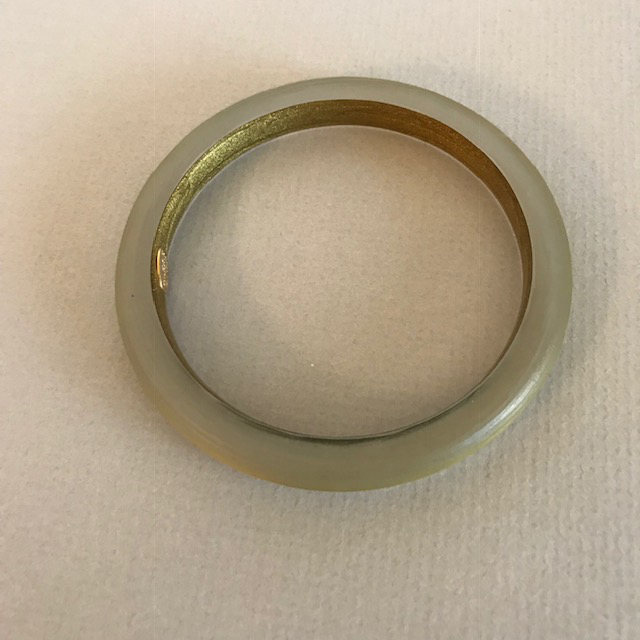 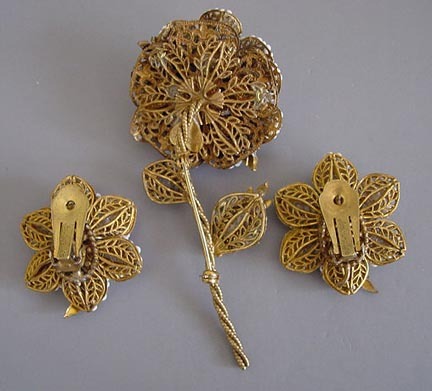 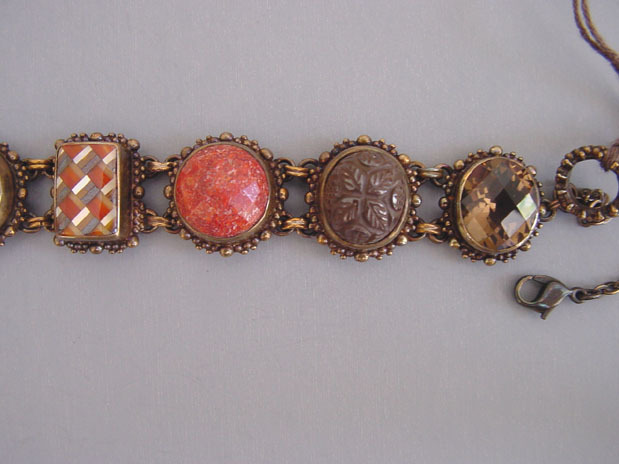 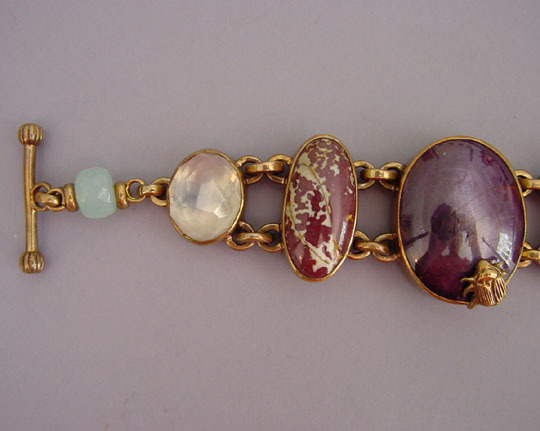 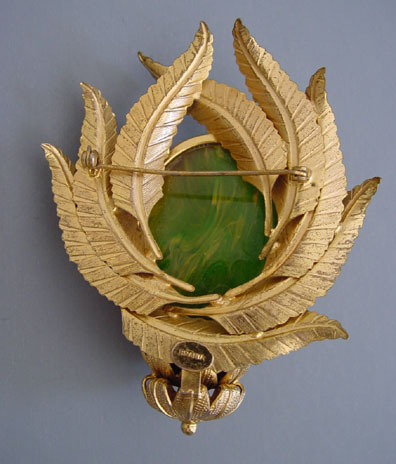 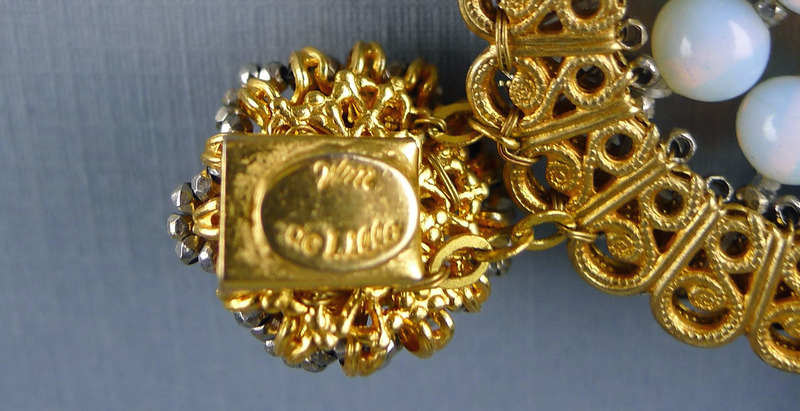 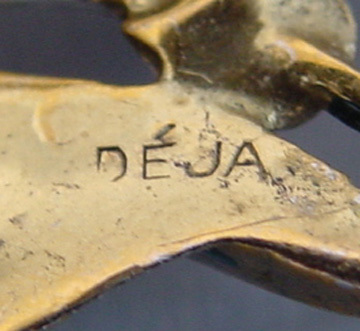 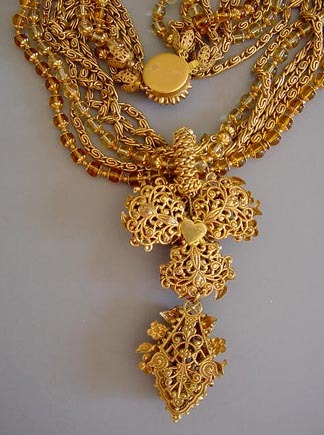 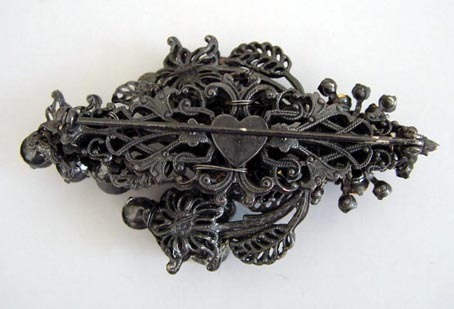 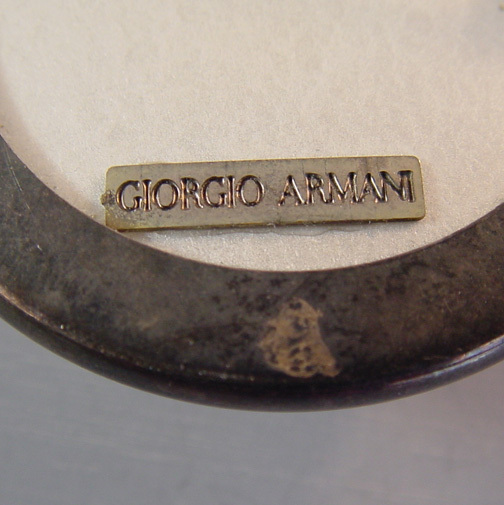 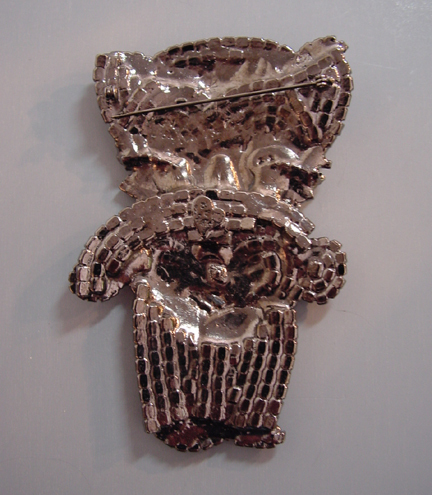 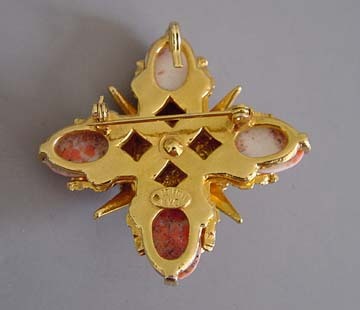 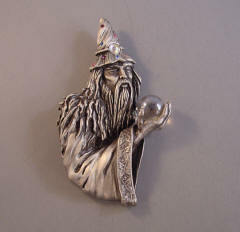 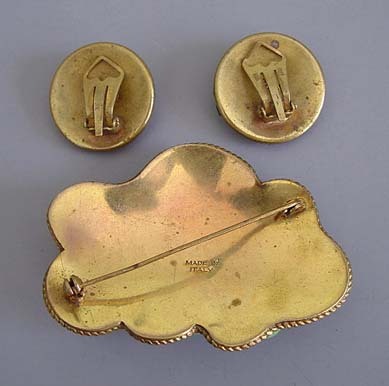 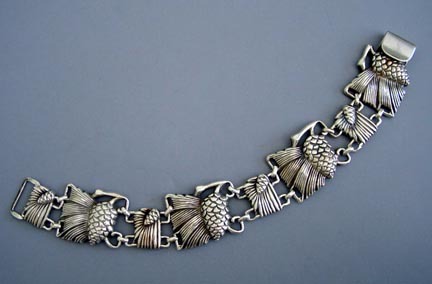 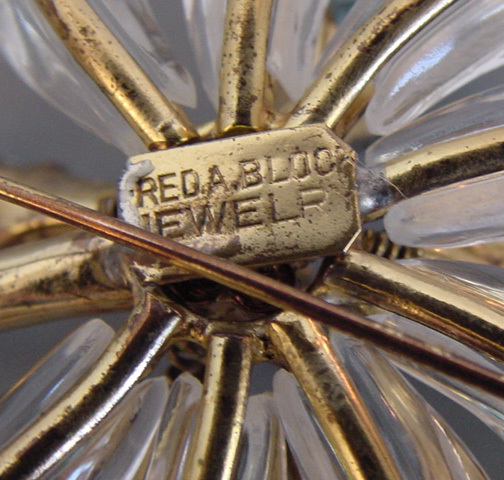 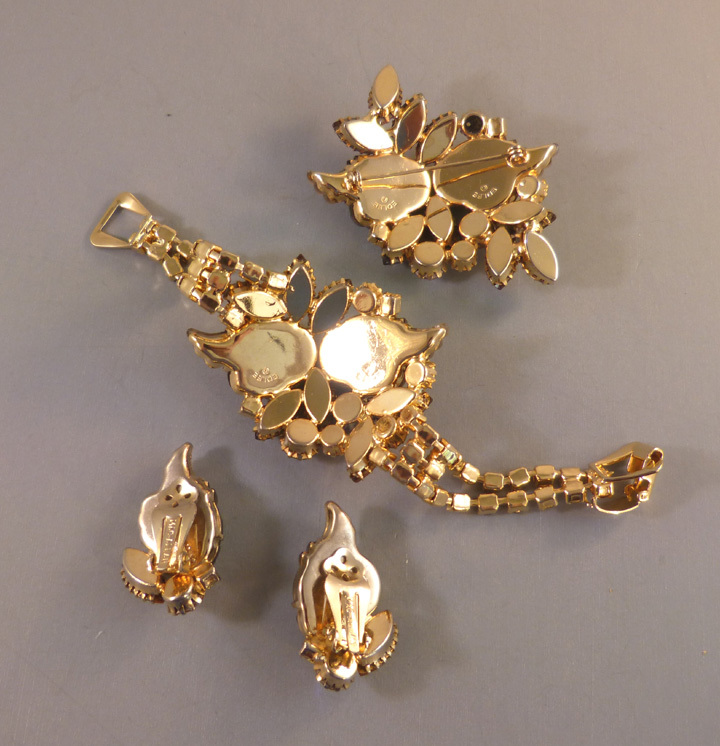 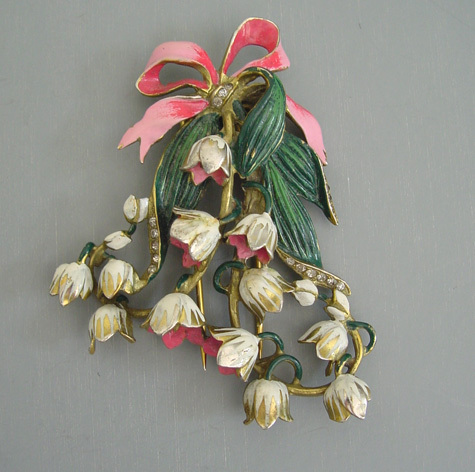 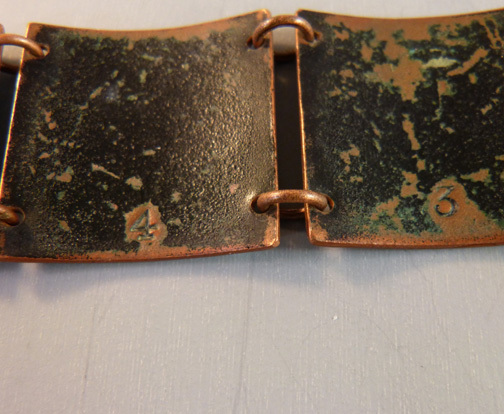 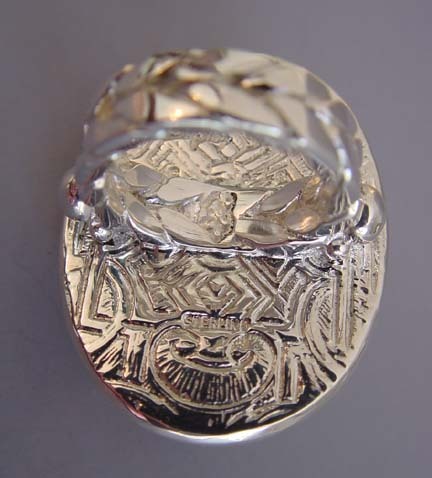 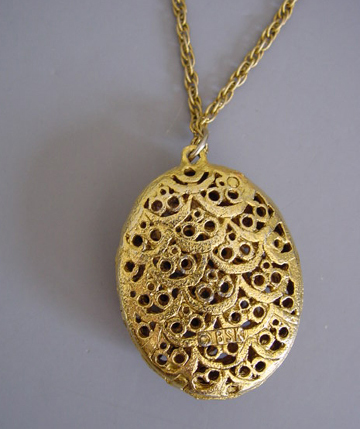 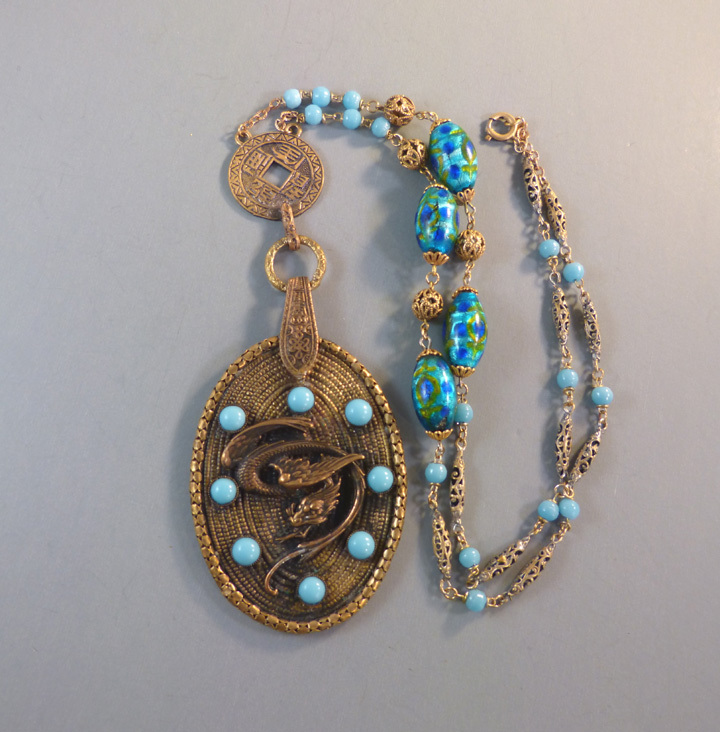 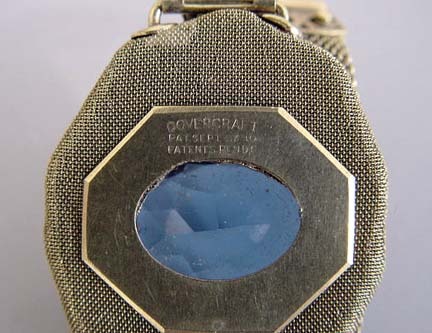 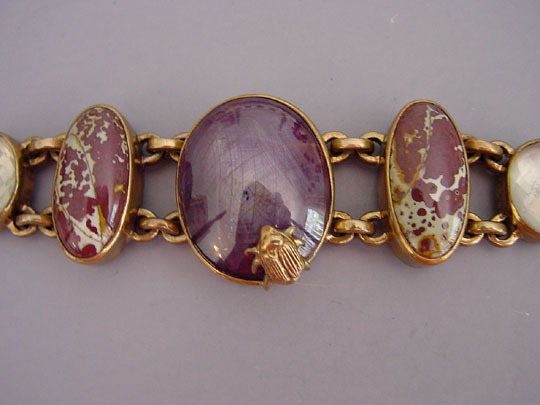 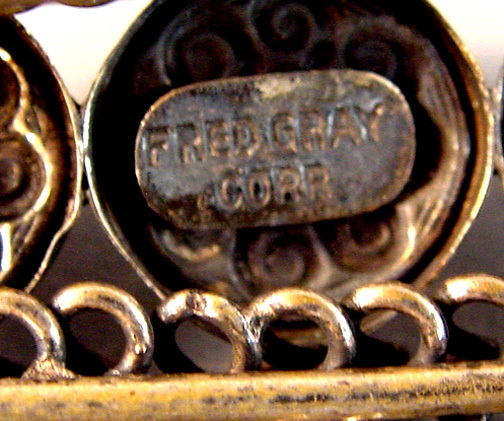 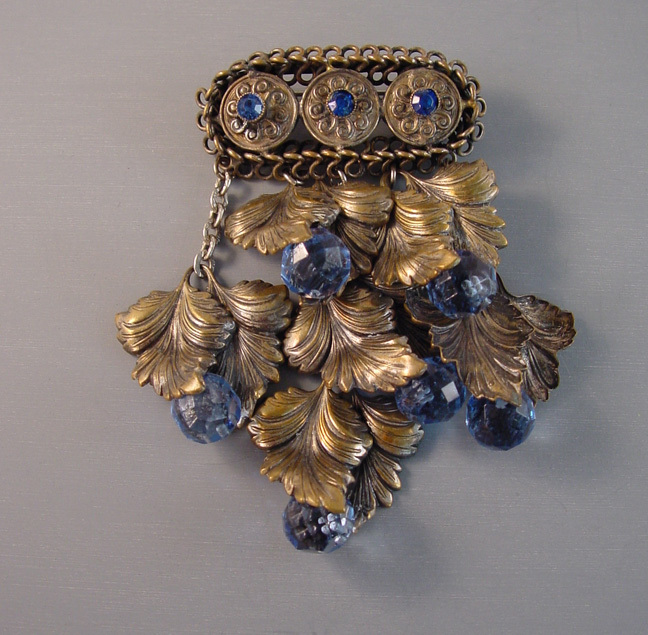 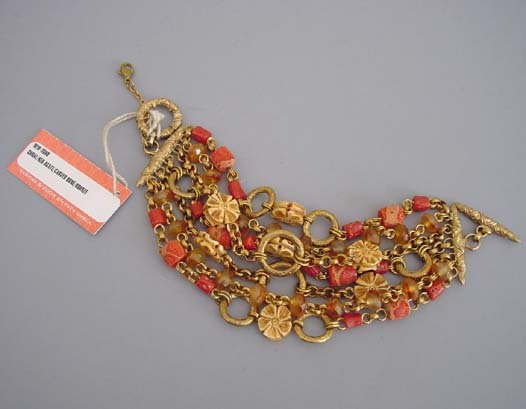 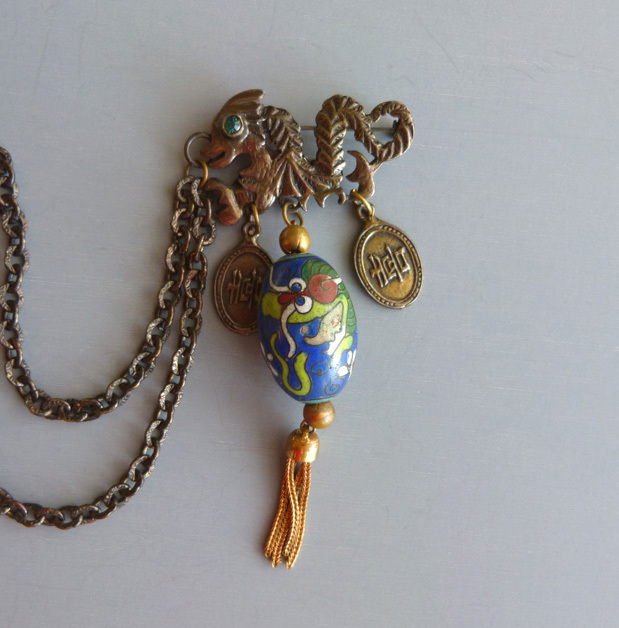 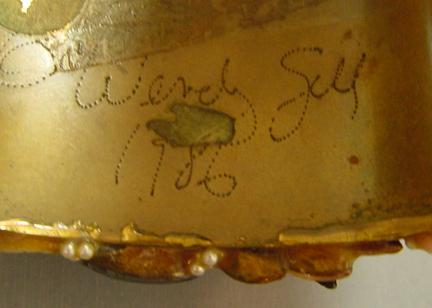 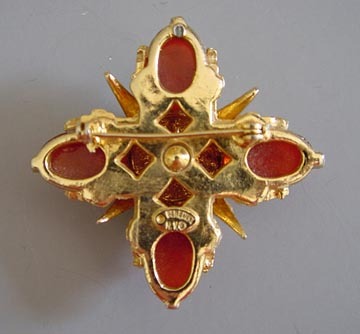 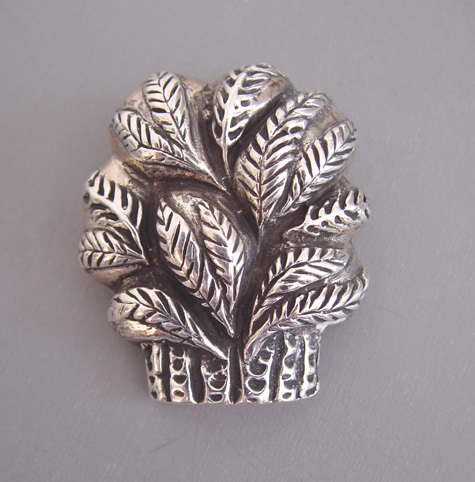 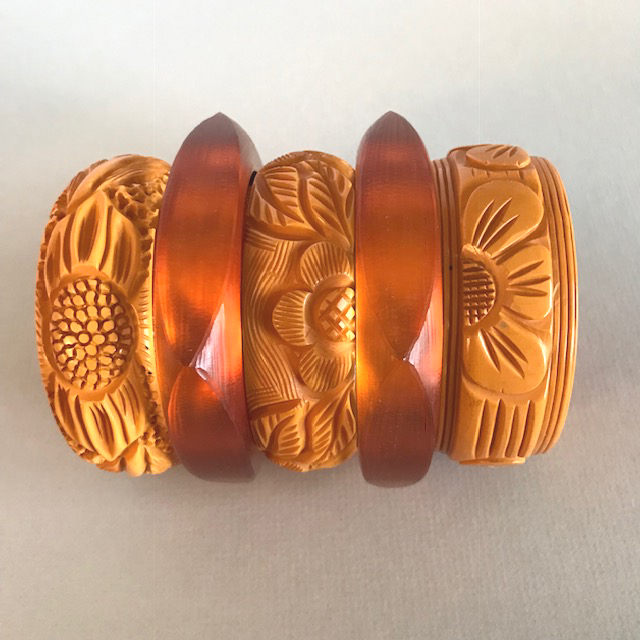 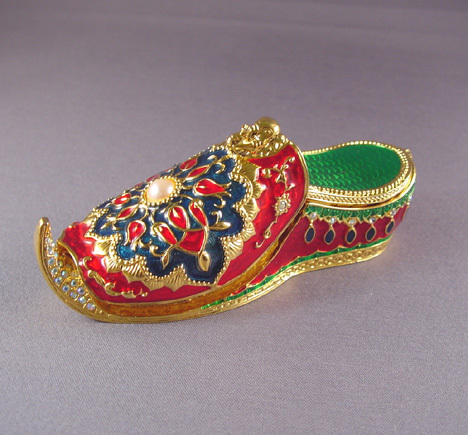 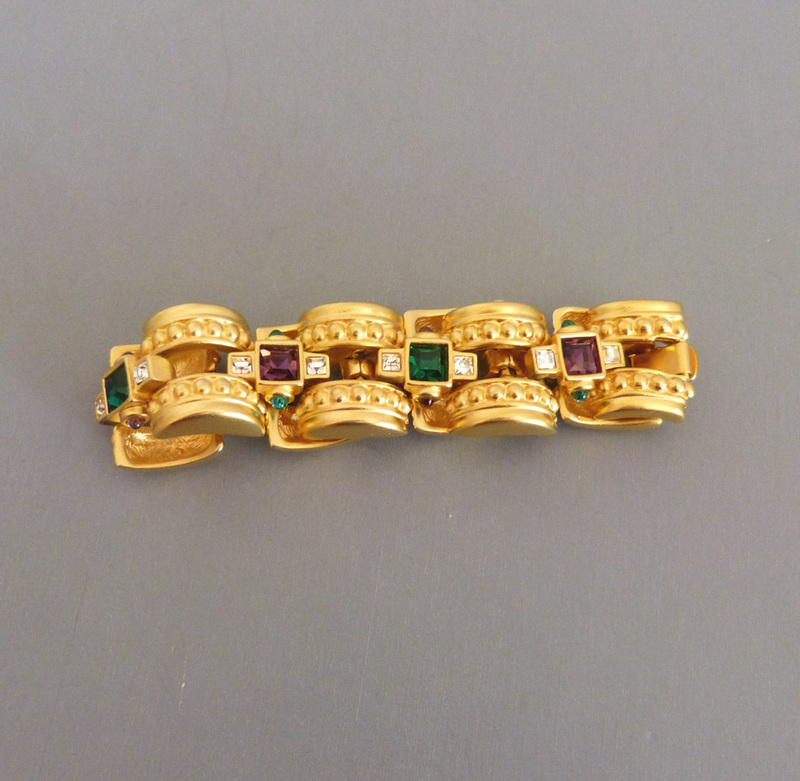 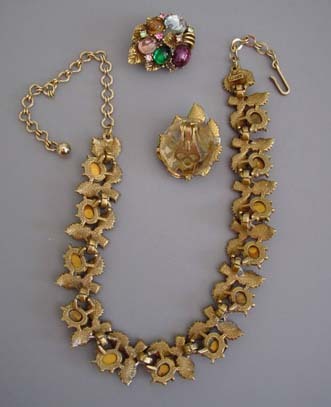 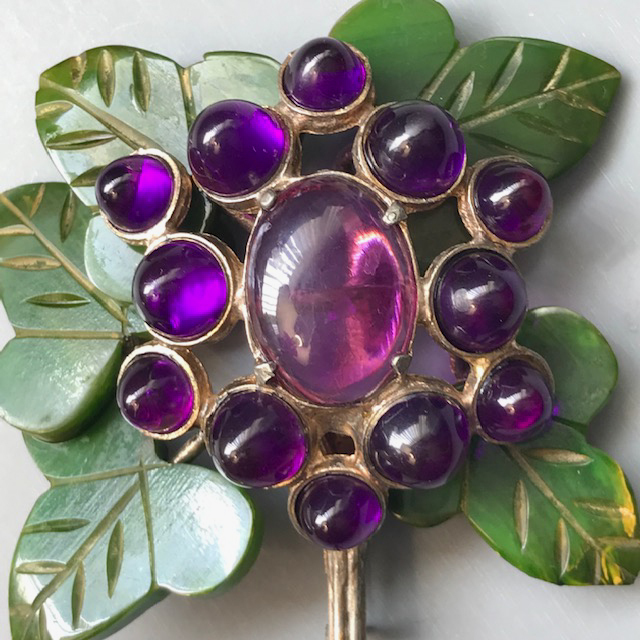 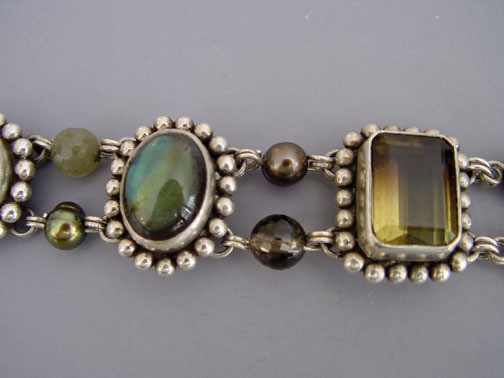 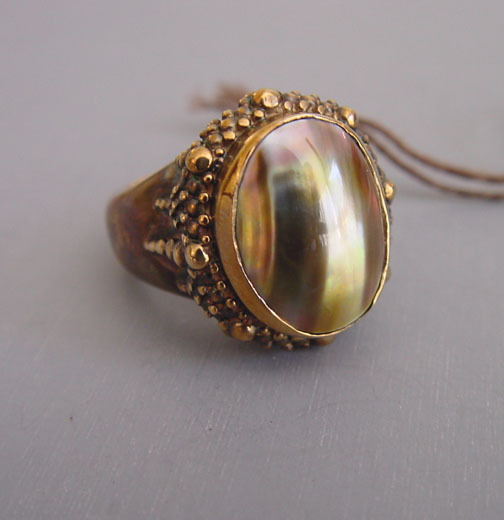 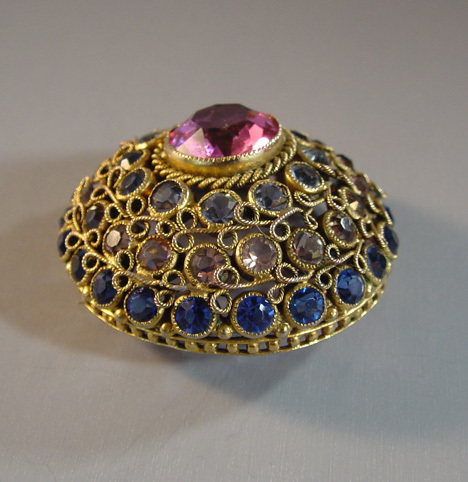 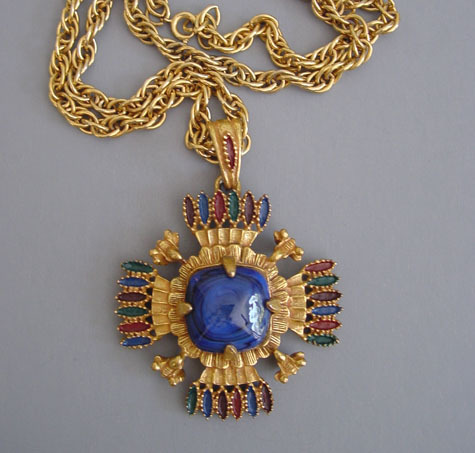 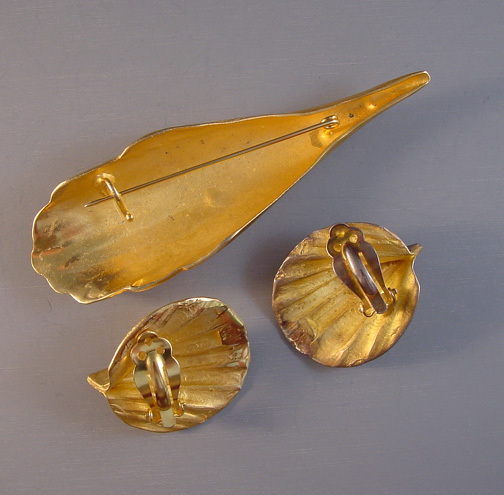 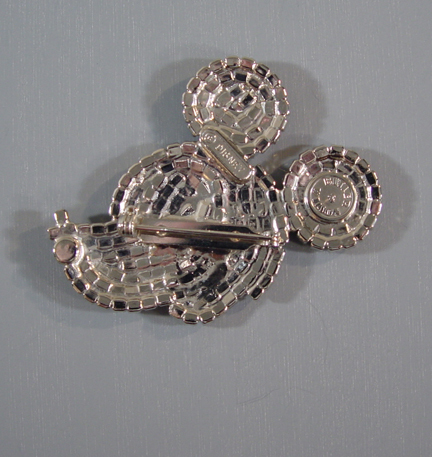 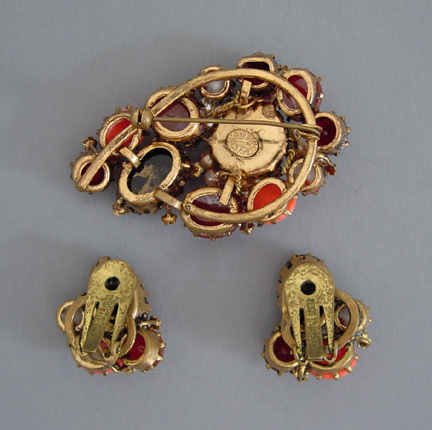 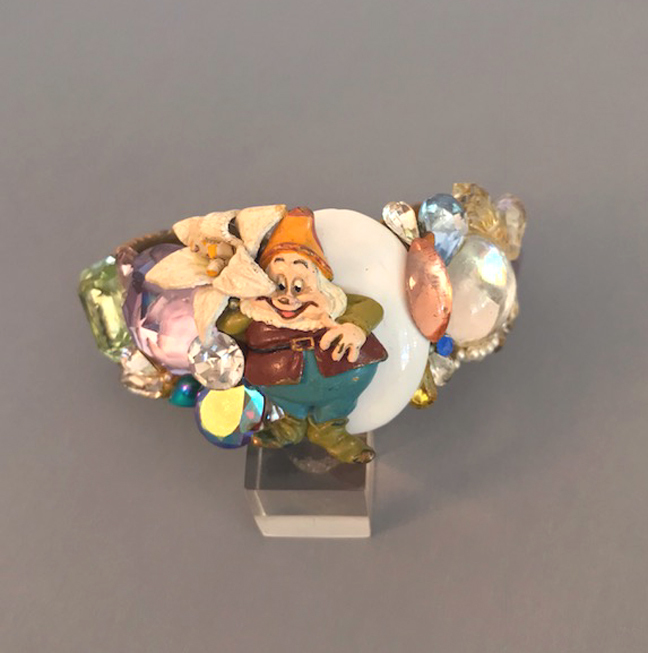 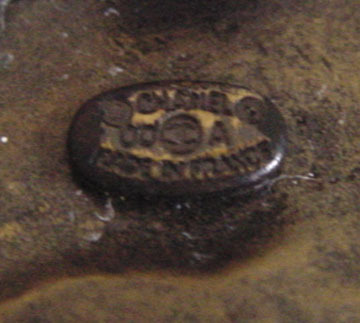 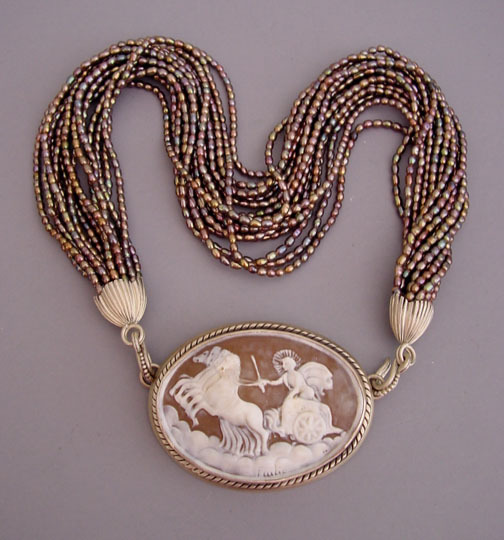 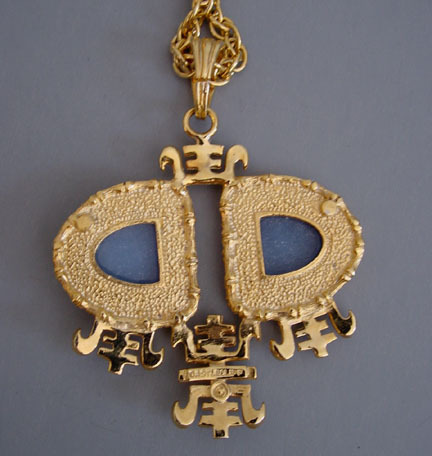 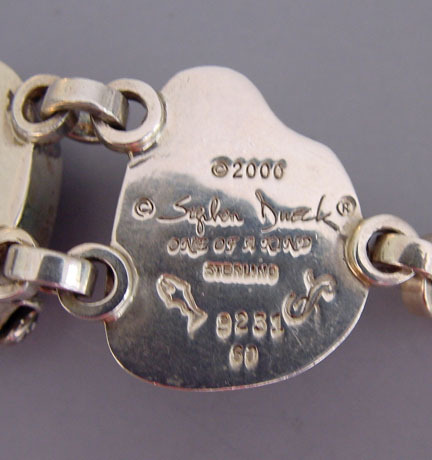 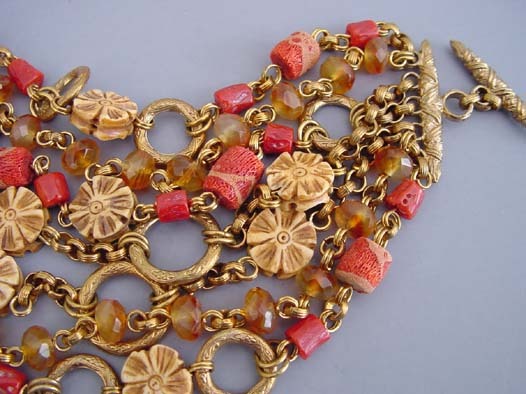 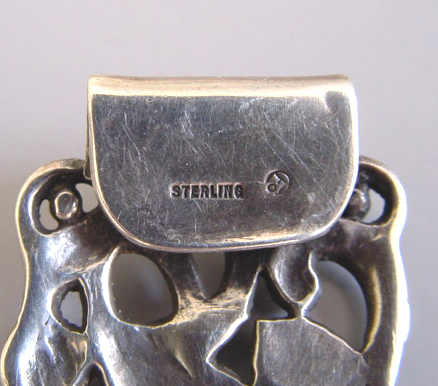 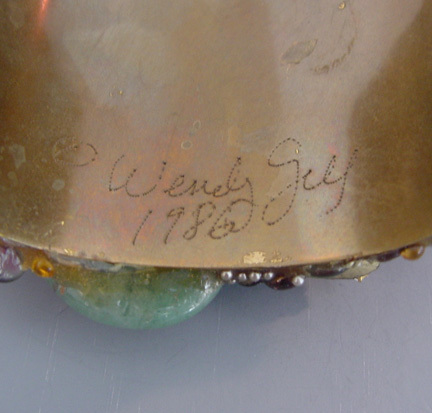 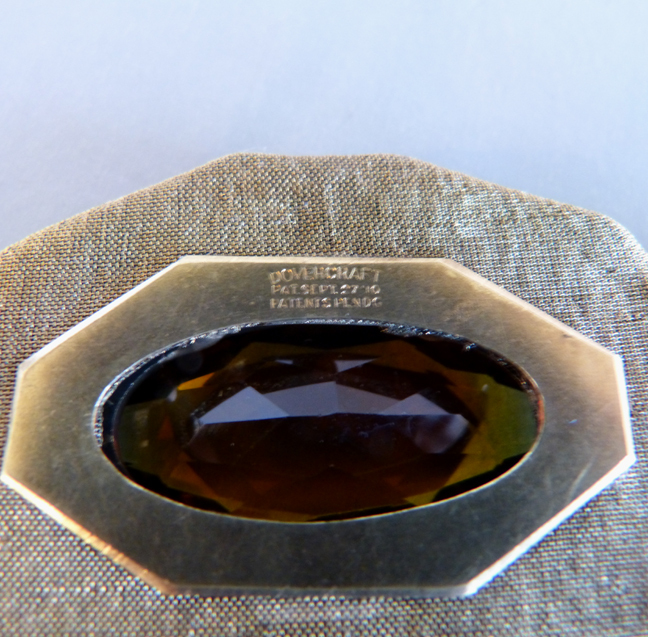 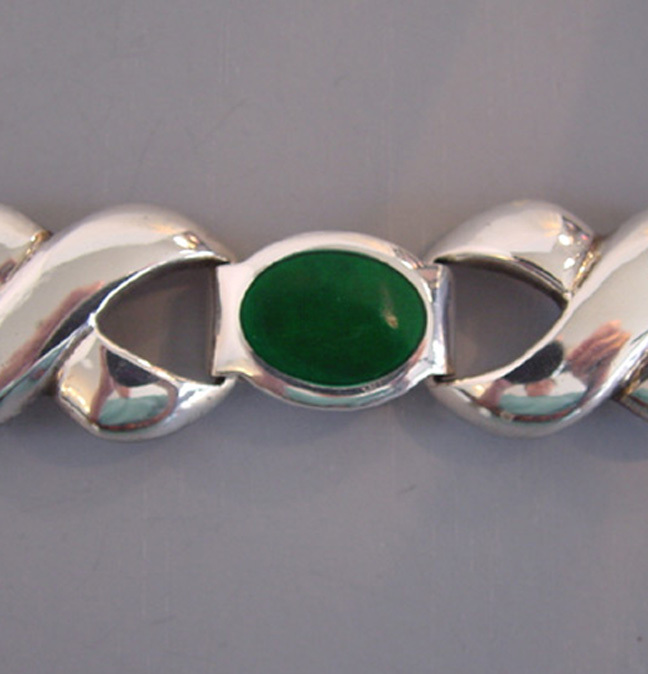 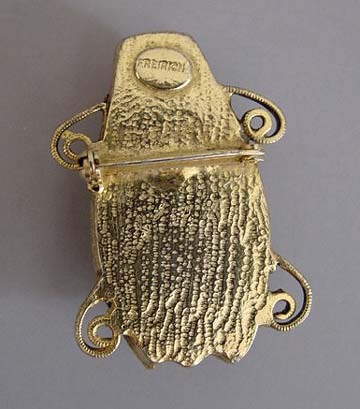 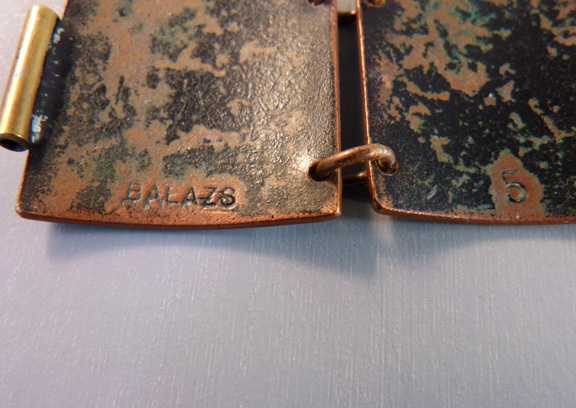 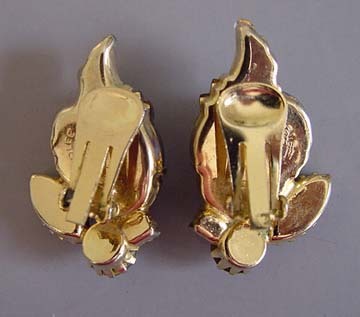 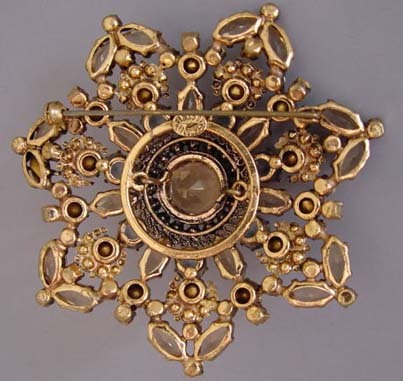 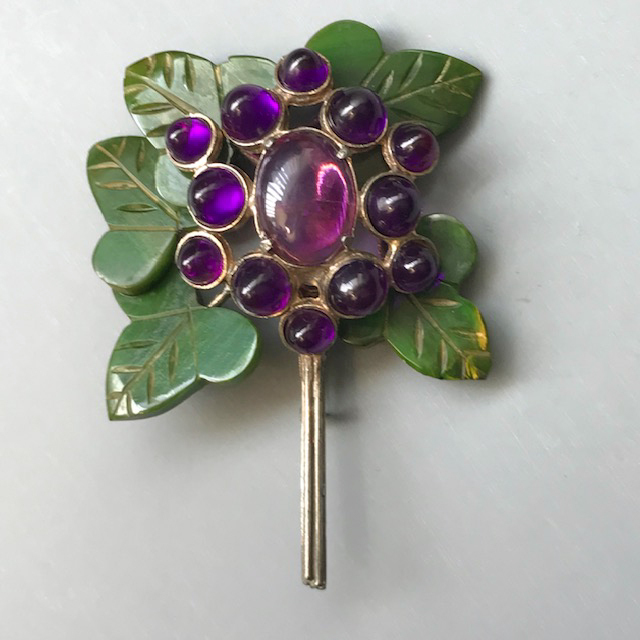 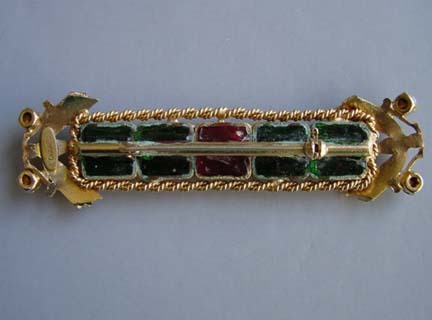 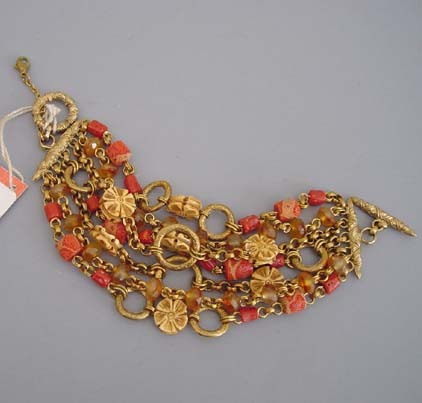 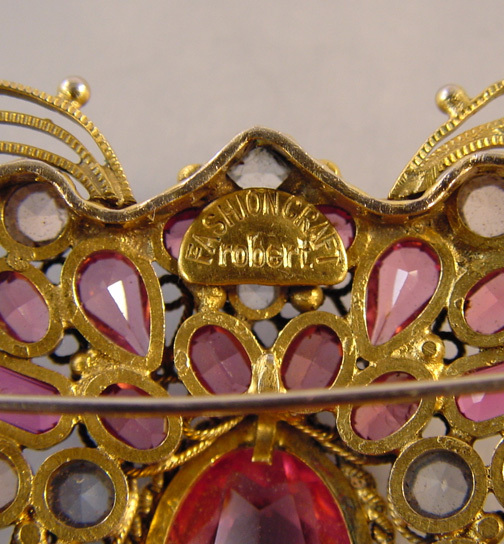 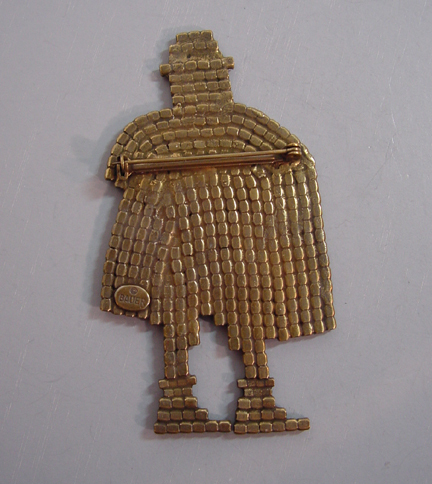 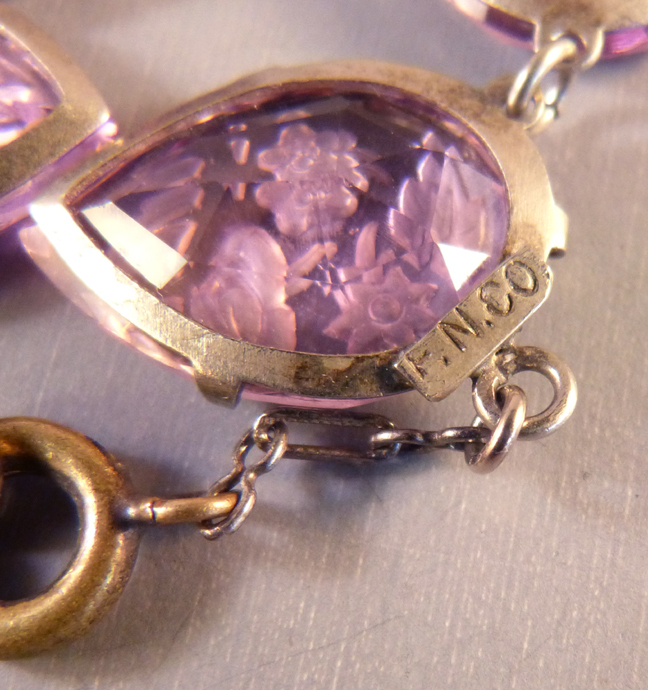 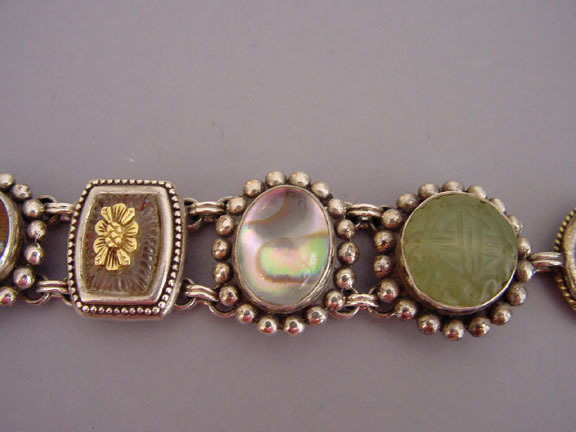 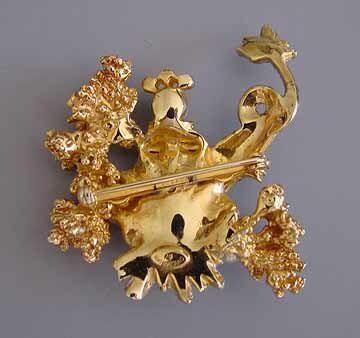 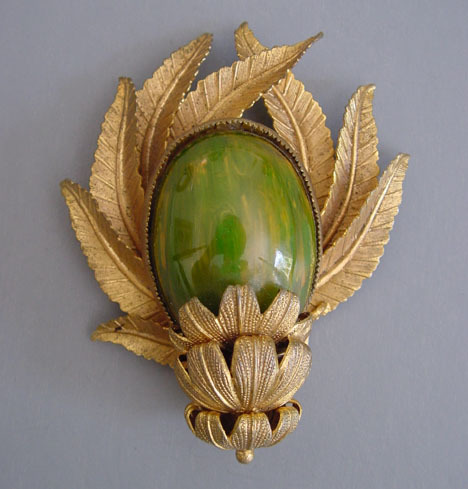 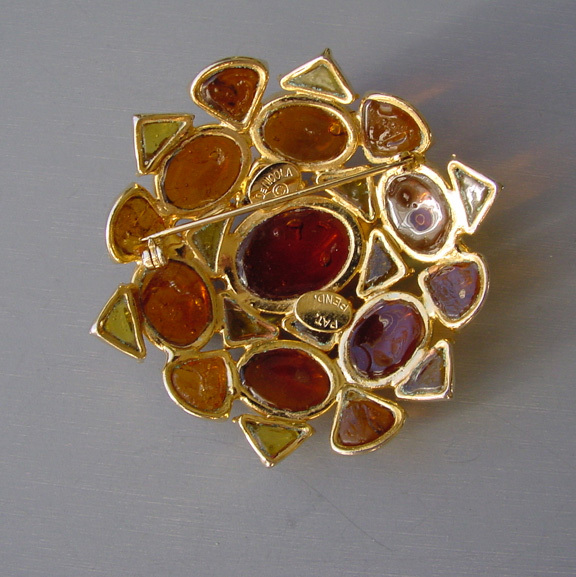 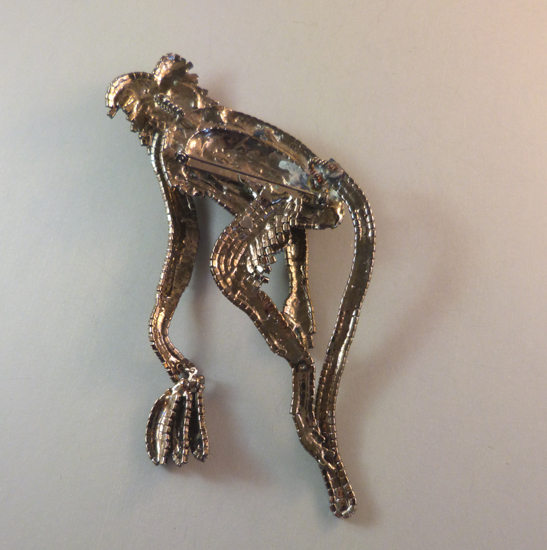 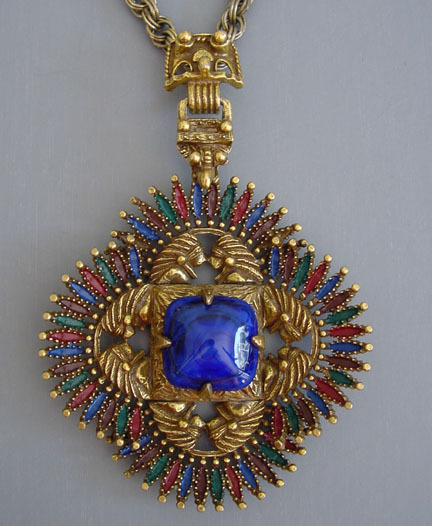 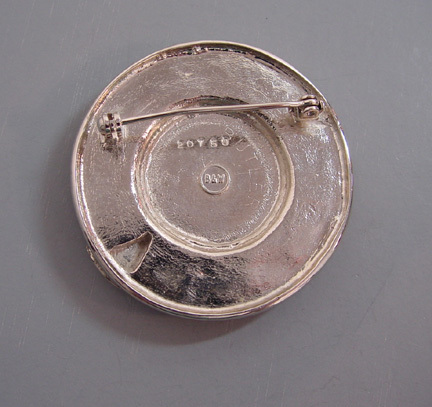 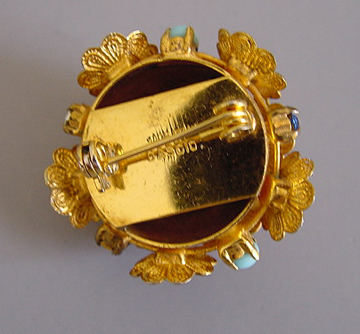 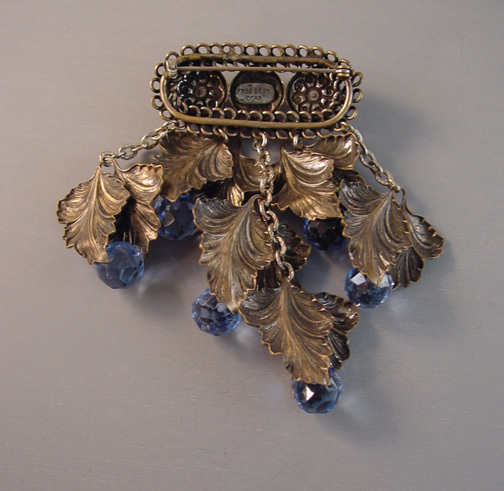 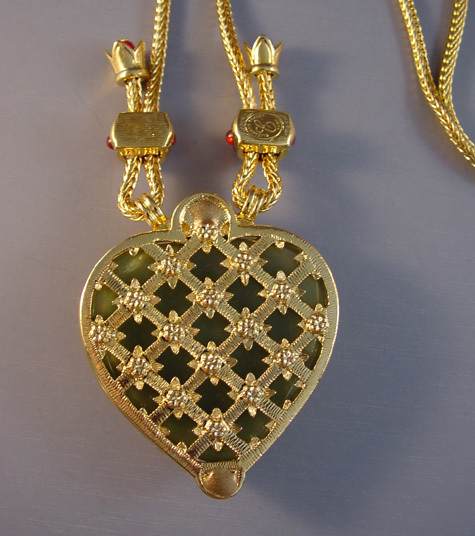 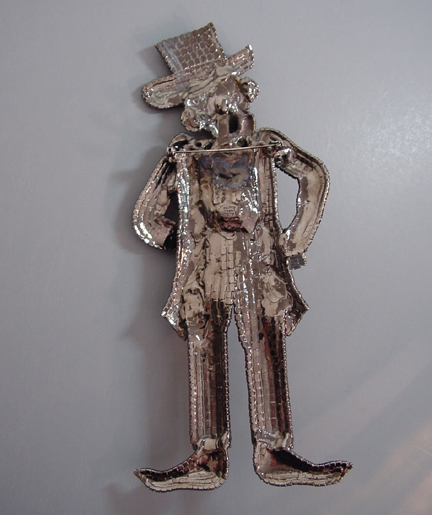 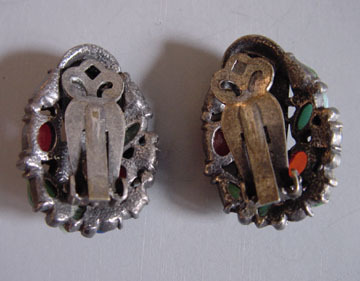 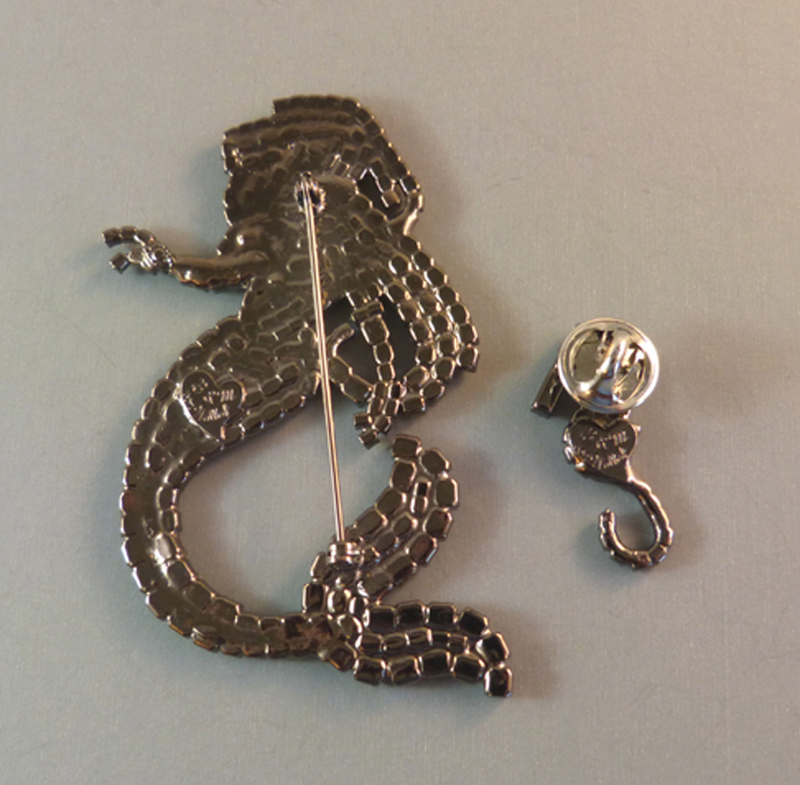 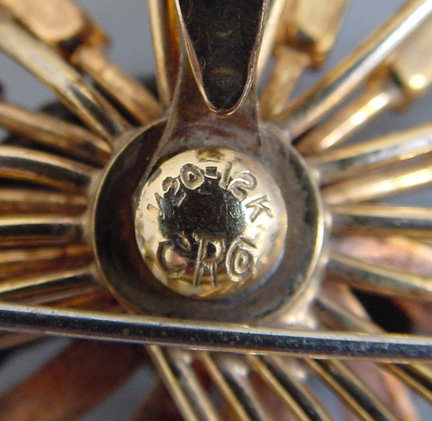 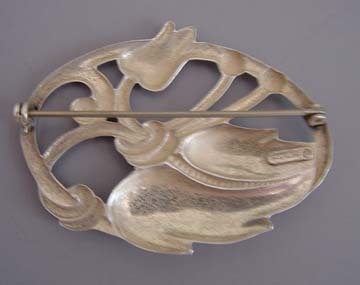 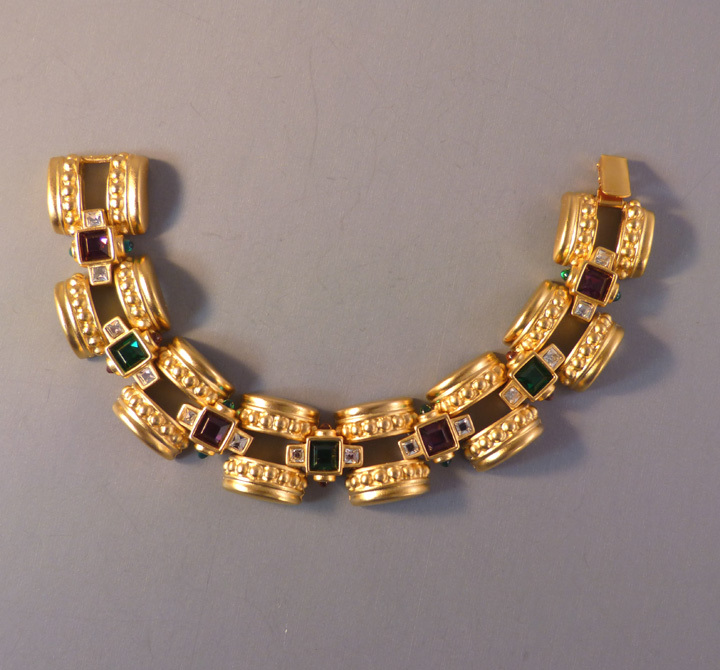 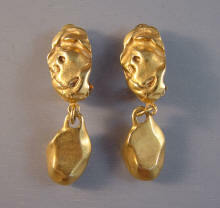 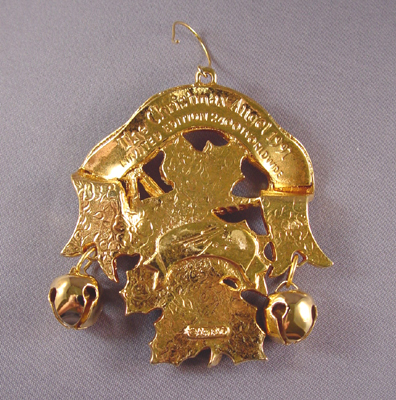 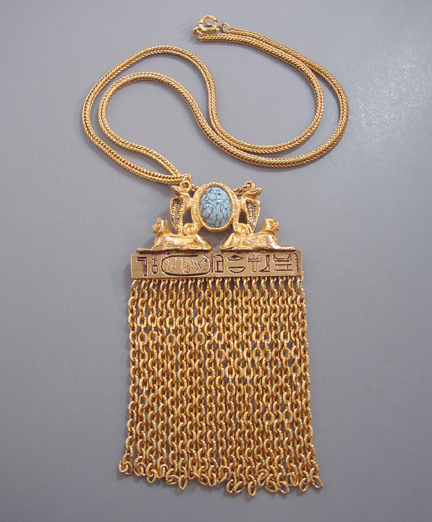 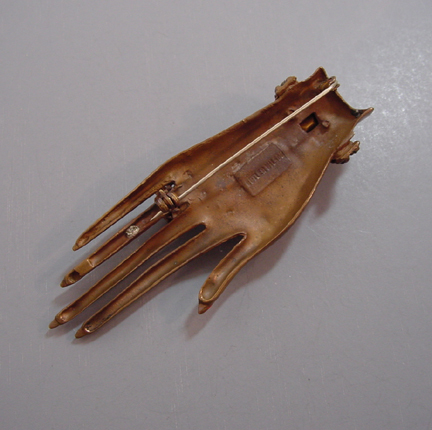 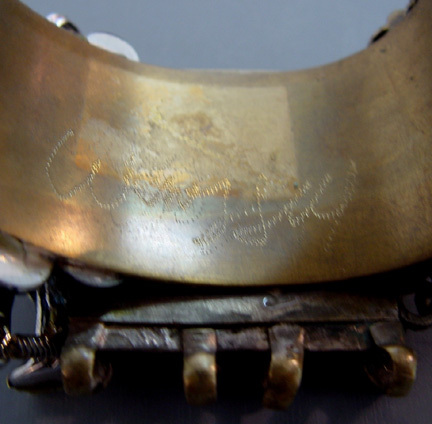 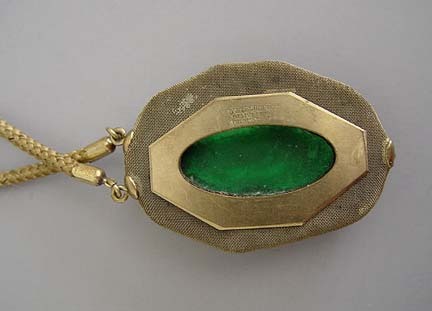 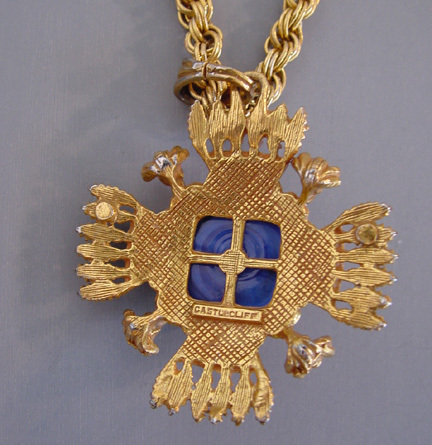 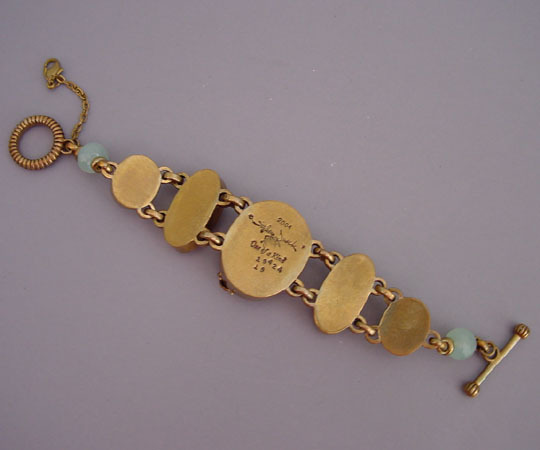 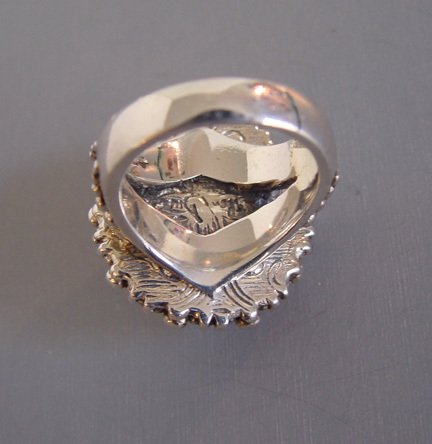 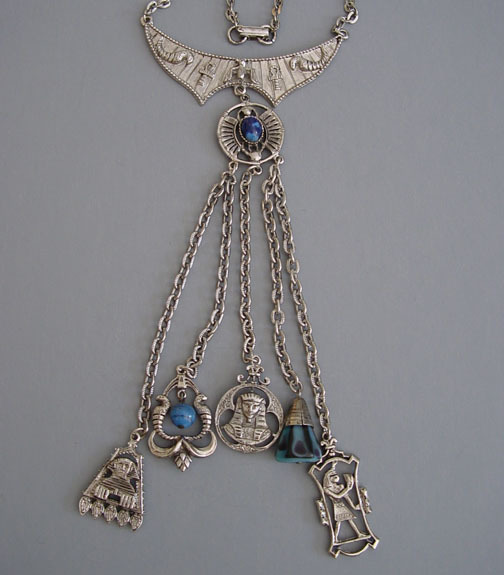 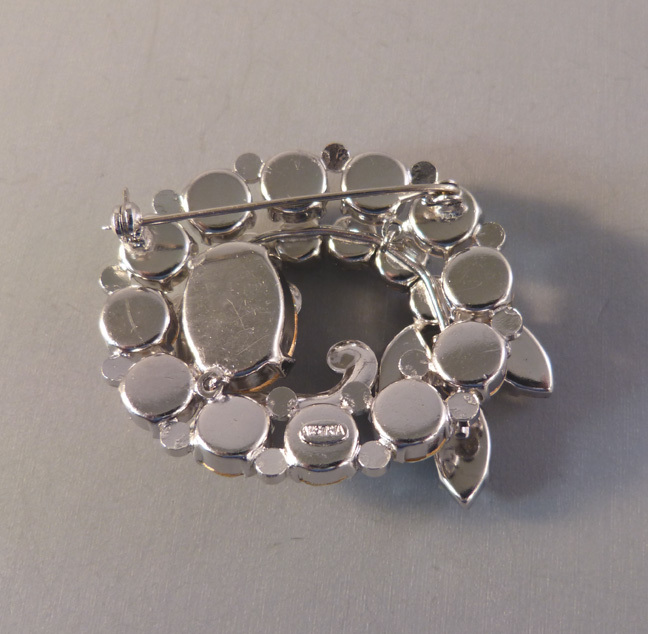 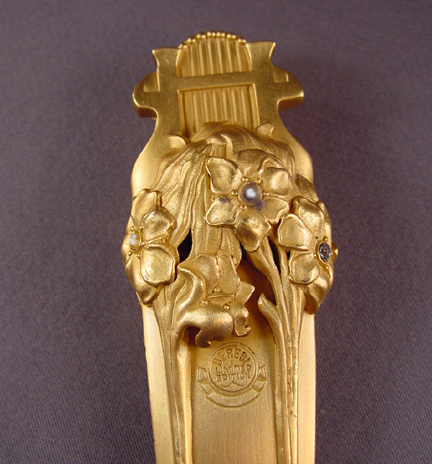 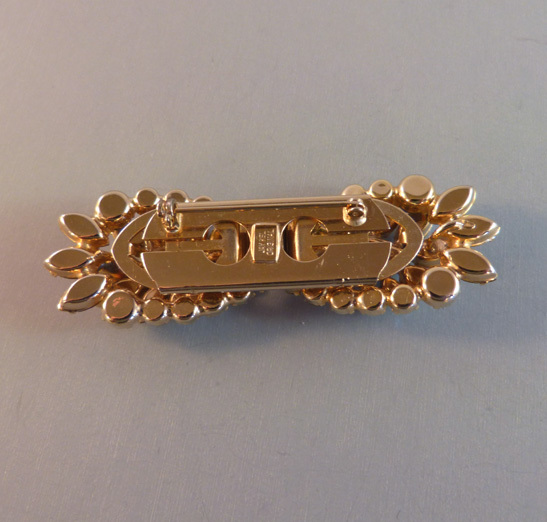 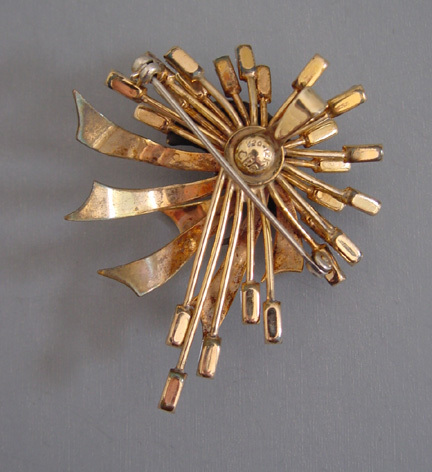 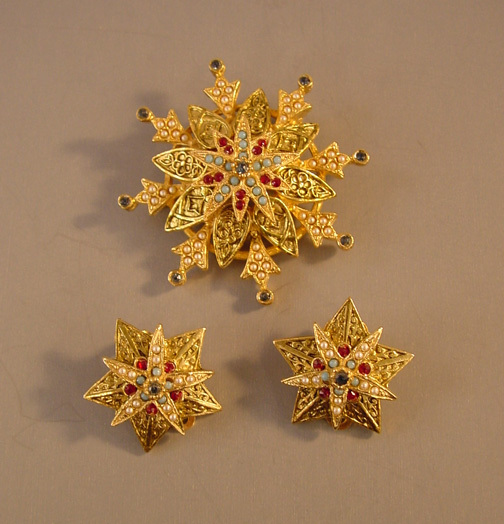 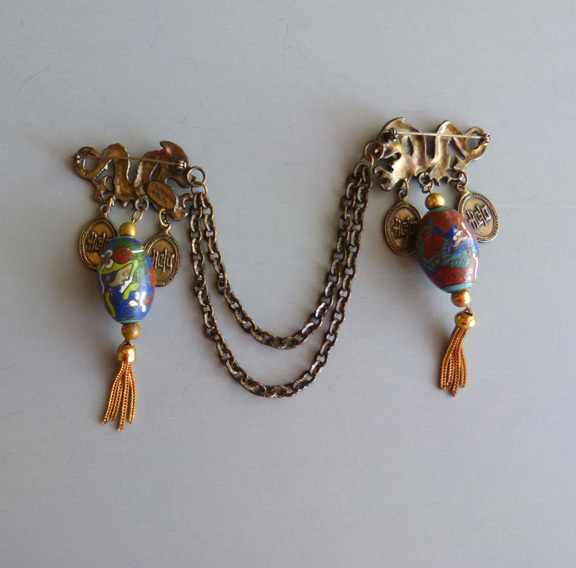 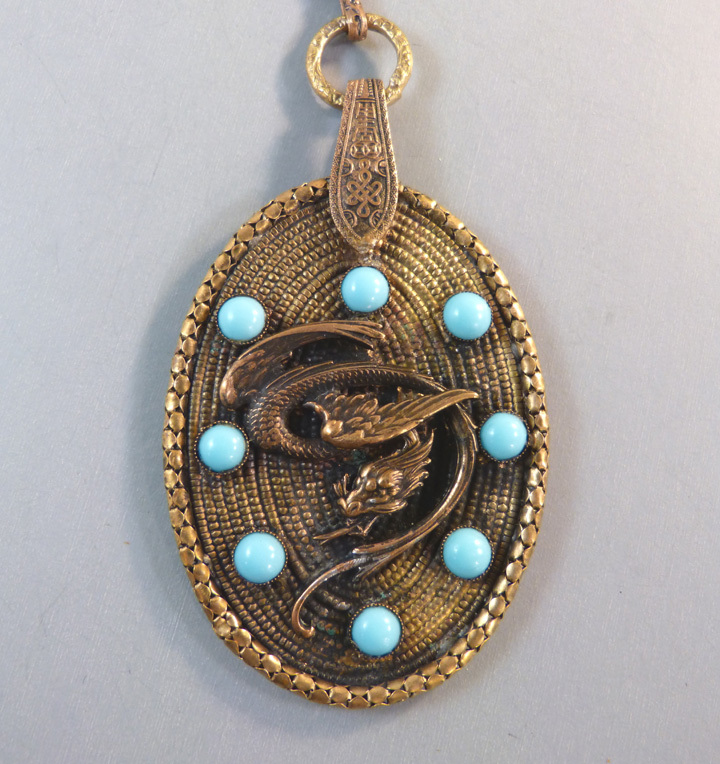 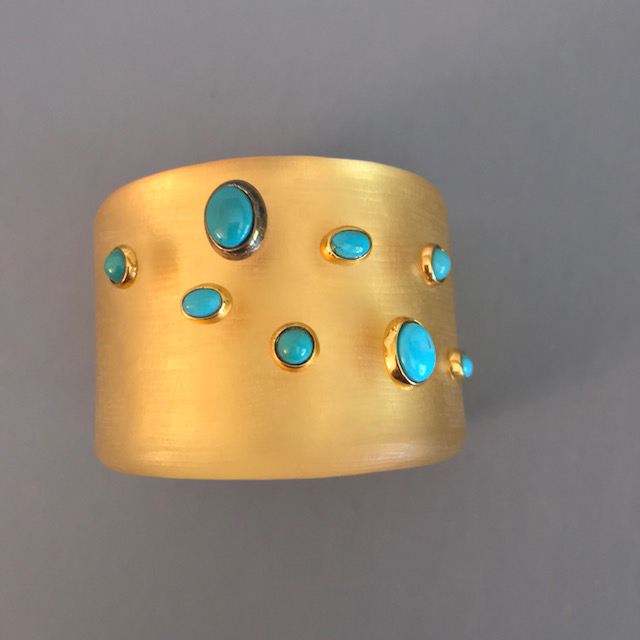 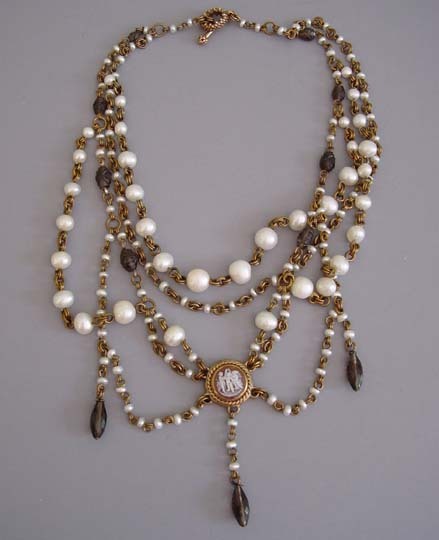 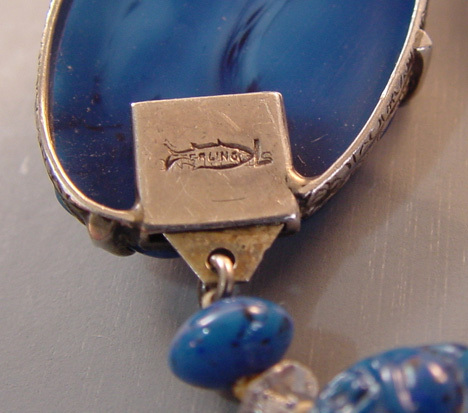 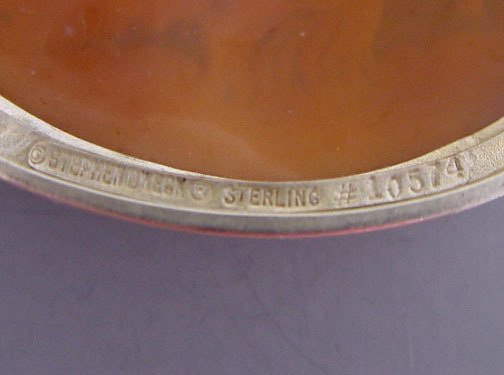 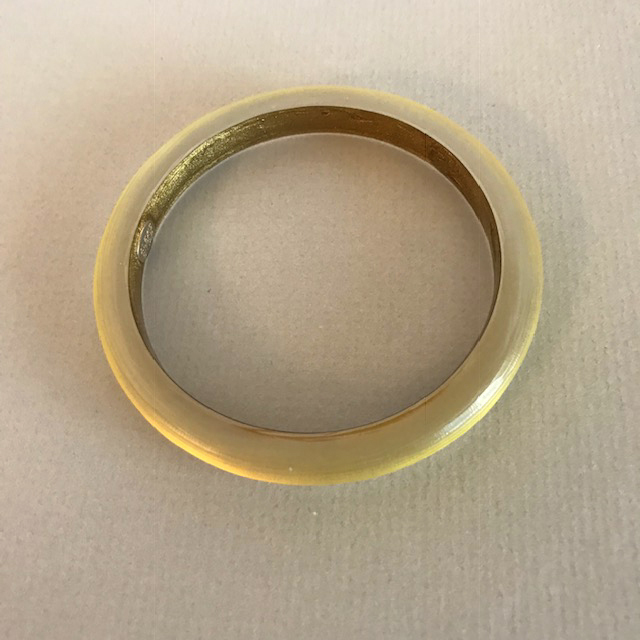 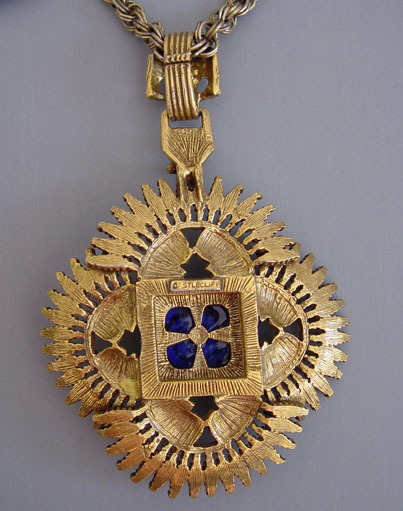 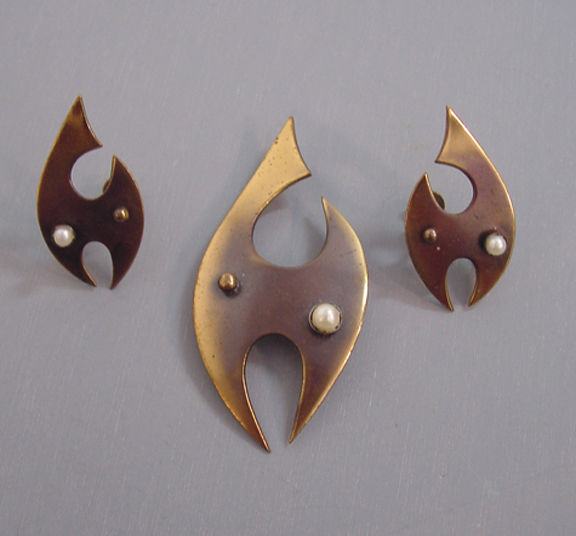 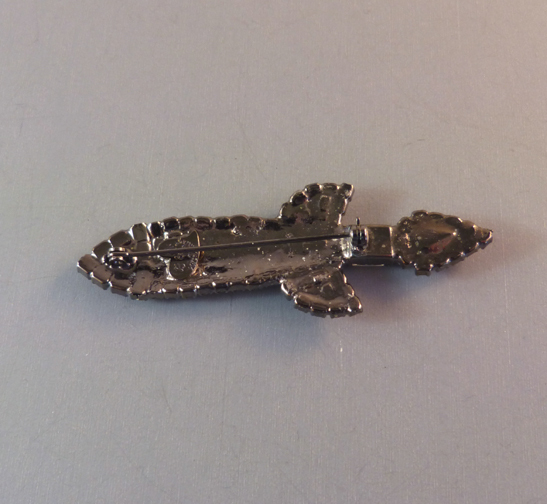 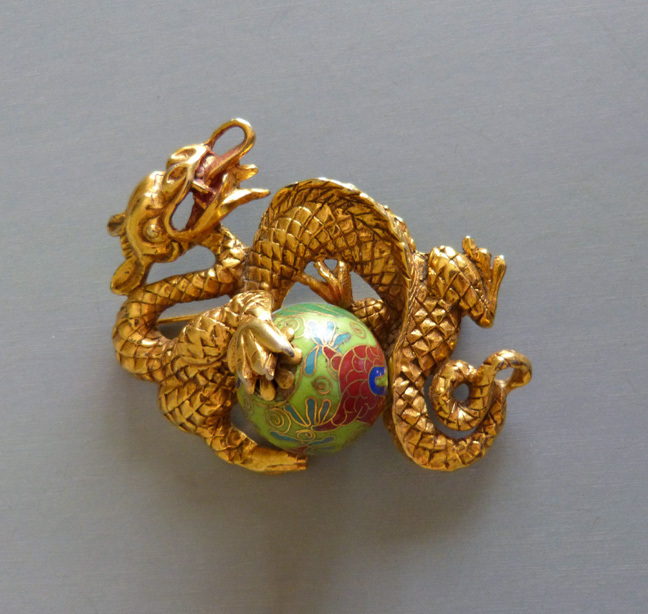 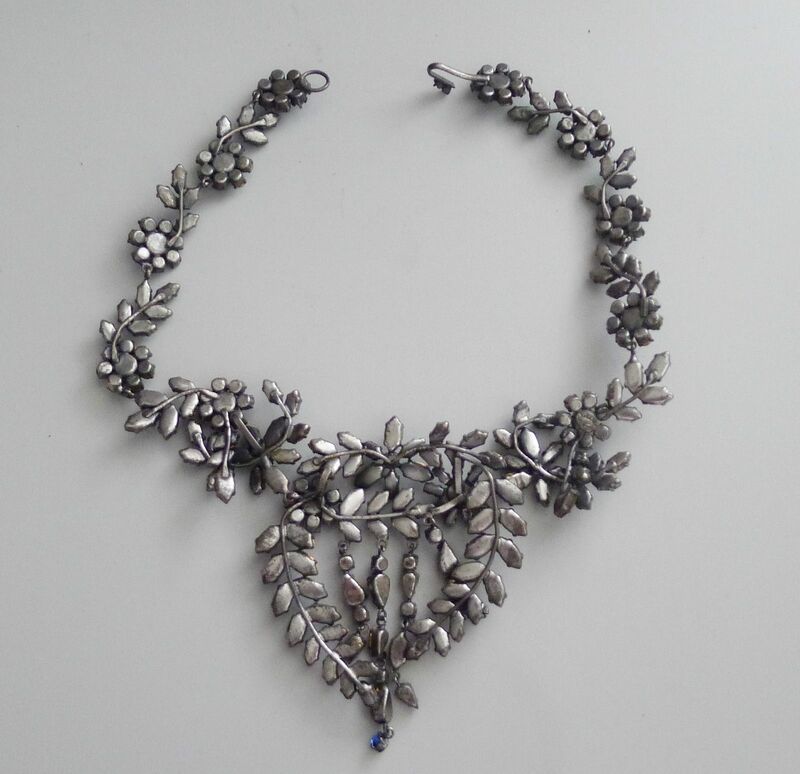 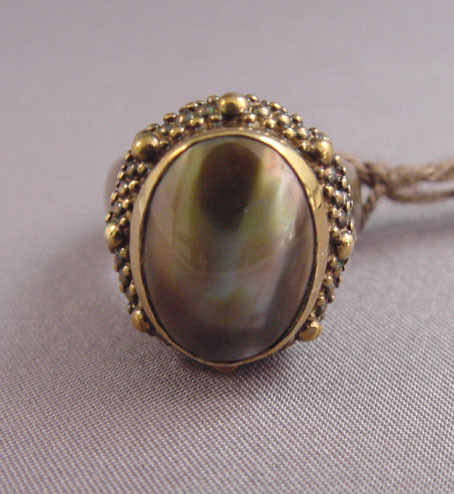 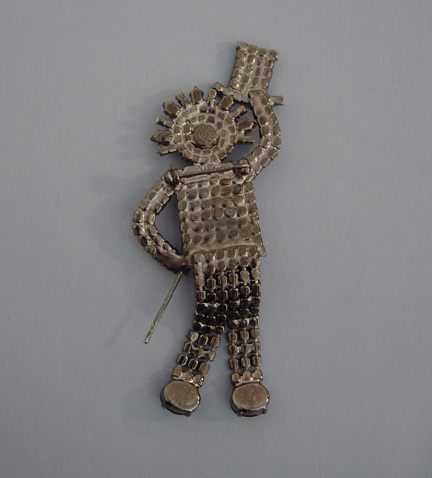 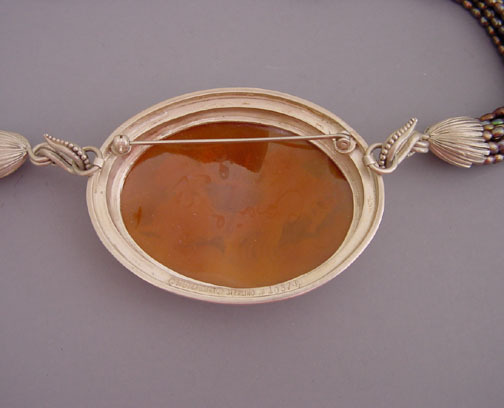 It is thought that his line of jewelry was made, at least in part, by the Sandor Goldberg Company of New York, hence you will see some of the same pieces marked "Sandor" as well. 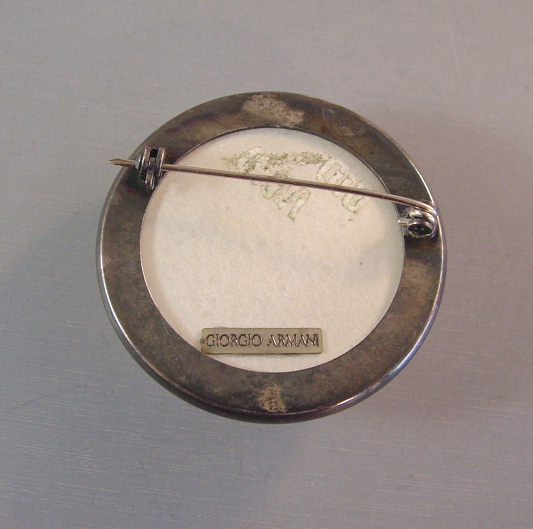 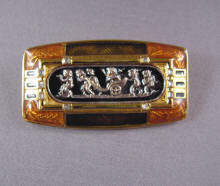 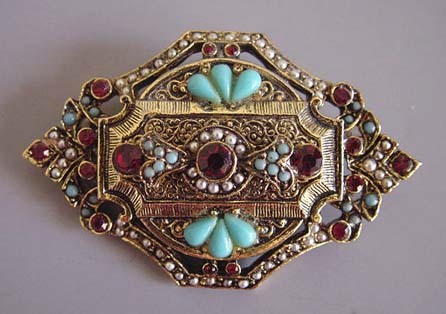 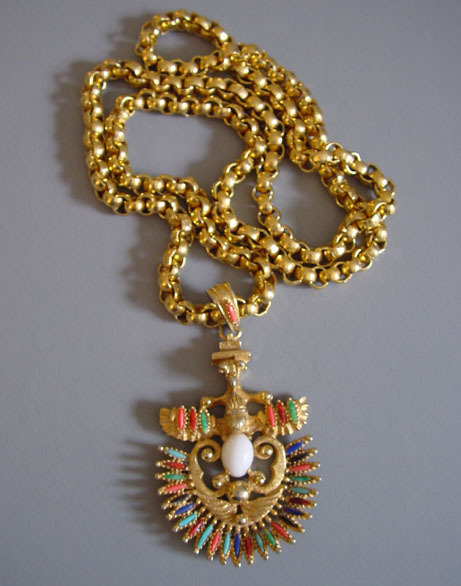 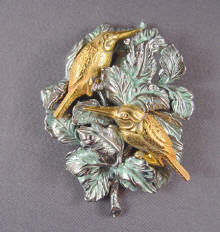 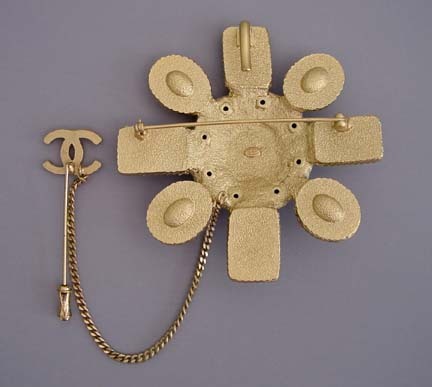 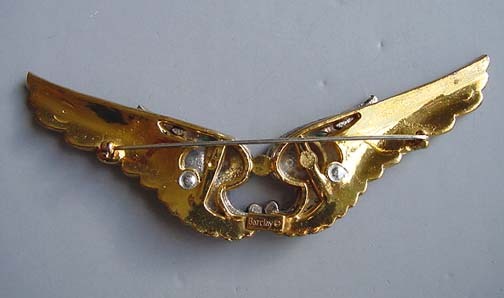 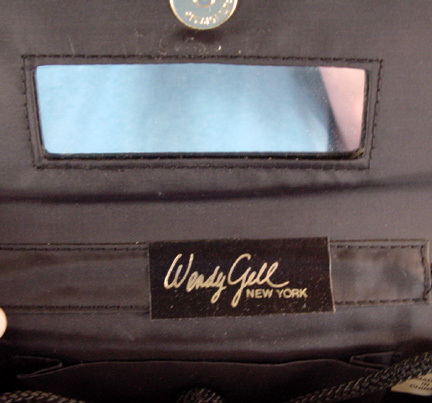 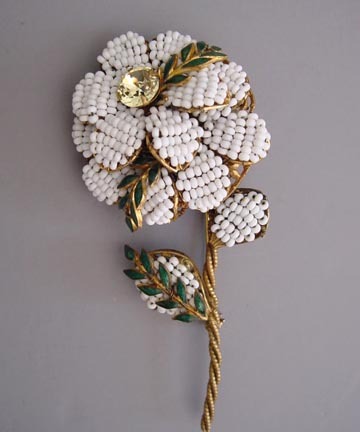 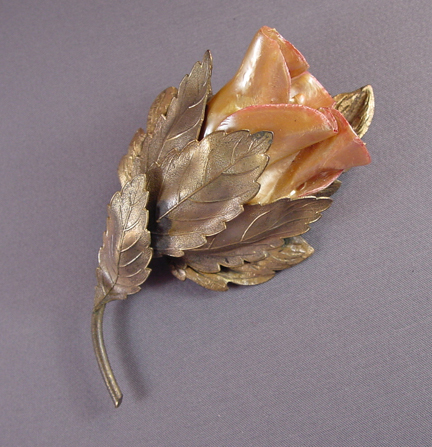 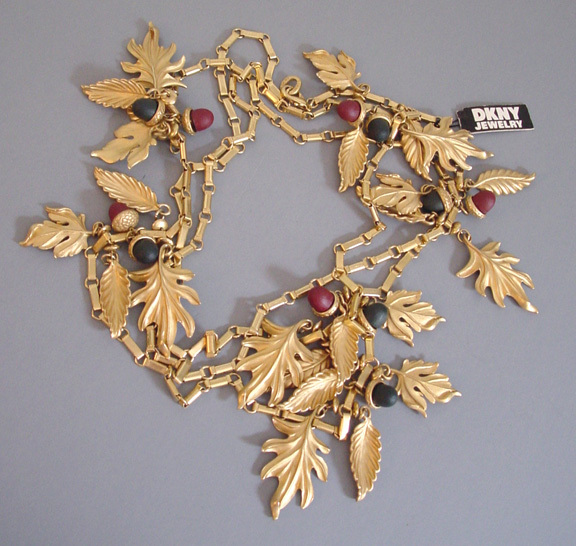 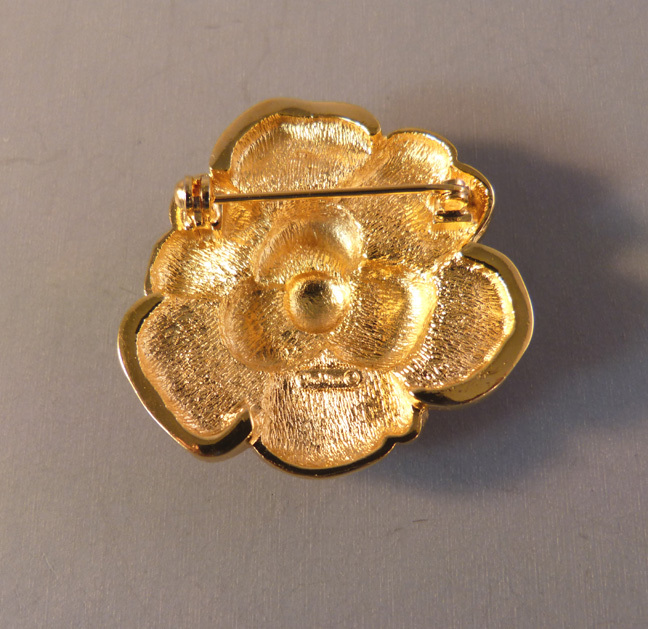 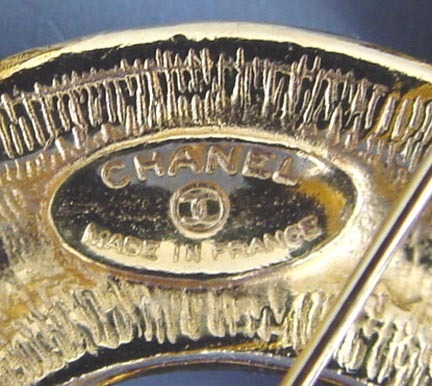 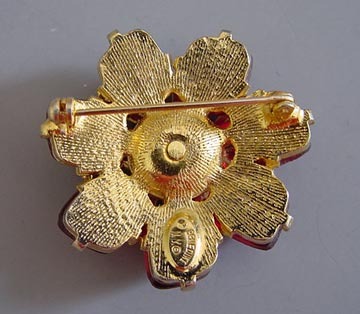 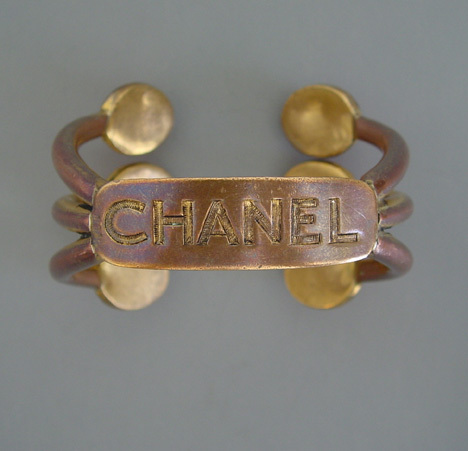 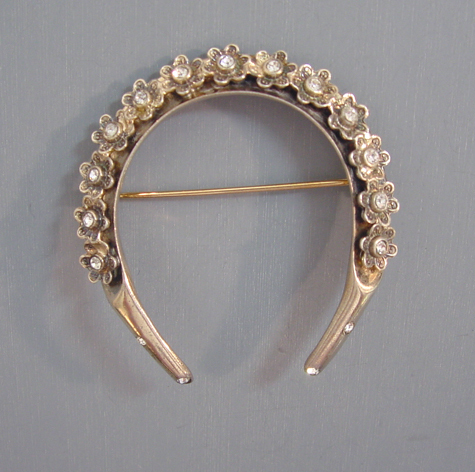 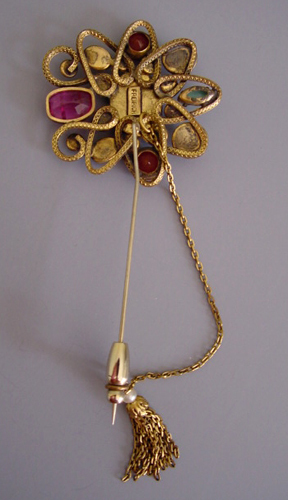 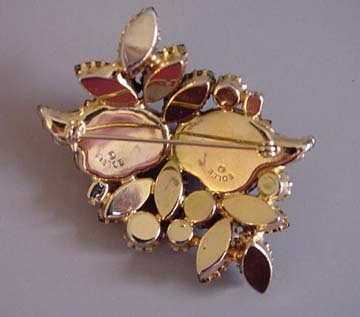 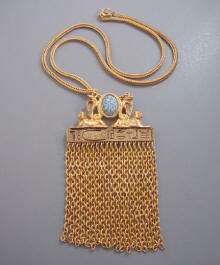 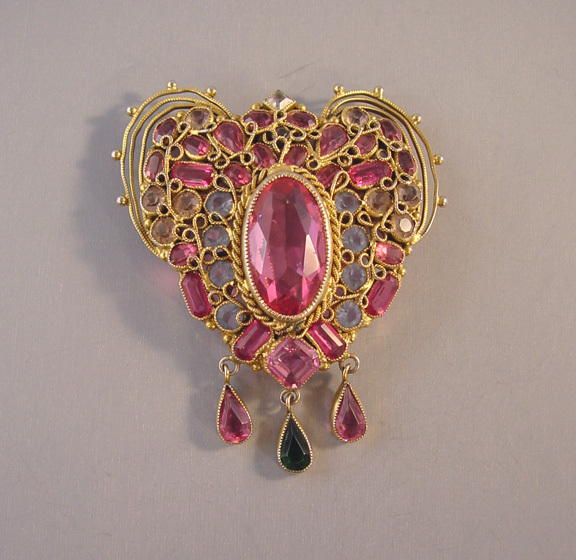 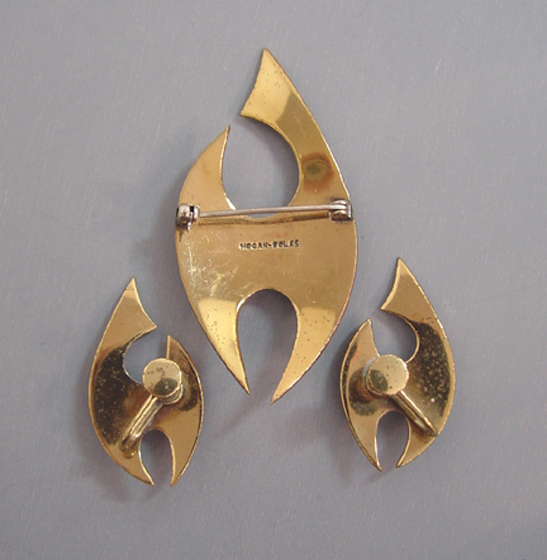 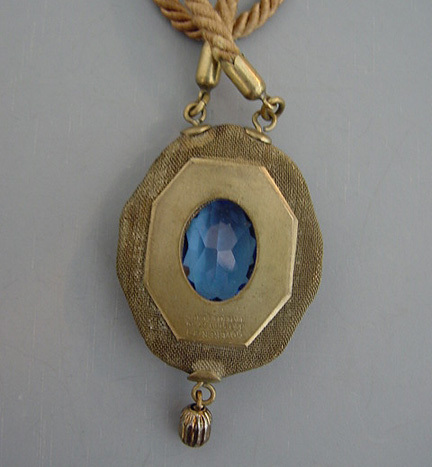 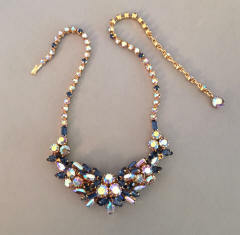 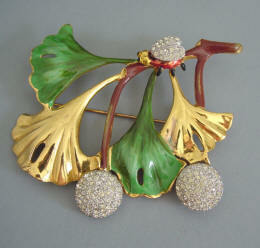 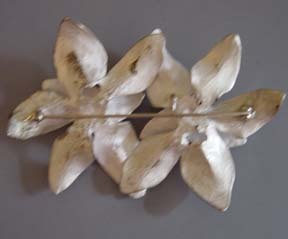 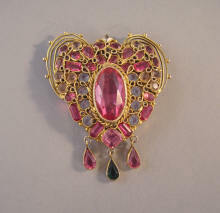 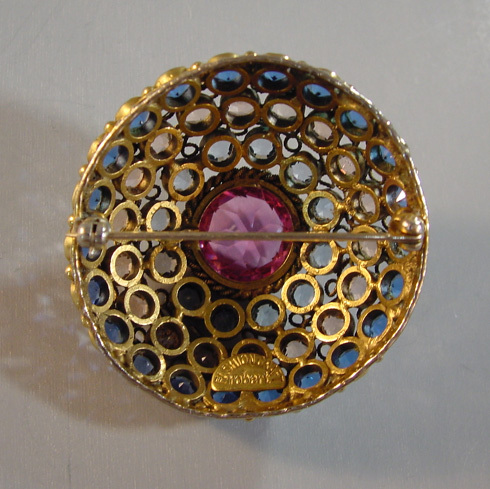 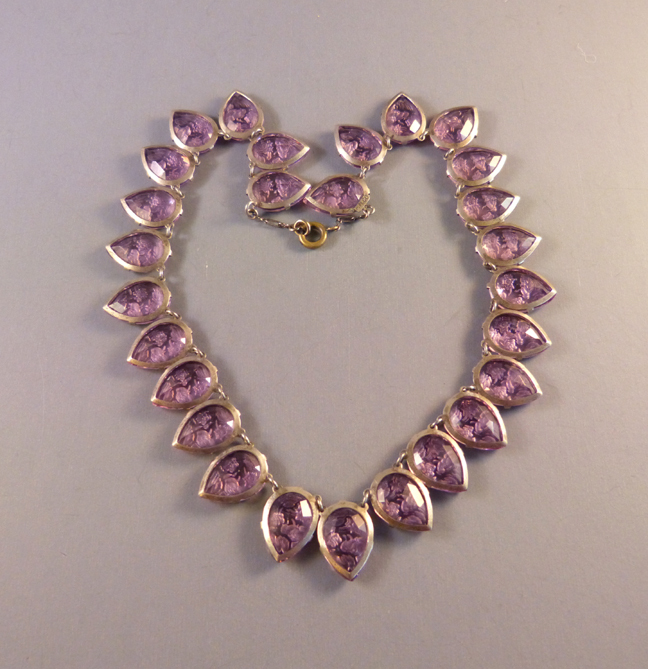 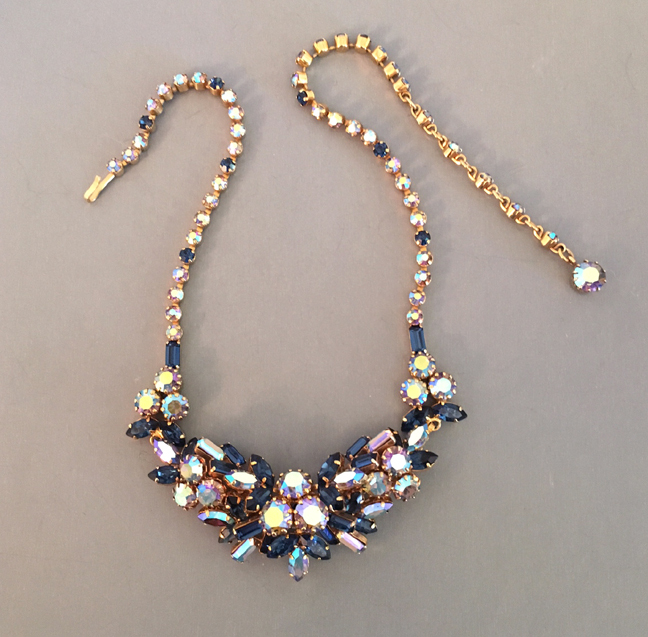 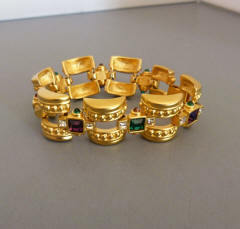 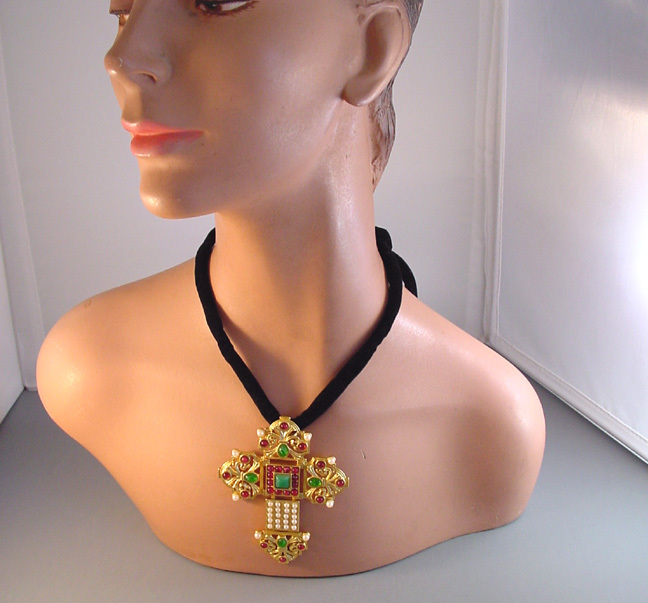 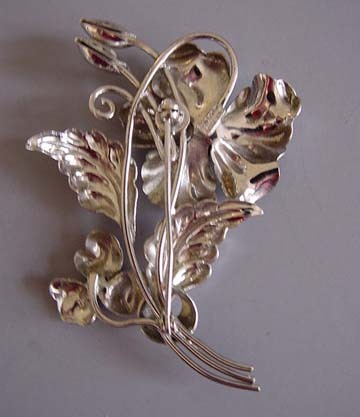 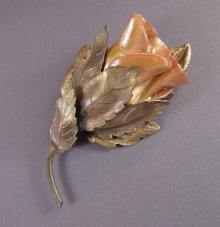 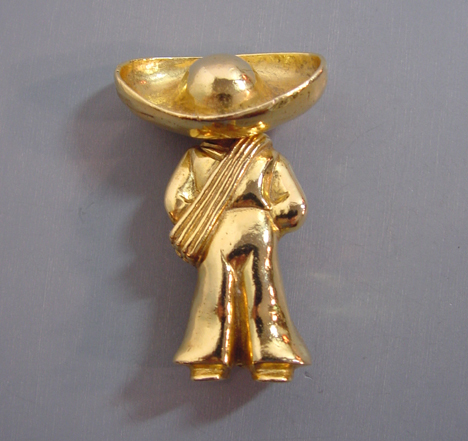 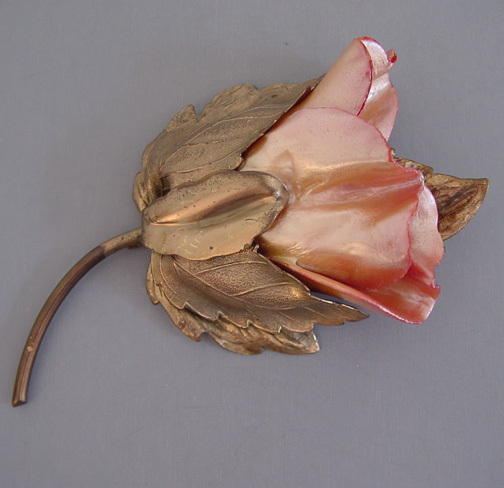 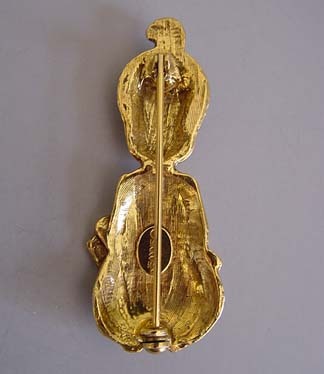 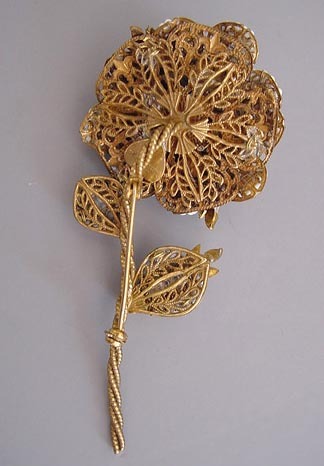 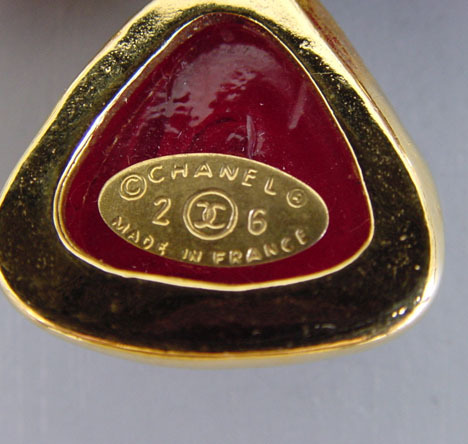 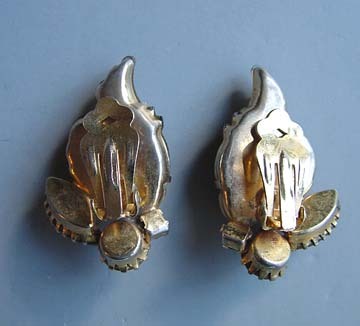 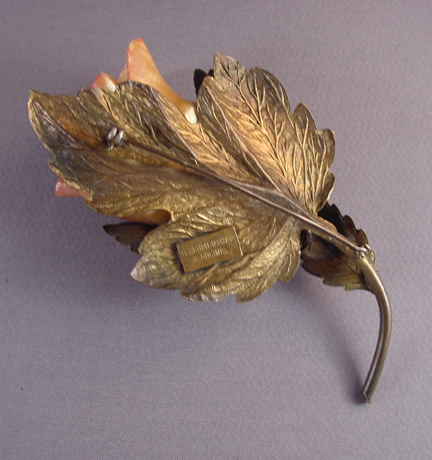 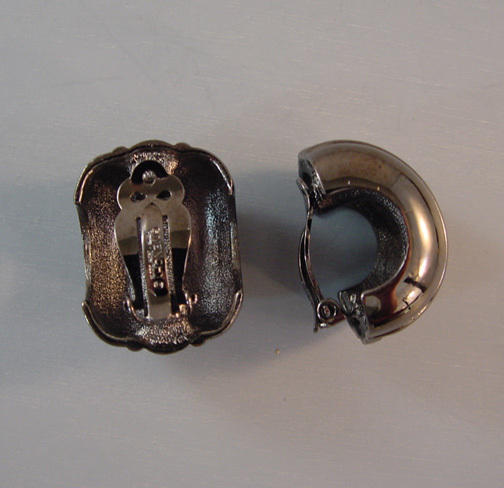 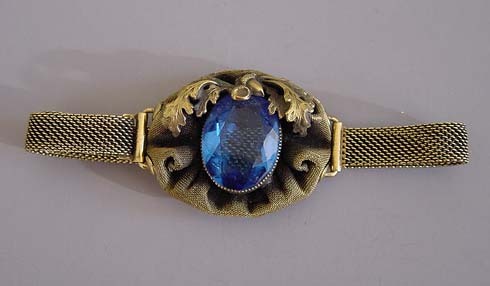 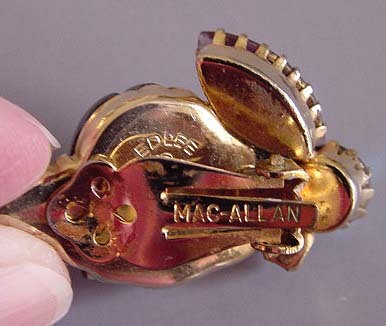 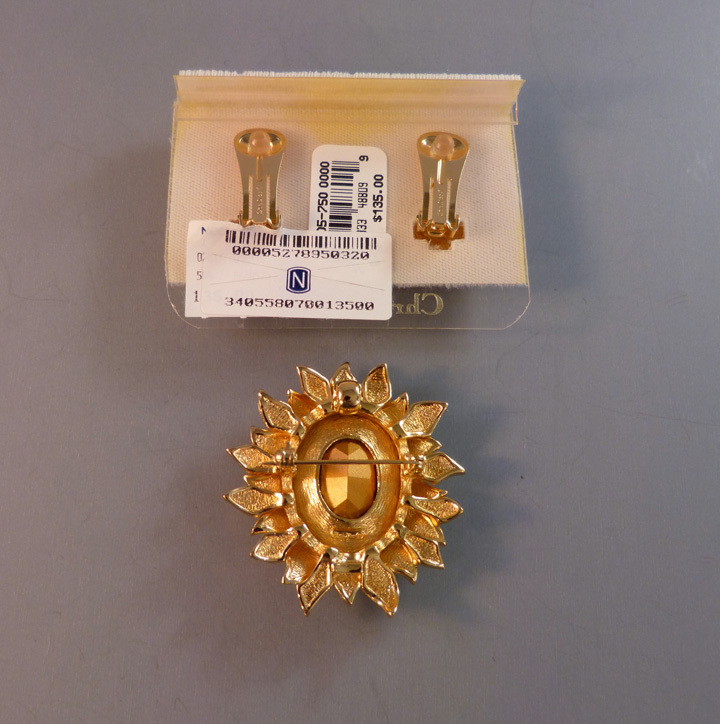 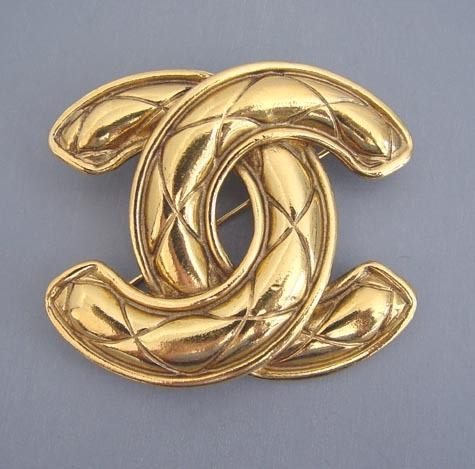 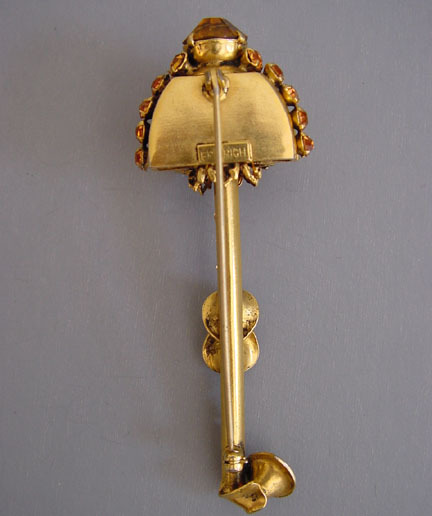 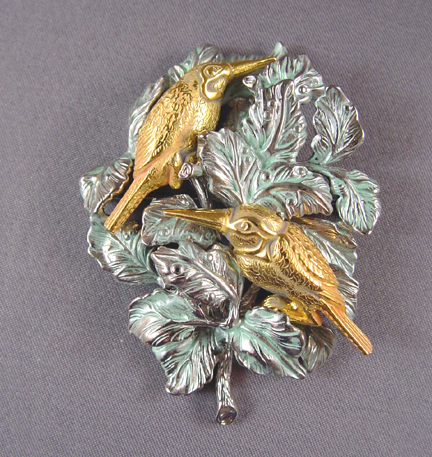 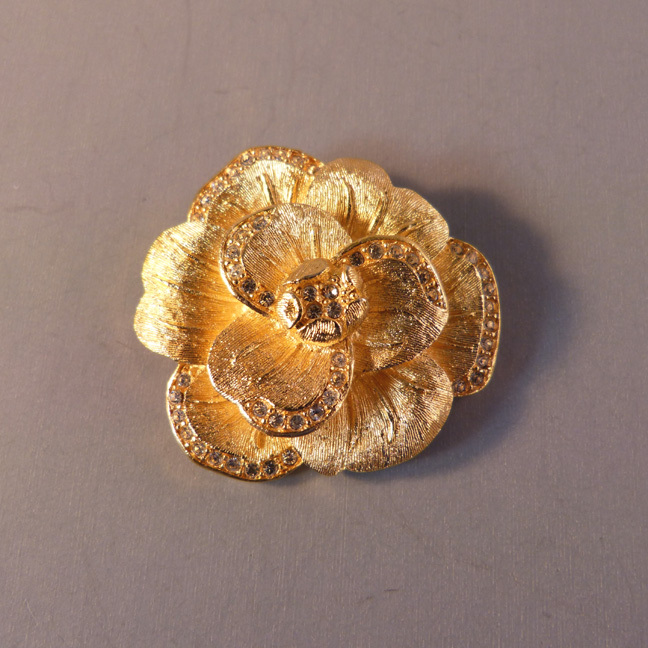 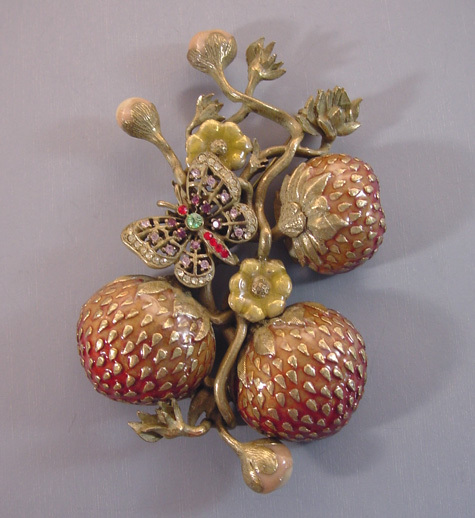 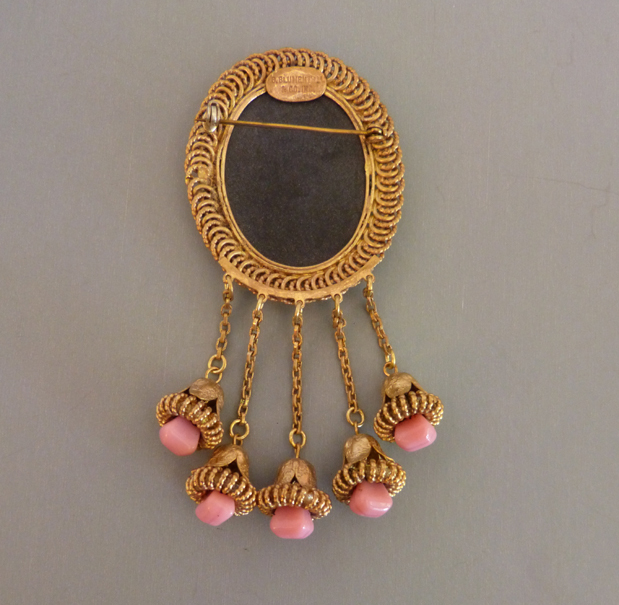 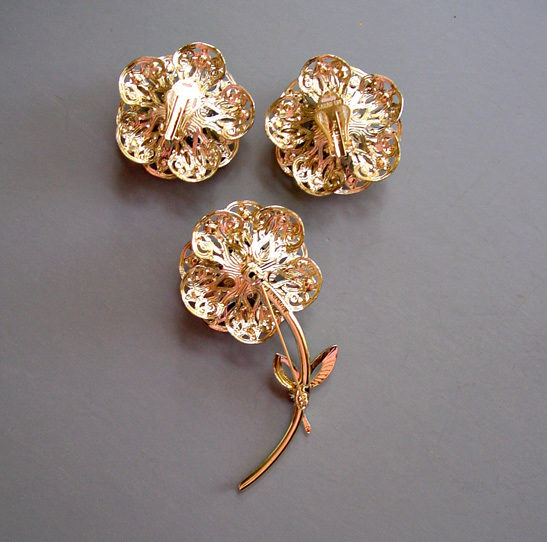 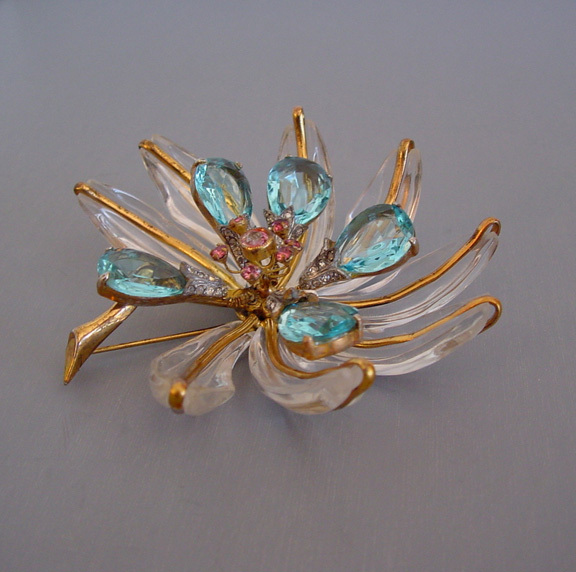 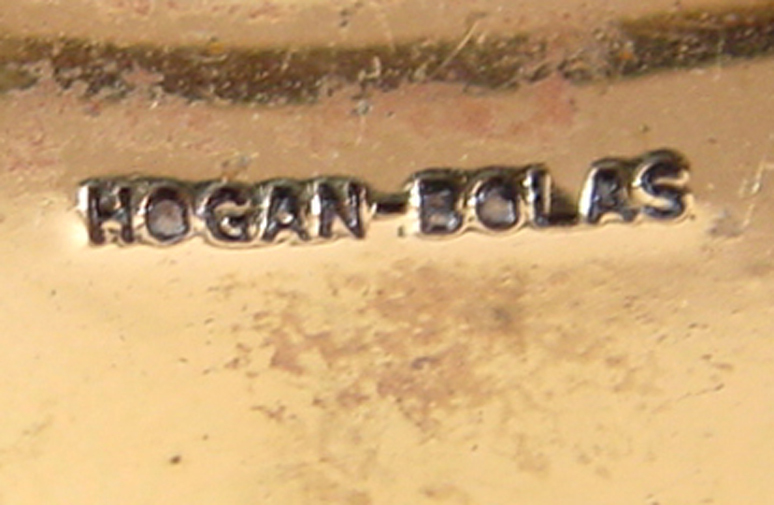 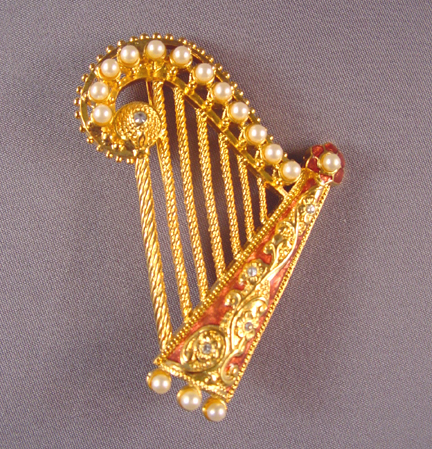 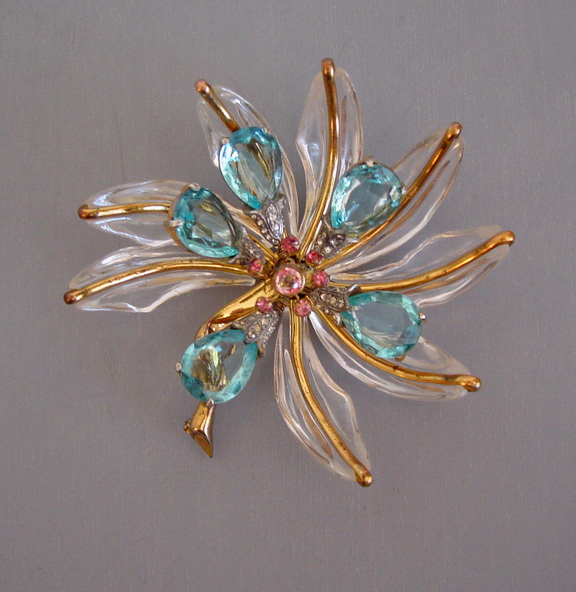 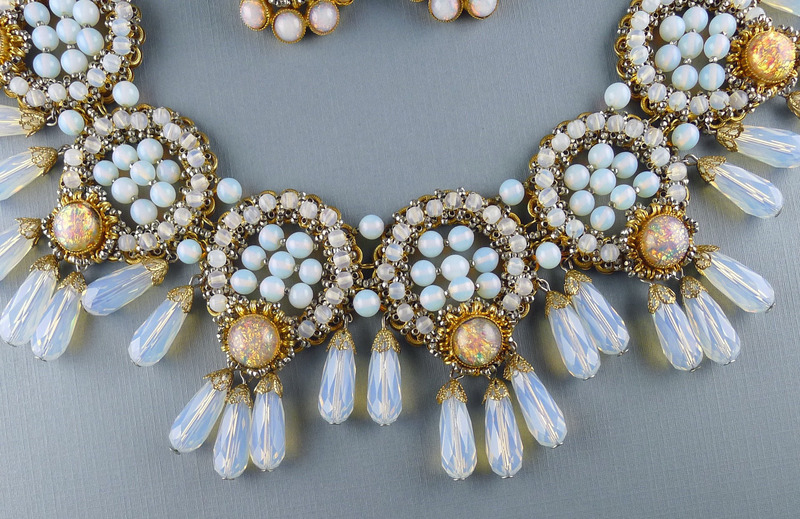 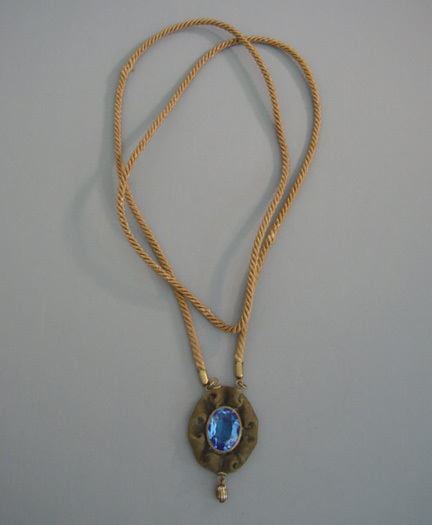 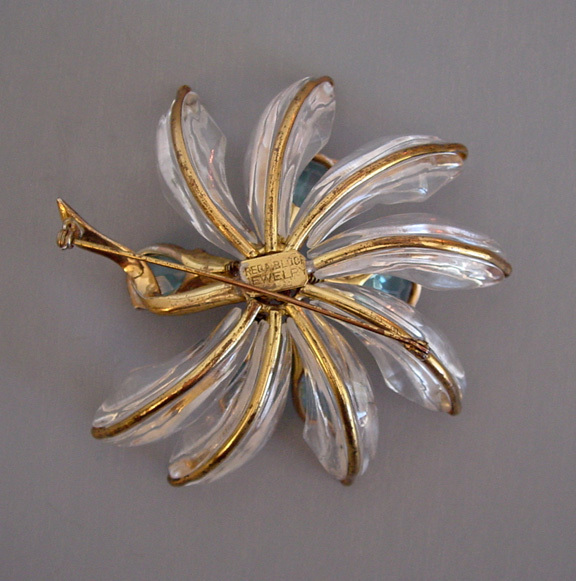 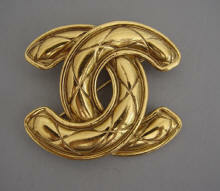 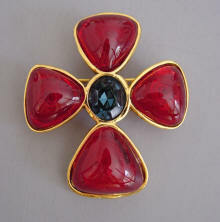 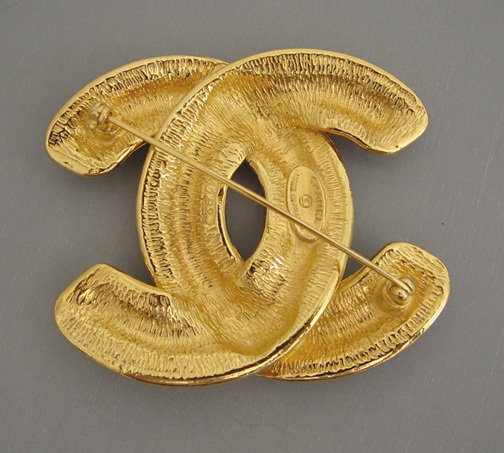 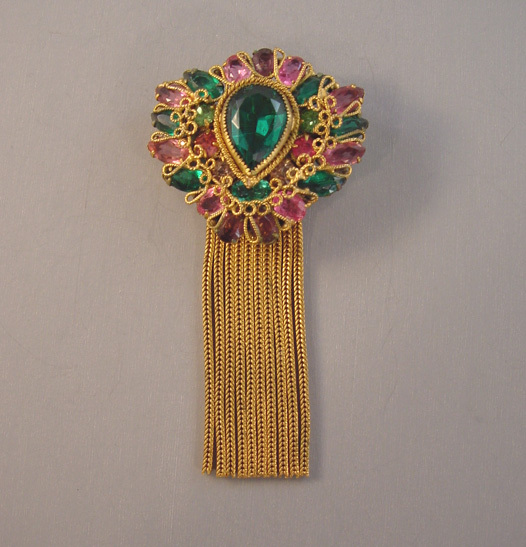 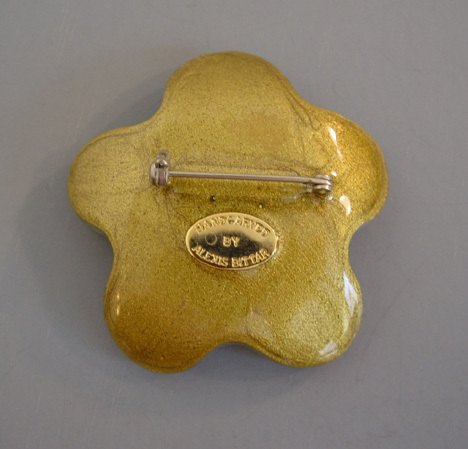 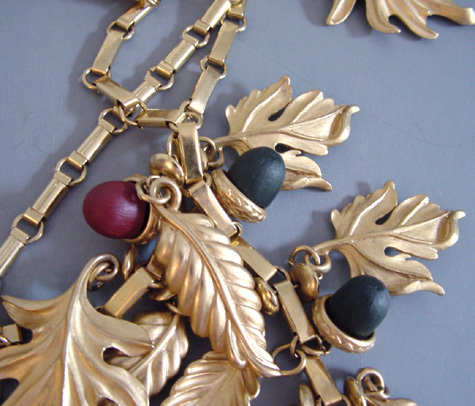 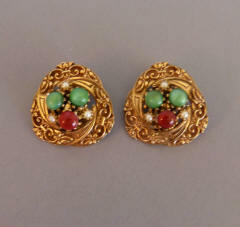 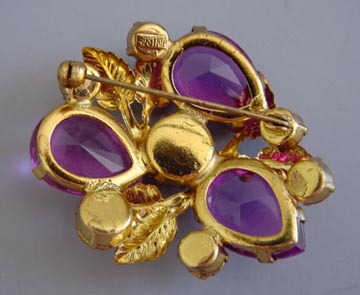 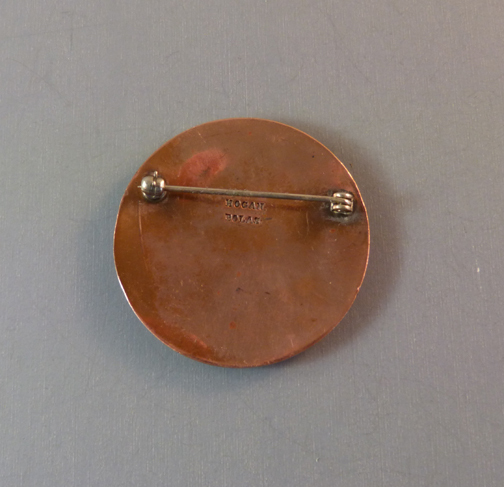 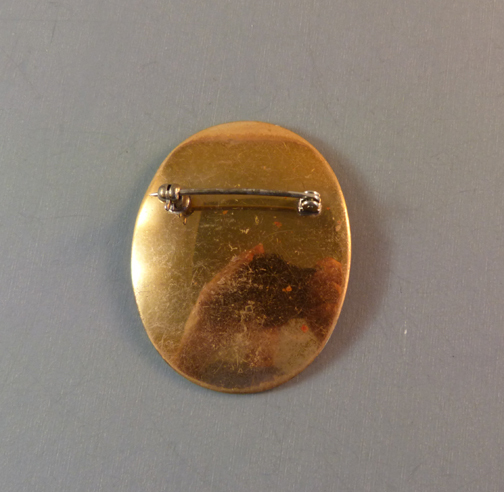 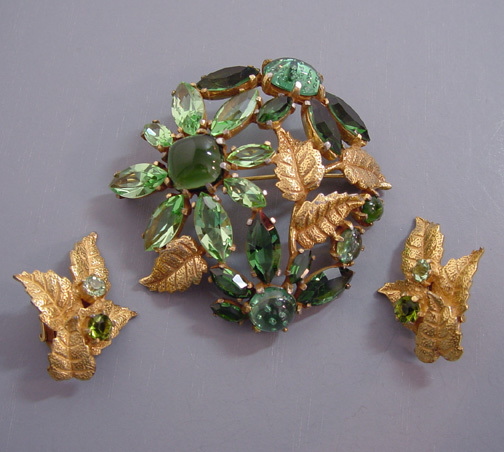 The Vogue company made similar pieces as well. 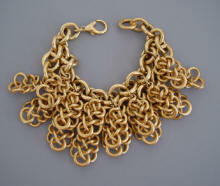 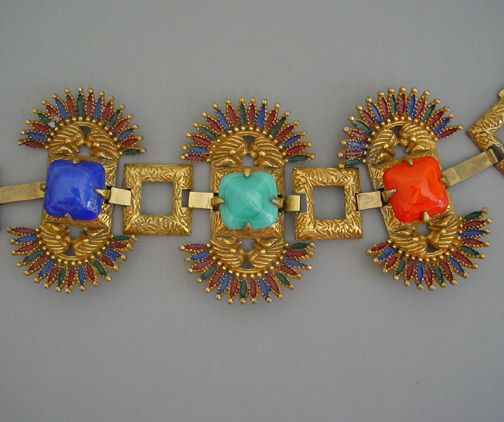 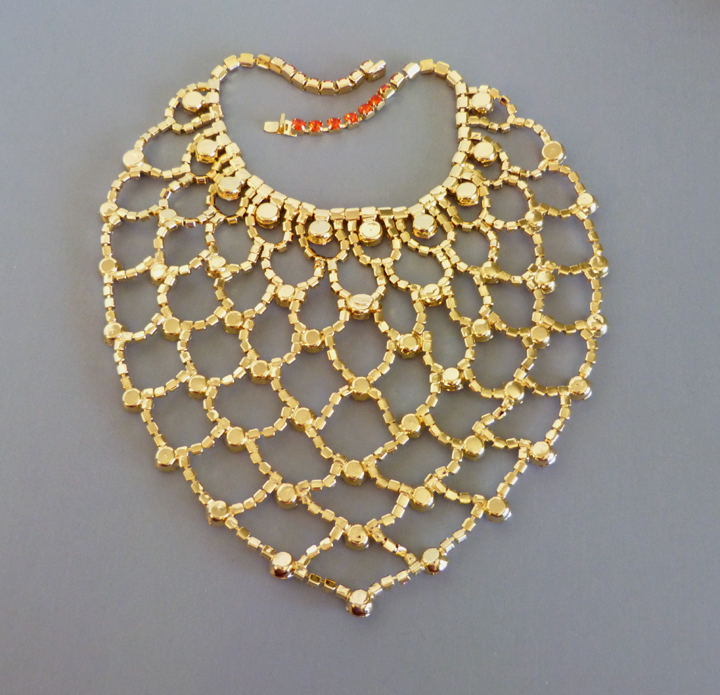 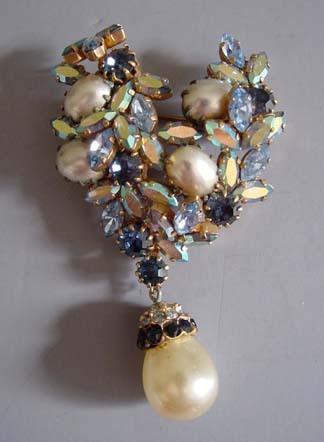 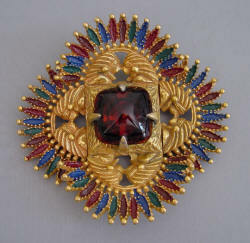 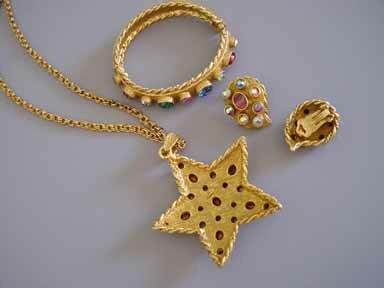 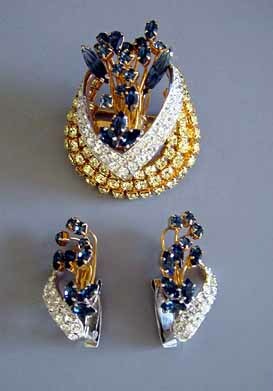 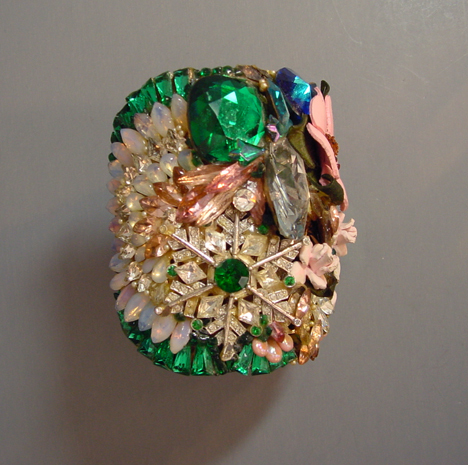 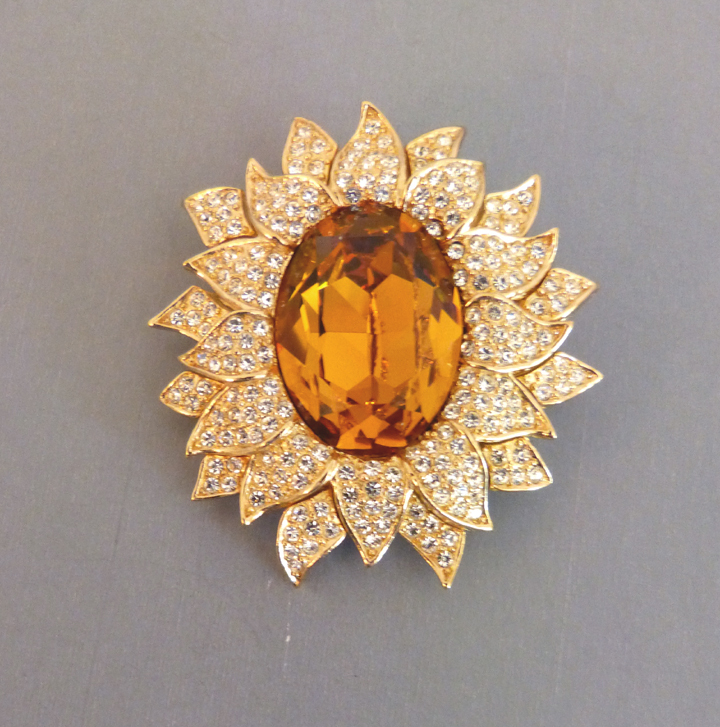 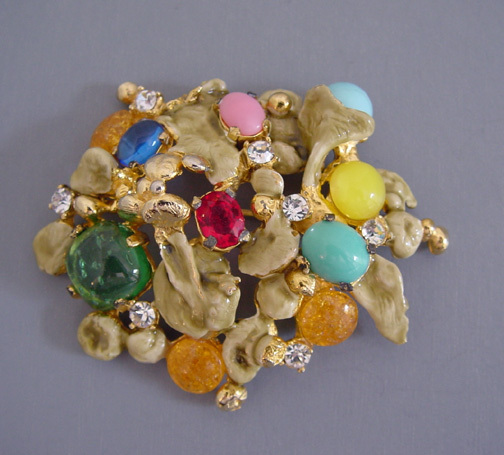 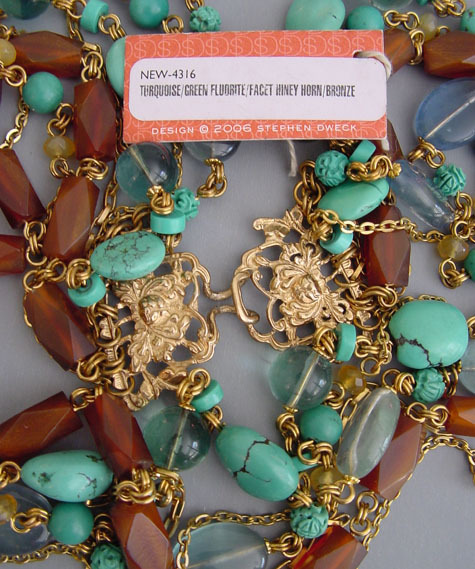 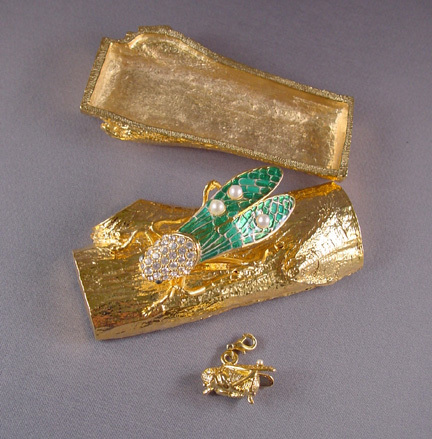 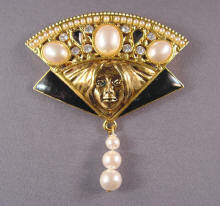 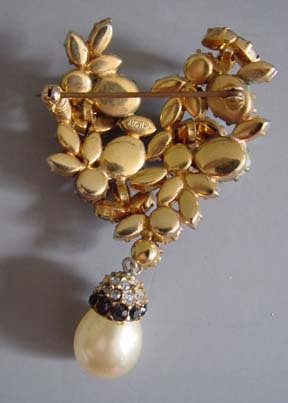 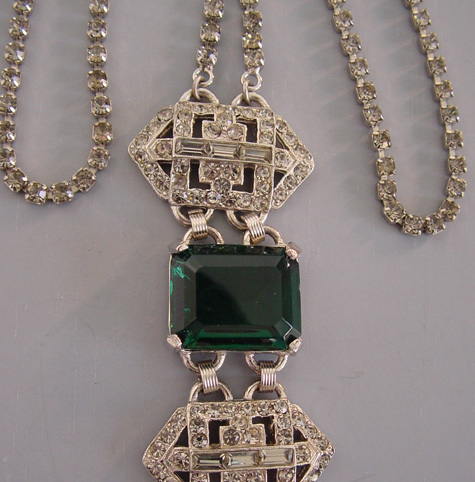 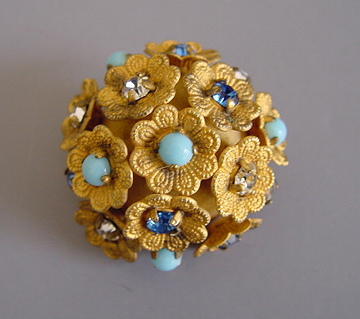 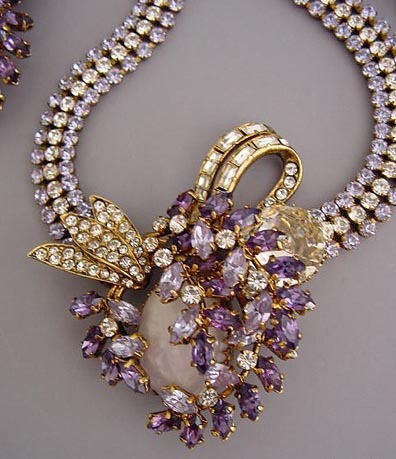 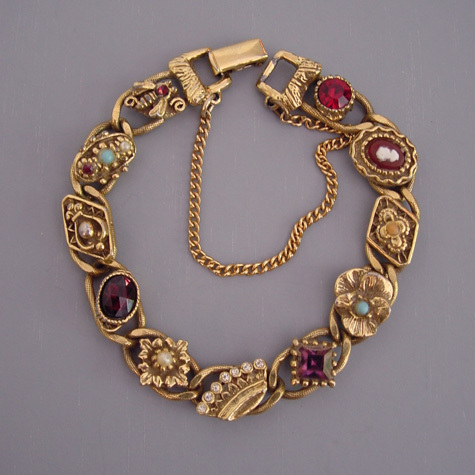 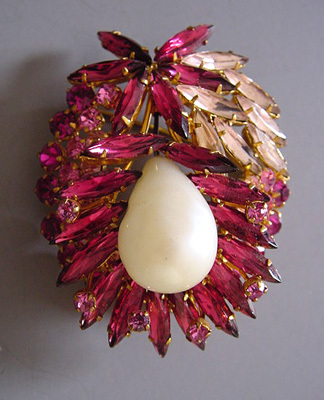 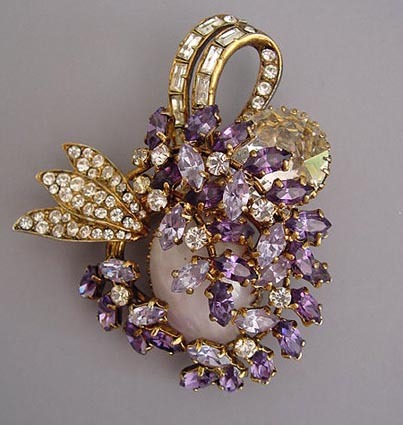 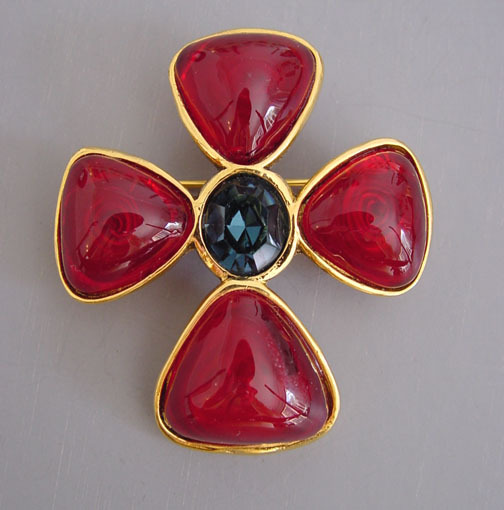 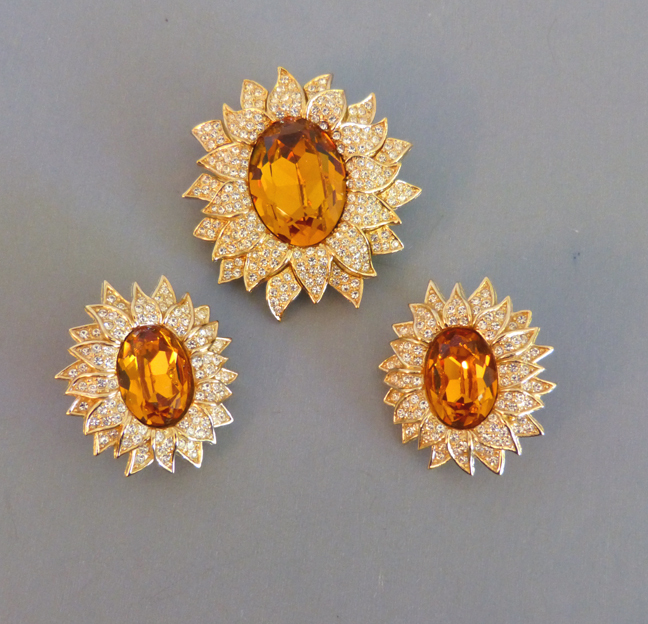 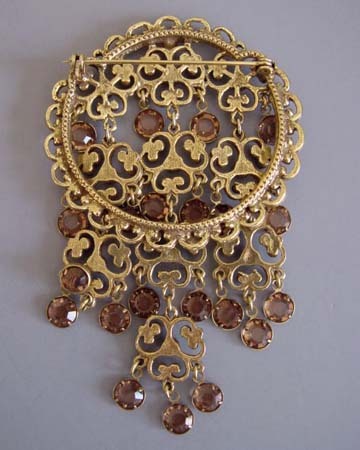 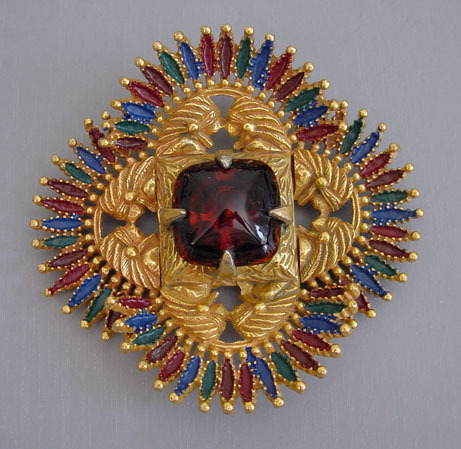 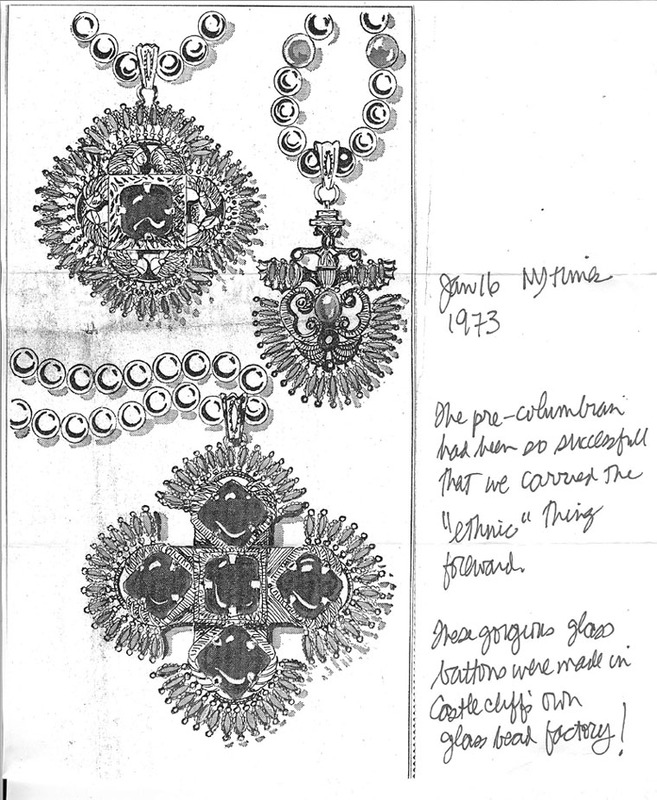 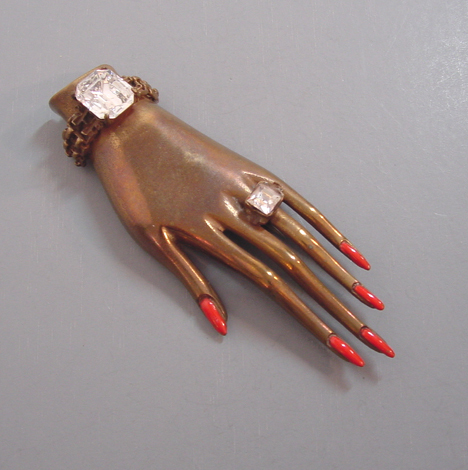 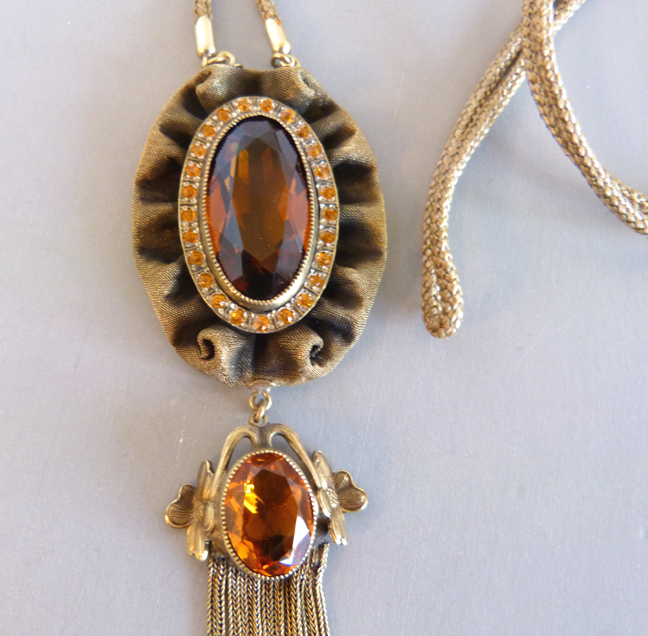 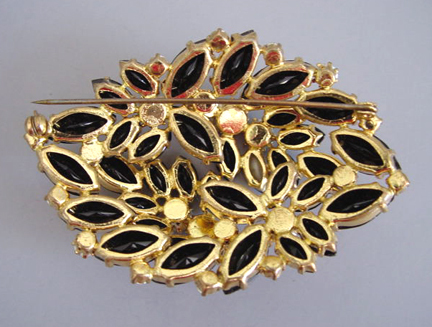 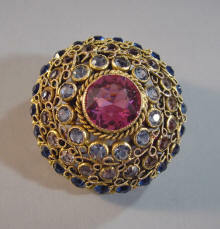 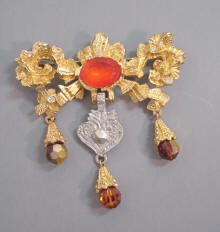 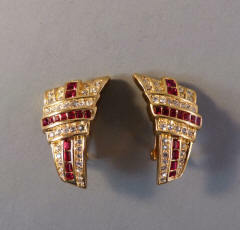 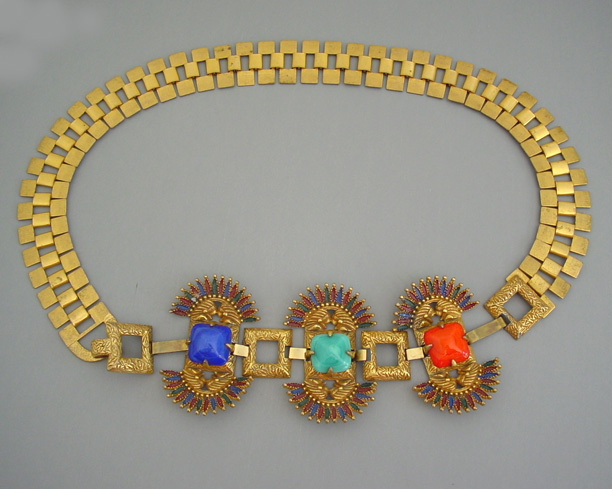 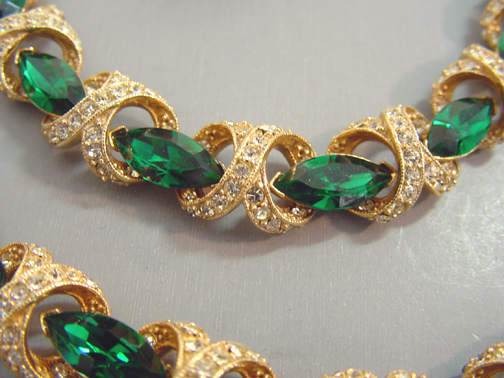 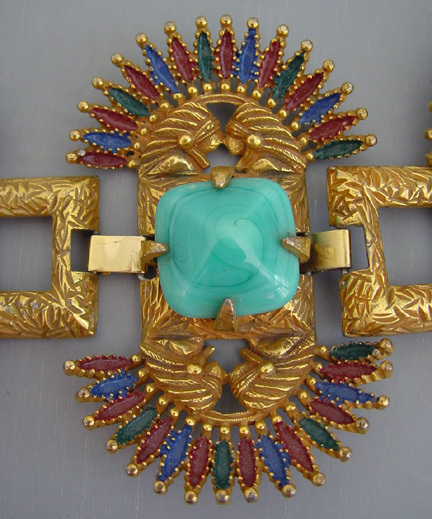 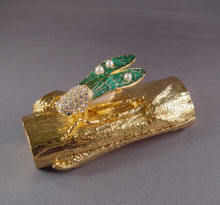 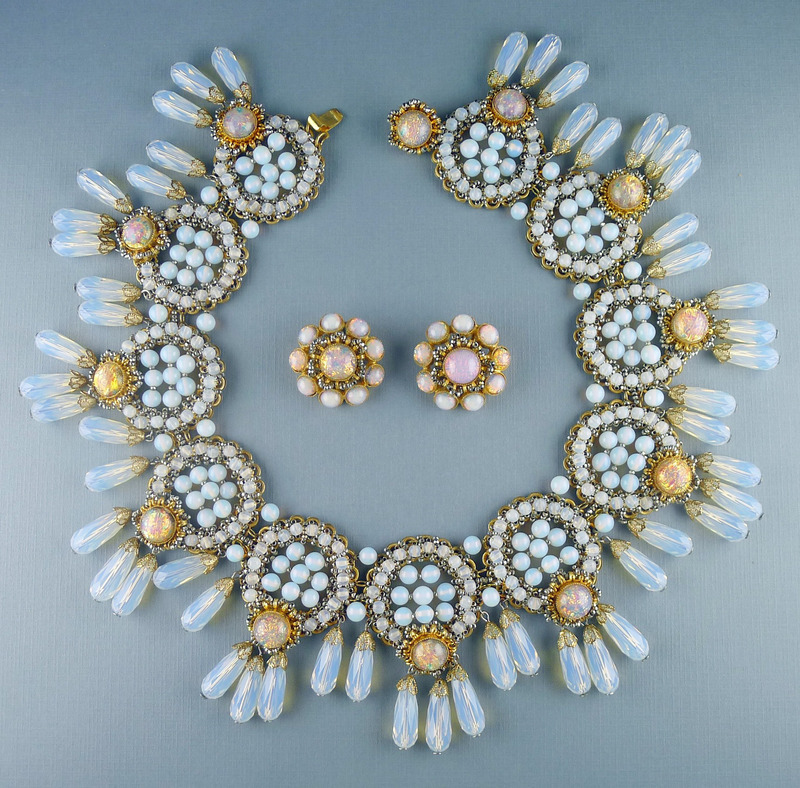 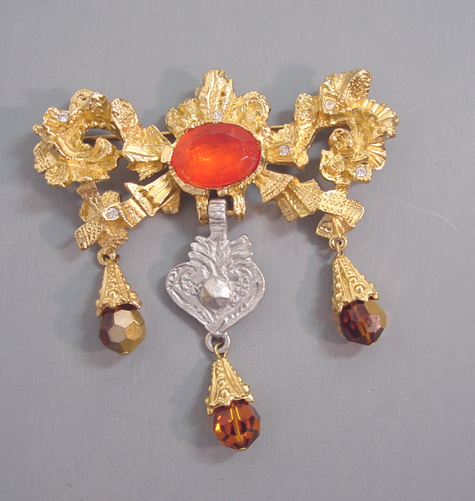 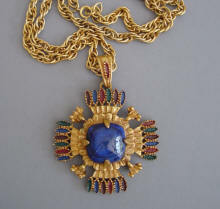 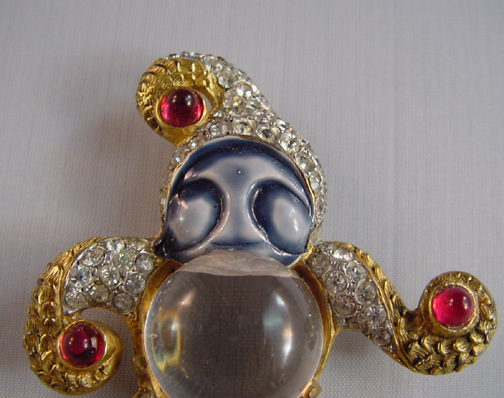 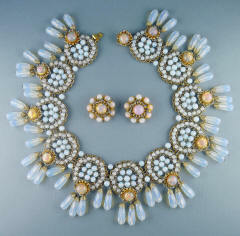 This information, can be seen in Brunalti's "Tribute to American Costume Jewelry" on page 141-2.